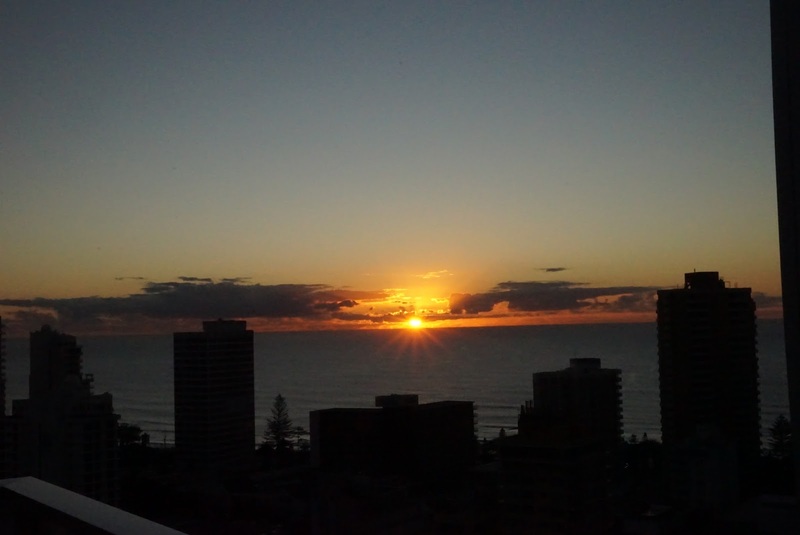 This is our last day in Gold Coast. 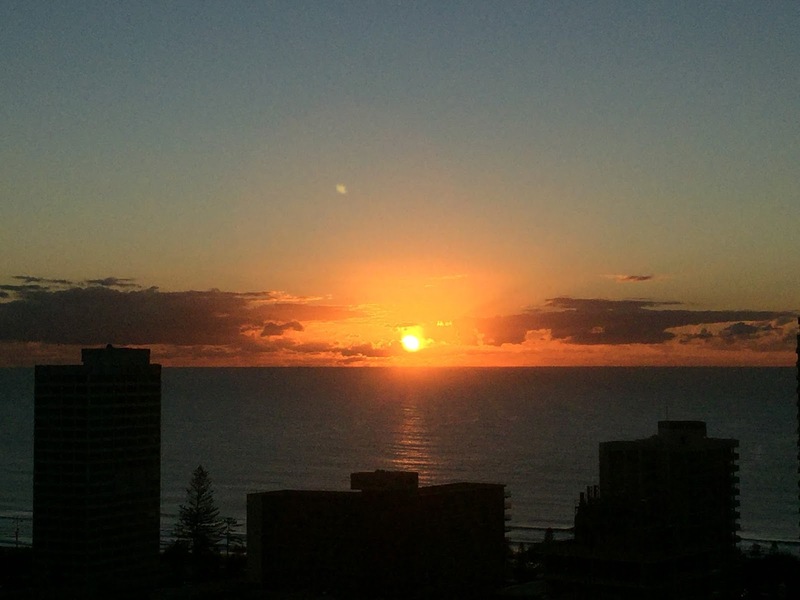 We woke up very early in the morning to catch the last sunrise over South Pacific Ocean from the balcony in our apartment. 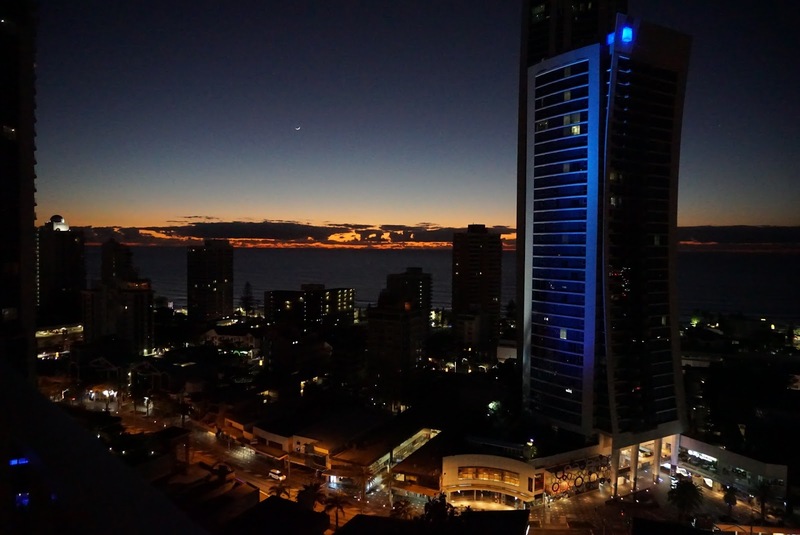 As the sky turned from pitch black to orange as the sun was rising over the horizon to bright blue, I can’t bear to leave Surfers Paradise. 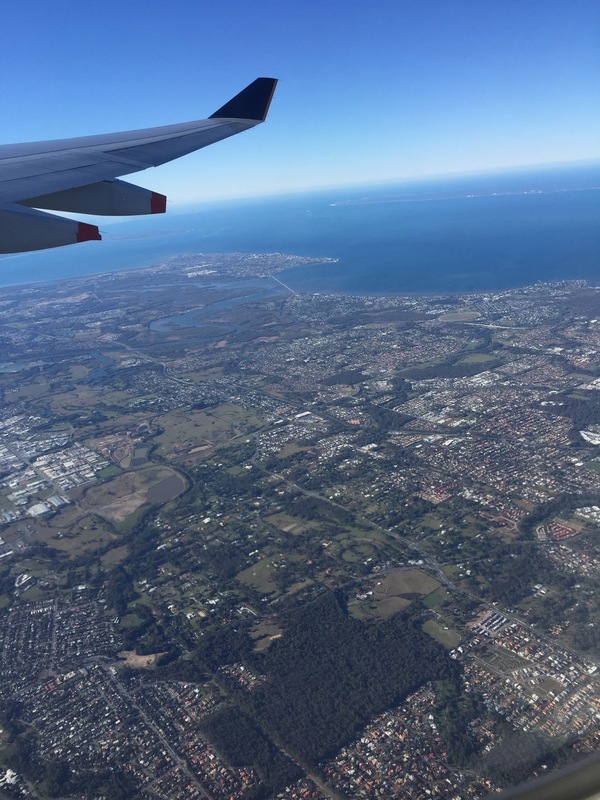 As our flight is at 2pm, we had to leave Surfers Paradise by 10am for checking out and our drive to Brisbane International Airport. 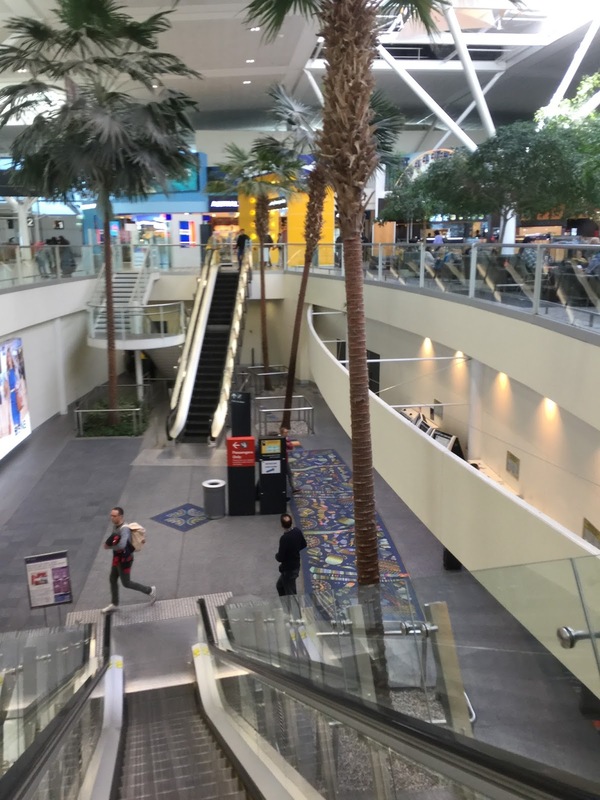 After packing and clearing out the trash, we were ready to leave the apartment and proceed to return the keys to our apartment at the office located in the shopping mall next to the apartment. 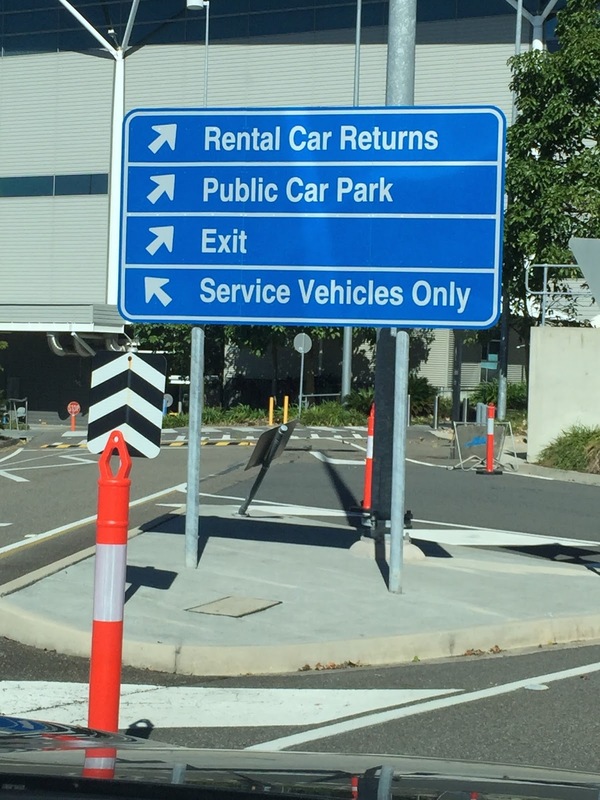 After returning the keys, we commenced our 1 hour drive from Surfers Paradise to Brisbane Airport. 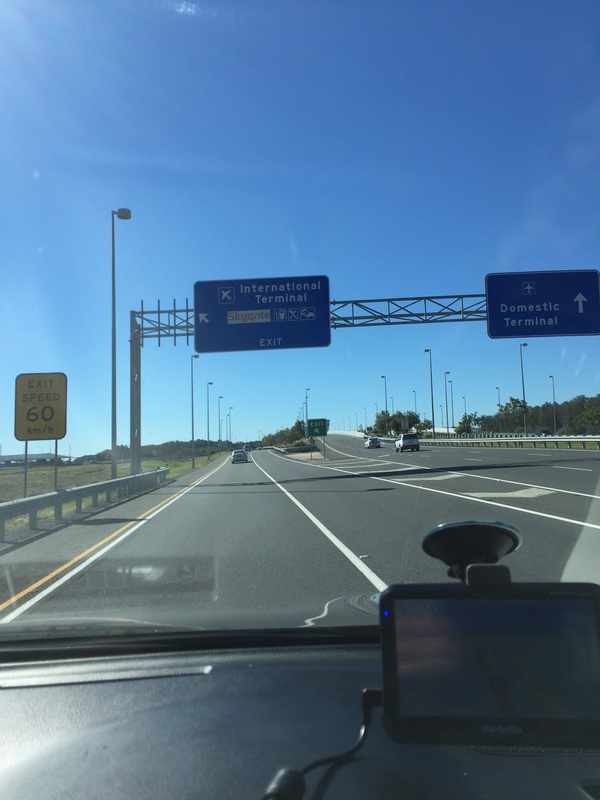 The drive to Brisbane Airport is easy as the way to the airport is very well marked along M1 Highway. 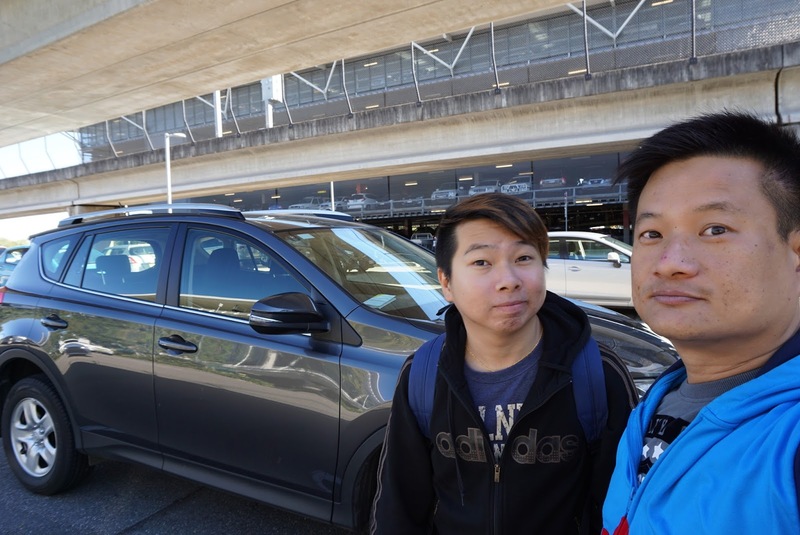 We parked our car at the allocated parking lot for the car rental returns and headed to the arrival hall to return the keys to our car. 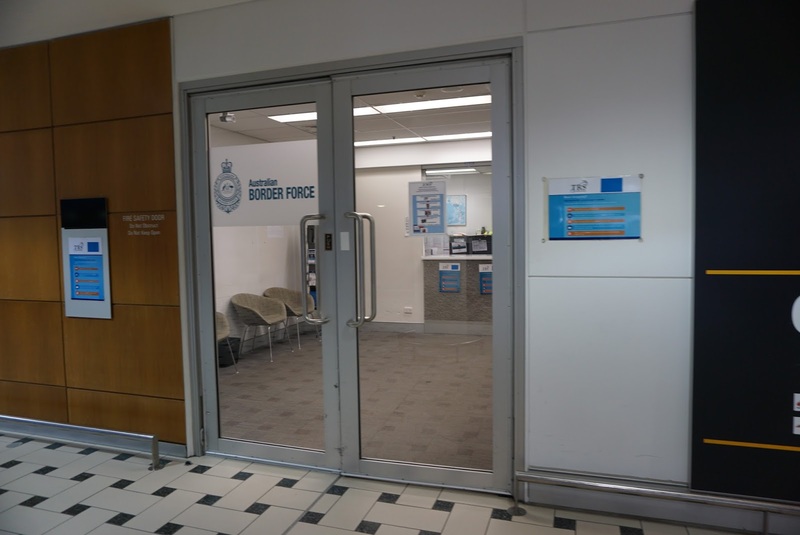 As we wanted to process tax refund for tourists (tourists can file for tax refund when their purchase exceeds A$300 in a single receipt), we headed to the ground floor where a small Tourist Tax Refund office is located for the staffs to witness the items we were claiming for tax refund. 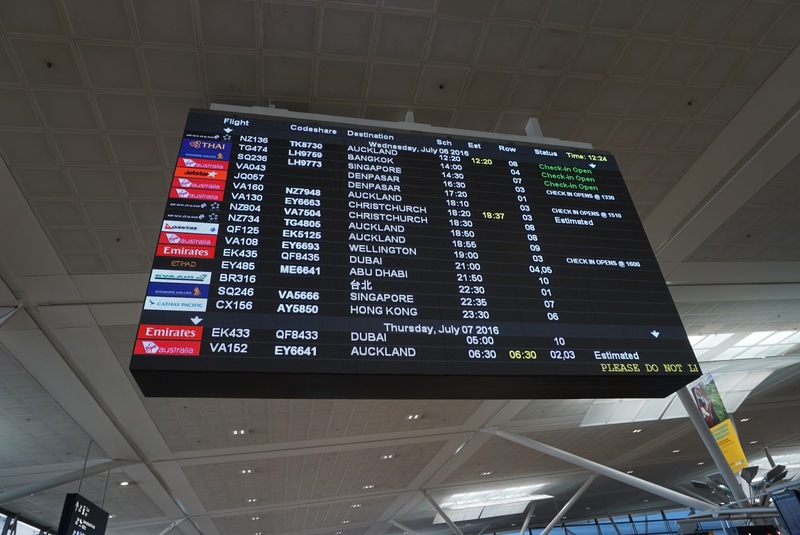 The process was fast and swift, soon we made our way to the departure hall to process our check-in for our flight home. 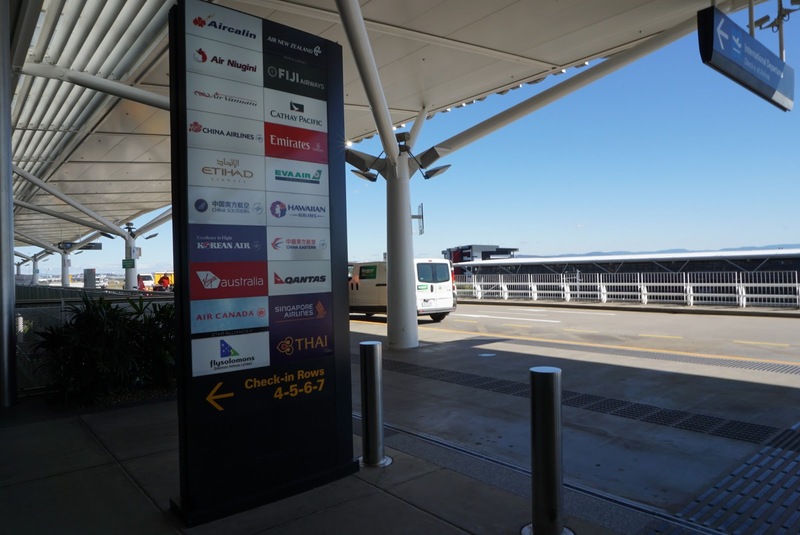 After checking out, we headed straight tot he airside. 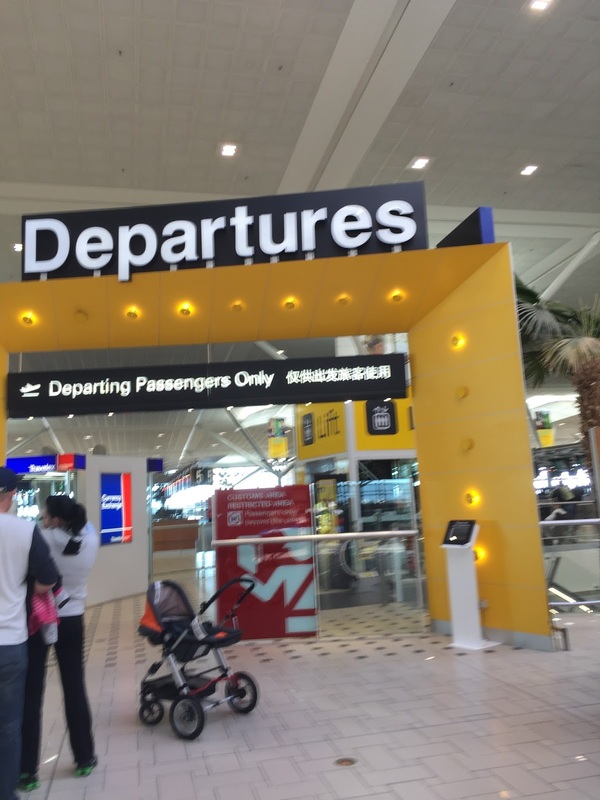 Everyone leaving from Brisbane Airport are required to fill out a departure card at the counters outside the immigration gate. 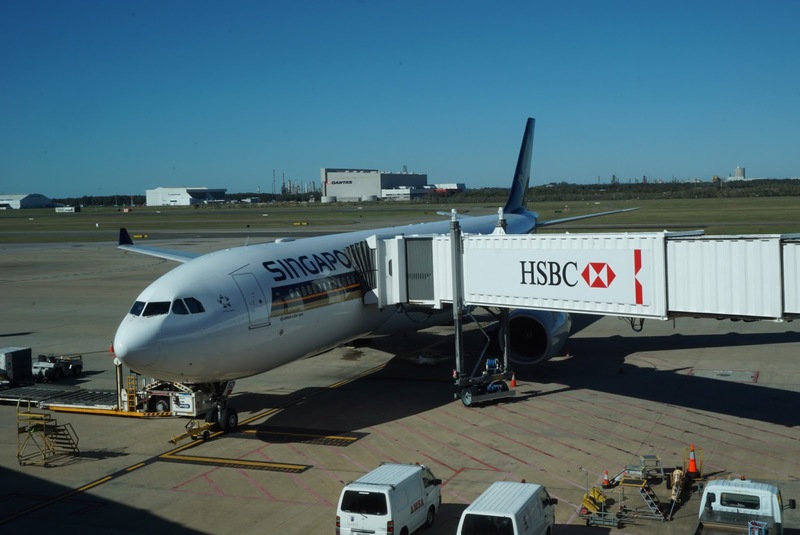 After filling in the departure card and going through the immigration clearance, we are ready to board our flight home. 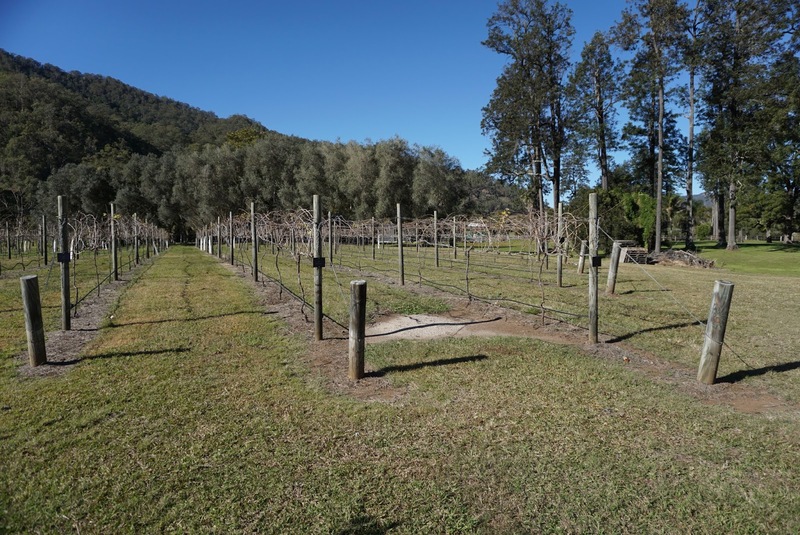 Australia is a huge country and is best seen via self drives as the national parks are rather inaccessible by public transport, unless one joins a day tour. 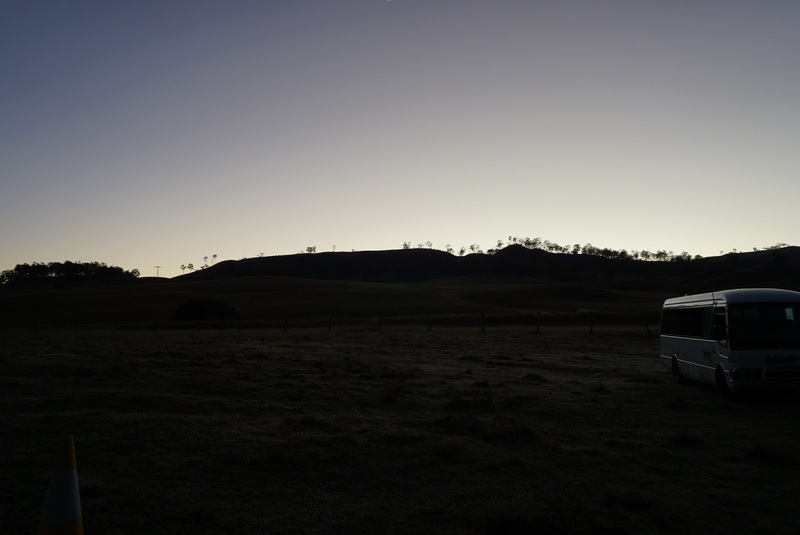 Self drive is the best way to see Australia, which also gives one the freedom to stop at any interesting points along the way. 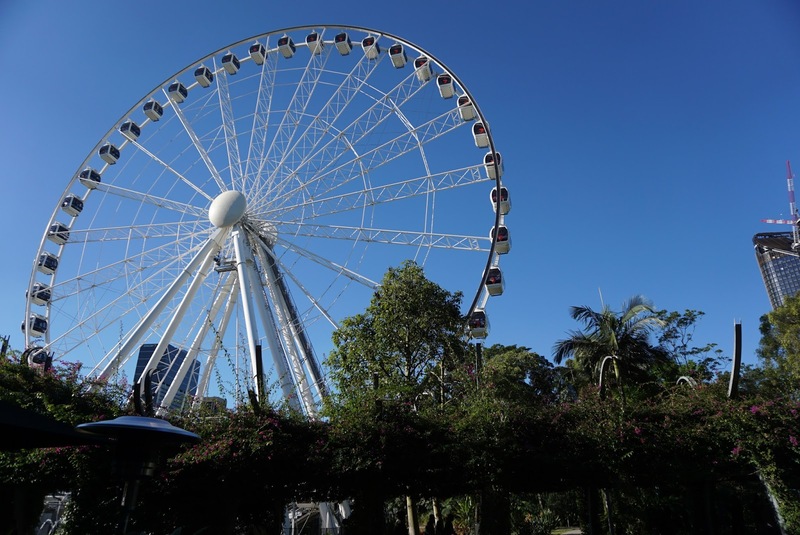 There are more than theme parks in Gold Coast, in this trip we only visited Springbrook National Park, some other national parks that are popular with locals and visitors include Lamington National and Tambourine National Park, which we will visiting the next time we come to Gold Coast. 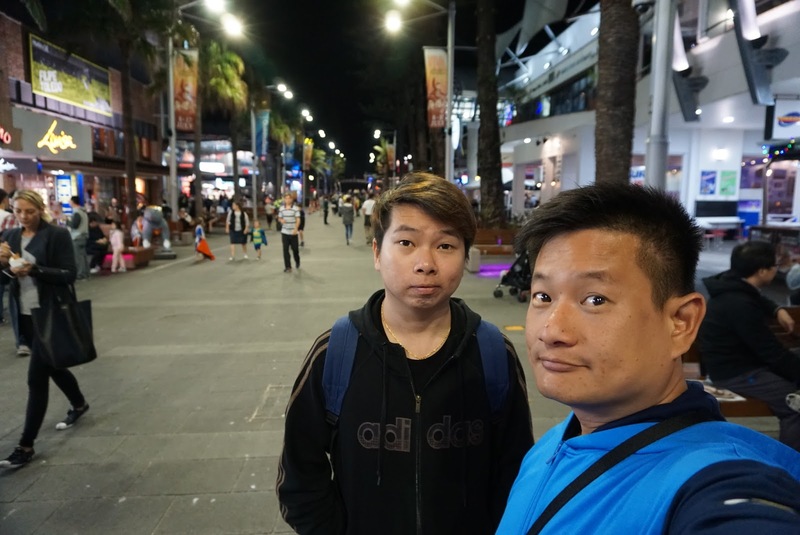 For the past few days, we visited Harbour Town only at night when most of the shops have closed. 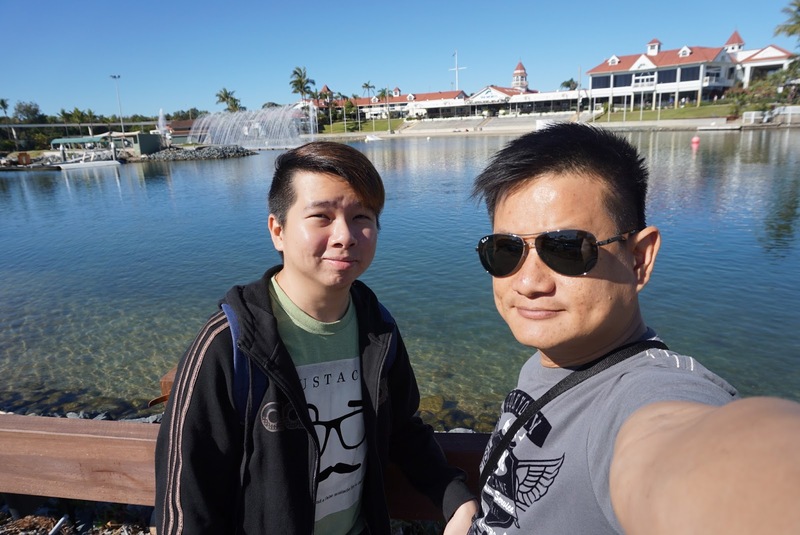 On the last day of our trip, we decided to return to Harbour Town to do some shopping. 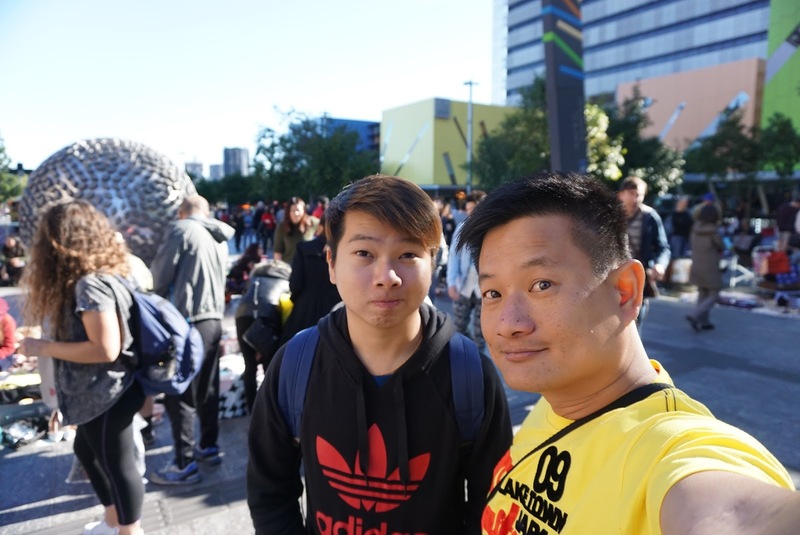 We woke up slightly later than other days today, mainly to have a good rest before we return back home, back to our work. 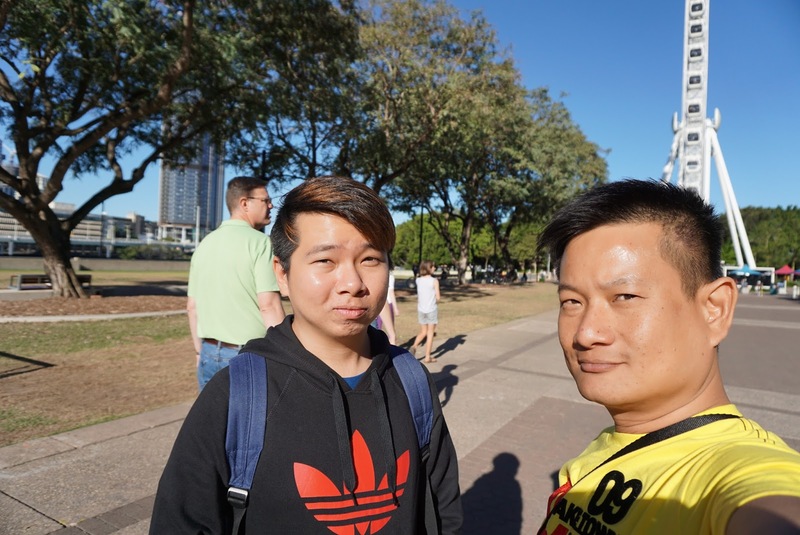 My friend and I arrived at Harbour Town at around 10 am. 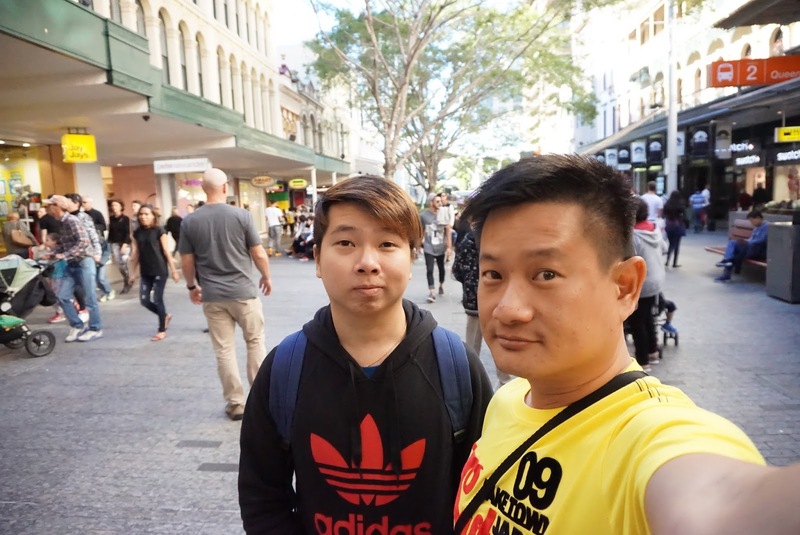 This time we had a good look at how cheap the stuffs are in Harbour Town. 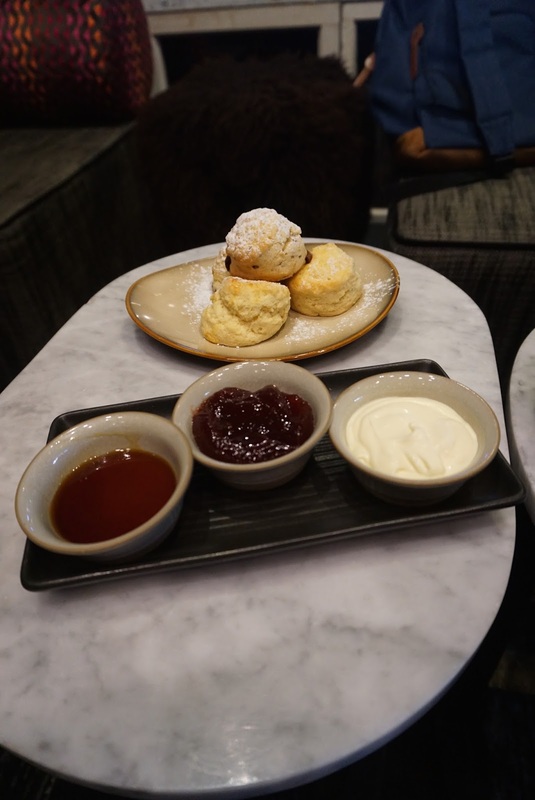 Our first stop in Harbour Town is one of the cafes for our breakfast. 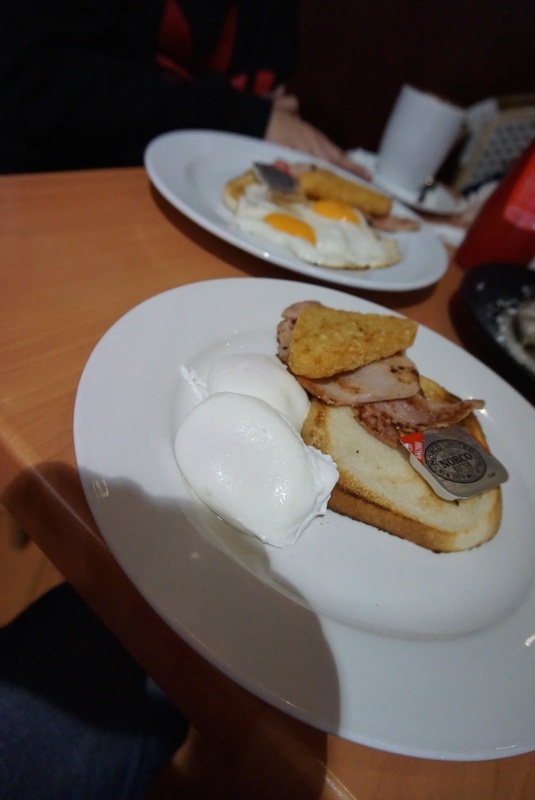 The breakfast was served in a huge portion (we did not managed to finish everything) and the price is fairly cheap. 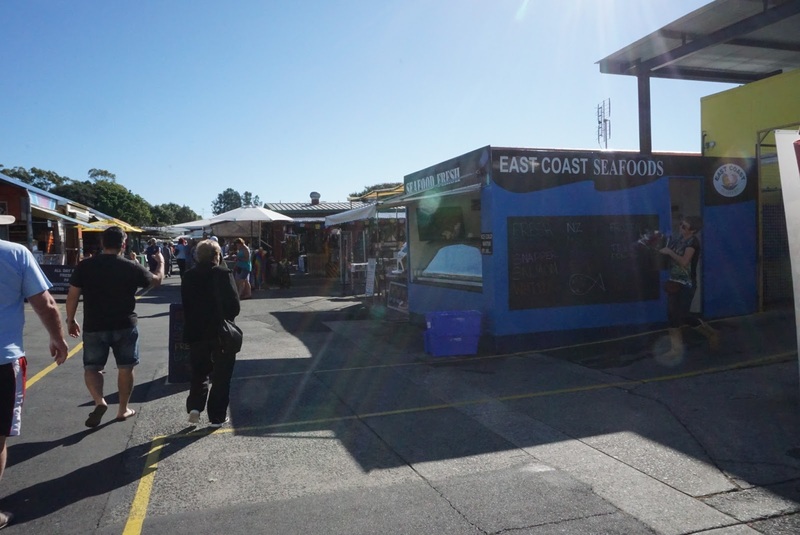 After breakfast, we walked around Harbour Town to do some shopping. Went into several shops and managed to grab some really good bargains. We bought a sweater for half the price at Levi’s and a beanie for A$12 each. There is a UGG shop here that offers massive discounts. 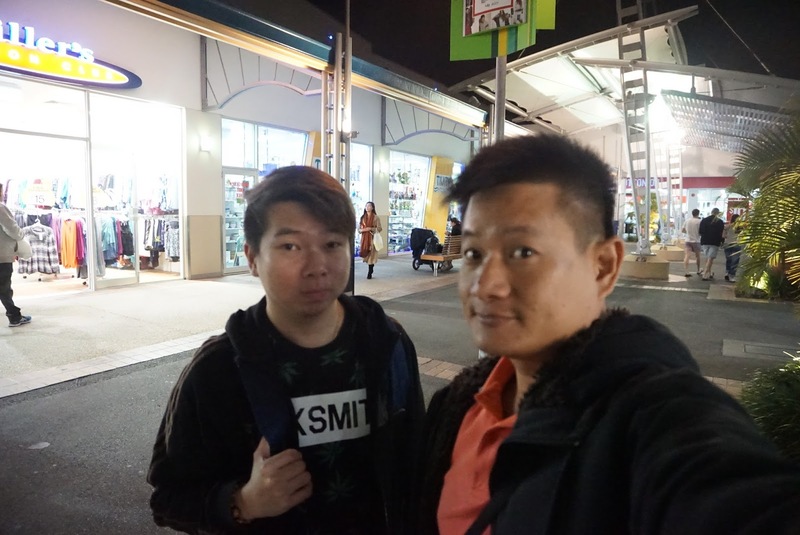 We roam around, mainly to those shops that we did not managed to go in a few days before to check things out. 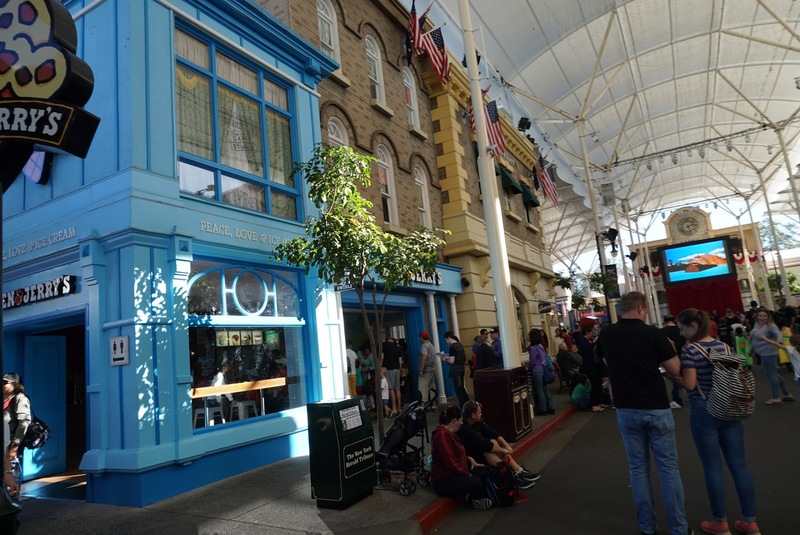 For shopaholics, do cater a full day at Harbour Town. 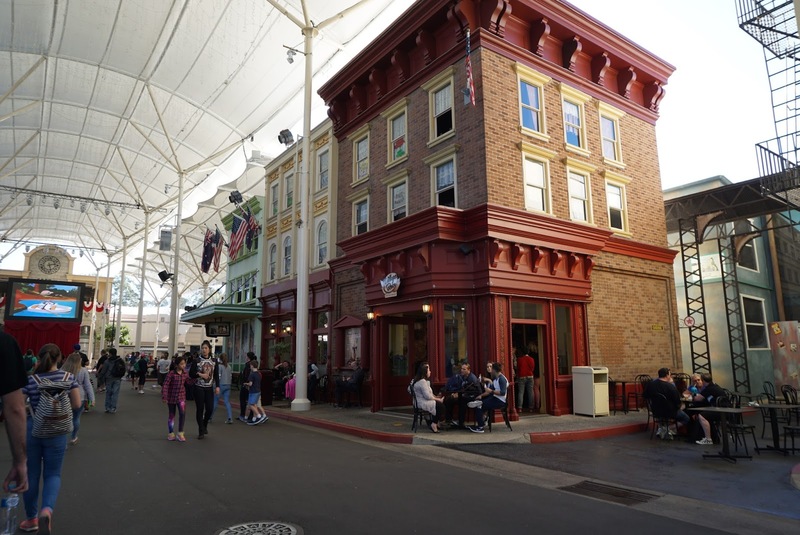 After spending 2 hours at Harbour Town, we returned to Warner Brothers Movie World. Since we have an annual pass that allows us to return unlimited, we decided to come here and ride the roller coasters before we head back. 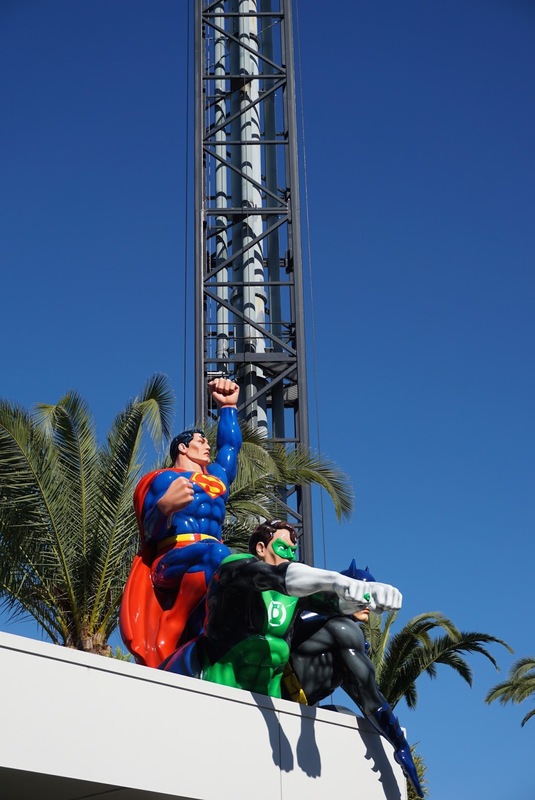 We took the Green Lantern, Akham Asylum, Scooby Doo and Superman Escape rides. 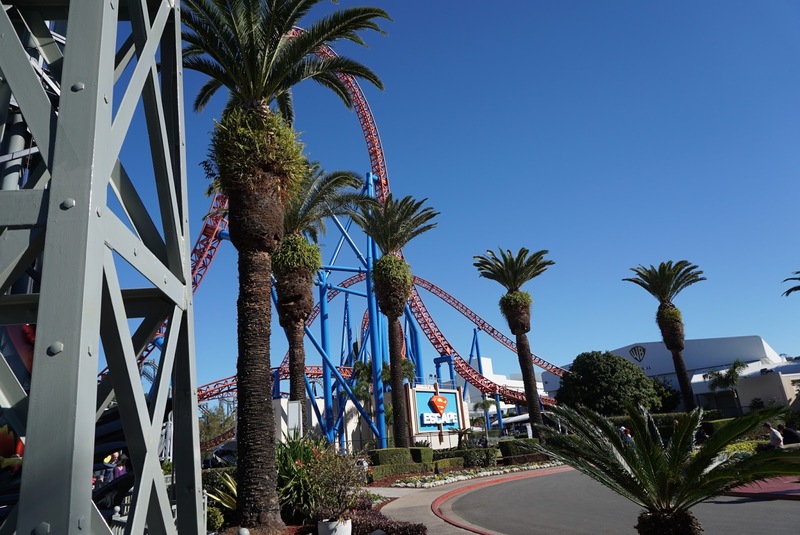 We rode on the Superman Escape ride at least three times today as we find the ride thrilling. 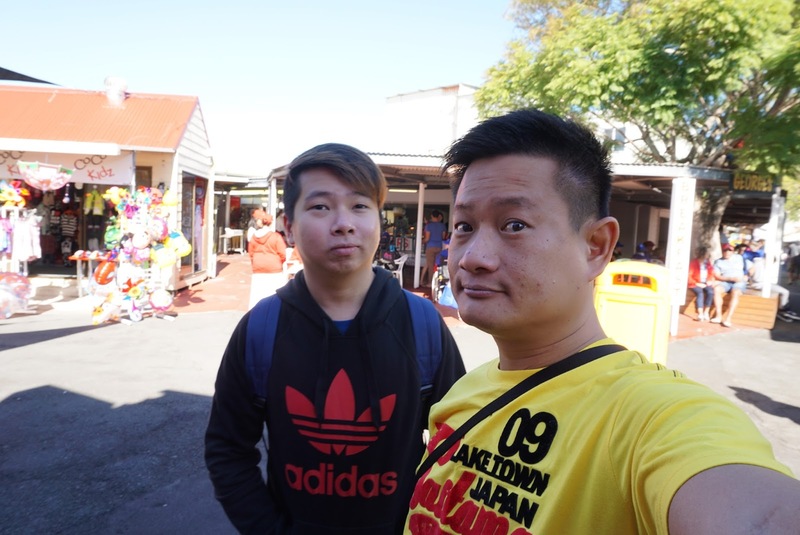 After riding the roller coasters, we headed into one of the theme park shops to get some clothing for my to-be born nephew. 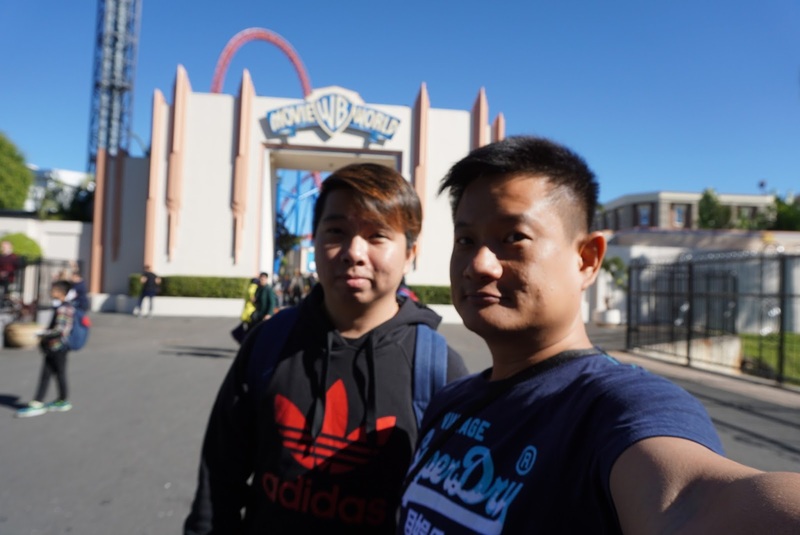 We stayed briefly at the Warner Brothers Movie World before heading towards Byron Bay Lighthouse. Byron Bay Lighthouse is situated near the border of Queensland and New South Wales. 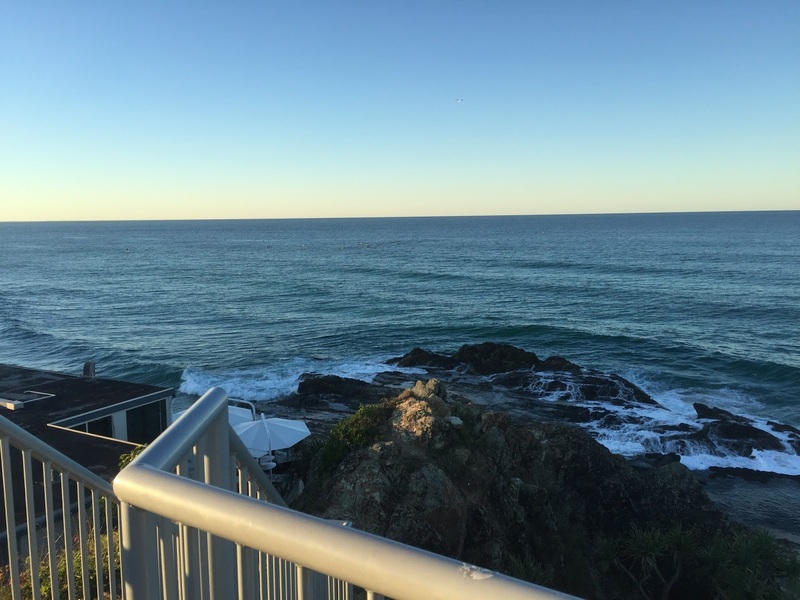 It took us about 1 hour drive from Warner Brothers Movie World to Byron Bay Lighthouse. As the sky gets darker, I am not too sure if we would make it in time to the lighthouse before dark. The sky has turned dark when we near Byron Bay and has turned completely dark as we entered Byron Bay town. 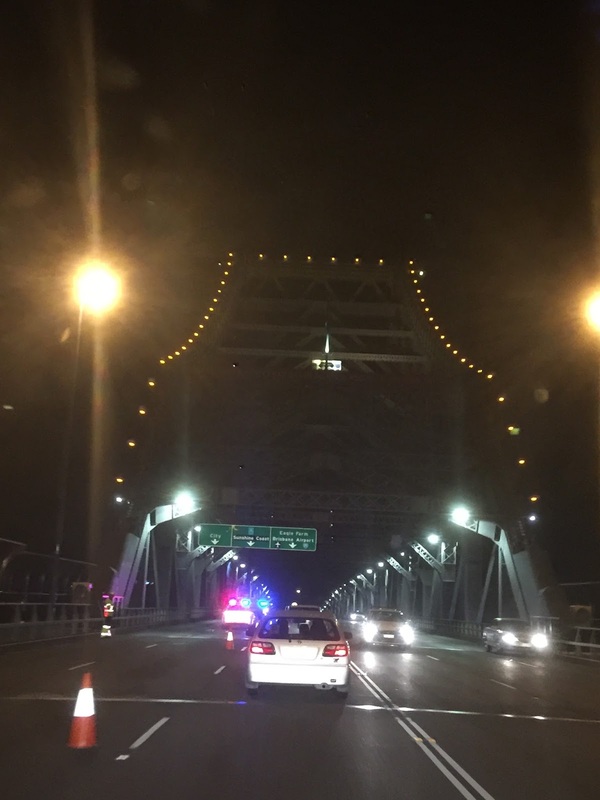 We drove to the foot of the lighthouse and thought it is too dark to continue further into the lighthouse as the streets here are not lighted. 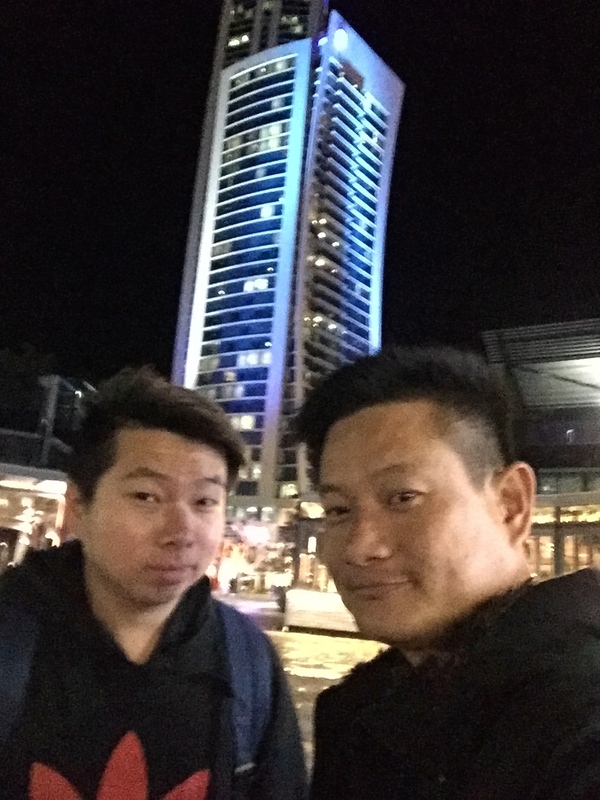 My friend and I decided to make a u-turn back to the apartment as it gets too dark to continue the journey. 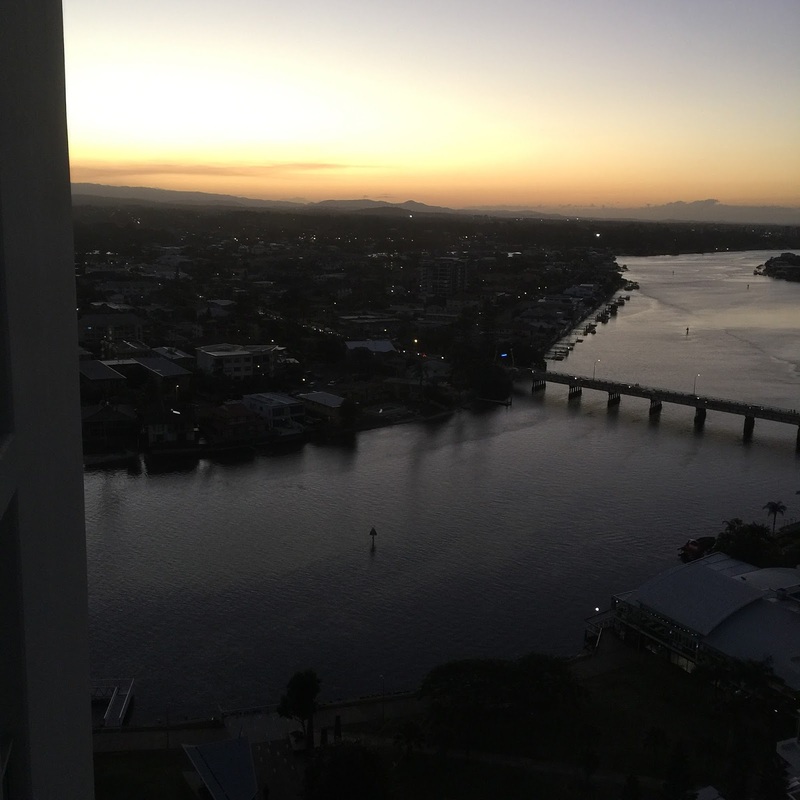 The drive back to Gold Coast is another 1 hour, by the time we reached our apartment, it is already 7 pm. 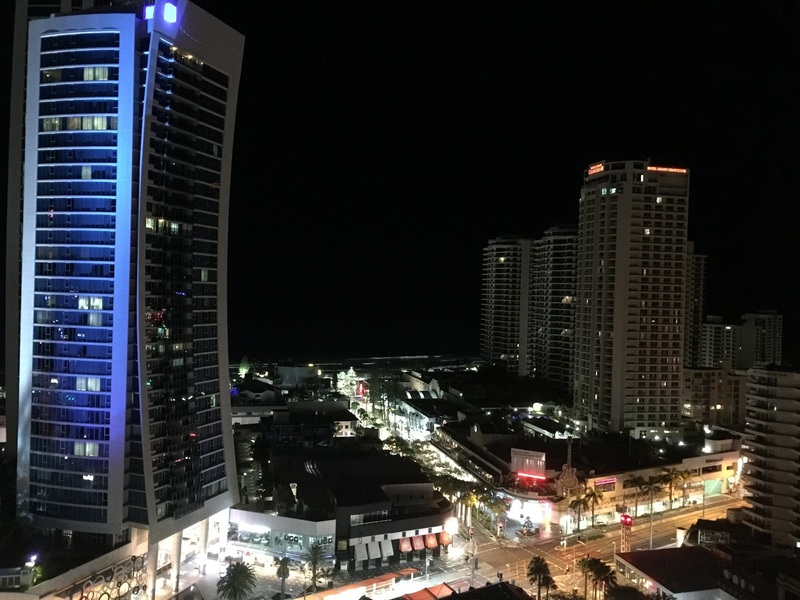 We headed to the nearby Cavil Avenue for dinner and hit the beach of Surfers Paradise to have one last look before we head home tomorrow. 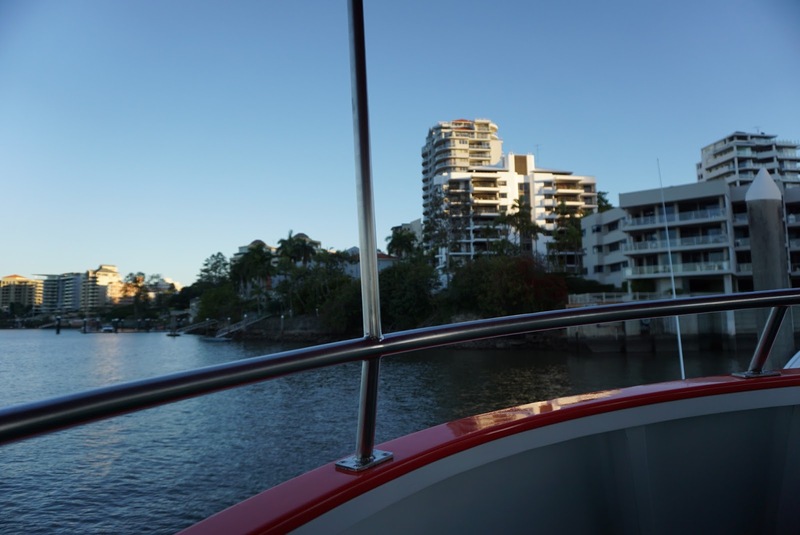 To many people coming to Gold Coast for vacation, the top two activities are the beach and the theme parks. 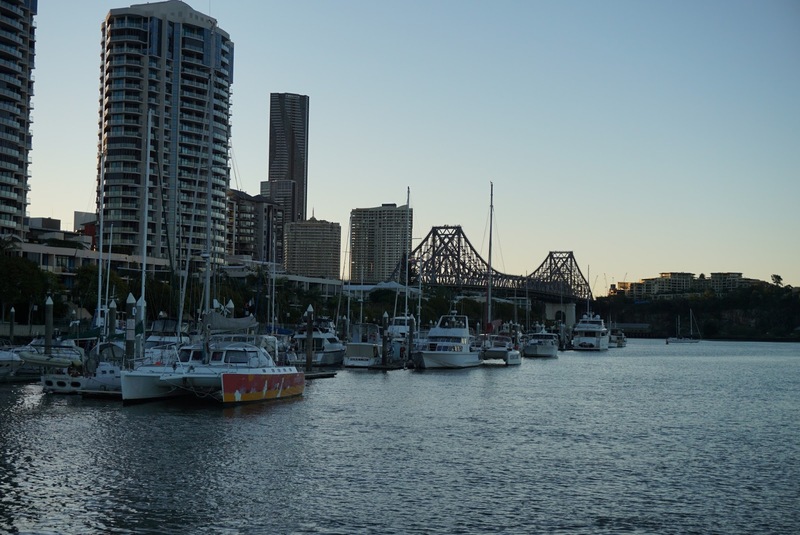 Indeed Gold Coast has no lack of theme parks to ensure full day of fun for visitors. 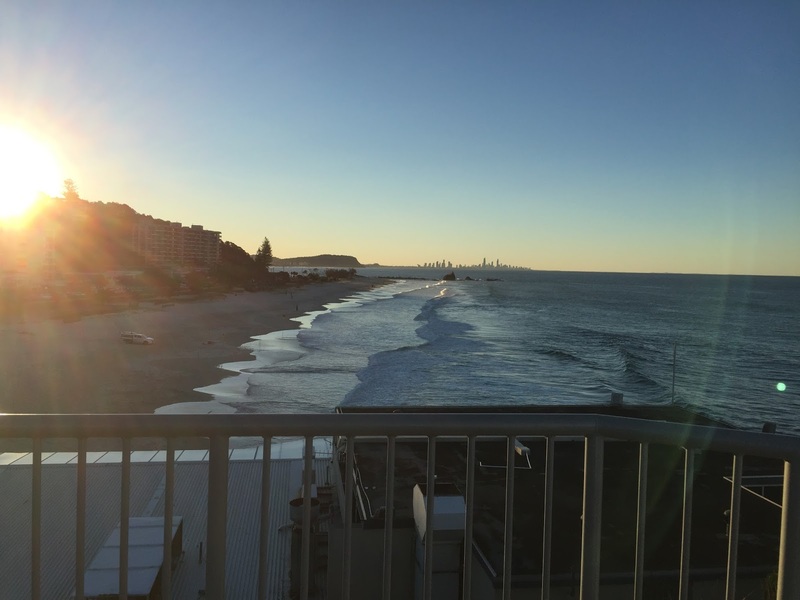 This trip I want to show my friend something different about Gold Coast. 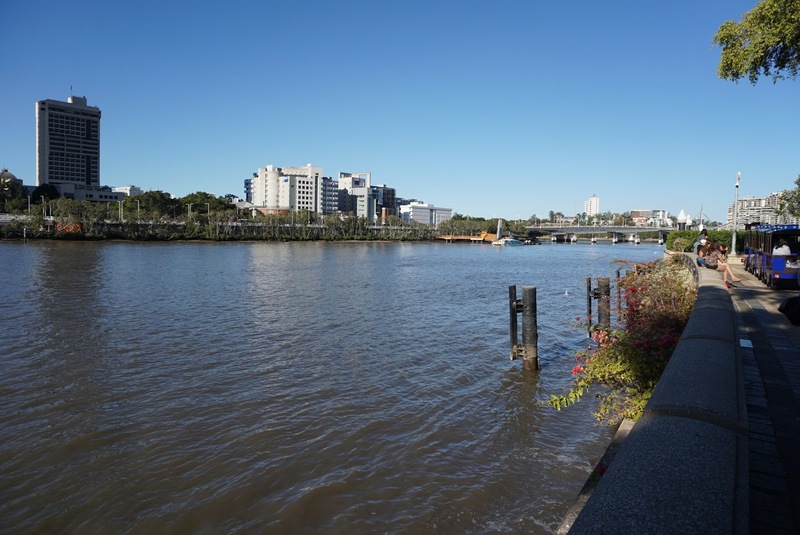 The Hinterlands, as the Gold Coast Tourism board has labelled throughout the years, the Green Behind the Gold, is another option that is worth visiting. 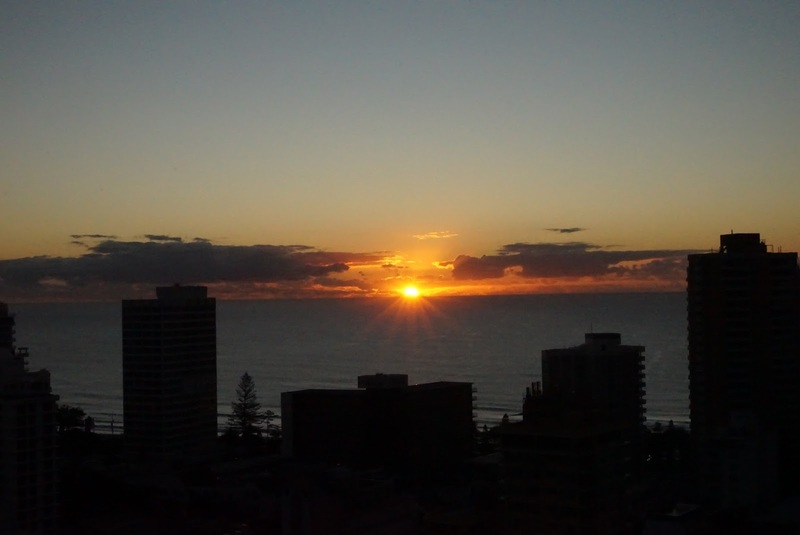 In fact there are three national parks that is near to Surfers Paradise. 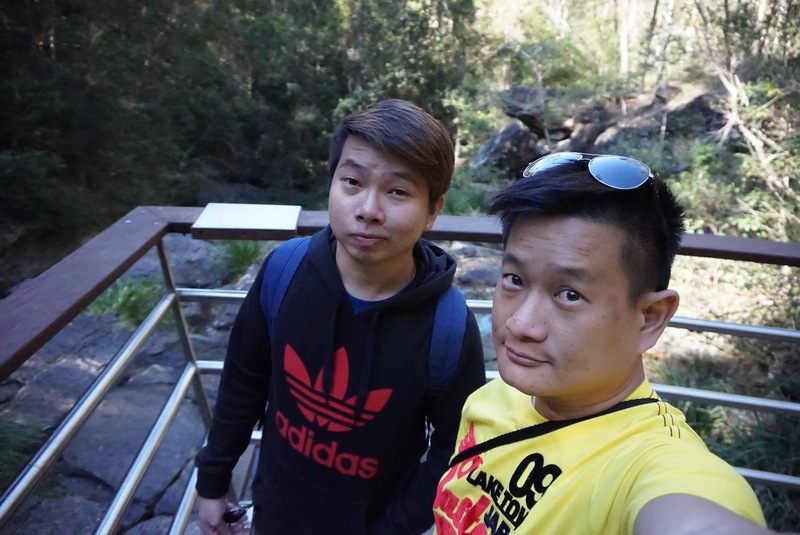 Our itinerary today brought us to Springbrook National Park. 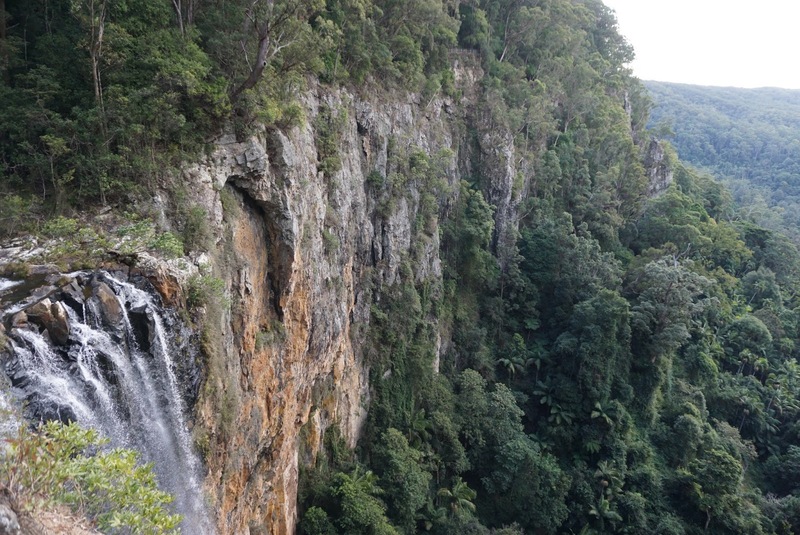 Springbrook National Park is 1 hour drive from Surfers Paradise and boasts forests as old as 23 million years ago. We got up early to make it for our journey. 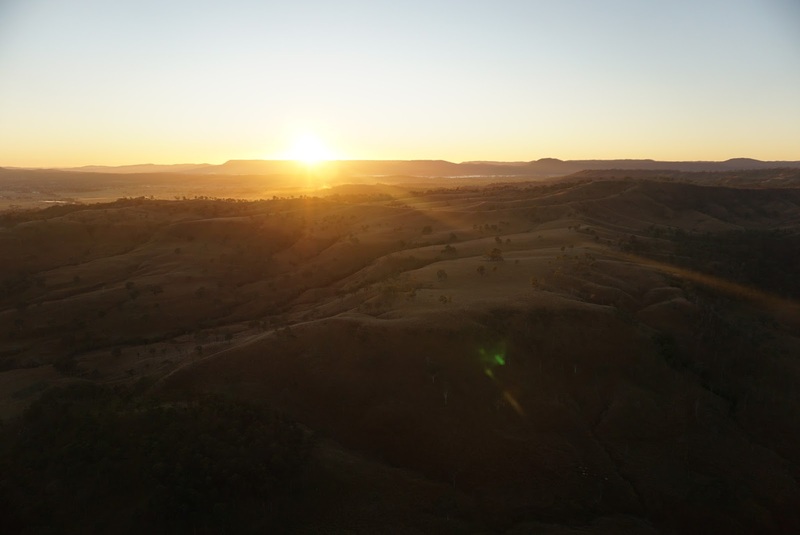 Knowing that sunsets around 5.30 pm, it is imperative for us to leave the national park before the sky gets dark as the unlighted windy mountain roads can be quite dangerous to drive at night. 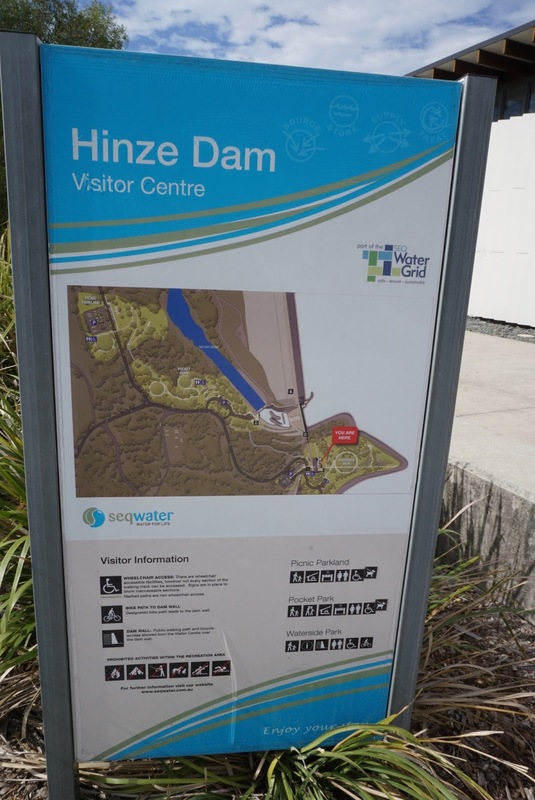 On our way to Springbrook National Park, we chanced upon a sign that points to Hinze Dam. 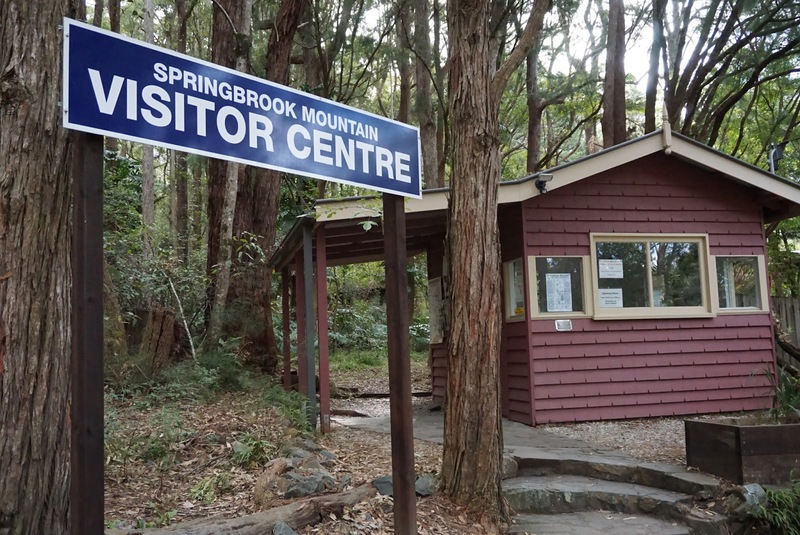 And since it is a short detour from our way to our first stop in Springbrook National Park. 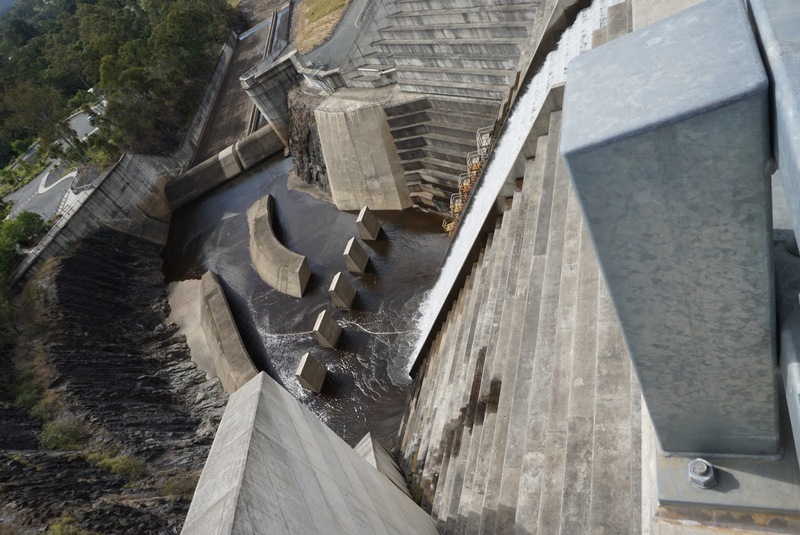 Driving about 10 mins on the detour, we came to a large dam structure. 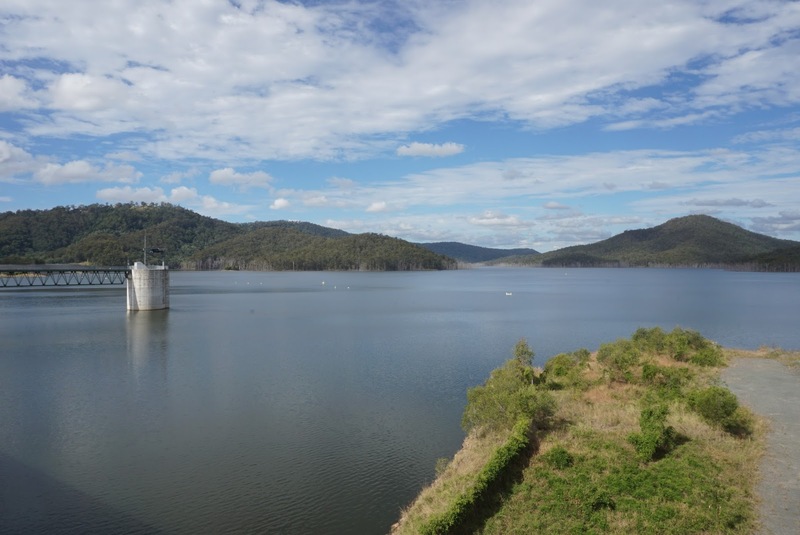 We knew we arrived at Hinze Dam. 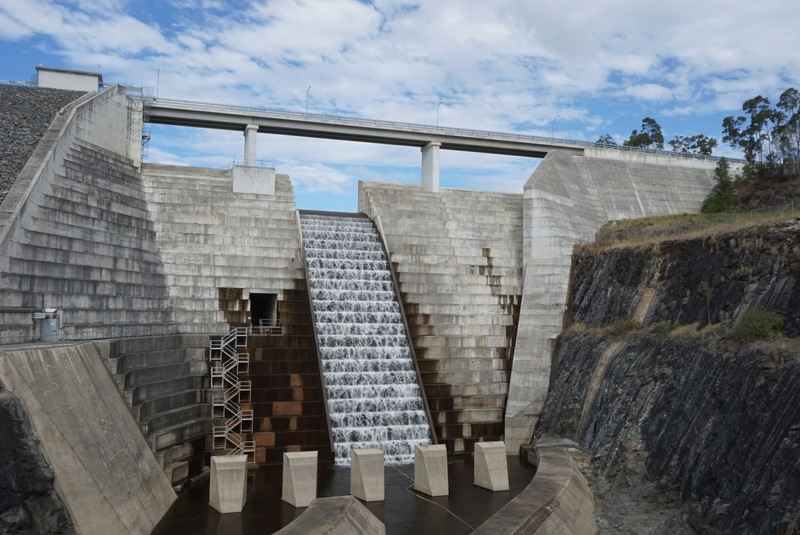 From the base of the dam, the structure looks massive. 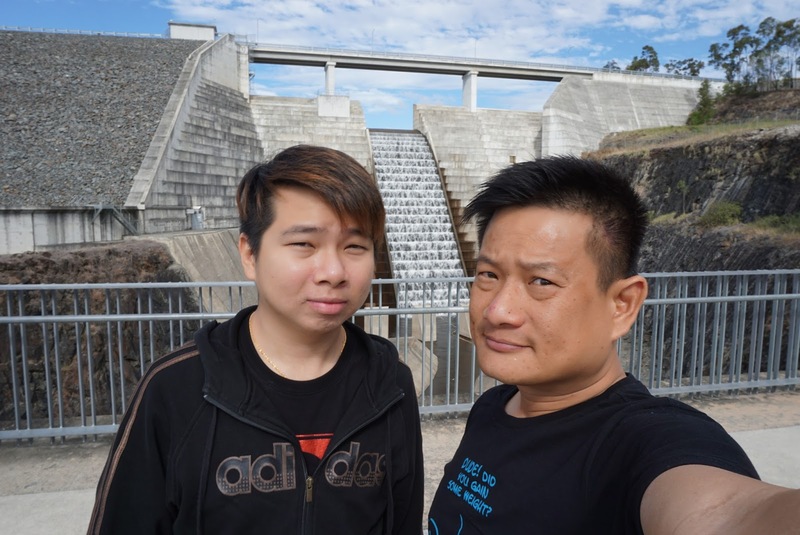 After taking some pictures, we wanted to continue our journey to Springbrook National Park as we thought it might take too long to walk up to the top of the dam. 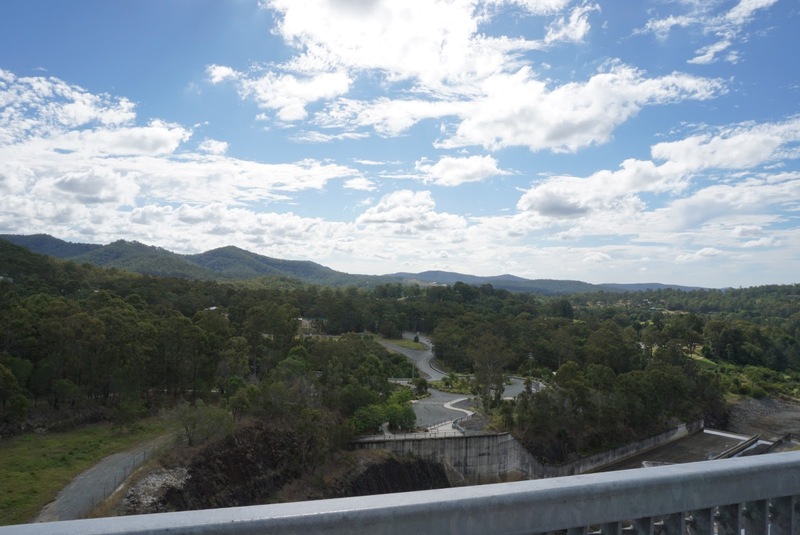 When we were driving out of the carpark, I saw a road that seem to lead further up, I took that road and discover that it leads to the top of the dam. 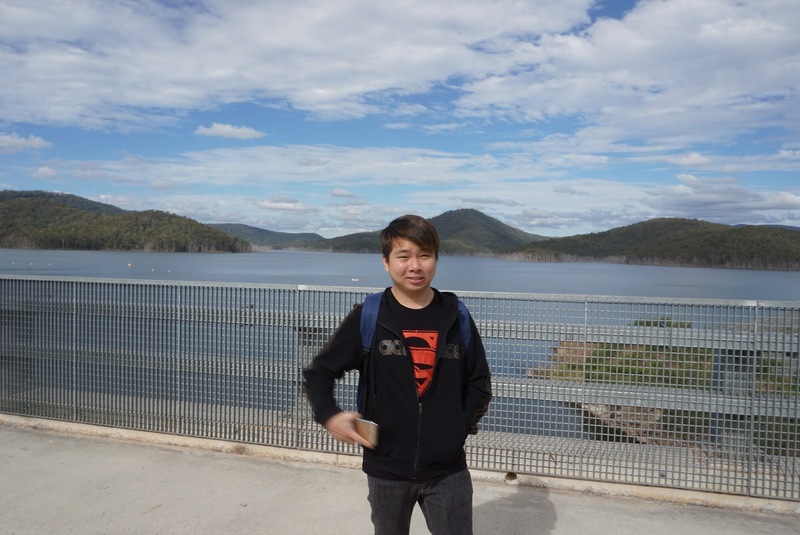 We parked our car and walked halfway on the top of the dam. 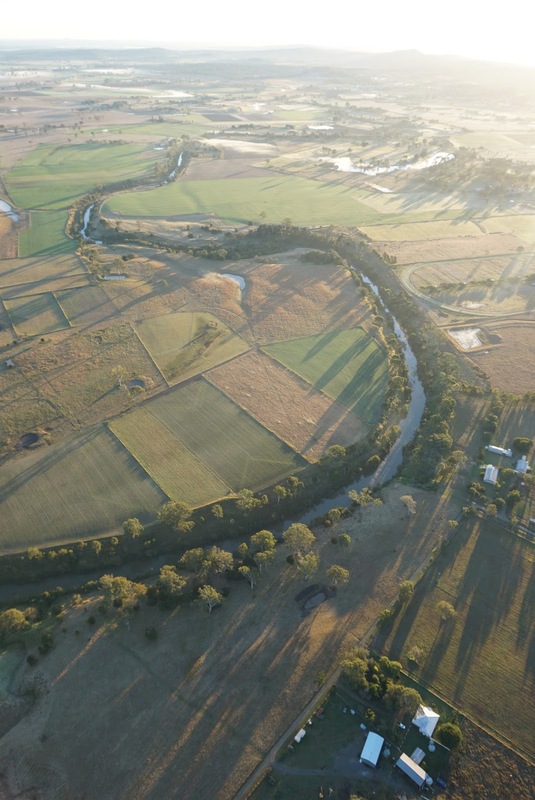 From here we can see the vast water mass that forms the Advancetown Lake. From across the lake, I can see the mountains that seem to protect the lake. The view here is simply stunting. 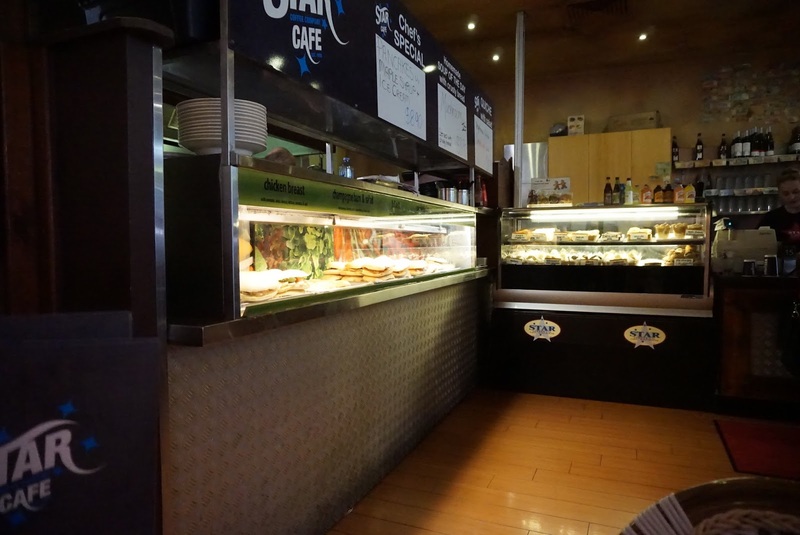 After taking a few pictures, we headed to the cafe to see if we can get some breakfast. 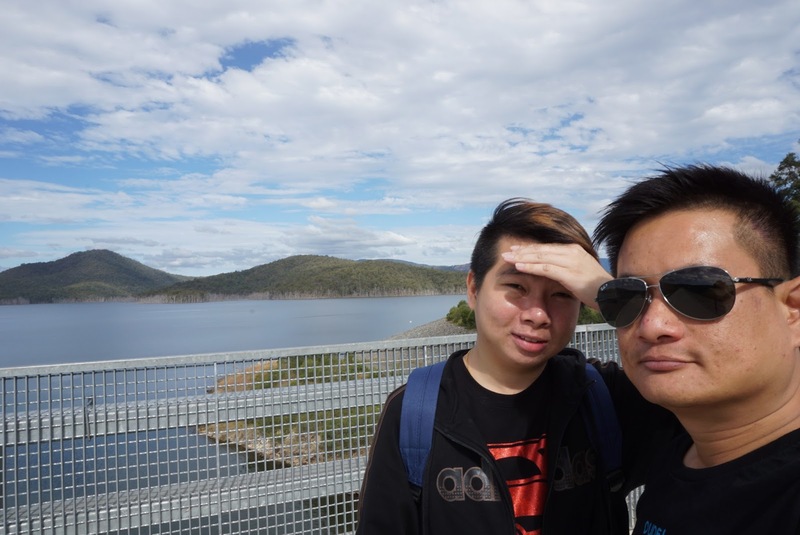 Looking at the menu, we decided to catch breakfast further into Springbrook National Park and left Hinze Dam. 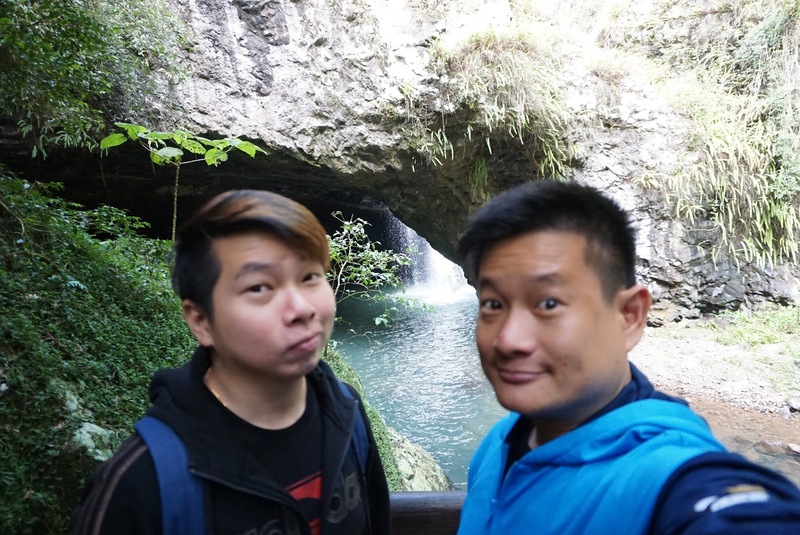 It took us another 40 mins drive to reach our first destination in Springbrook National Park, we finally arrived at Natural Bridge. 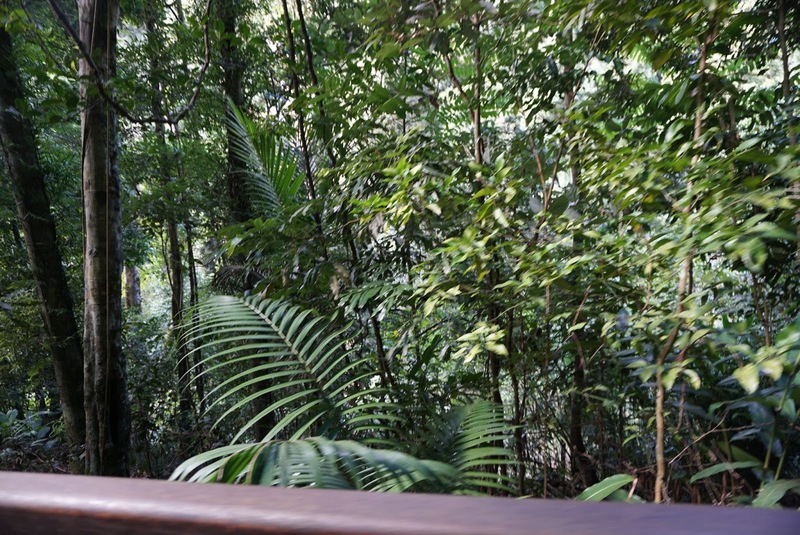 After parking our car, we took a short 1km walk around the Natural Bridge into the Gondwana Rainforest. 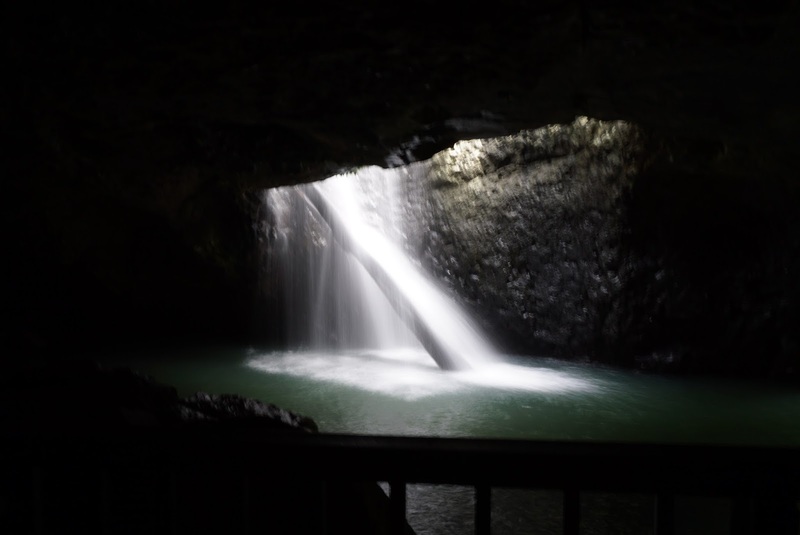 The reason why people come here, other than looking at glow worms is to visit the cave. 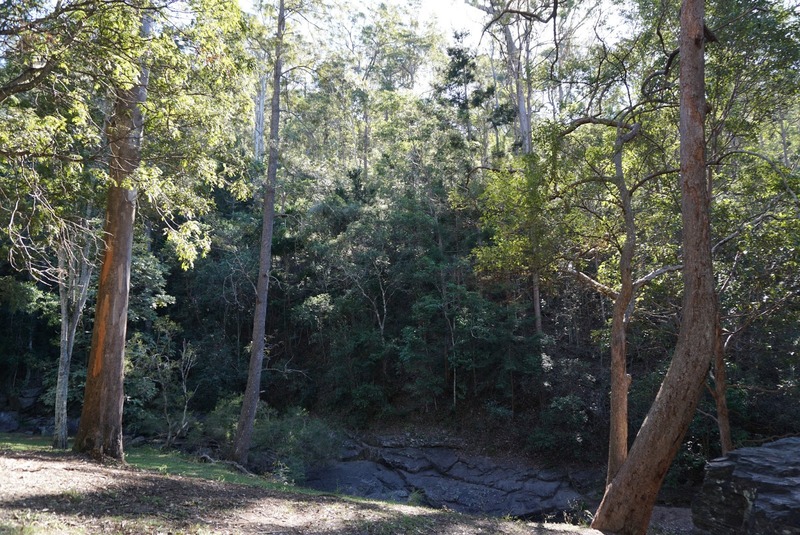 The cave is entrance is located at the bottom of the easy walkway. 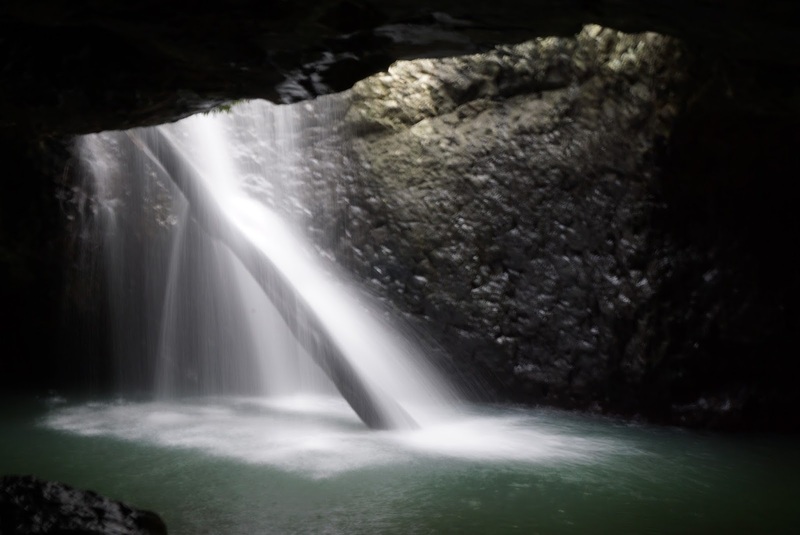 As we near the cave, we hear water gashing from atop, we knew we had arrived at what we wanted to see. 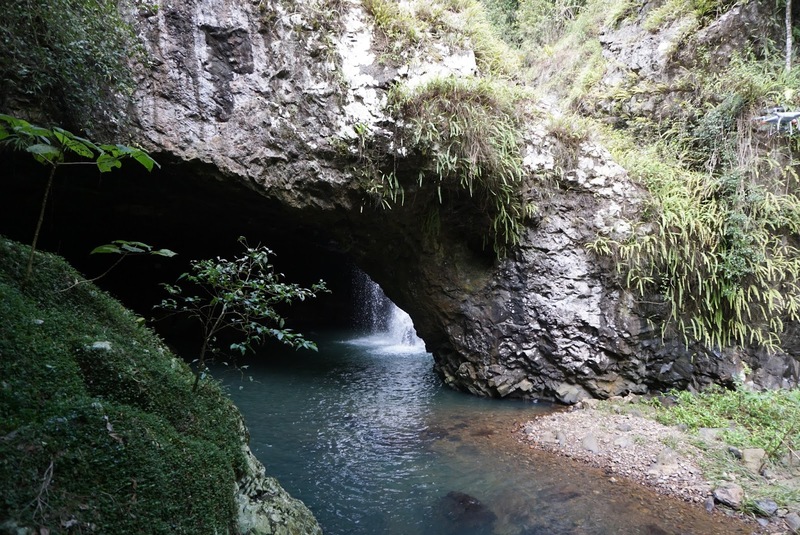 This area is known as Natural Bridge is due to the fact that corrosion over the years has sheered away the top part of the cave, allow the water from the top of the river to fall directly into the cave. 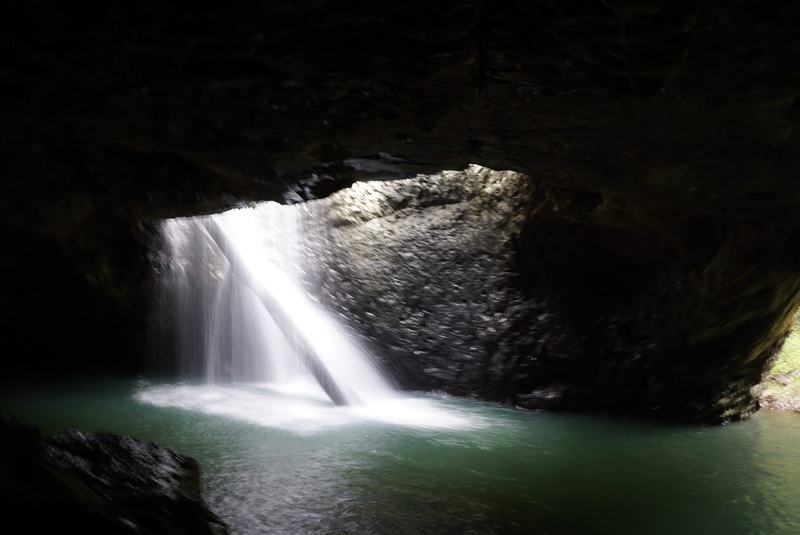 People made the detour (30 mins detour in fact) from the main sights to come here to see the waterfall through the cave. We stayed here marveling the wonder of nature for a good 10 mins before continuing the path to complete the rest of the route. 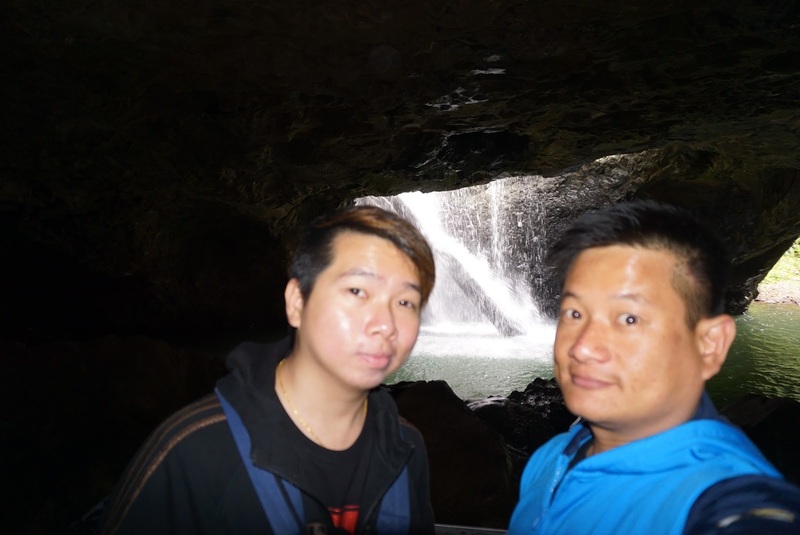 As we were walking the rest of the path, we came to the top of the river, where the water has fallen into the cave. 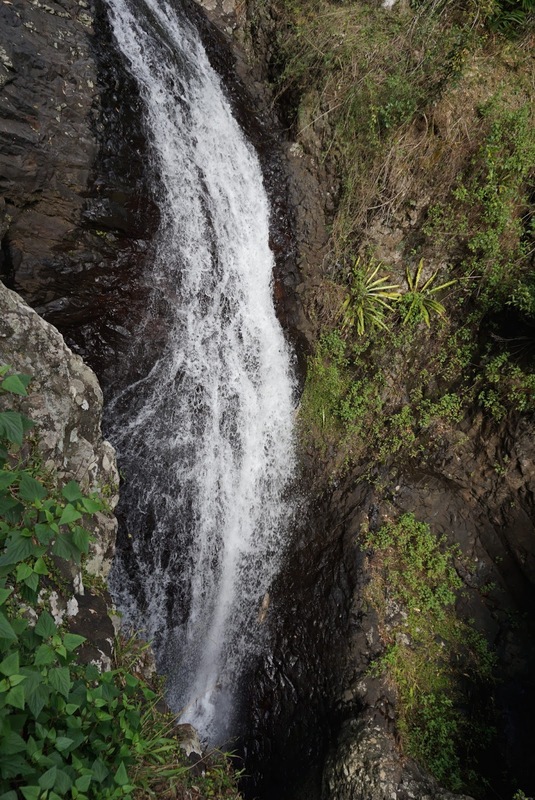 It is here where we can see where the original path of the waterfall had been before the force of the water made the hole on top of the cave. 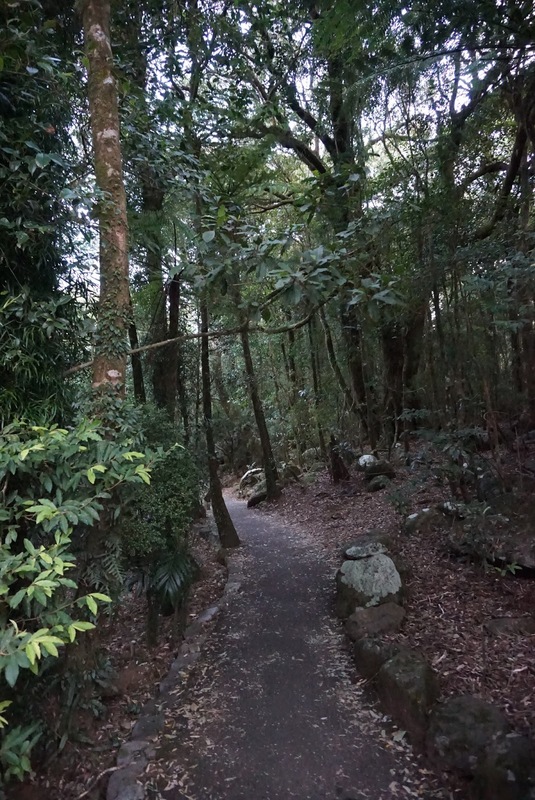 We continued the path to make it back to our car and head towards the main view points of Springbrook National Park. 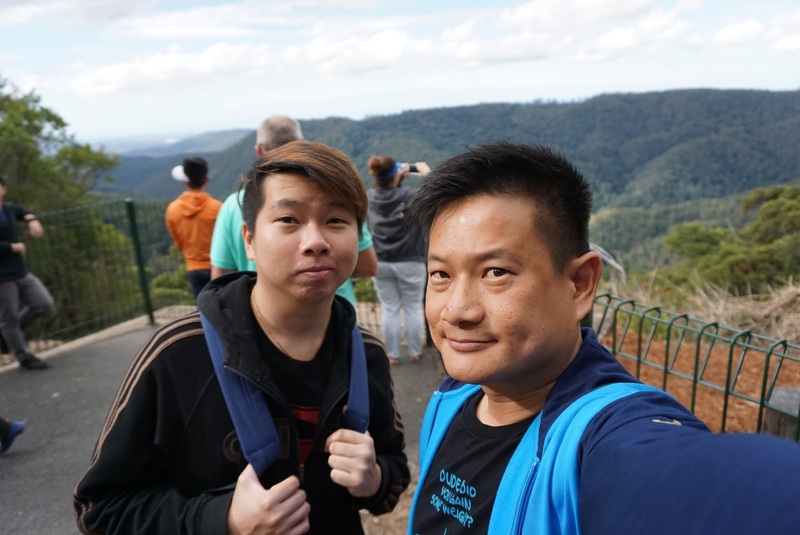 To get to the rest of the lookouts in the national park, we had to drive around the mountain range that lies between Natural Bridge and the rest of the lookouts. As we were heading southwards the bend round the mountain range, the road gets narrower and steeper. 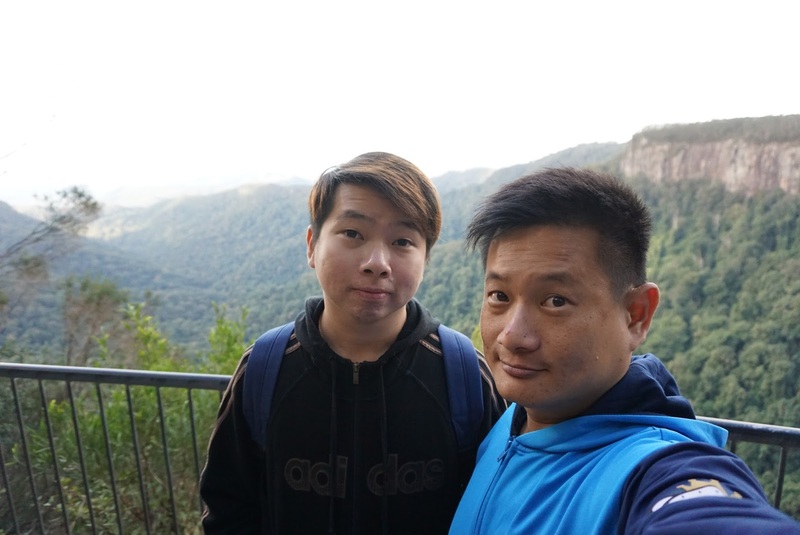 Along the route, we stopped at Wunburra lookout, the first lookout as we reach Springbrook mountain. 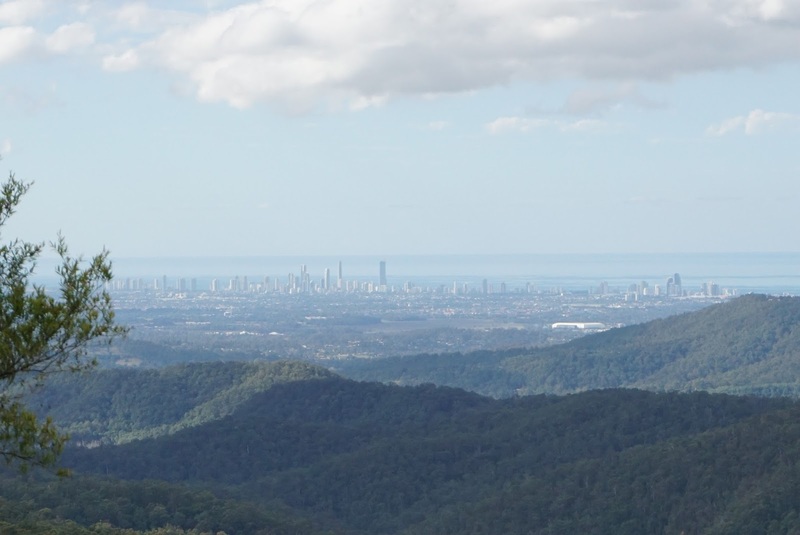 This lookout allows us to see the entire Springbrook Mountain and as well as the towers in Surfers Paradise. I thought this is a good spot that allows one to see the Green and the Gold all at the same time. 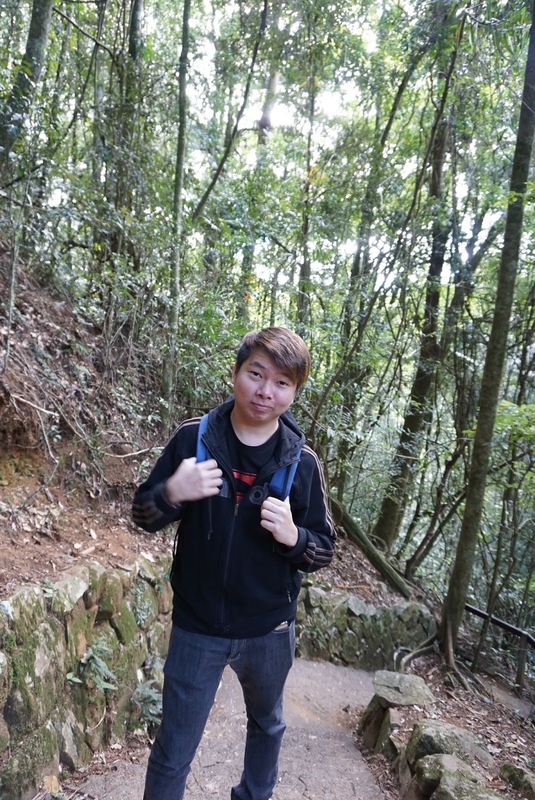 Looking out into the mountain range, with the fresh mountain air, the view here is amazing. 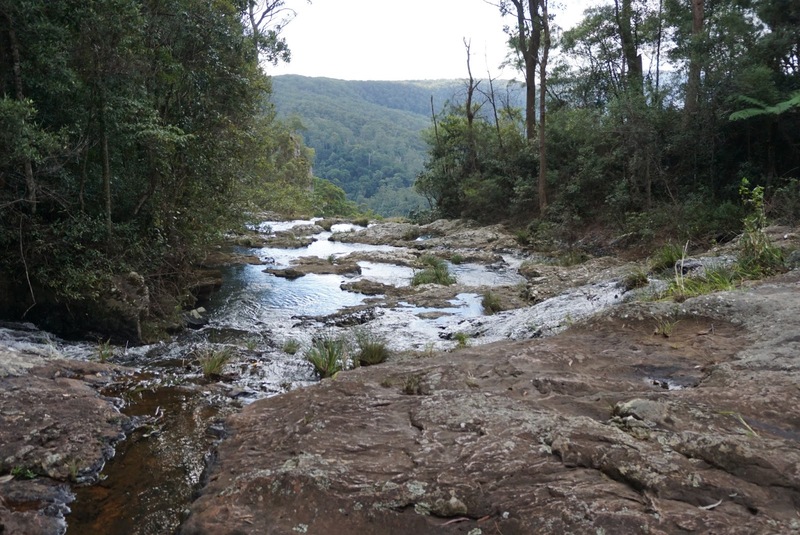 We continued towards our next destination Purling Brook Falls Lookout. 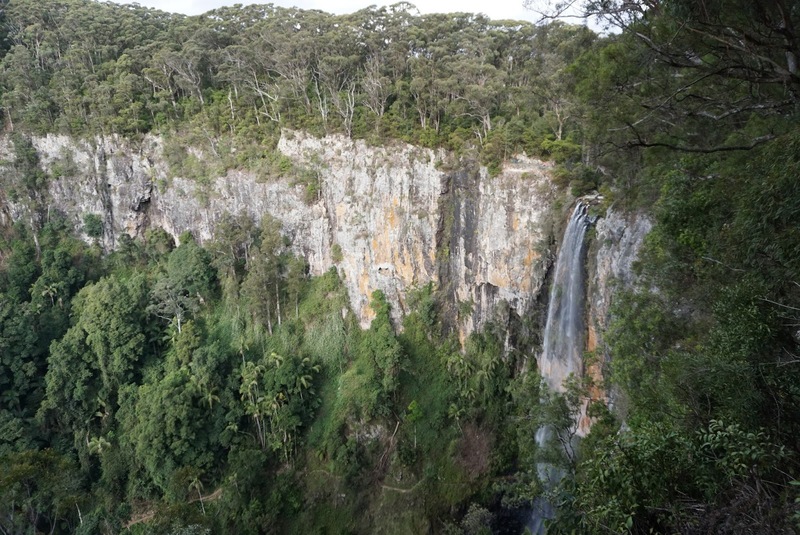 There are two lookouts from the carpark of Purling Brook Falls Lookout. 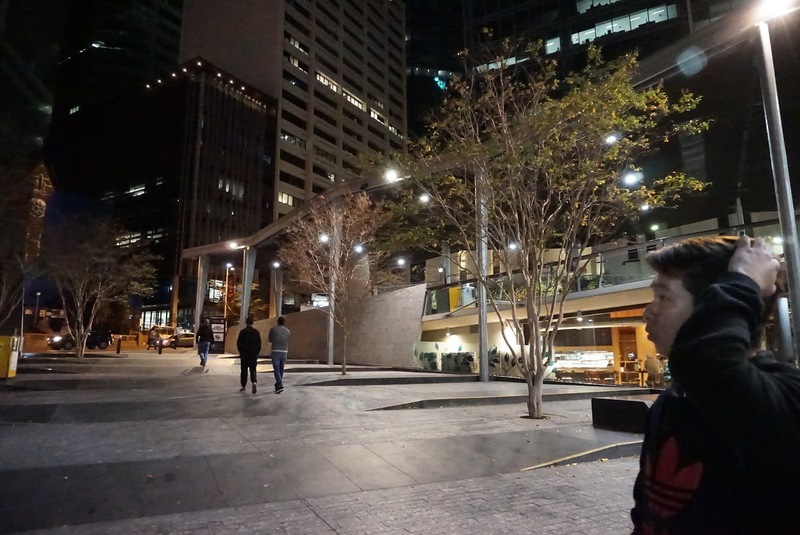 We went for the one to the left, which is a shorter walk from the carpark. 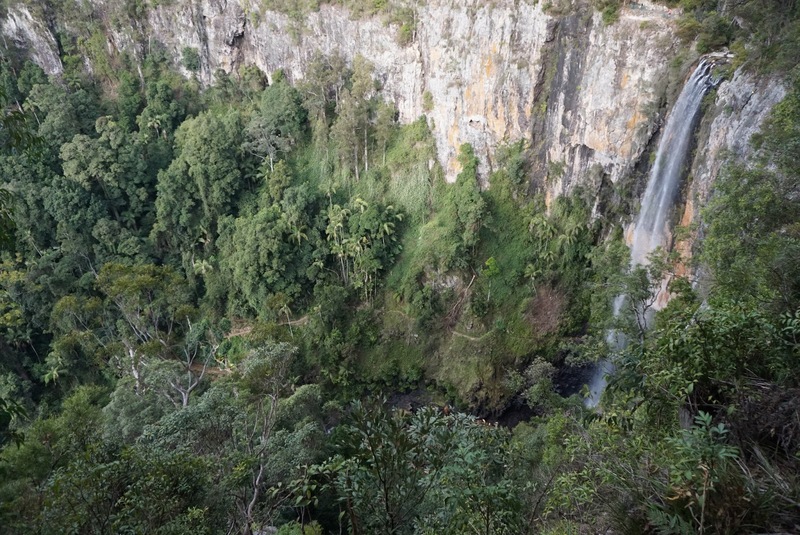 From this lookout, we are not only able to see Purling Brook Falls from a distance, but also the entire landscape where the waterfall is located. It looks as if the forest has been split into two by some earthquake or meteor strike that killed the dinosaurs. 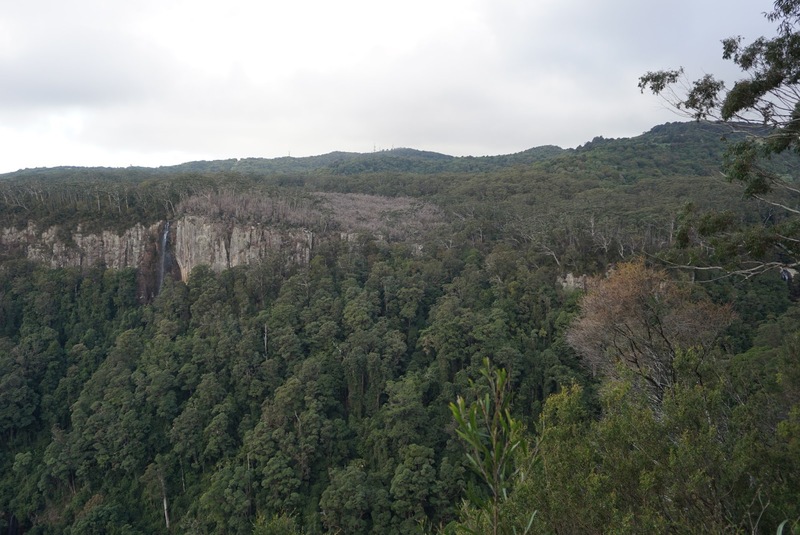 A vertical cliff separating the rainforest from the Eucalyptus Forest perched high on the cliff. 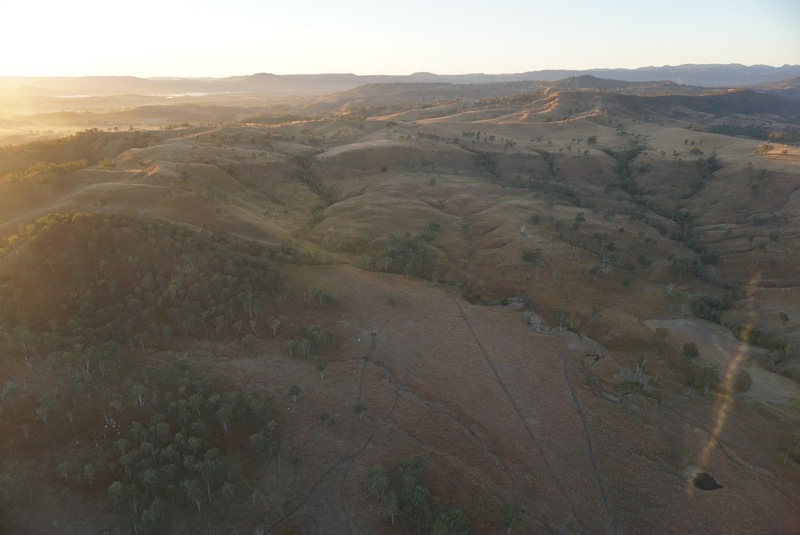 The view from this lookout seemed like we have been transported back in time for millions of years when the dinosaurs still ruled the Earth. 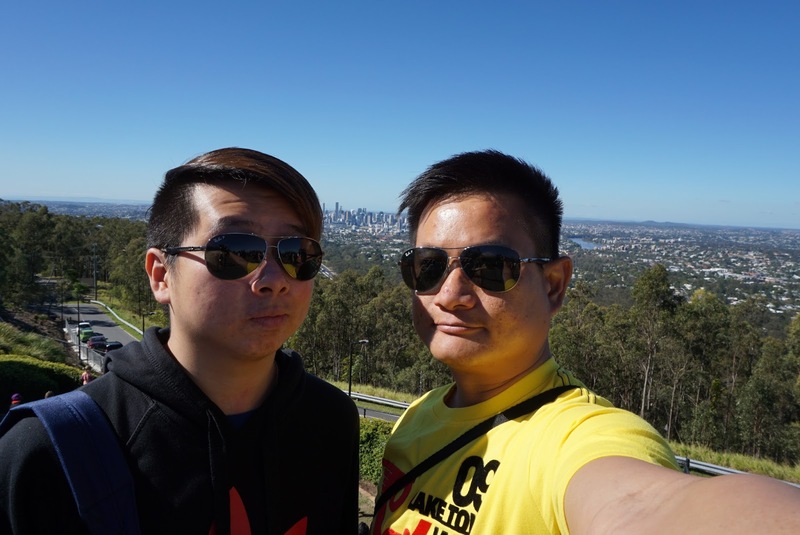 We took a few photos and headed back to the carpark and took to the other lookout. The way to the other lookout led us through a bridge that sits directly on top of Purling Brooks Fall and the lookout is directly next to Purling Brooks Falls. 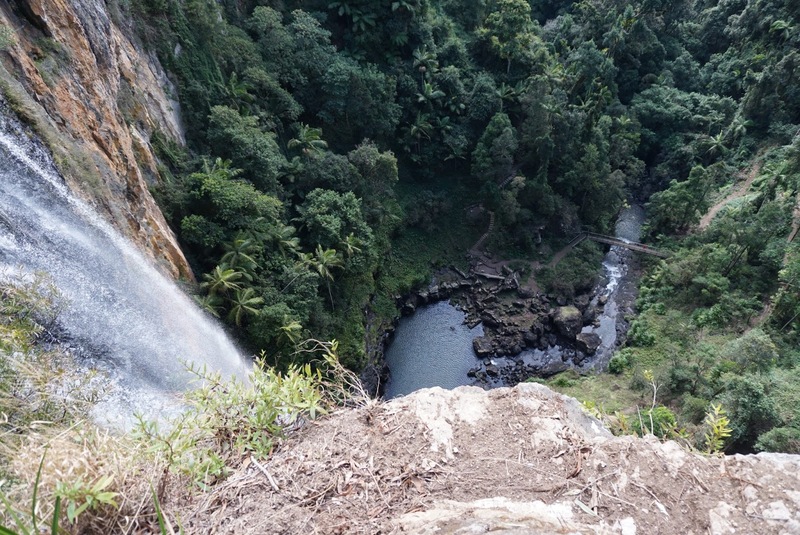 From here we are able to appreciate the majestic of the waterfalls, which plunged about 100m into the canyon. 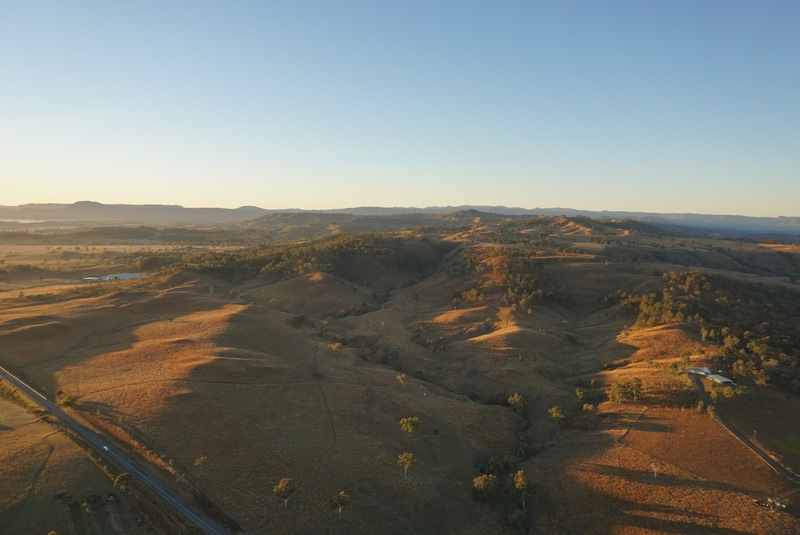 This lookout also offers views of the mountain range that seem to stretch forever. Leaving Purling Brooks Falls lookout, we drove to the Canyon Lookout. 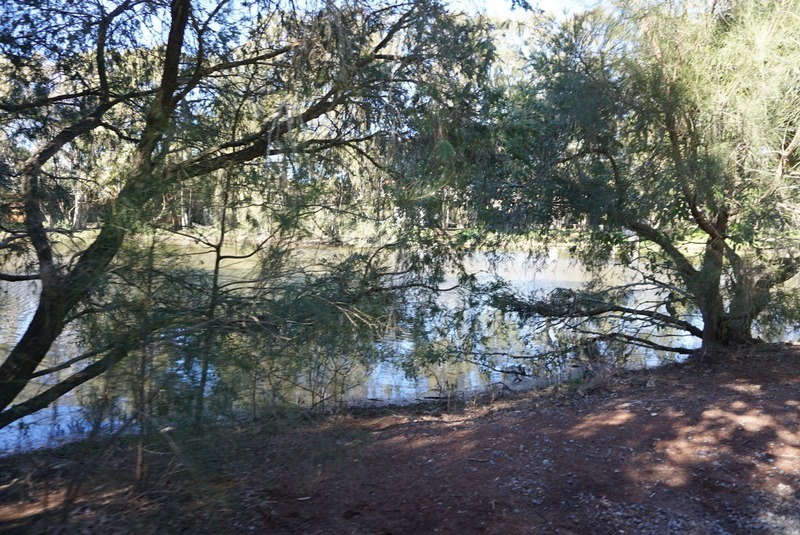 The lookout is directly in front of the carpark. 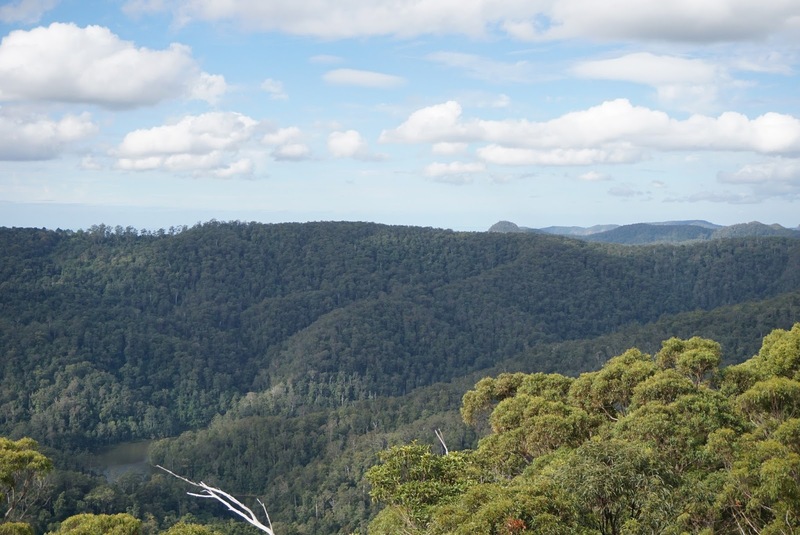 Similar to Purling Brook Falls Lookout, this lookout offers the view of the entire mountain range as well as a vertical cliff which sits on top of these mountains. 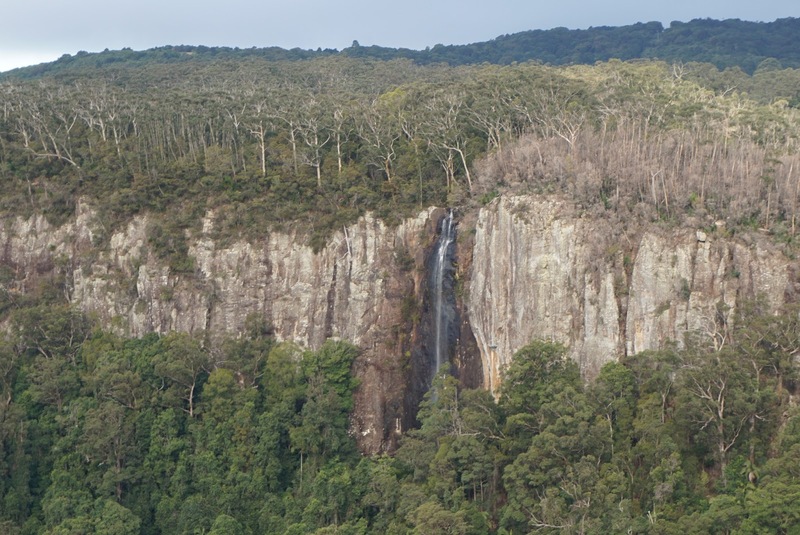 Amongst the trees perching on top of this vertical cliff, the Rainbow Falls made its way down the side of the cliff, making its make known to mankind whom came here to view this landscape which seem as old as time. After taking a few shots, we headed to our final destination for the day, the Best of All Lookout. 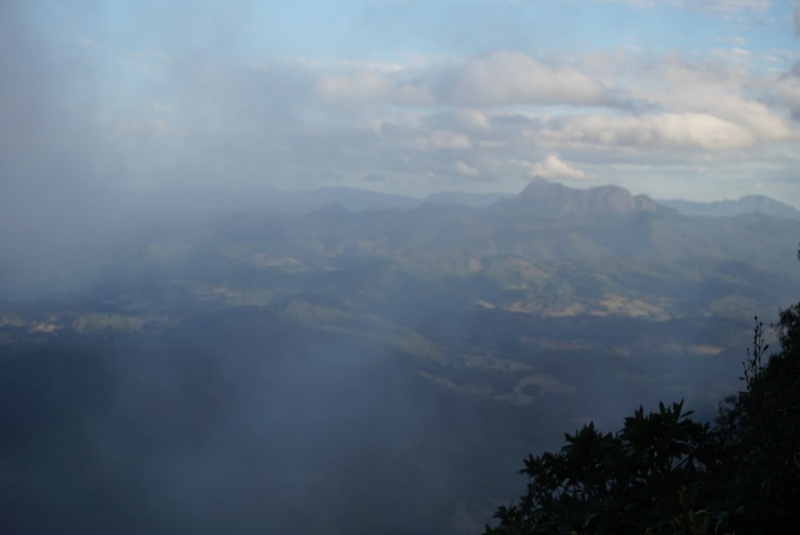 As its name implies, this lookout promised a view that is so breathtaking that no other lookouts can match. 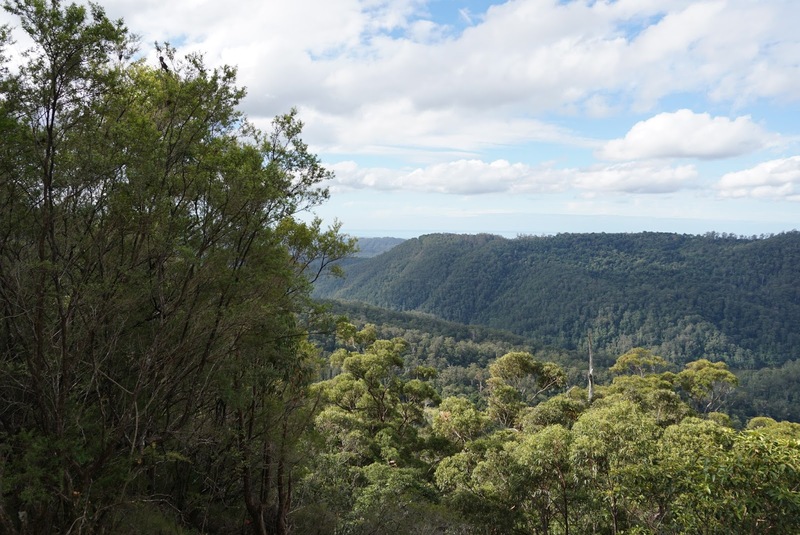 The lookout is a 300m walk through an ancient rainforest with mainly Antarctic beech trees. 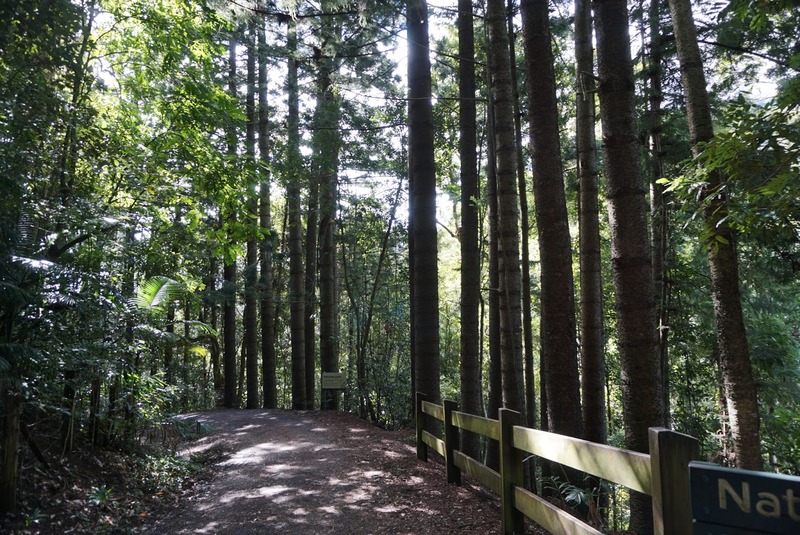 As we were walking through this forest, the air has turned colder, thanks to the Antarctic beech trees. 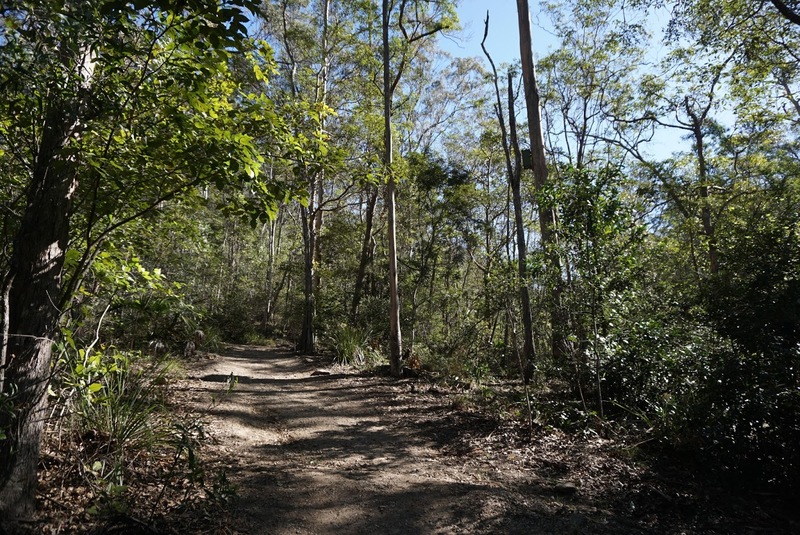 The walkway opens up to a lookout that towers over the Numinbah Nature Reserve valley and overlooks the Mt Warning mountain ranges in New South Wales. 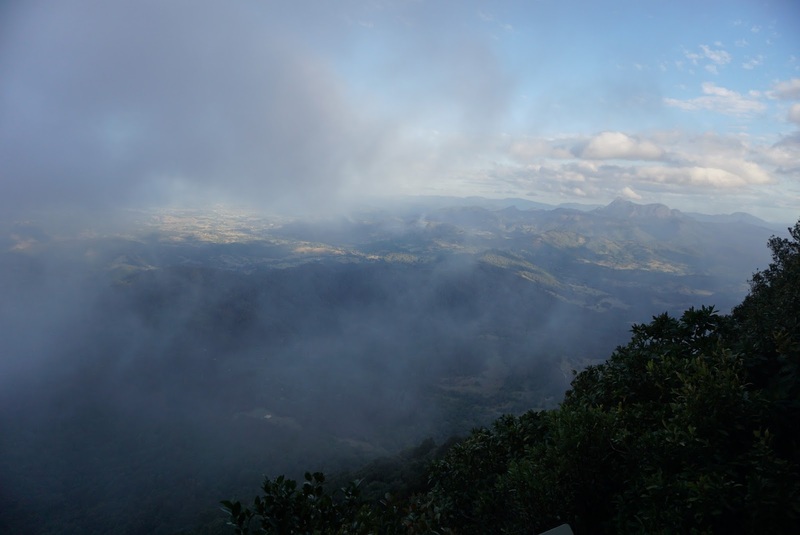 However at the time we were here, the low clouds covered the most of the view from the lookout. 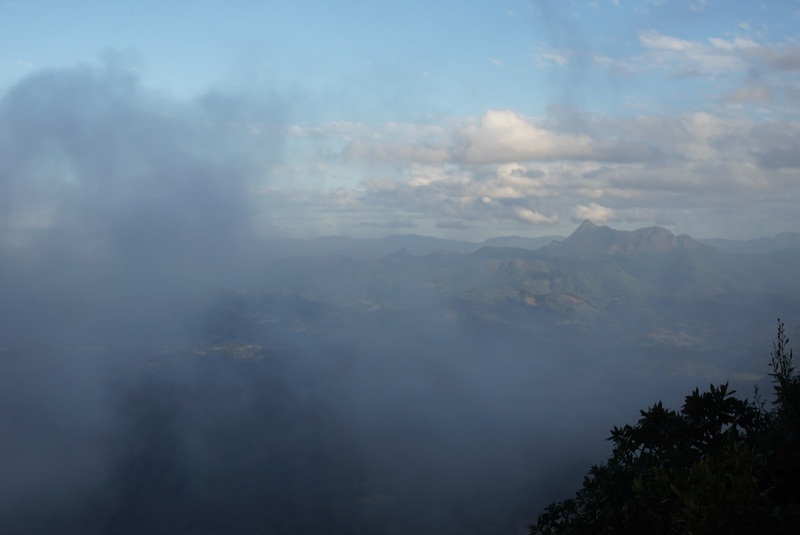 Perhaps it is the low clouds, I felt that we are standing on top of the highest point of Springbrook, overlooking at the smaller giants from above. The clouds also provided a sense of mysticism to the view. 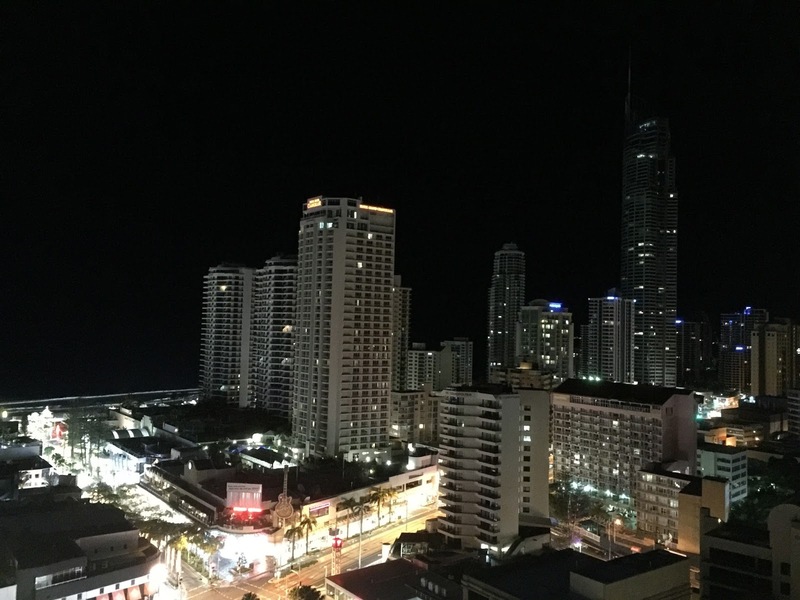 As it was getting late and coupled with the clouds are getting denser by the minute, which obscured the view from the lookout, we headed back to Surfers Paradise. The road back to civilisation took us through some mountains and windy roads. Mostly single lane each way, some of the bends a re as sharp as 140deg turns. 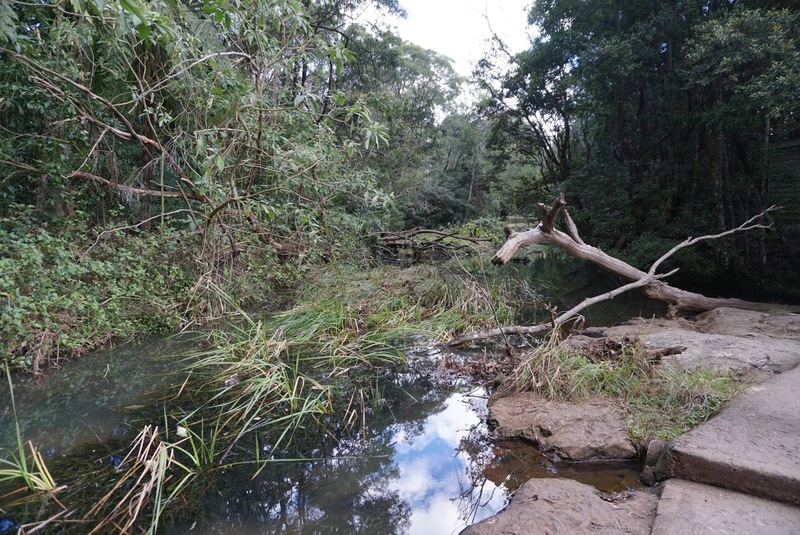 At certain parts of the road down from Springbrook, there is a single laned bridge shared by vehicles from both directions. 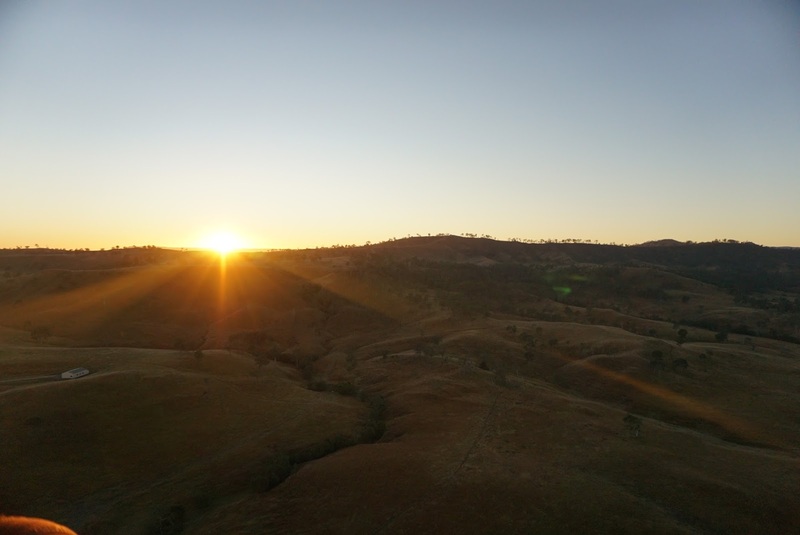 I was glad that we made it down before sunset as driving in such conditions can proved to be challenging, especially for the uninitiated. 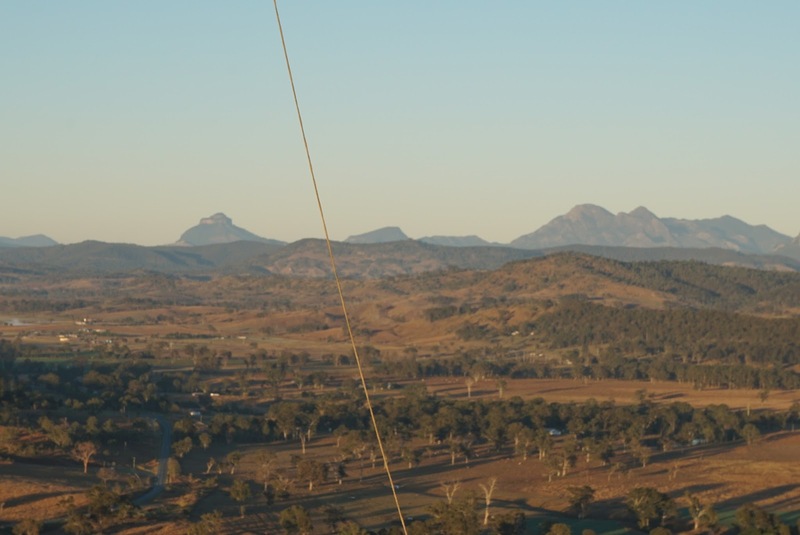 View of Mt Warning mountain ranges from Best of all lookout. 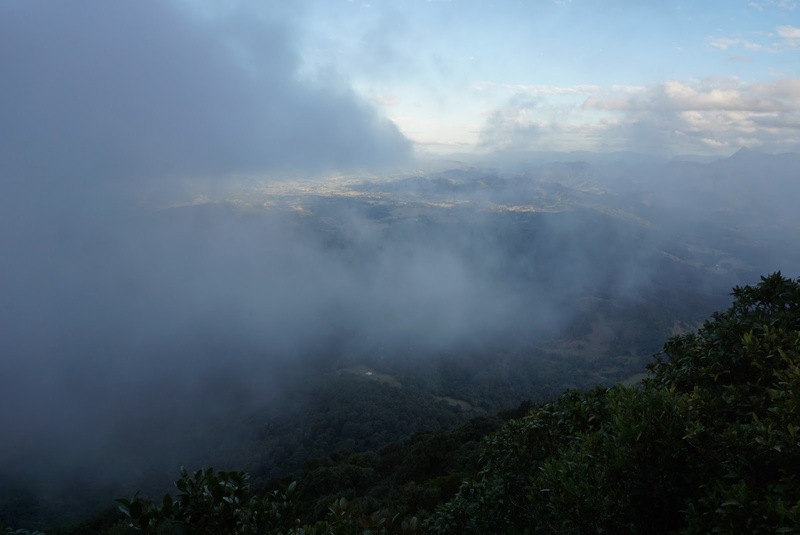 By the time we got there, the low clouds are looming over the lookout. 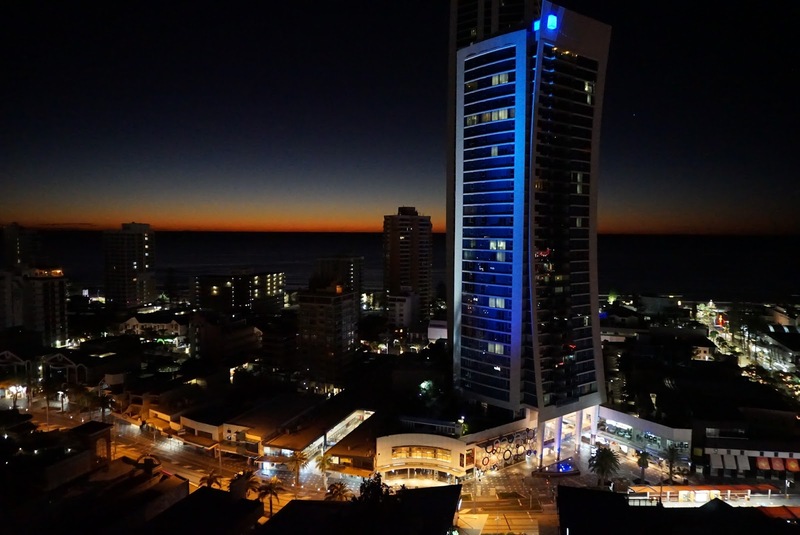 The drive back to Surfers Paradise took us around 1.5 hours, we made it back to Surfers Paradise just when it turned dark. 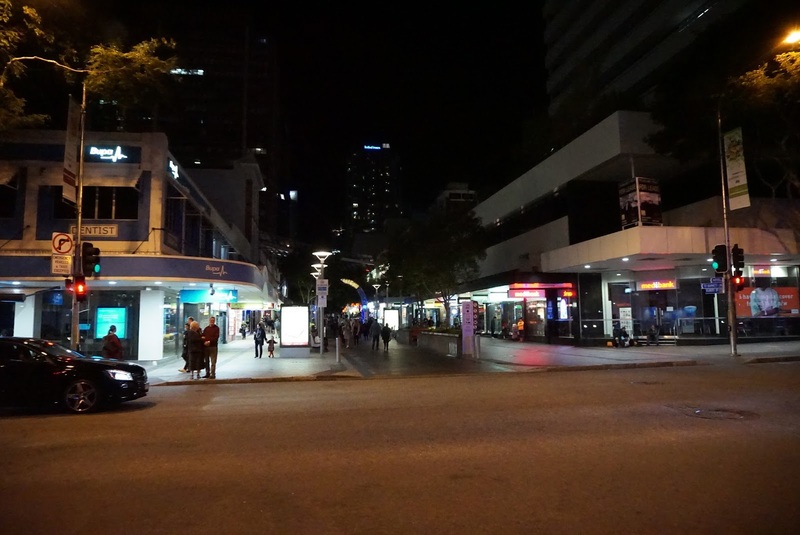 As the night is still young, we decided to head to Cavil Ave for a stroll. 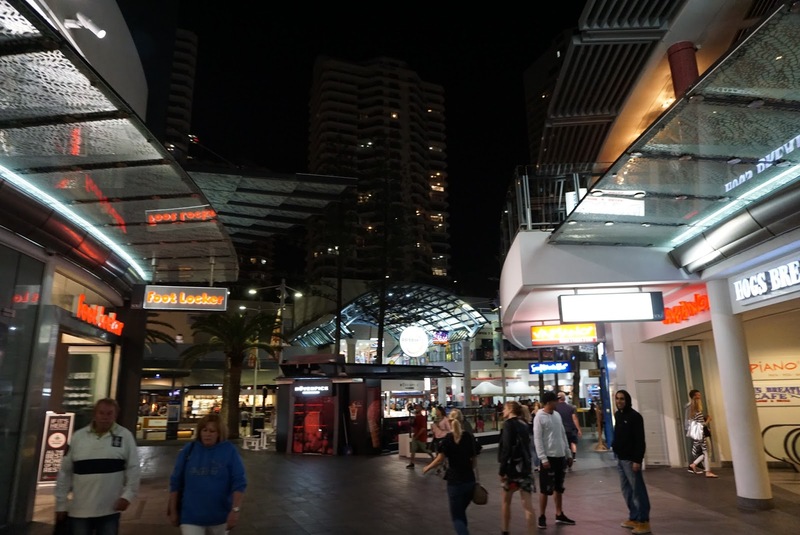 Cavil Ave is the heart of Surfers Paradise lined with numerous shops, supermarkets and tons of eateries. 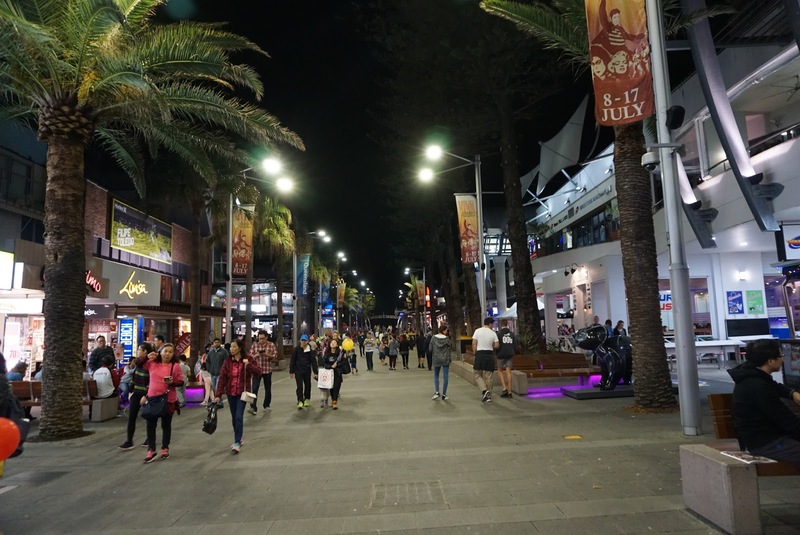 Walking through Cavil Ave will lead one to the beaches of Surfers Paradise. 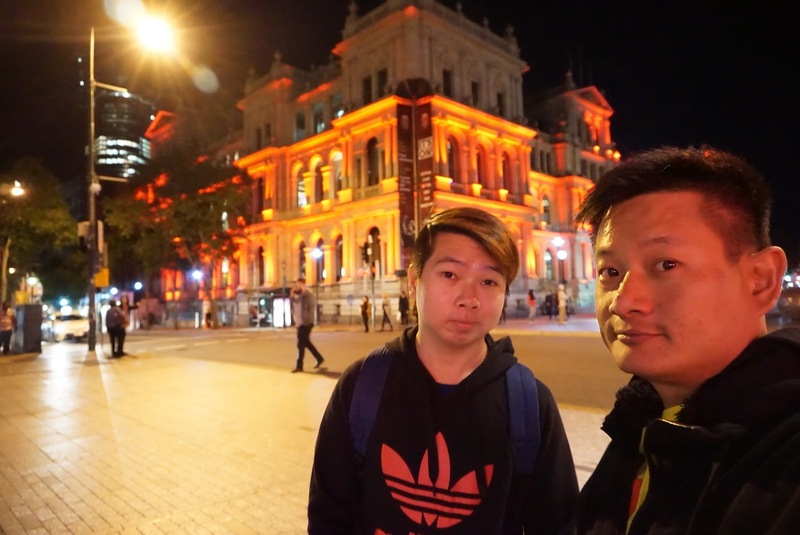 We got dinner before heading back to our apartment to rest for the night. 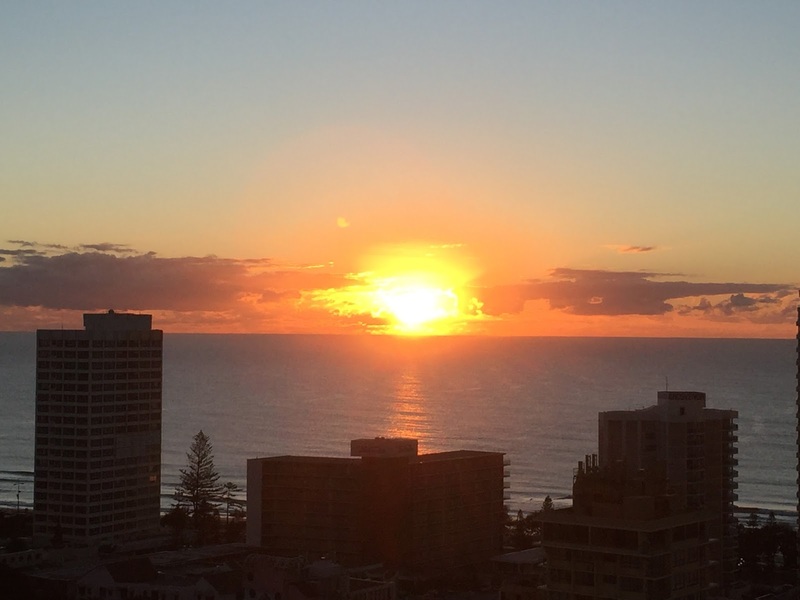 We woke up early today to catch the sunrise over the ocean from the balcony of our apartment. 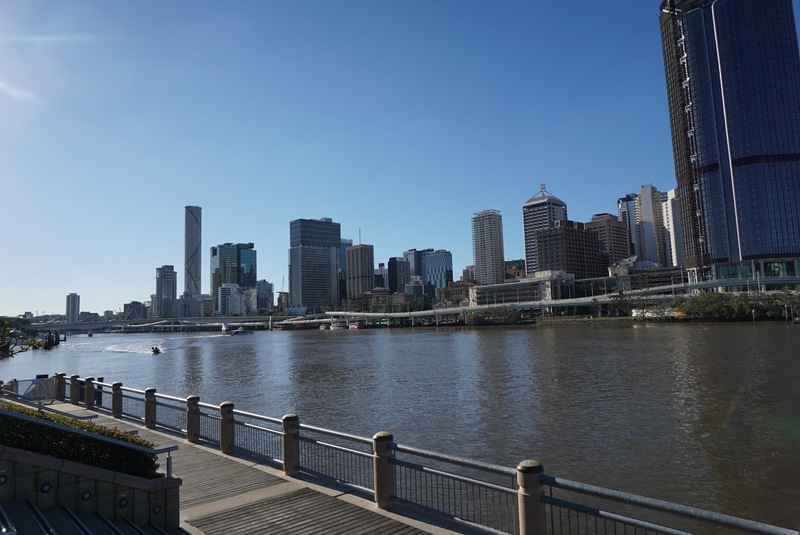 Our plan today is to visit Brisbane, the capital city of Queensland on a Sunday for a few reasons. 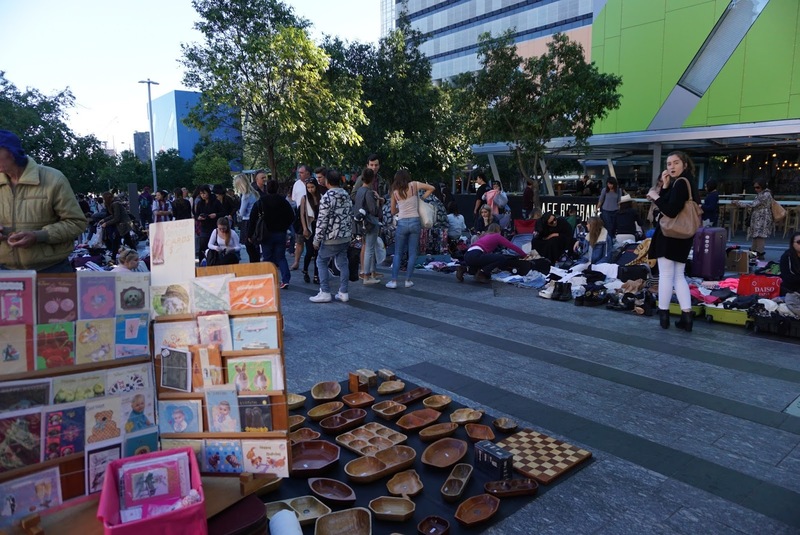 There are lesser traffic in the city and the parking is generally cheaper on weekends, as well as the presence of weekend markets. 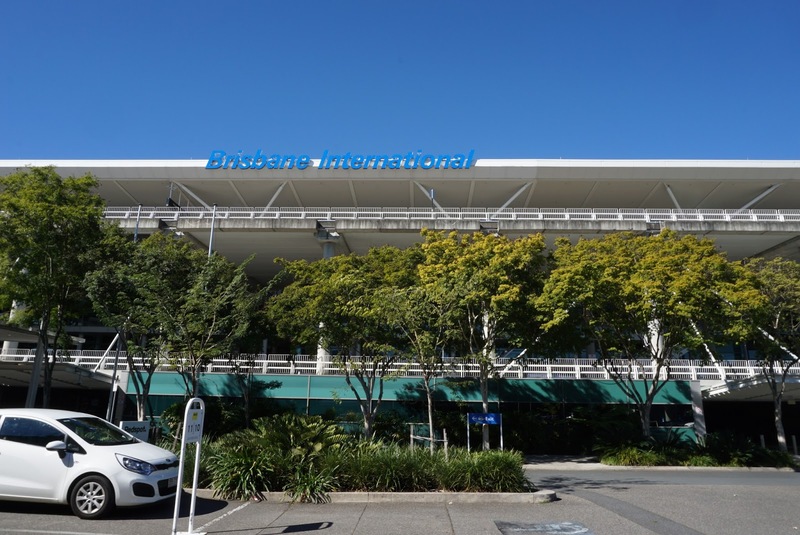 Brisbane is an hour drive away from Gold Coast on M1 motorway. For those without GPS, the signs are very well marked along the way. 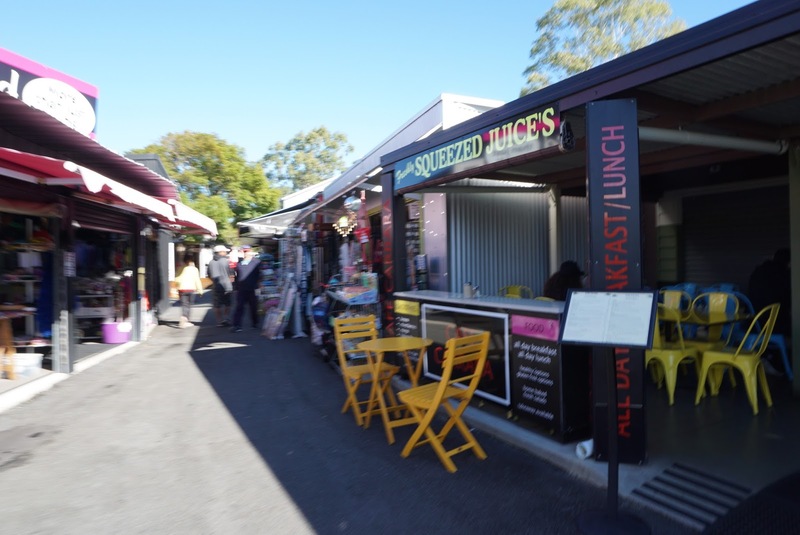 We stopped by one of the largest weekend market in Gold Coast, Carrara market prior to heading towards Brisbane. 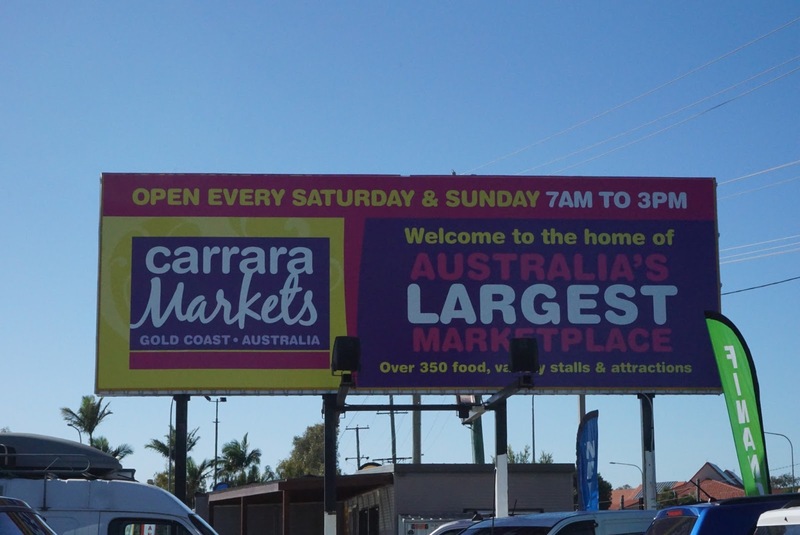 Carrara market is a mere 10 mins drive from our apartment in Surfers Paradise. 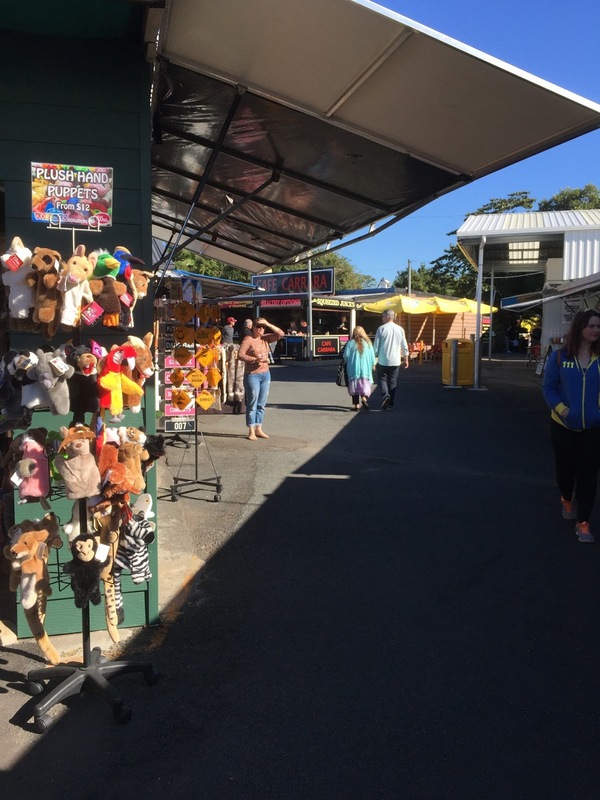 The market has over 400 stores covering a 10 acre space. 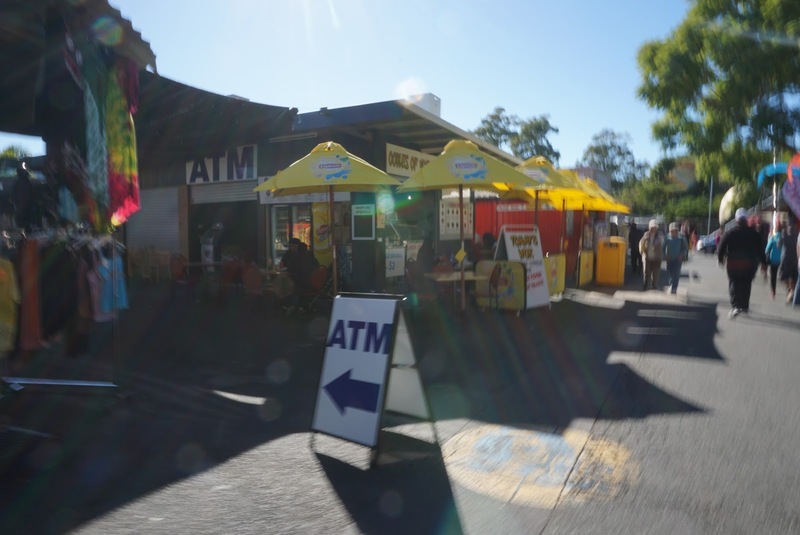 My first impression of Carrara Market is that it is a weekend market visited mostly by locals. There are hardly any tourists around (we might be the only ones). 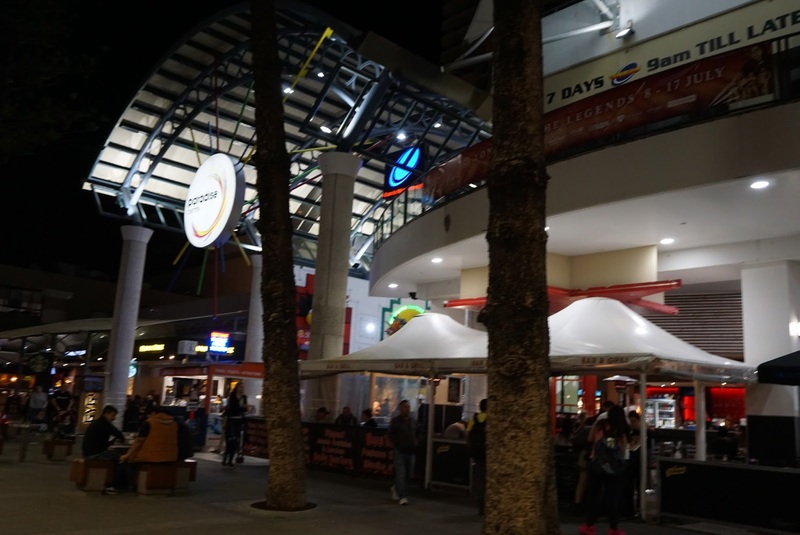 From the carpark, we headed to the outdoor section of the market. 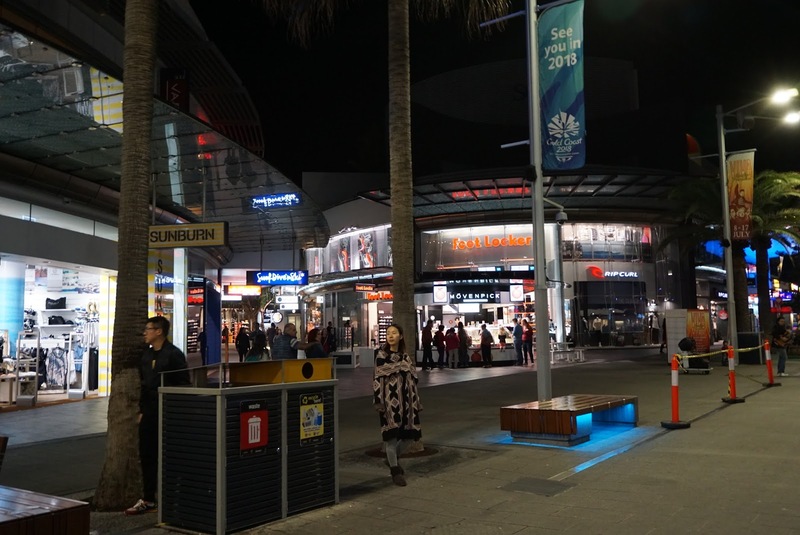 This area sells mostly clothings, fashion wears and souvenirs. 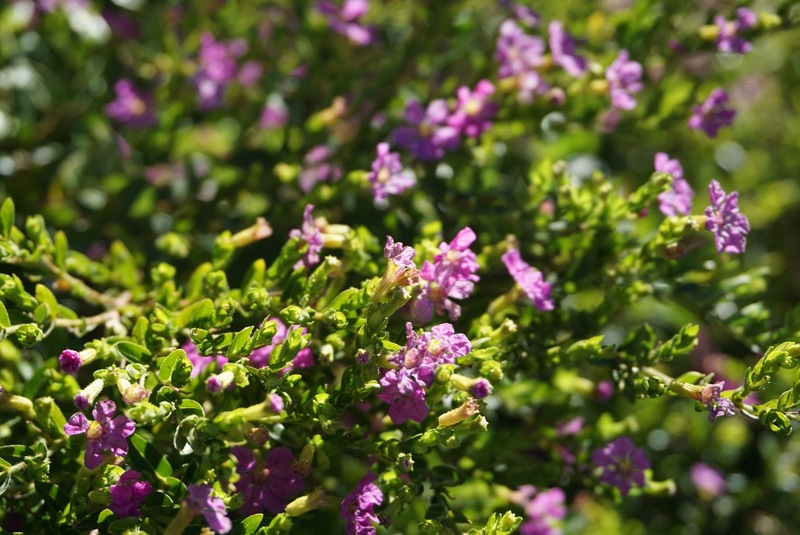 The price of the good here are generally cheaper than what we have seen elsewhere. 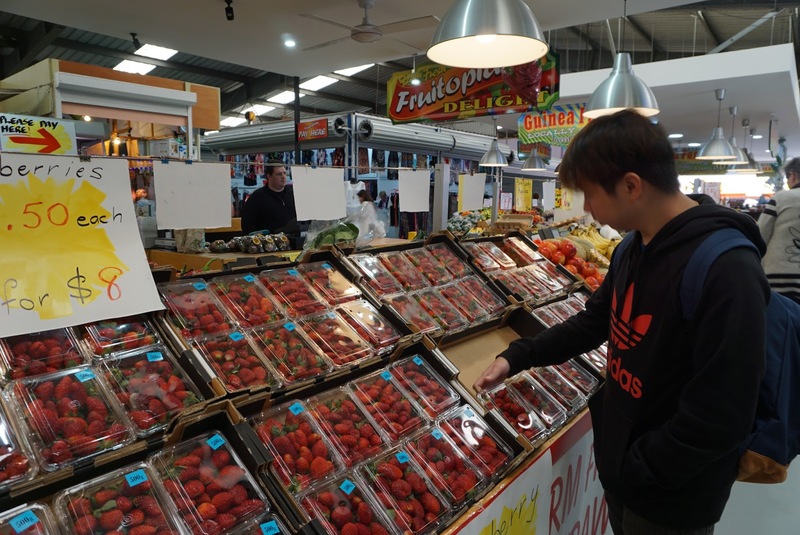 Walking amongst the maze of stores in a somewhat disorganised manner (perhaps we have yet to get our orientations at the time we arrived at the market), we browsed from store to store to see what is sold in this market. 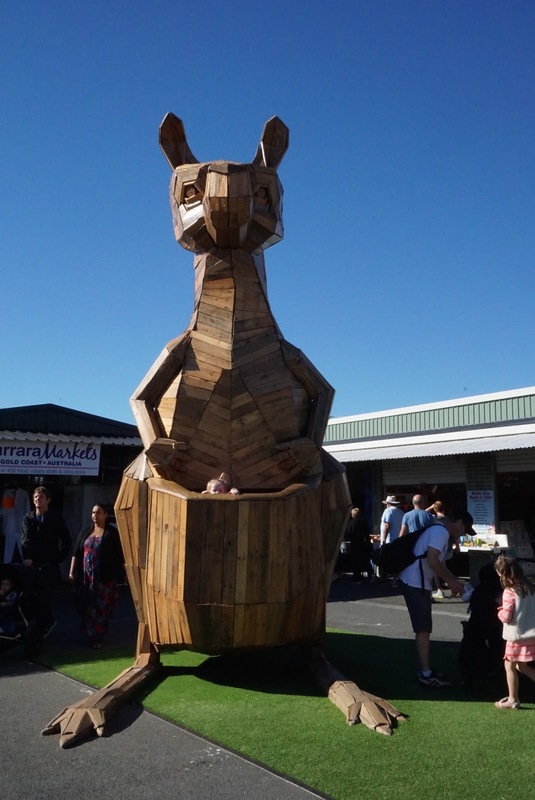 Amongst these stores, there lies a huge wooden kangaroo which visitors can climb into its pouch for a photo. 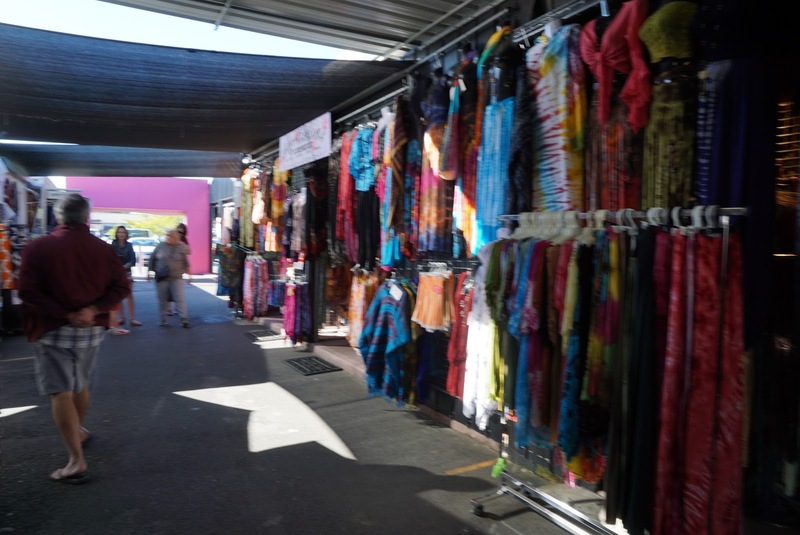 As we strolled in Carrara Market, we hit the indoor portion of the market. 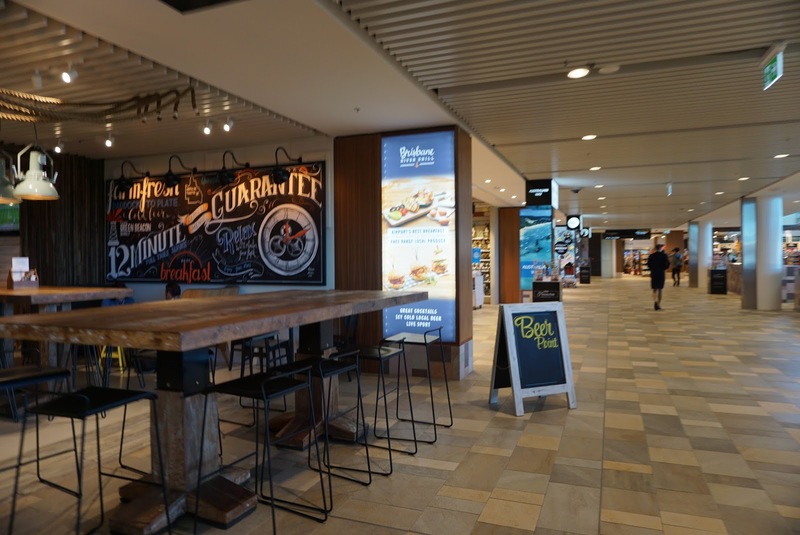 The indoor stores sells mostly fresh local farm produce, ranging from fruits to vegetables to meats. 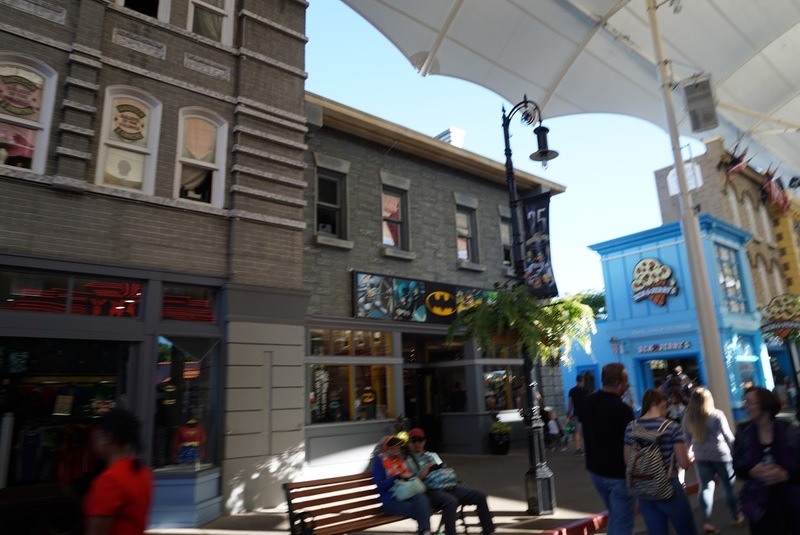 There are also some stores selling novelty items and more clothing stores in the indoor section. 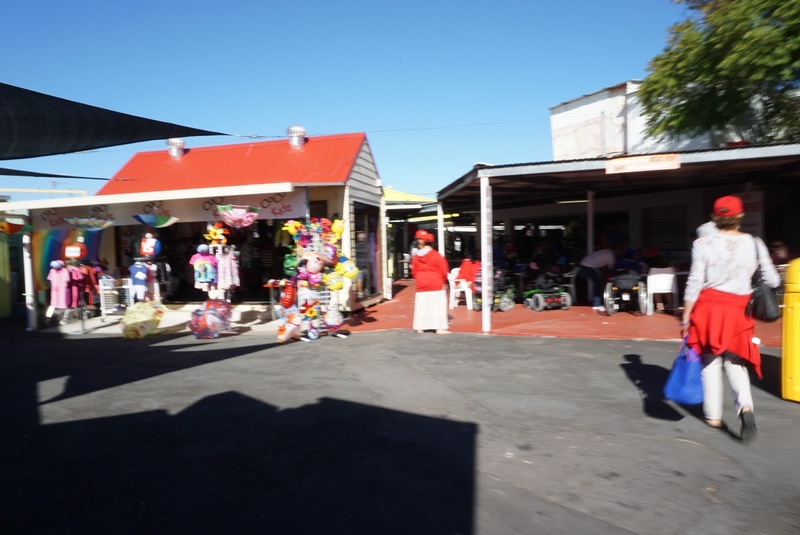 Emerging from the indoor section of the market, we crossed a bridge and found more outdoor stores selling clothing and a couple of food stores. 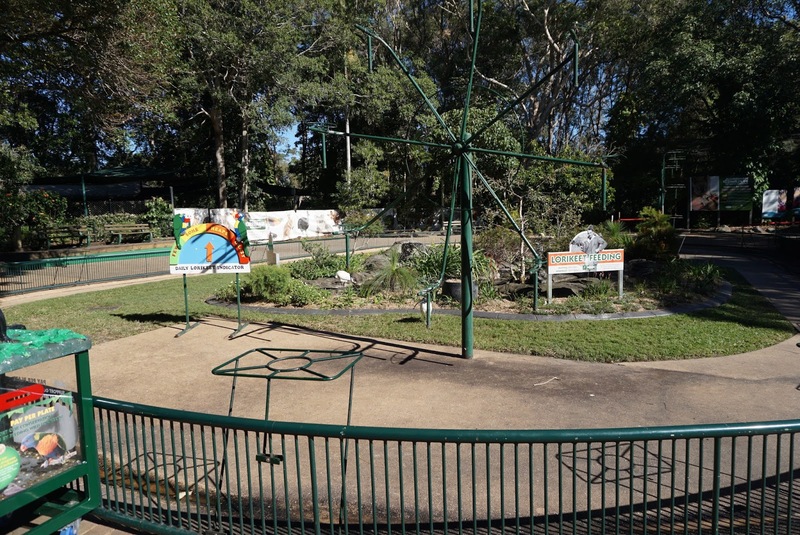 There is also a small children playground here. 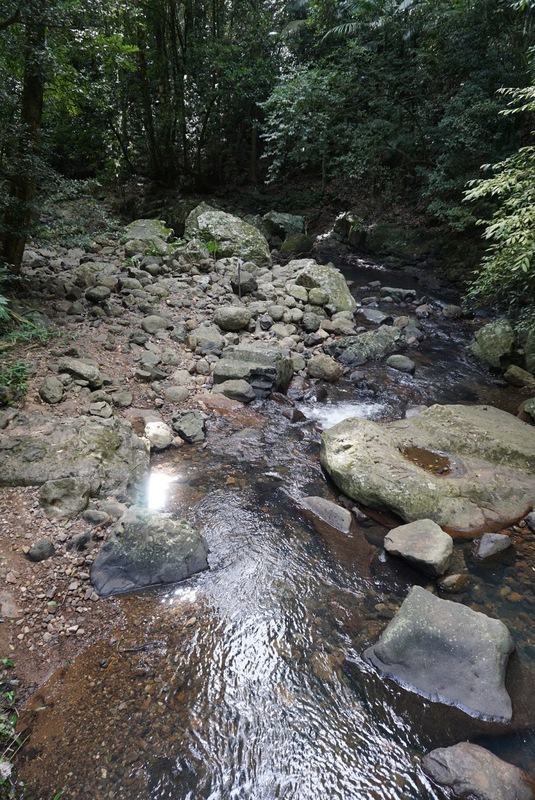 We headed back from where we came from via another bridge, where we saw some sort of a reptile exhibits. 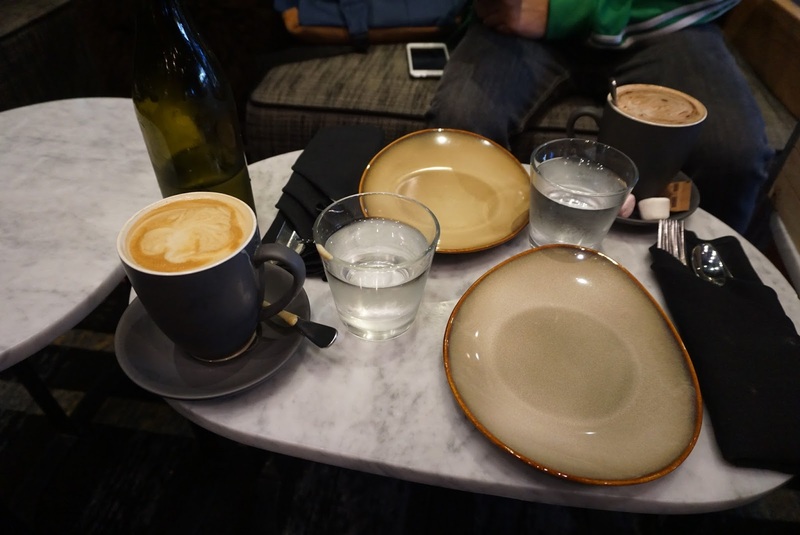 My friend and I headed to one of the cafes for breakfast. 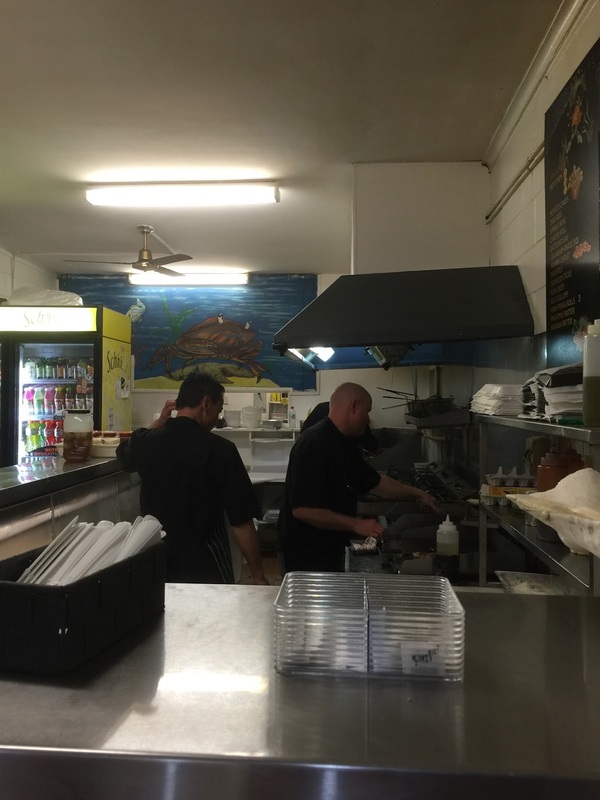 The food here is tasty and service is excellent. 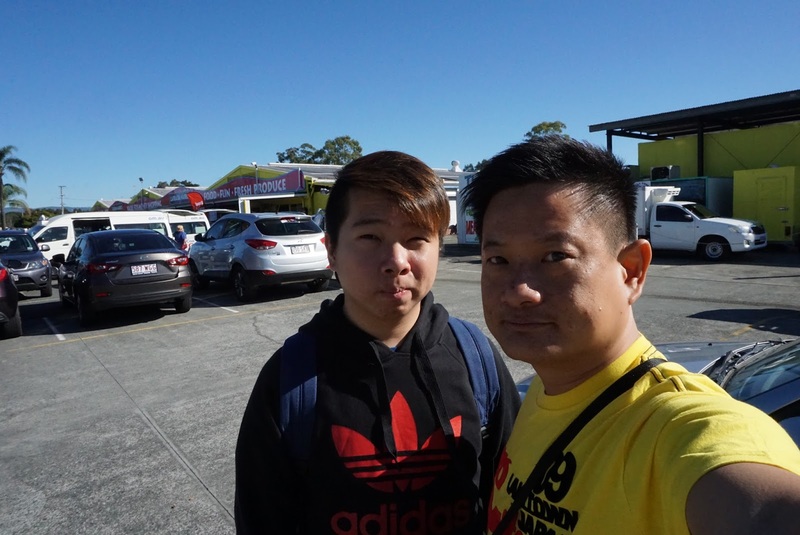 After having breakfast, we decided that we had seen most of the stores, thus continuing our journey towards Brisbane. 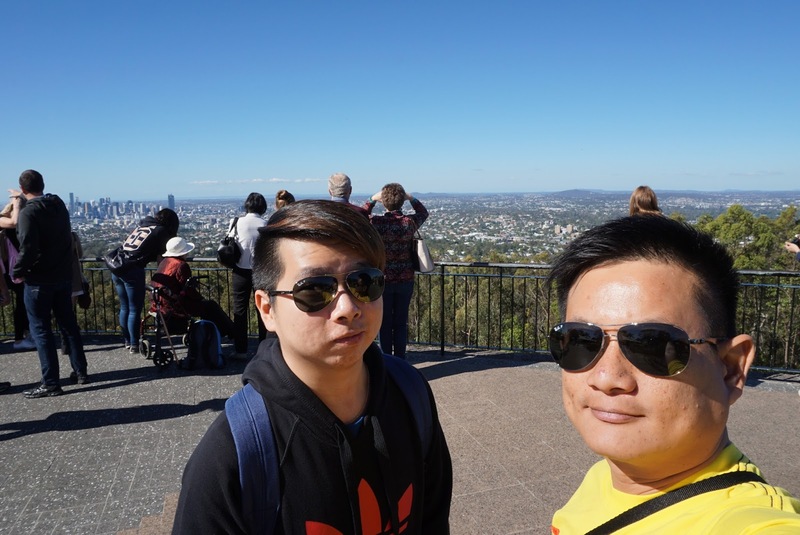 Instead to heading directly to Queen Street Mall, we pass through Brisbane and headed to Mt Coot-Tha lookout. 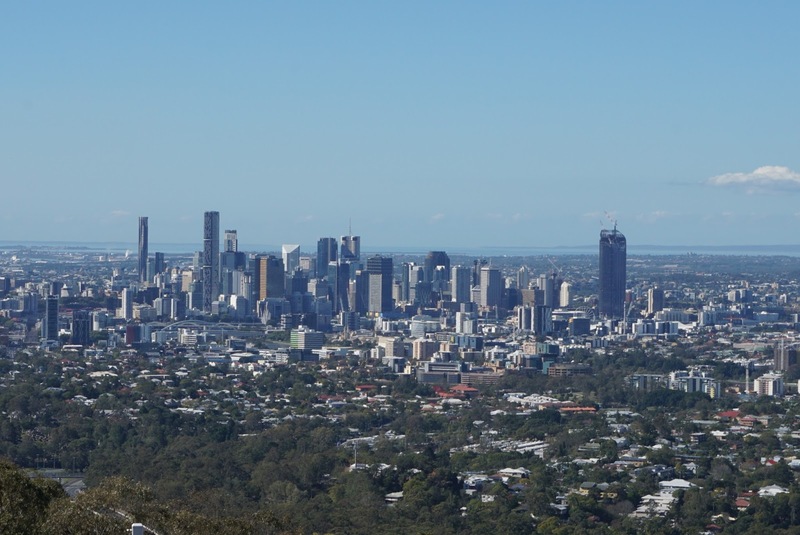 Prior to this trip, I read that Mt Coot-Tha offers a view of the entire Brisbane and Greater Brisbane. Following the signs along the way, we drove to the lookout. 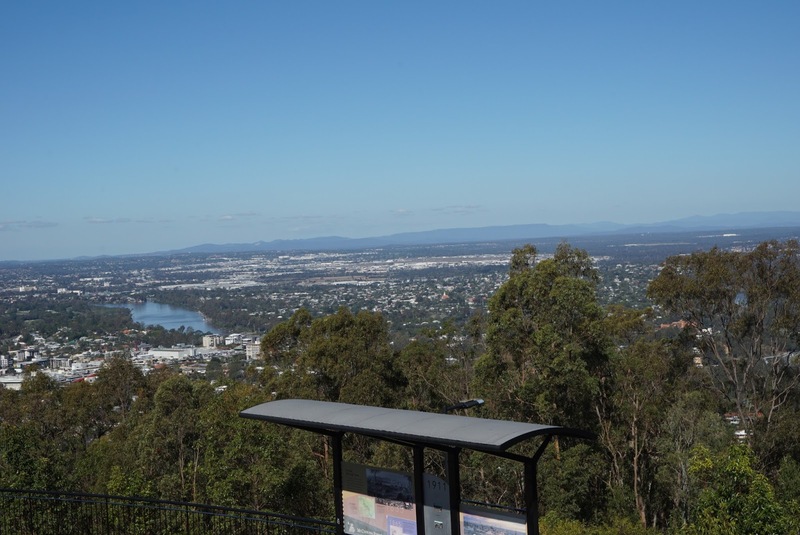 The Mt Coot-Tha lookout is a mere 2 mins walk from the nearby carpark. 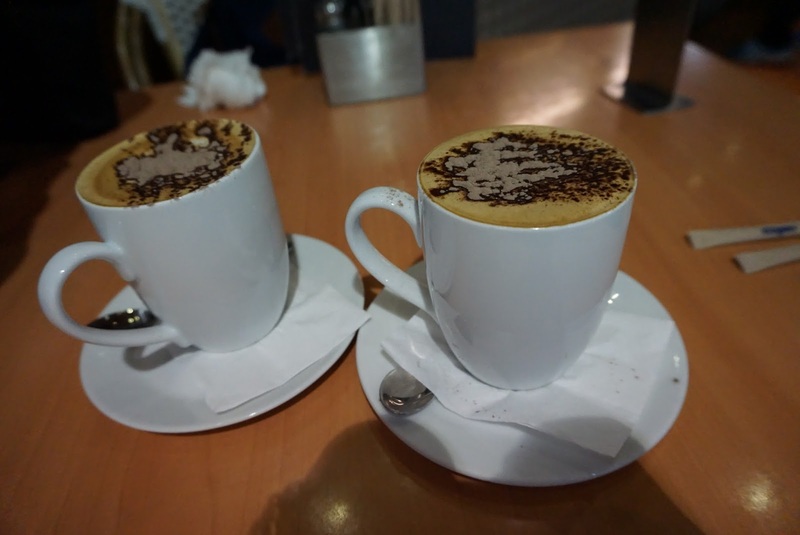 At the lookout, we passed by several cafes. 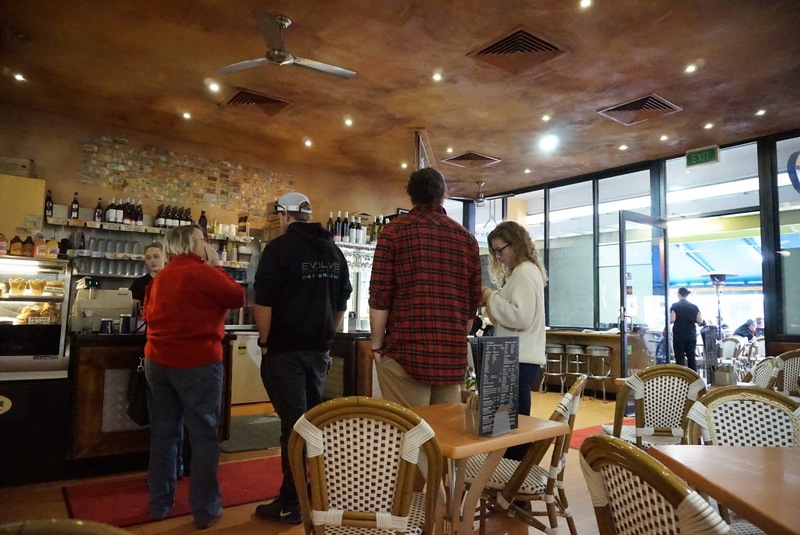 As it is a weekend, there are a lot of locals coming here to enjoy a cup of coffee, catching up with their friends. 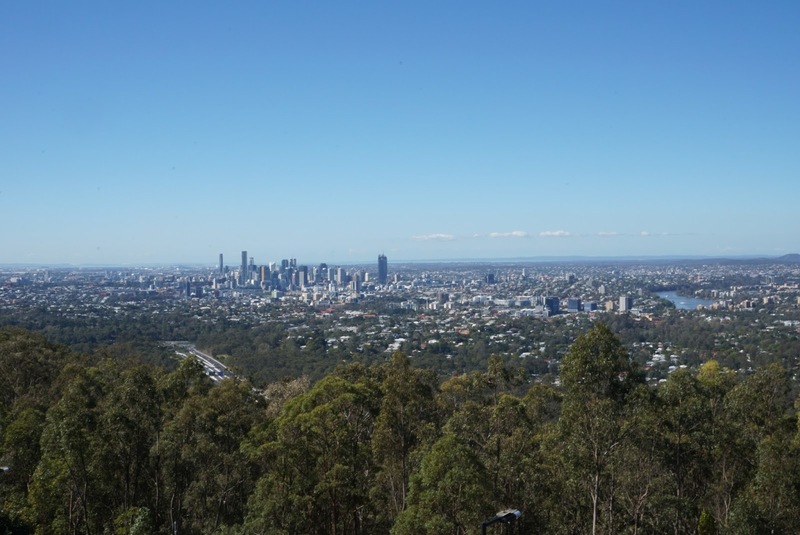 From the lookout, we could see the whole of Brisbane city and the suburbs surrounding the city, as well as Brisbane River snaking through the city. 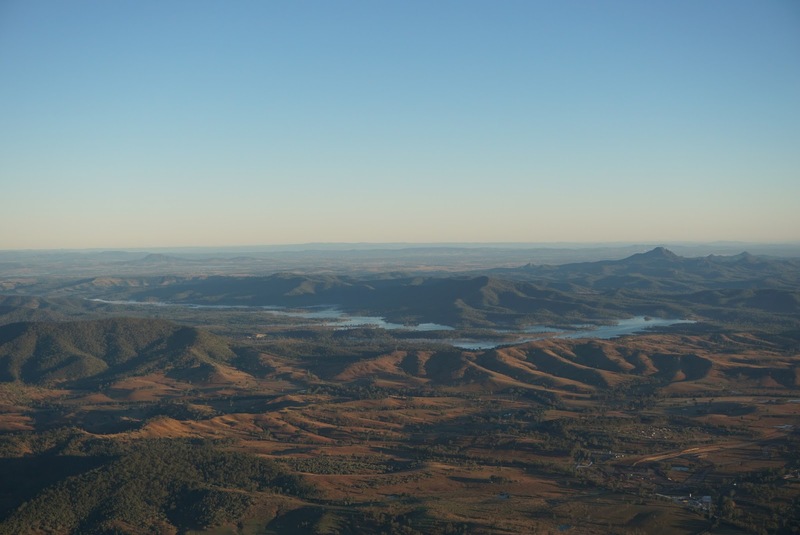 Afar, the mountain ranges can be seen, forming the backdrop to the city. 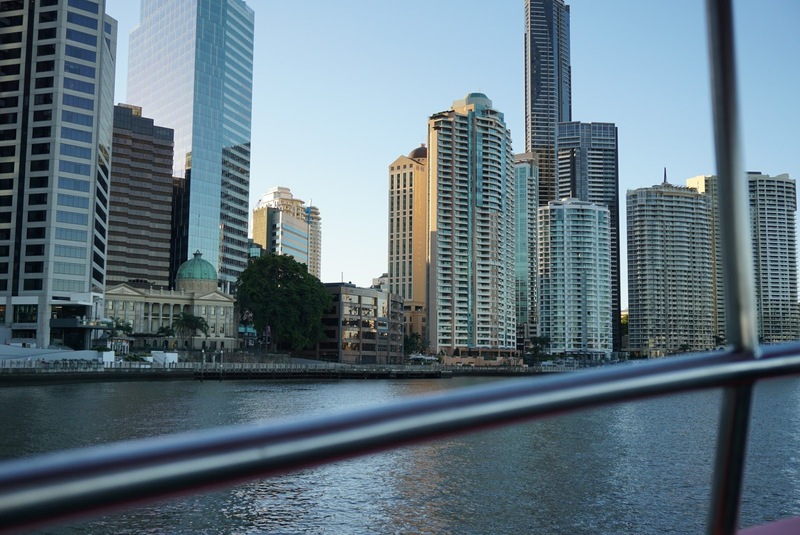 The view here is breathtaking, not only one can see the city itself, one can also see the nature from the lookout. 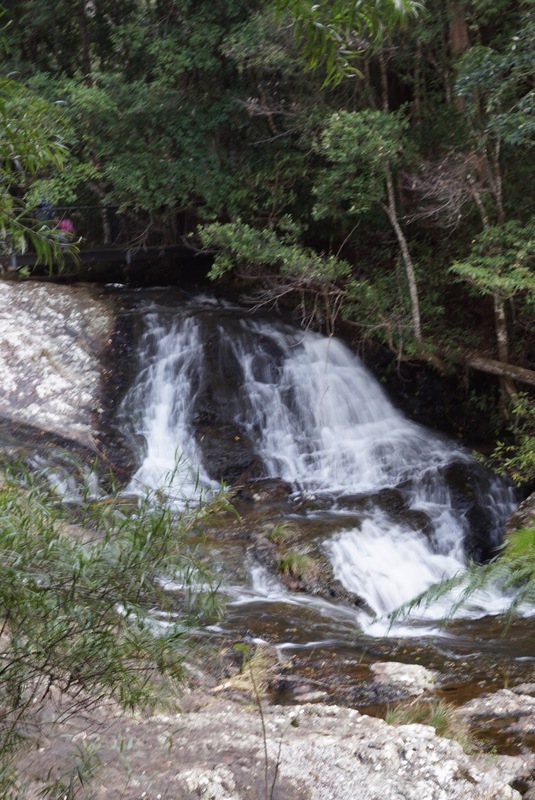 As we were driving down towards Brisbane, we came across a sign that points to JC Slaughter Falls. 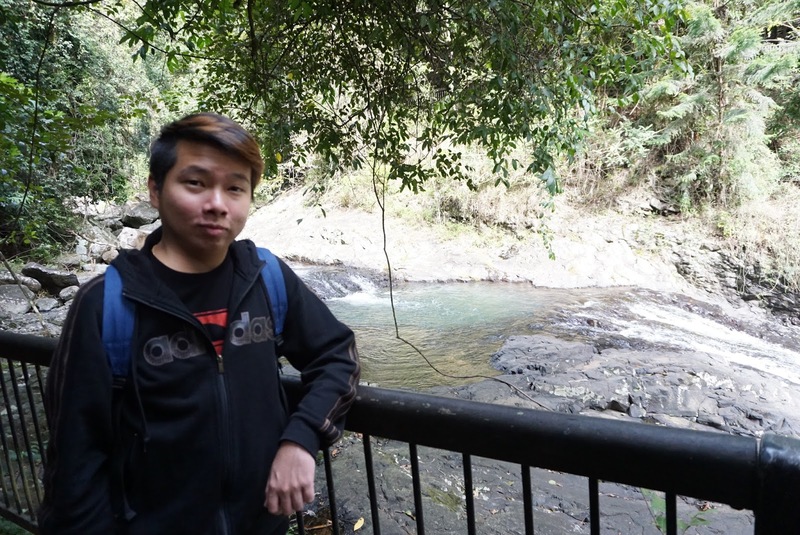 I thought it might be interesting to see a waterfall here and decided to stop by the waterfall. 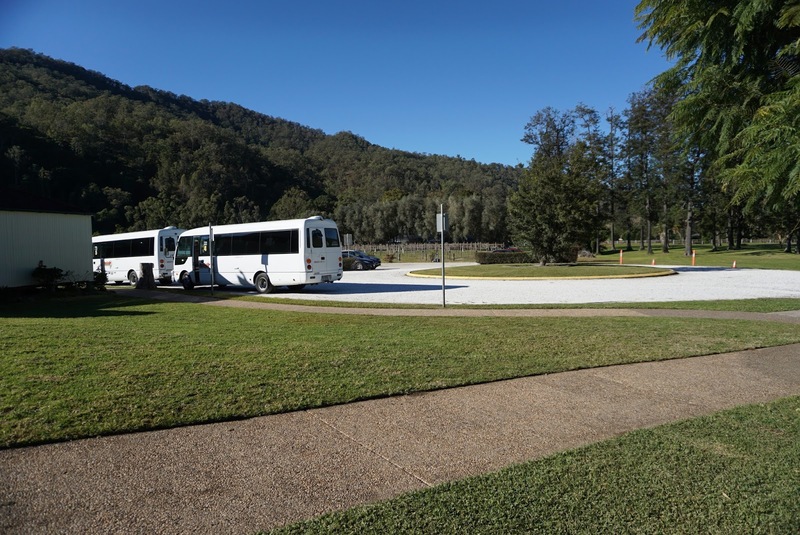 We parked our car at one of the parking areas for the picnic area. 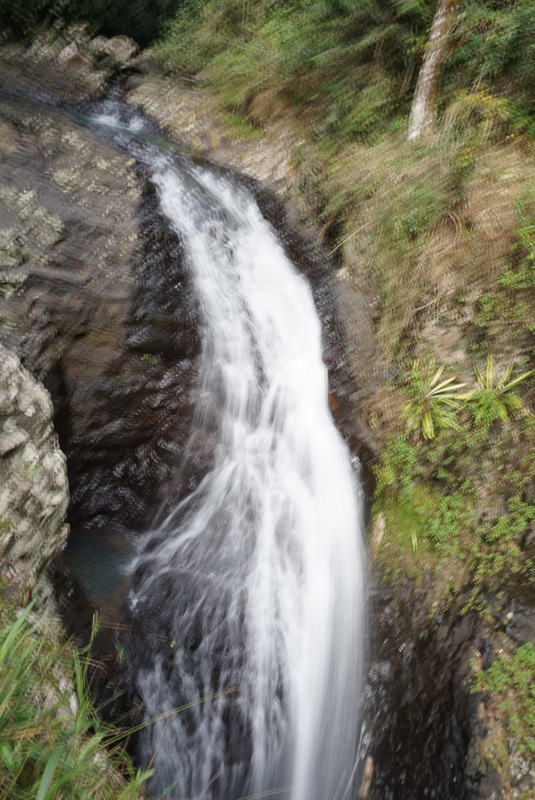 As we were walking along the track, we came across a sign that points to the location of the waterfall. 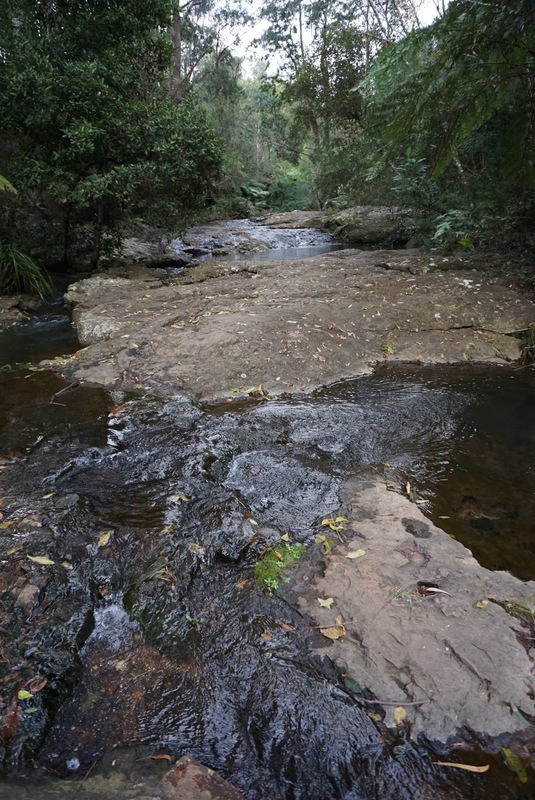 The sign indicated that JC Slaughter Falls is 550m from the carpark, we thought it would be a short walk from the carpark to the waterfall. 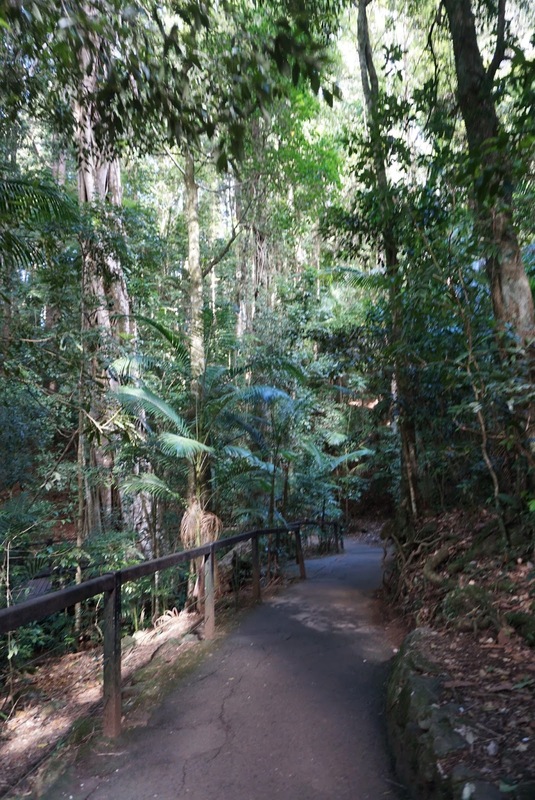 Walking amongst the trees towards the waterfall is rather peaceful, as though we are walking in the forest of one of the national parks in Australia. 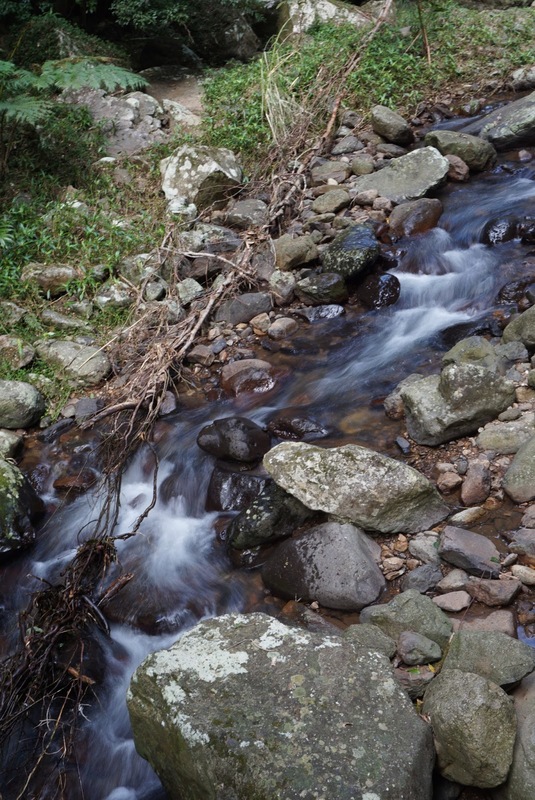 Along the way we saw a stream that looked almost dried up. 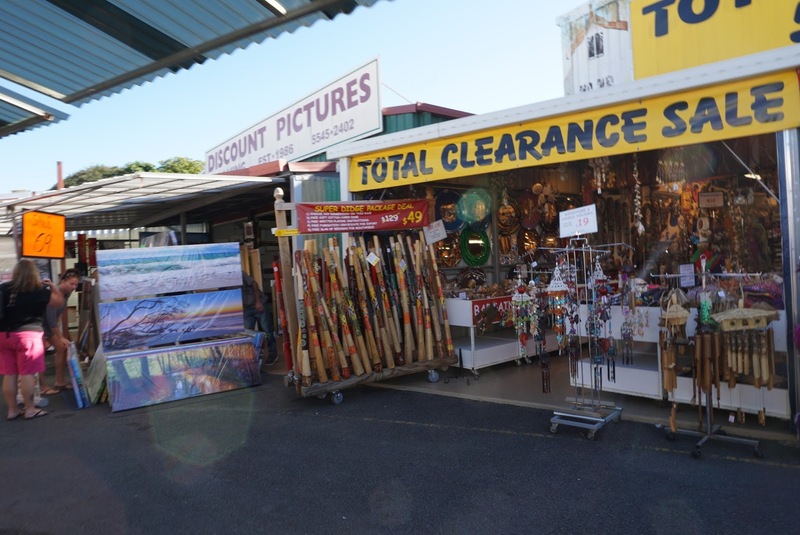 We ended up in a wooden platform area with a sign that indicates Aboriginal Art Gallery. 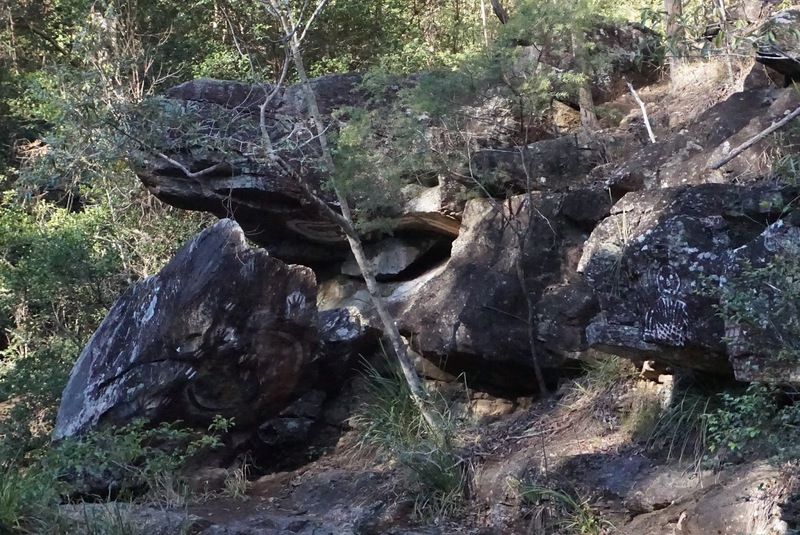 From the platform, I initially did not see any aborigine art but a bunch of boulders and a stream with very little water flowing through. My friend pointed out to a snake painting underneath the boulder. 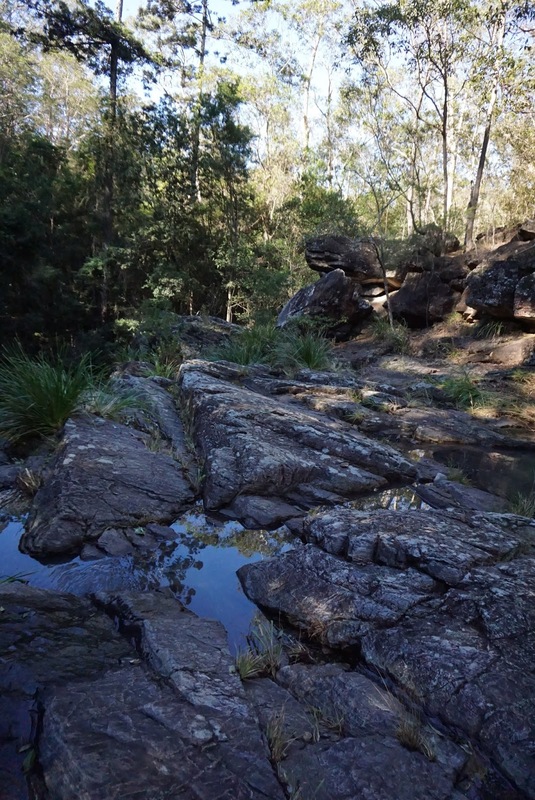 This is when we went off track (it is very safe to walk on these rocks) and walked amongst the rocks towards the snake painting. 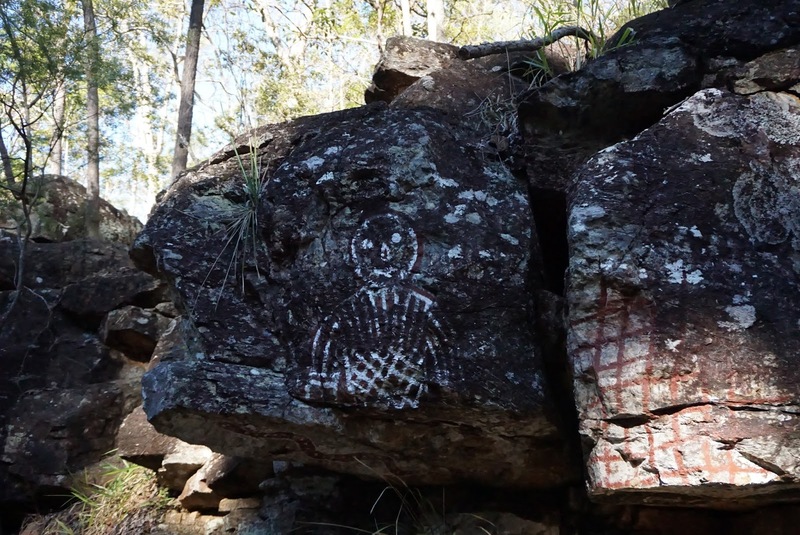 Up close, we can see a rock with paintings of hand and another which had a human painted on it. 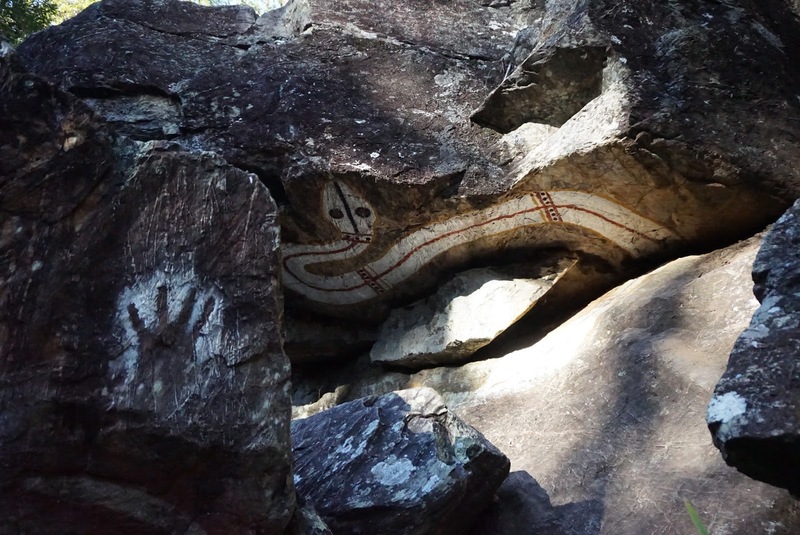 The large white snake was painted on two rocks. The paintings looked amazing to have survived in here for a long period of time. 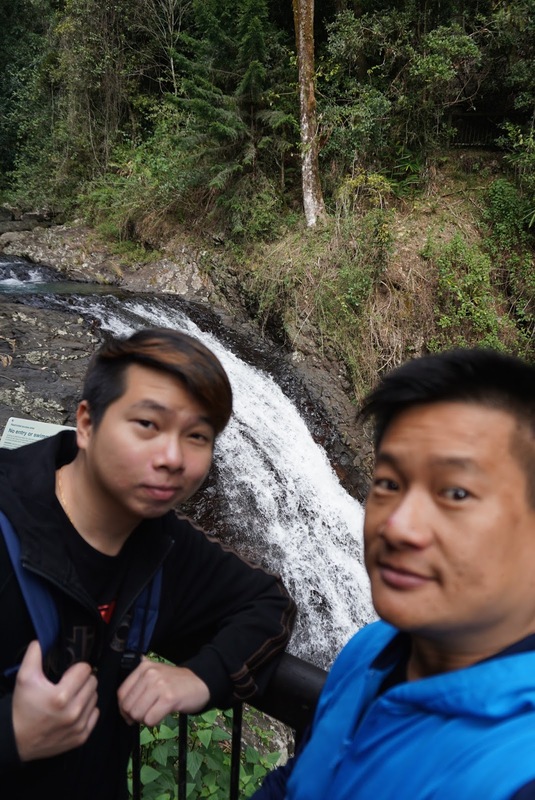 After taking some pictures, we wanted to head towards JC Slaughter Falls, however when I saw the river that has hardly any water flowing through, I told my friend we might not see any waterfall. 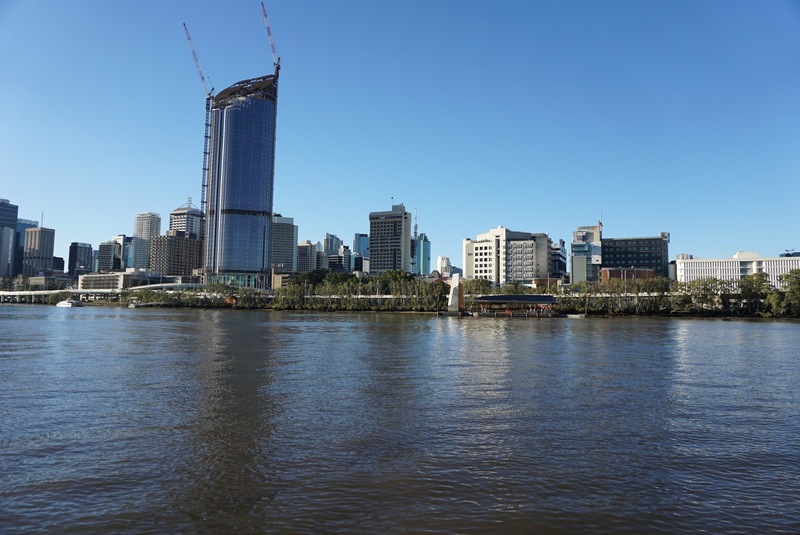 Hence we headed back to the carpark and drive towards Brisbane City. 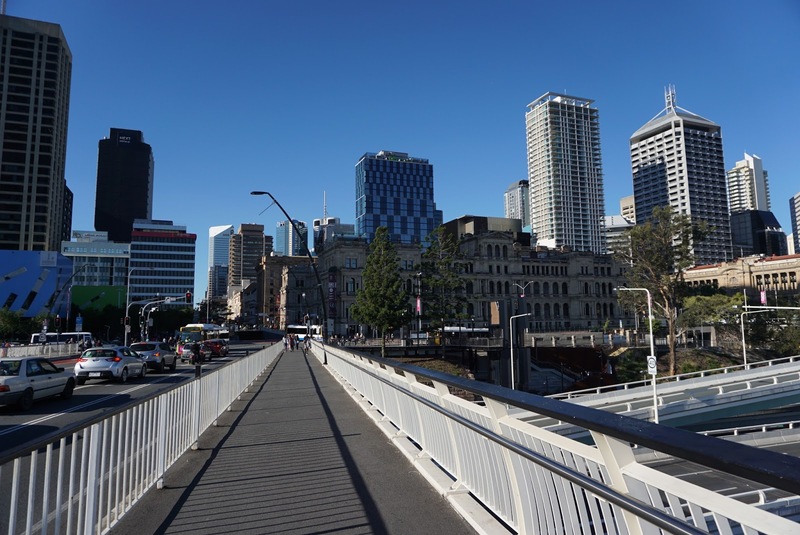 Like most Australian Capital cities, Brisbane is very easy to navigate especially on foot. 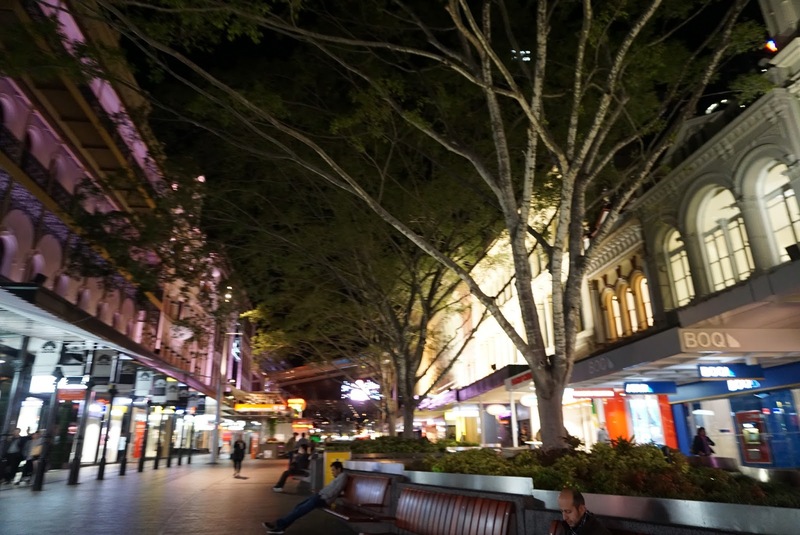 The city is organised in a grid pattern with Queen Street Mall being in the heart of the city. 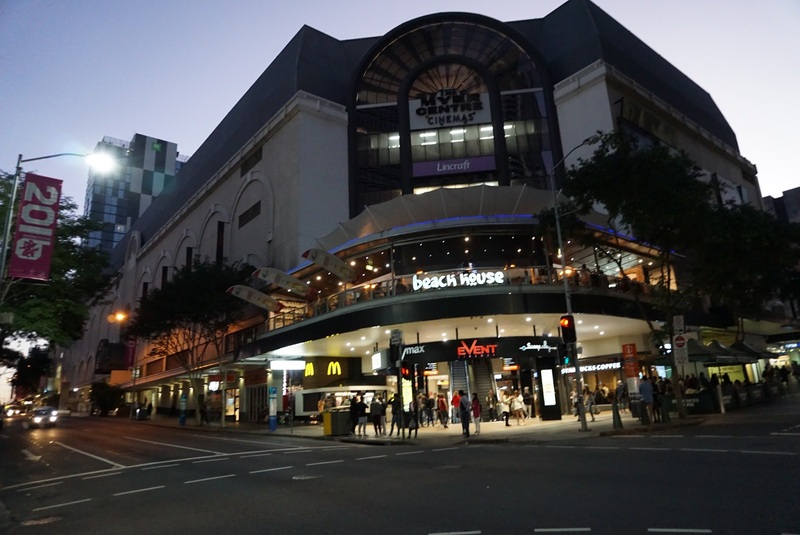 One very prominent building is the Myer Centre, which is huge departmental store that sells practically about everything. 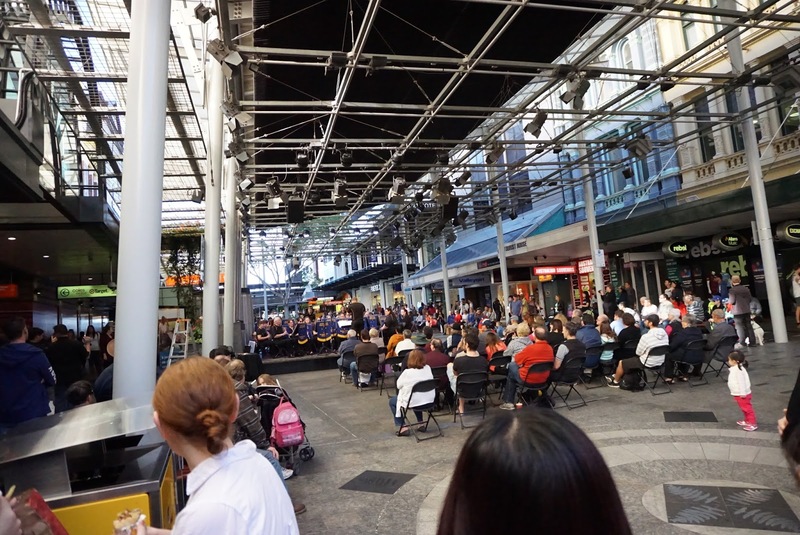 We parked our car at Myer Centre (A$10 per entry on weekends as of the writing of this blog) and made it around Brisbane on foot. 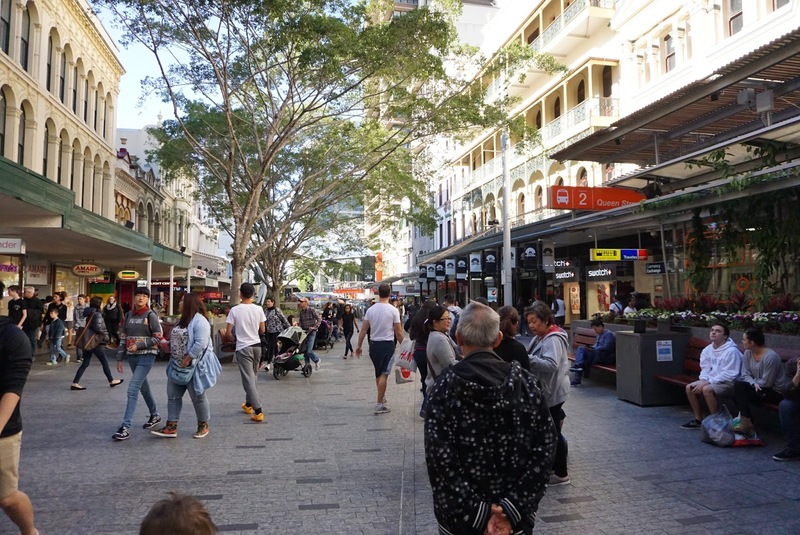 On Queen Street Mall and around Myer Centre, there are no lack of shops that would satisfy the shopaholic in us. 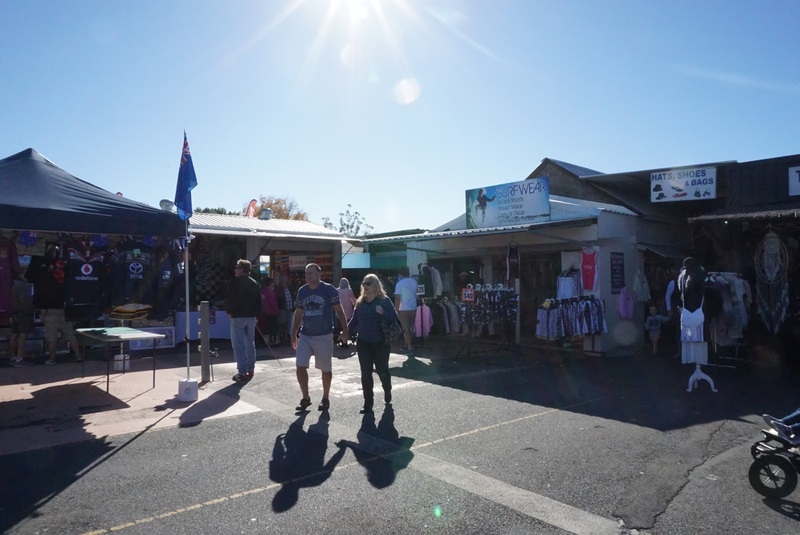 There is also a shop selling souvenir round the corner for those of us who wanted to bring a piece of Australia back to our home country. 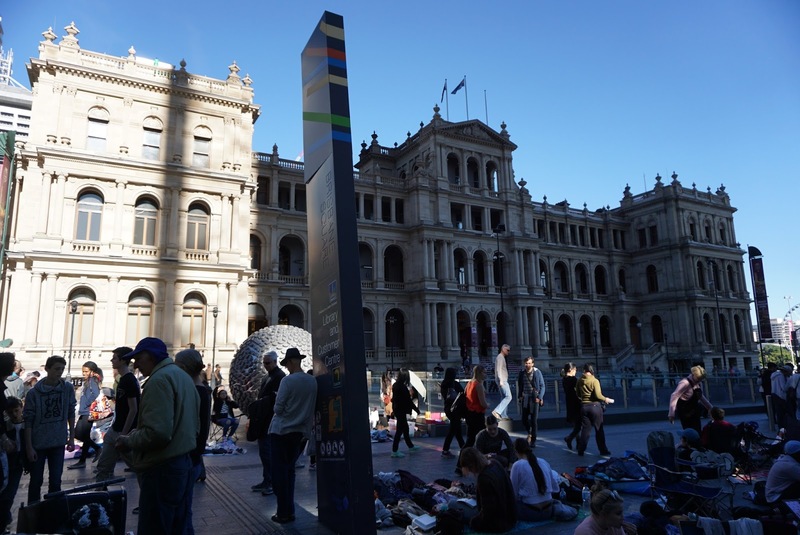 Head South from Myer Centre, across a road one would end up in front of Treasury Building. 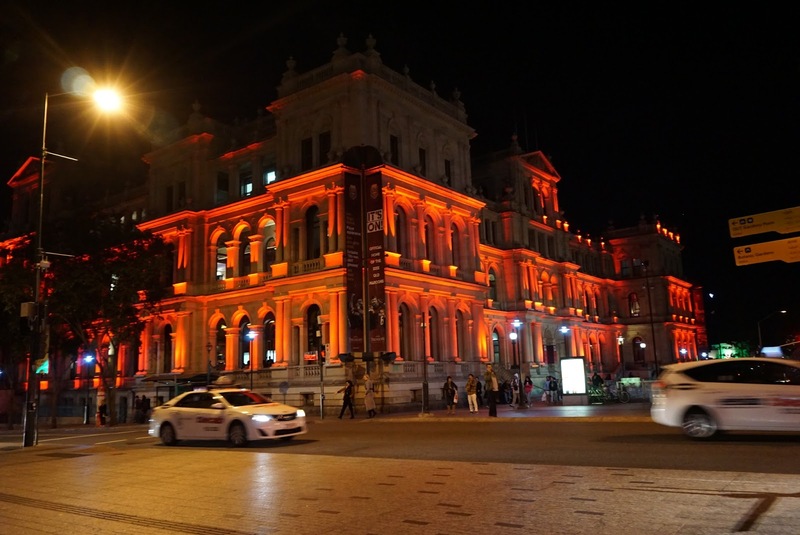 This classical 19th century Italian Renaissance styled sandstone building, formerly housed several government offices and currently is occupied by a Casino. 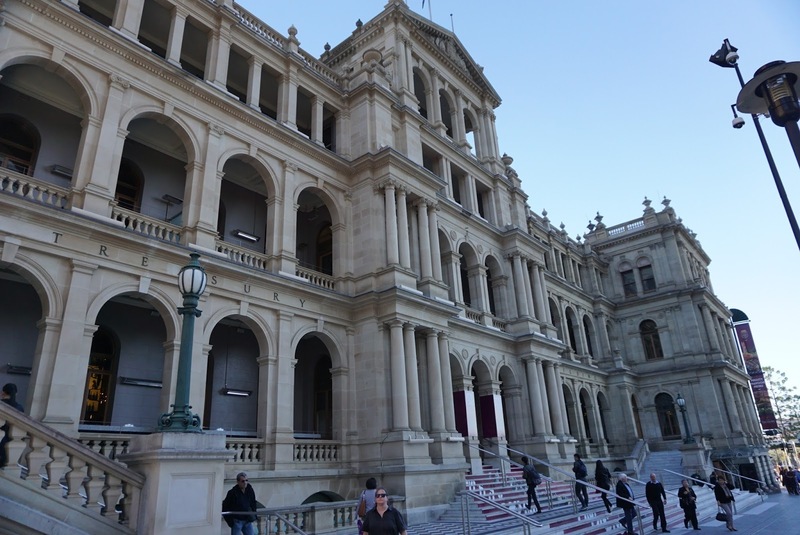 If one has a chance to enter the casino, most of the interior of the building is still well preserved. 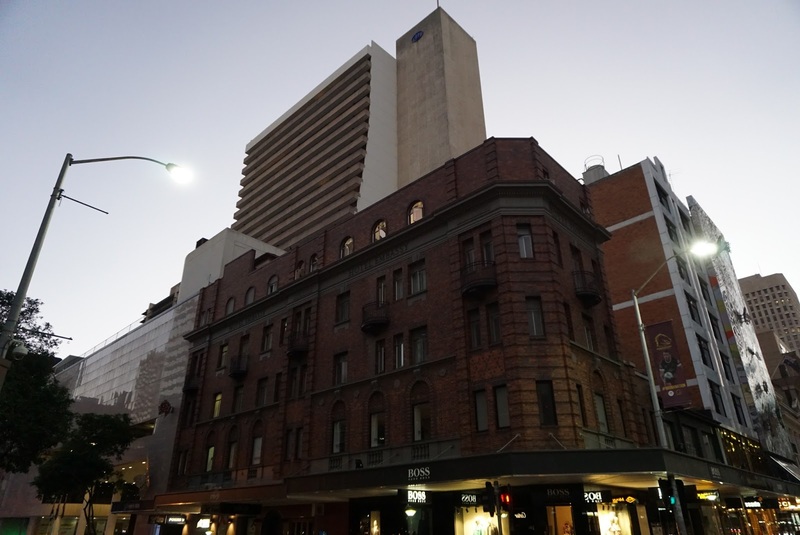 Windows that stacked up to three storeys are still visible, it seem that the casino is planned without damaging the original architecture of the building. 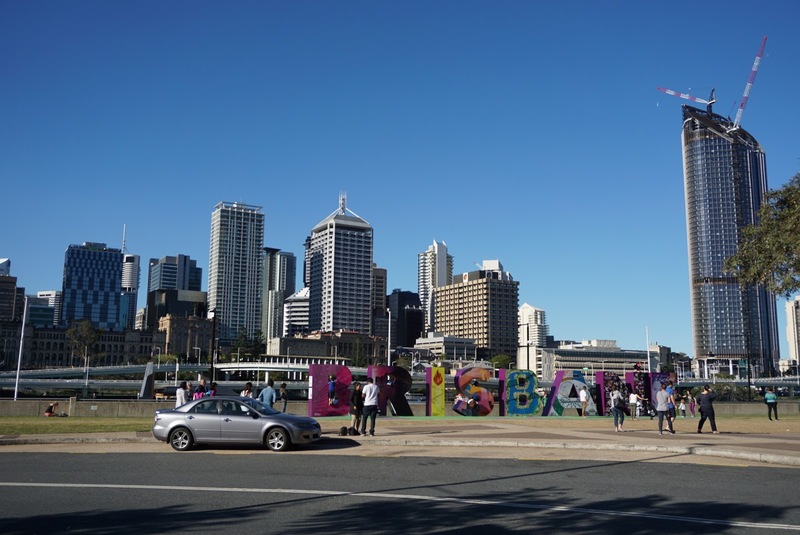 South Bank is the heart of Brisbane’s cultural and lifestyle district and a great place to hangout especially during weekends. 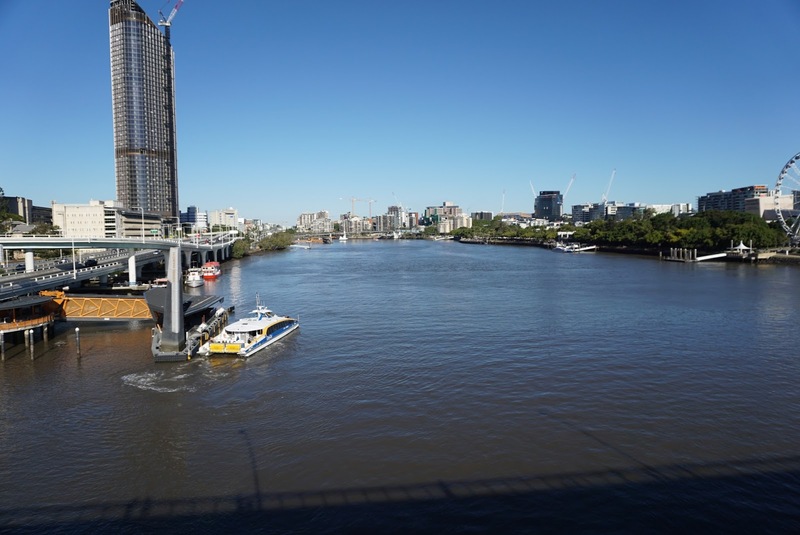 My friend and I walked across the Victoria Bridge to get to South Bank from Treasury Building. 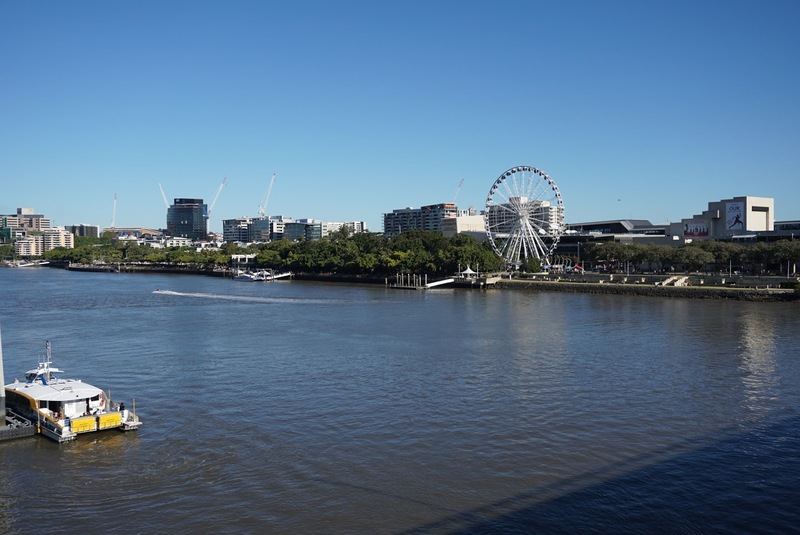 The landmark that is clearly visible once we are in South Bank is the Wheel of Brisbane, a 60m observation wheel that offers guests a panoramic view of Brisbane City. 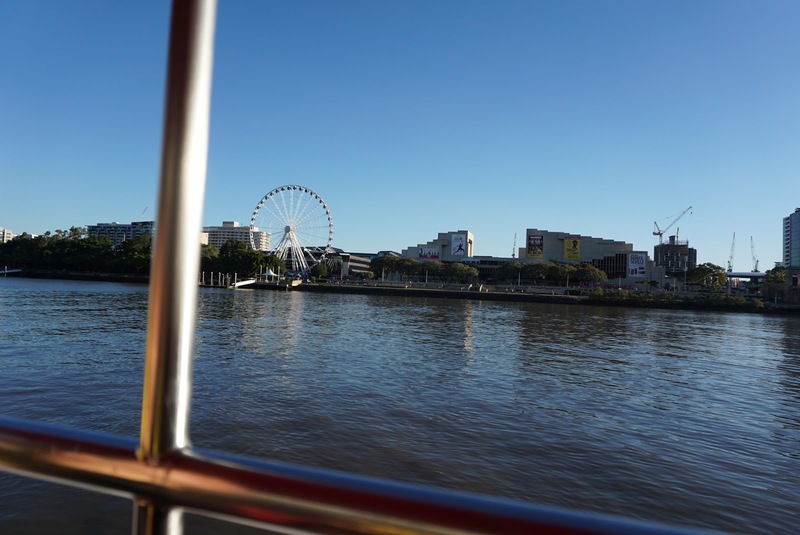 My friend and I skipped taking a ride in the Wheel of Brisbane and opted to stroll towards South Bank Pier 3 where we would catch the City Hopper cruising along Brisbane River. 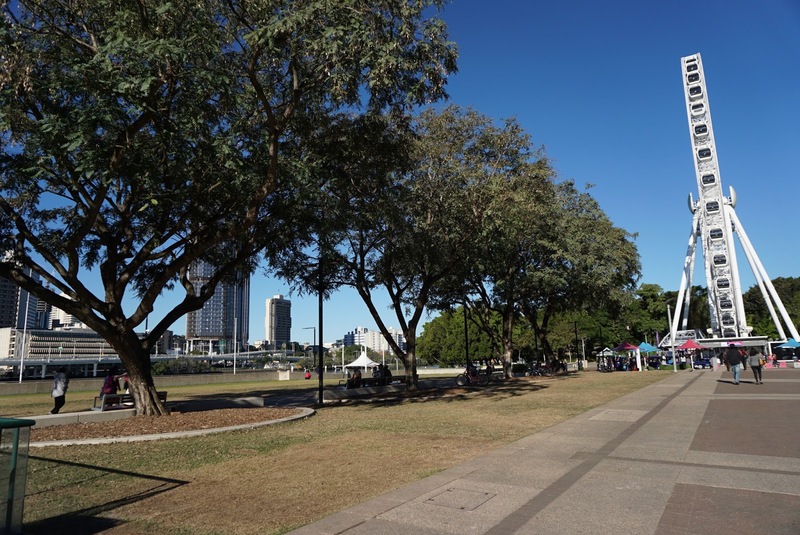 The stroll along South Bank seem like strolling in the park. 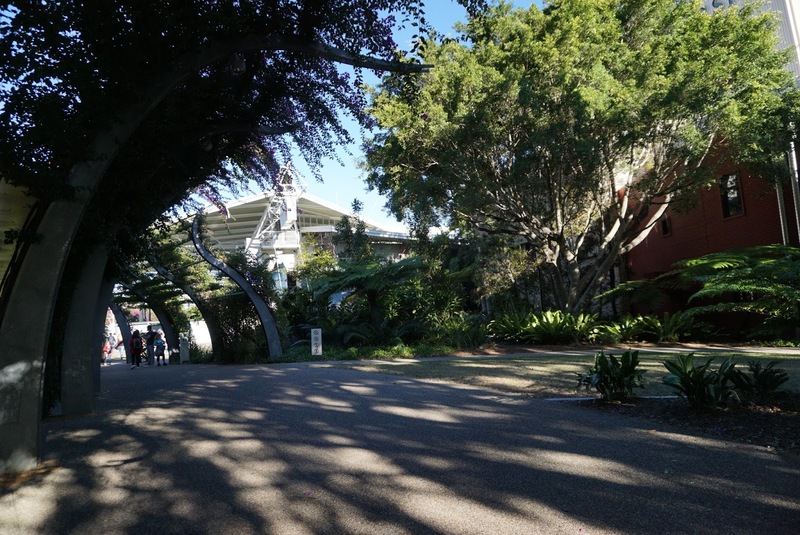 The first part of the walkway is covered with trees and plants intertwining with the buildings creating perfect harmony between nature and buildings. 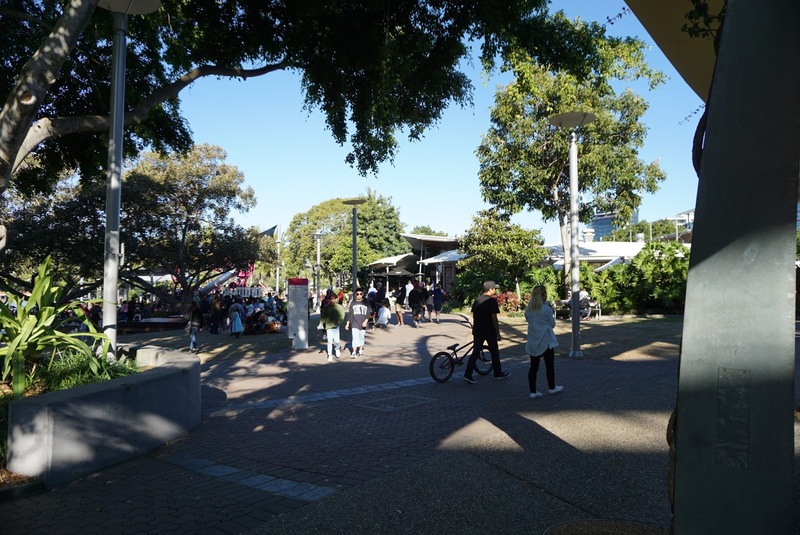 We could see people strolling along the way, with some performing their arts along the way. At the end of the garden portion is a large piazza, which held a snow sledging activity during our time of visit. 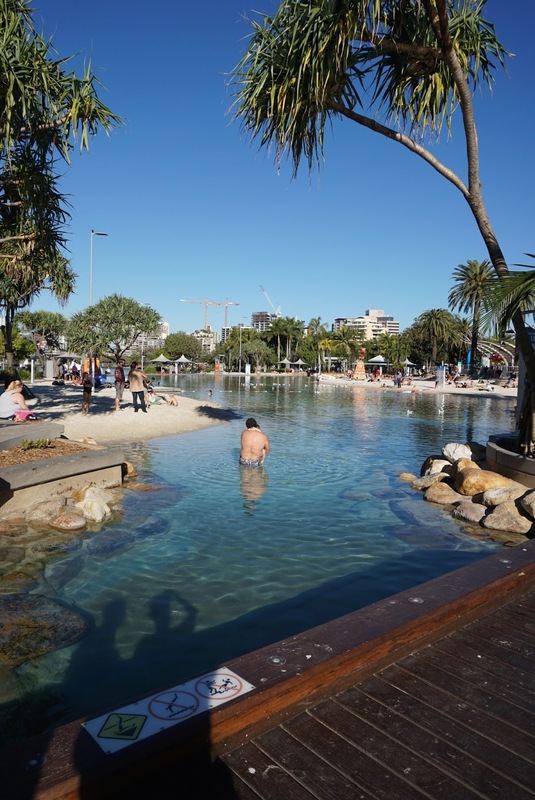 Passing the piazza, we ended up in Streets Beach, a man-made beach in the city. The Streets Beach is a paradise by itself. Ignoring the city landscape, if one were to look on the fine sands on this beach, one would not have known this is man-made. There are trees forming the landscape here and the beach is complete with a lifeguard on duty. Swimming in the man-made beach seem to be free as there did not seem to have any barriers around the beach. 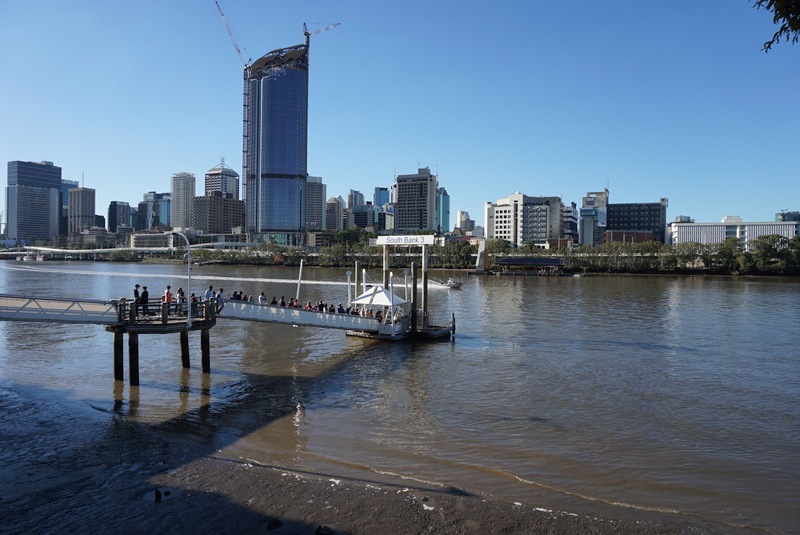 South Bank Pier 3 is a little pass Streets Beach, where my friend and I boarded the City Hopper Ferry to cruise along Brisbane River. 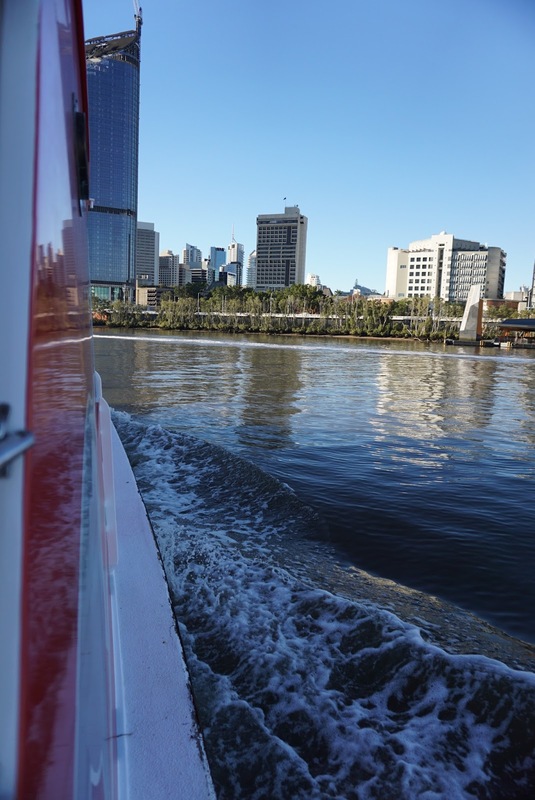 What other way to best see the city than cruising along Brisbane River that runs through the city. 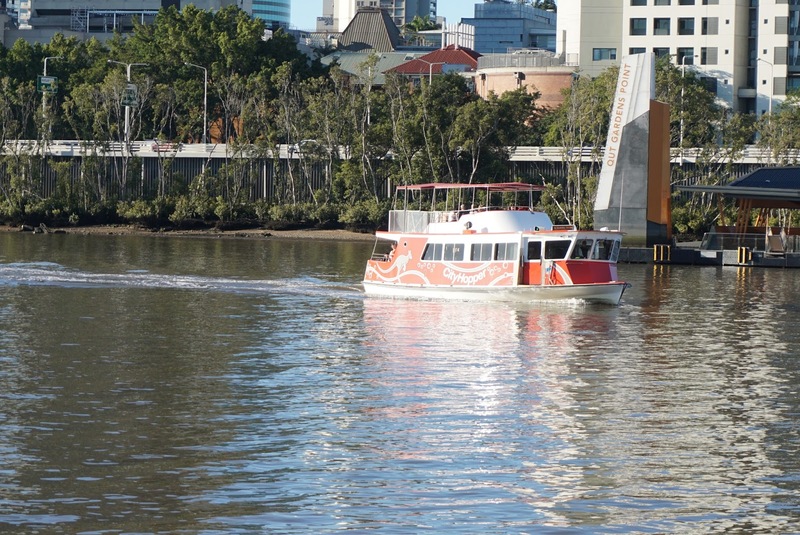 The free ferry service stopping at mostly residential areas along the river, comes at an interval of 30 mins apart and it took 1 hour to ply down the river. We waited 45 mins for our turn on the ferry. 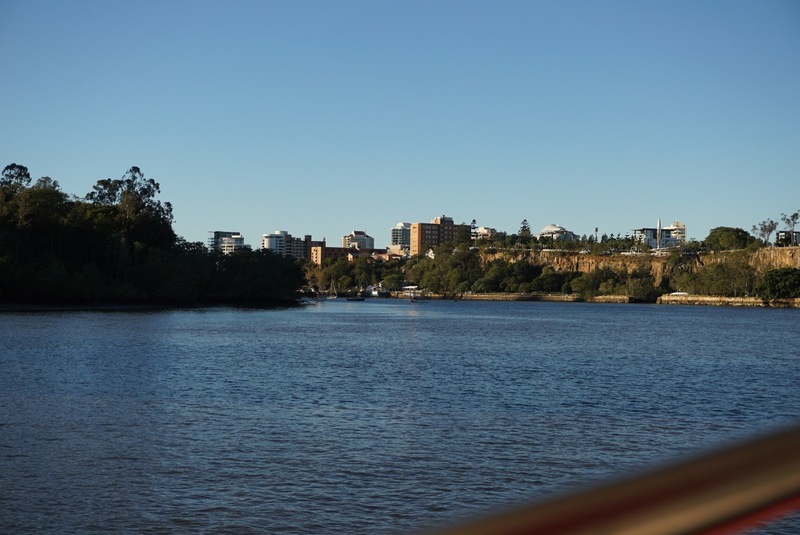 The upper deck, though chilly offers great view of the city along the river. 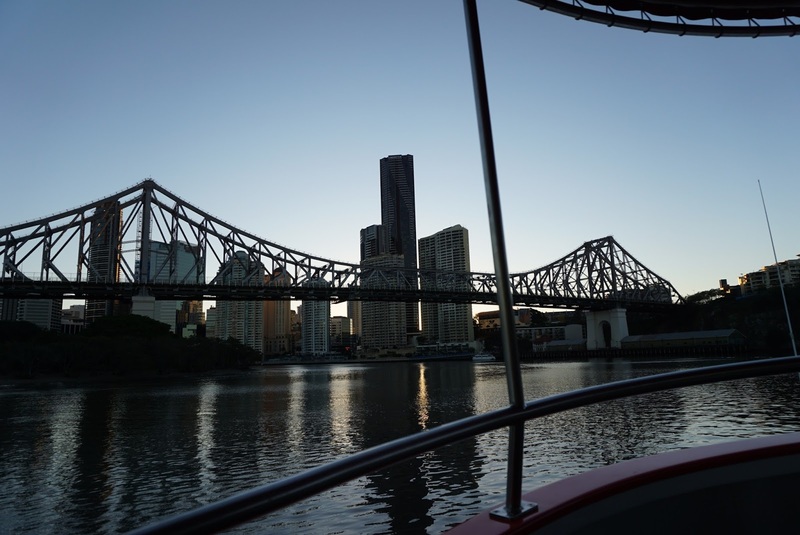 Towards the final stop before the ferry turns around and ply upstream, we were treated to a view of Story Bridge, a steel cantilever bridge that stretch 1km connecting the northern to the southern suburbs of Brisbane. 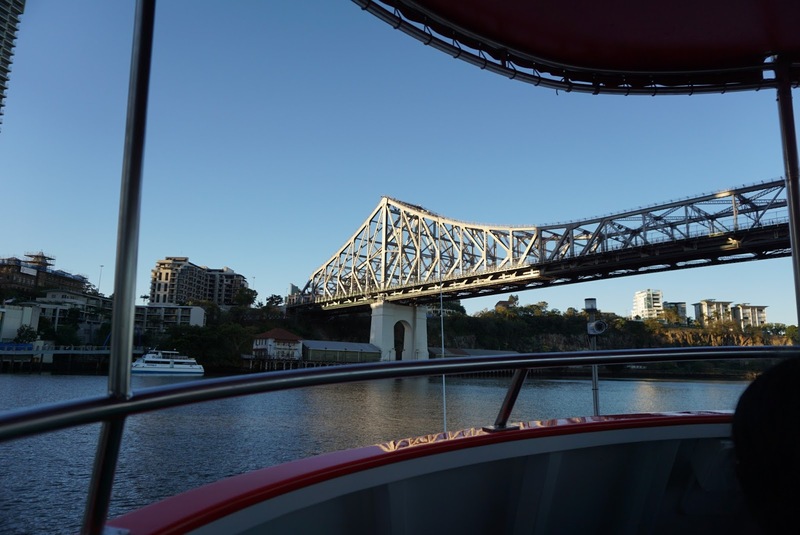 The ferry cruised underneath the Story Bridge, which presents a different but unique perspective of the bridge. 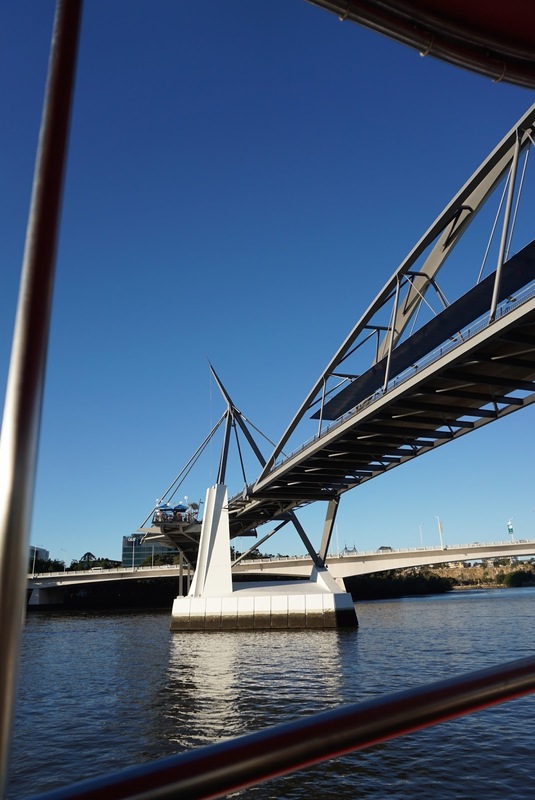 From underneath the bridge, I was able to appreciate the grandeur and the massiveness of the bridge. 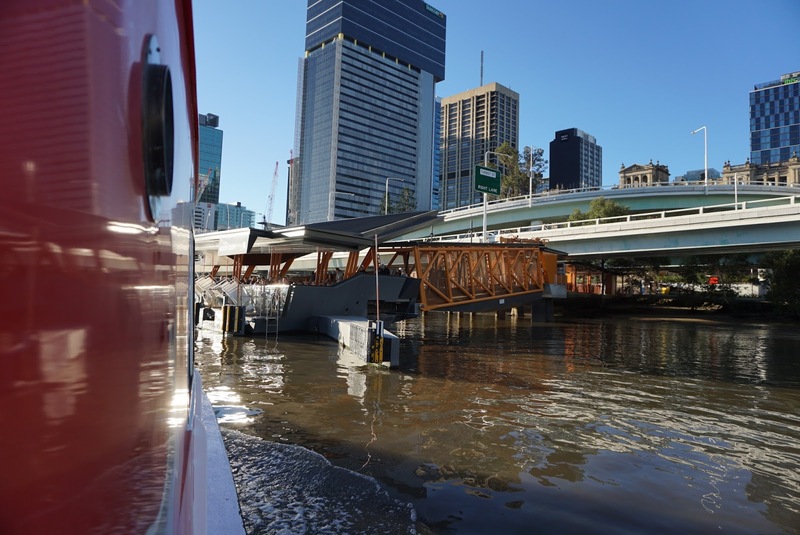 We alighted the ferry at Eagle Street Pier and made our way on foot to Myer Centre on Queen Street Mall. 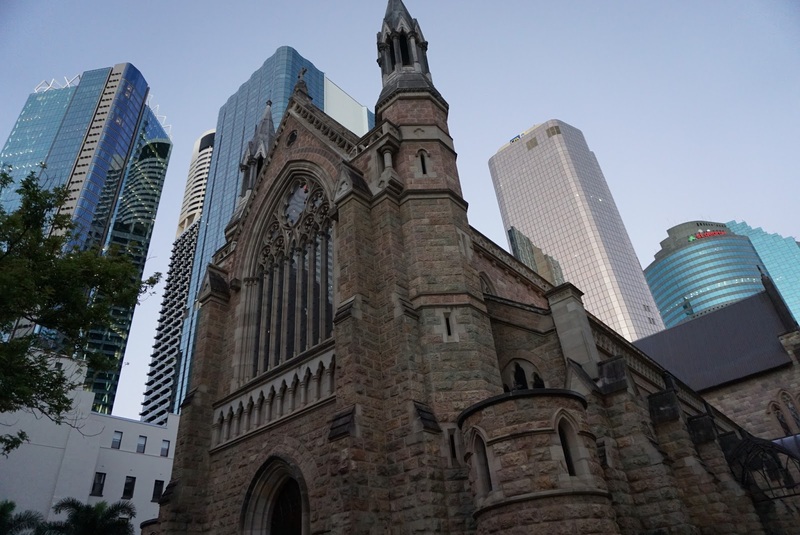 Opposite the Eagle Street Pier, we saw the Cathedral of St Stephen. 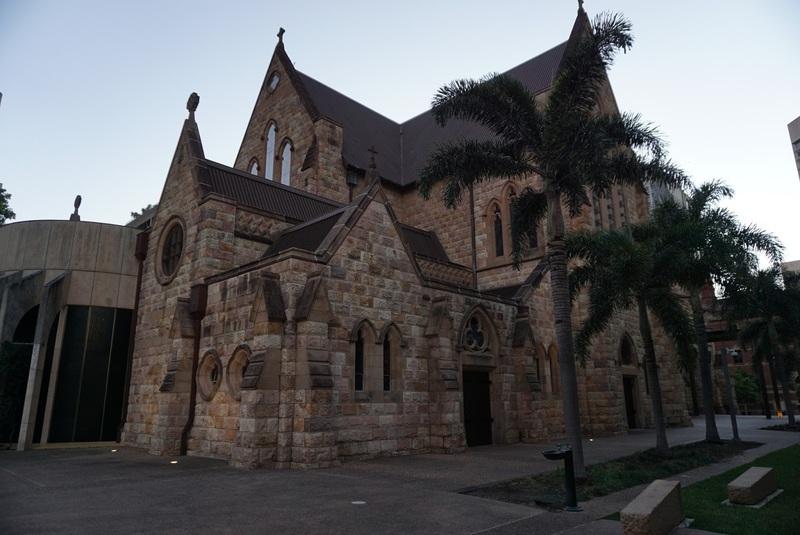 The cathedral looks historic and is best taken at dusk when the orange lights were switched on. 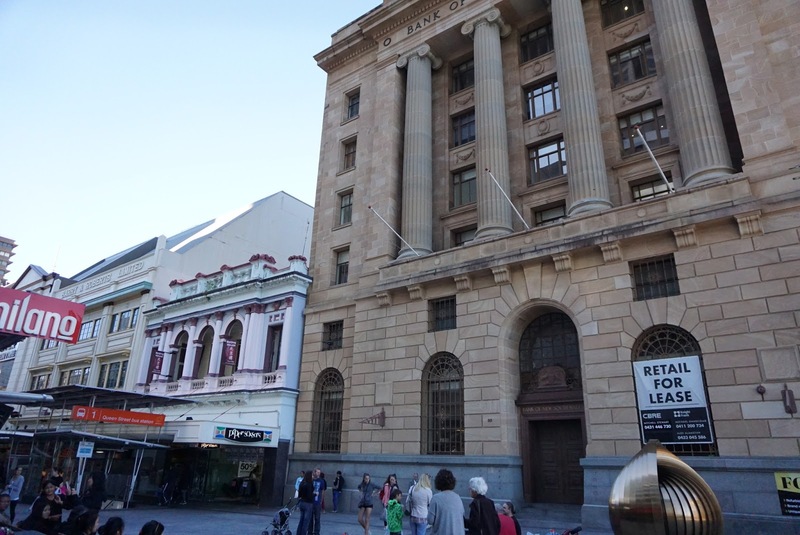 We ended our day in Brisbane City in the Treasury Building before making our way back to our apartment in Gold Coast. 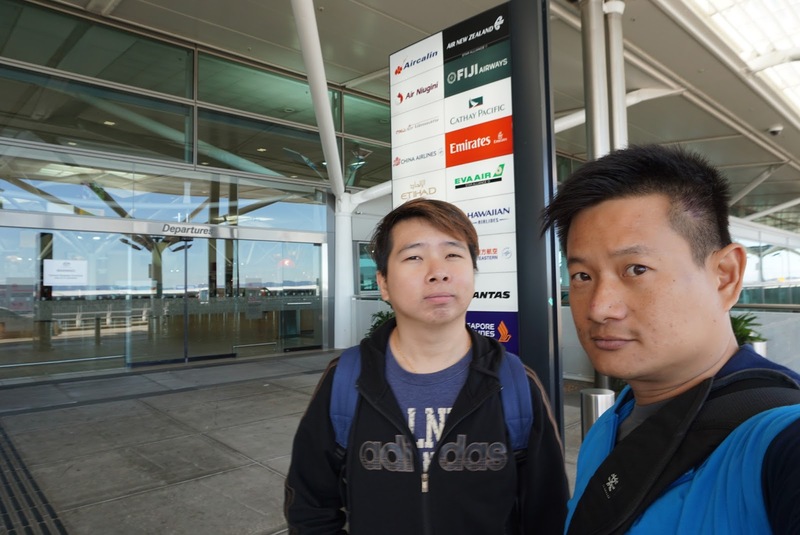 We woke up in the wee hours of the morning in time to meet the driver whom picked us up at 4.30 am at our apartment. 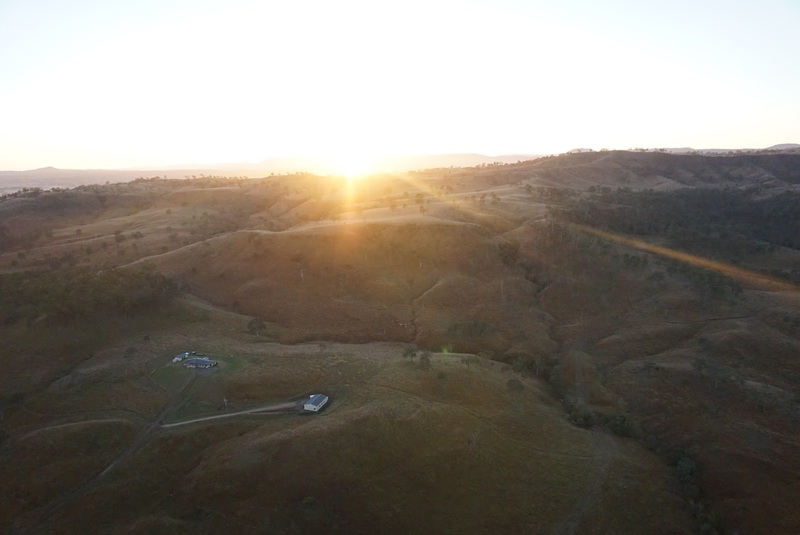 The plan today was to soar above the Hinterlands in a hot air balloon. 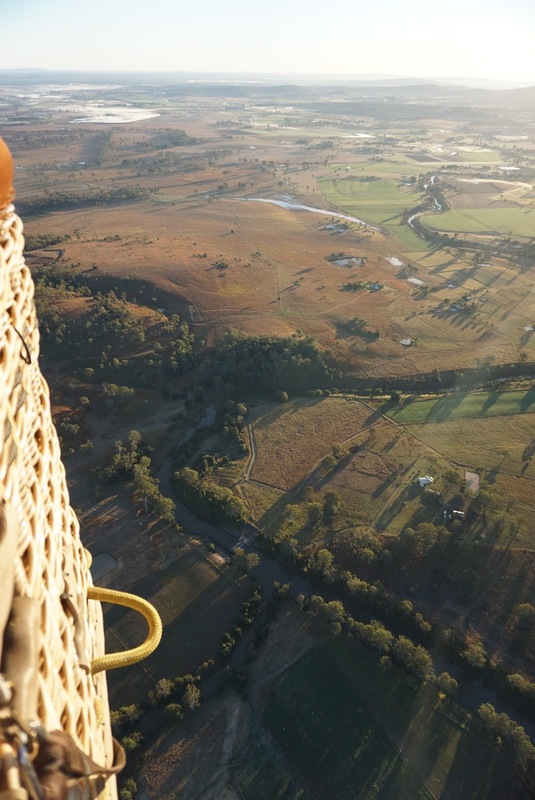 I have never been on a hot air balloon before and thought this would be a good chance to experience the ride. 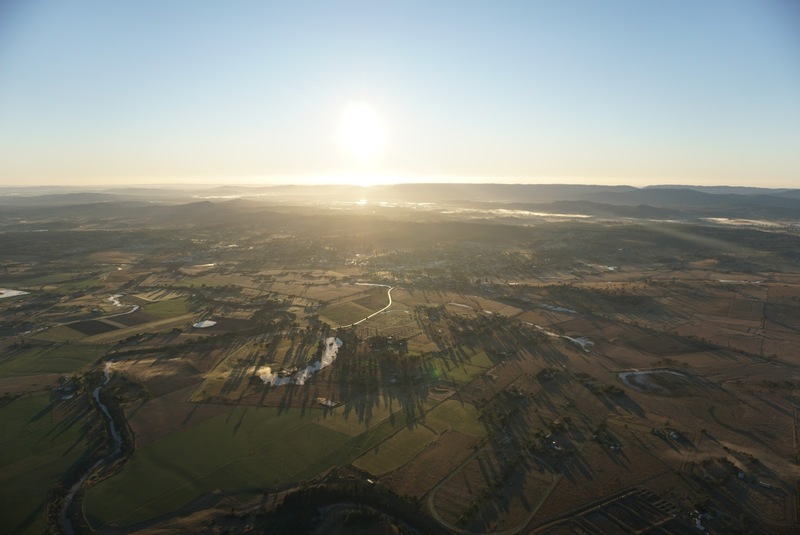 I booked the ride online with Hot Air Ballooning Gold Coast, which comprises of a 30 min ride and a champagne breakfast at O’Reilly’s vineyard. 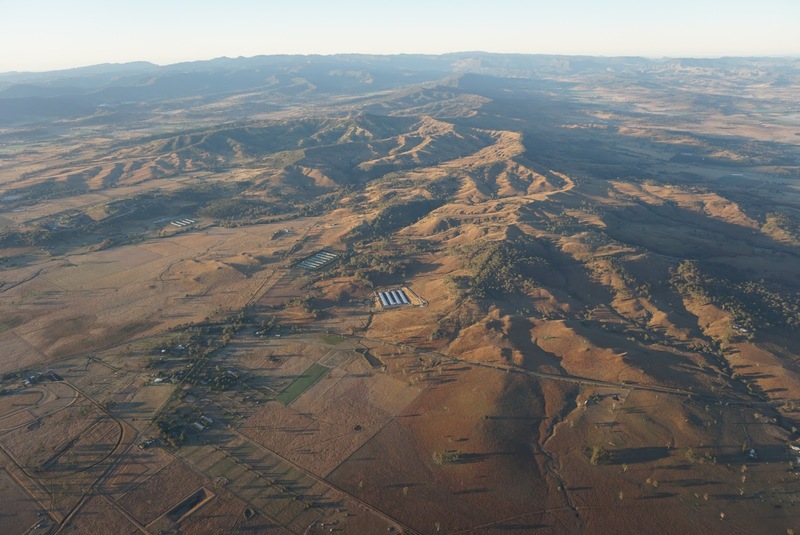 The hot air balloon launch site is about 30 mins from the nearby town of Canungra. 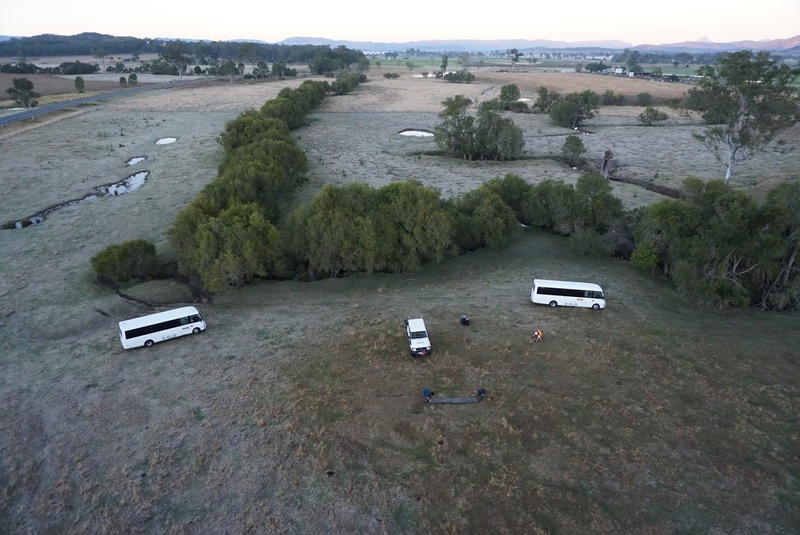 We reached the launch site at around 5 am and the weather at the launch site was freezing. 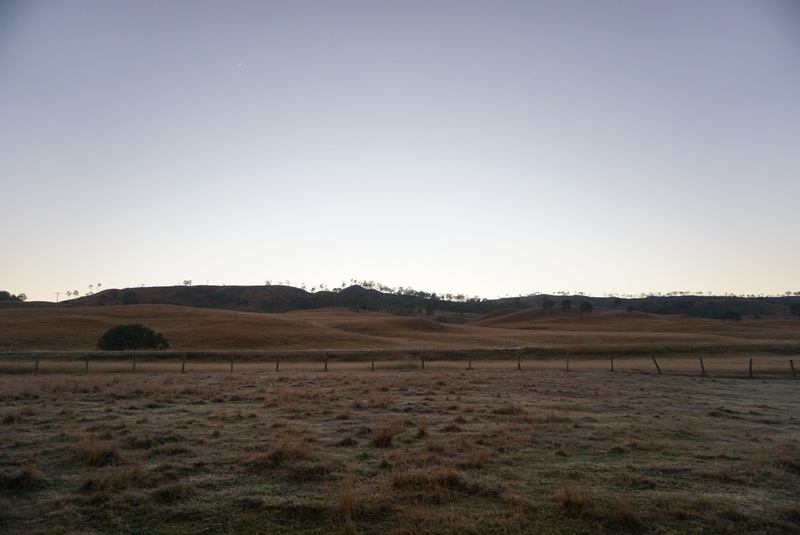 I regretted not preparing enough warm clothing for this ride, knowing that it is a winter morning and the climate is bound to be cold (around 5 deg C). 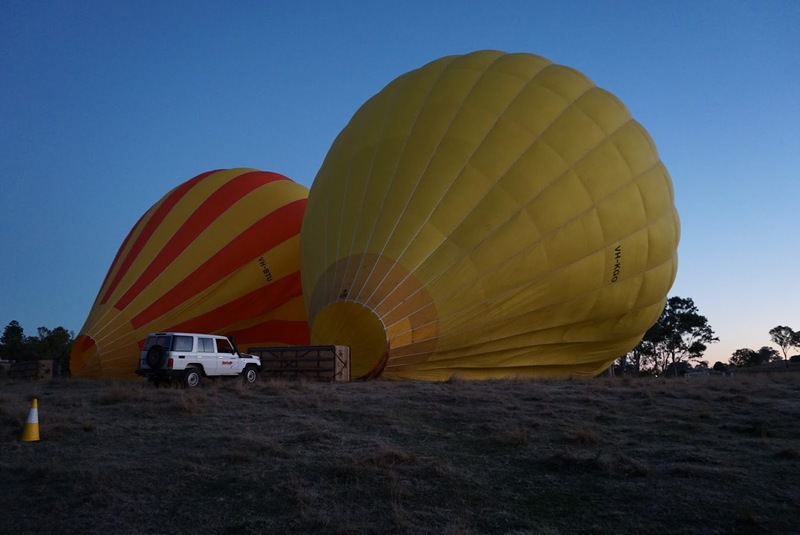 At the launch site, the driver gave us a final safety brief as the hot air balloons was being set up. Listening to the driver on the brief, my eyes were set on the the hot air balloons, which went from limp to standing tall into the sky, which stretches up to 33m in height. I am getting excited for the ride. 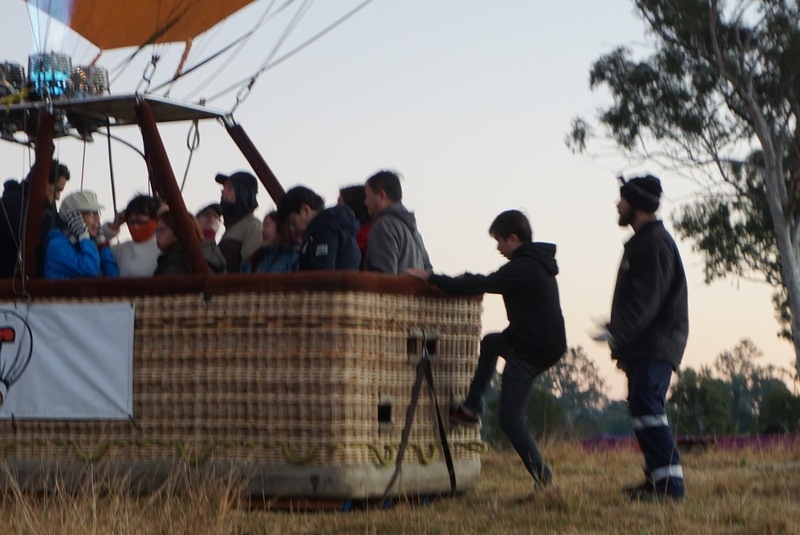 Soon we were given instructions to board the basket that would be carried by the hot air balloon across the farmlands and vineyards. Inside the basket, while the pilot was doing his final checks before lifting off, I felt the warmth from the hot flames that heat the air inside the balloon for it to glide in the skies. I wished I was standing right underneath it and that the pilot would kept it constantly on as I was freezing from the cold winter air. 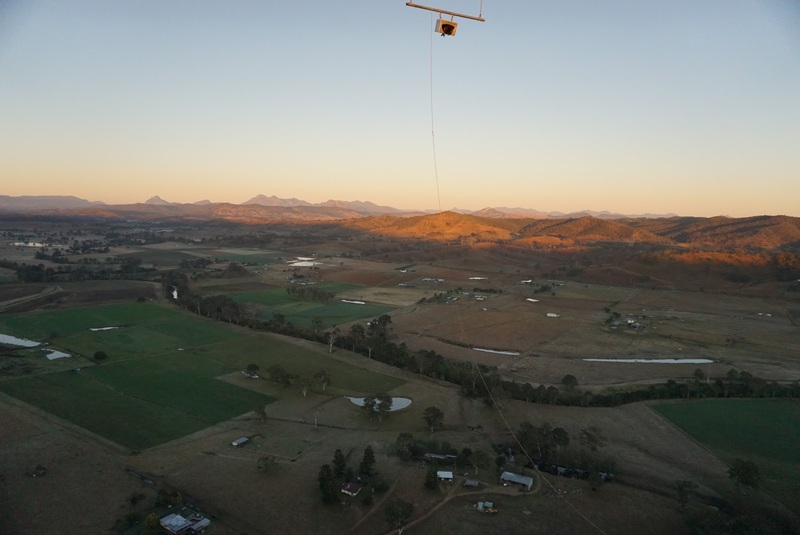 After the final checks, we were lifted off the ground. 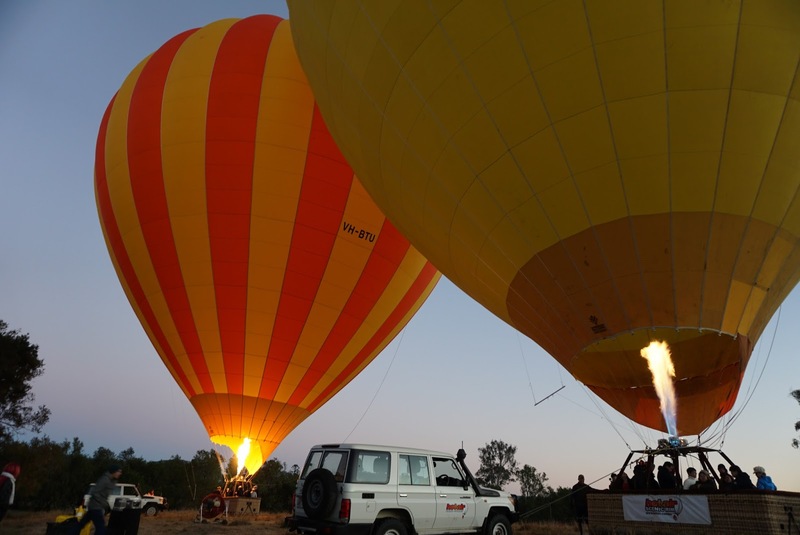 Unlike airplanes, the lift off in a hot air balloon was very gentle. 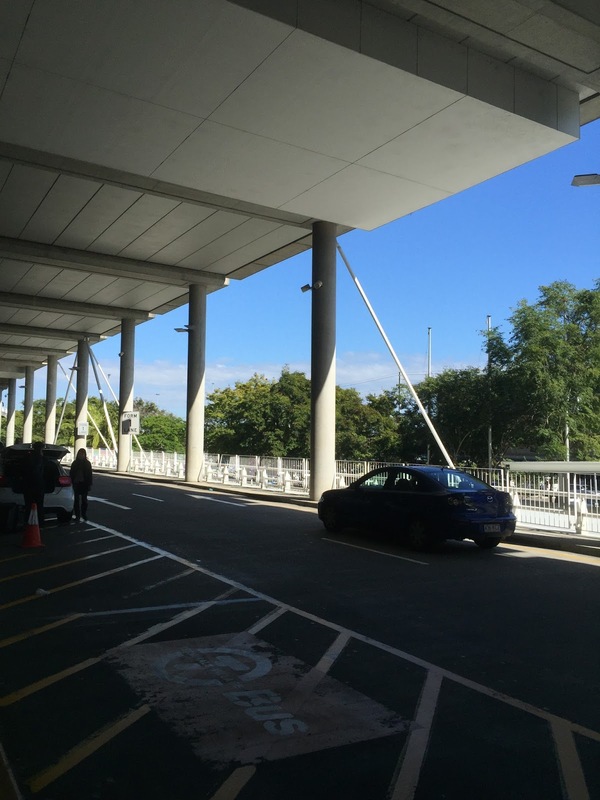 If I hadn’t looked out on the ground, I wouldn’t have realised that we have lifted off. 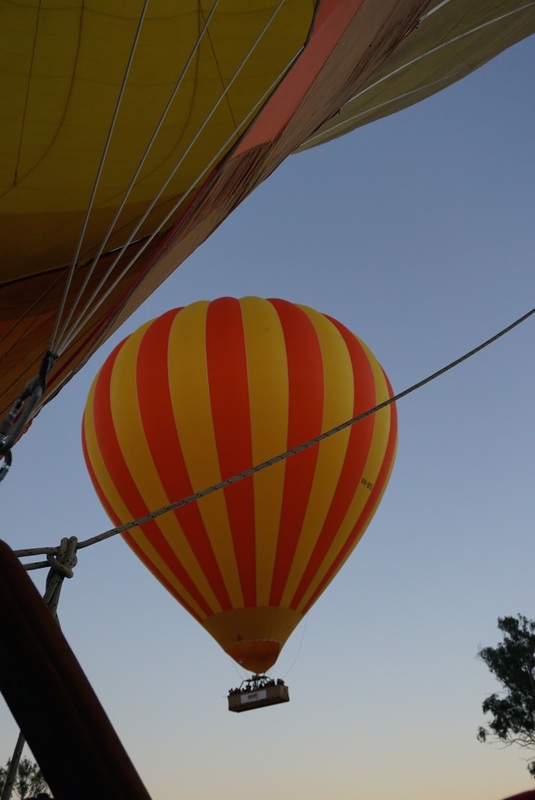 The balloon gradually and gently gain altitude without any bumps or air turbulence. 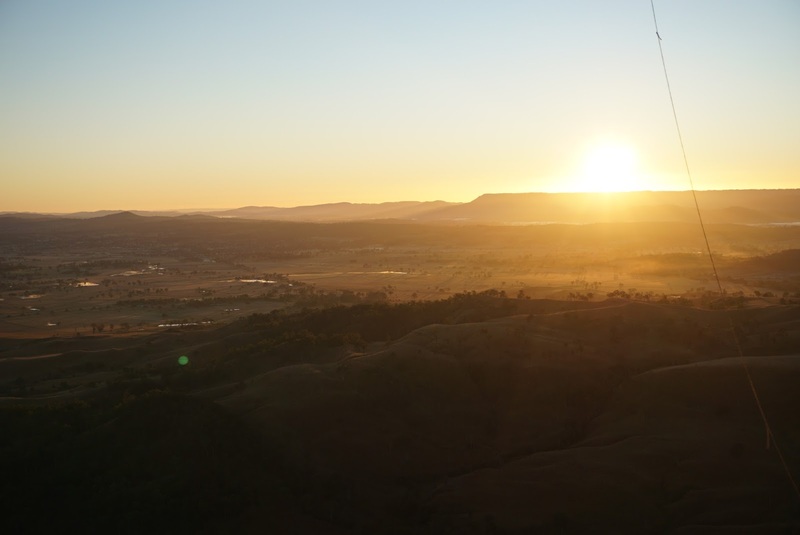 As I am acrophobic, I had an initial regret doing the hot air balloon ride. 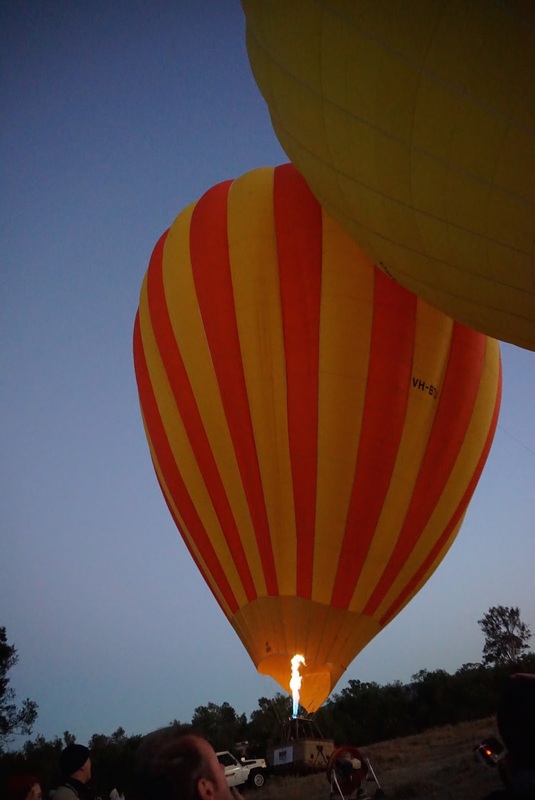 The higher the hot air balloon raised from the ground, the more insecure I felt. 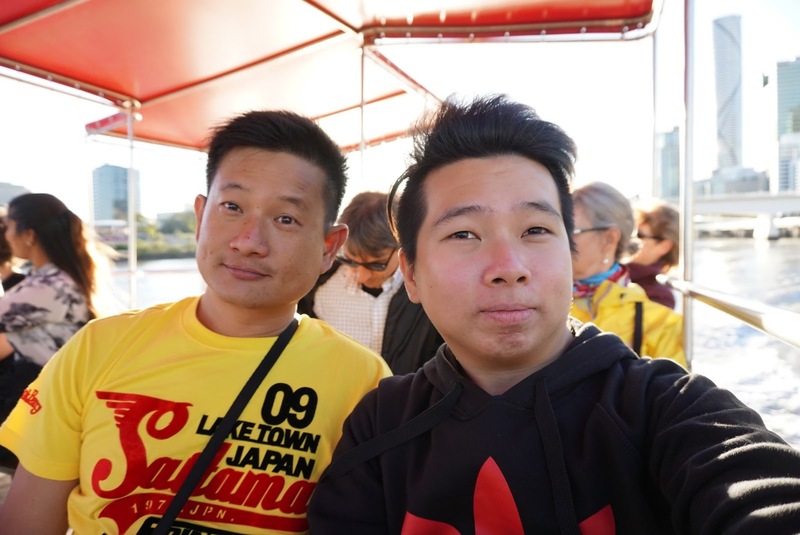 There isn’t any life jackets nor were there any precautionary devices should mishaps happen up the air.I tried not to think about the negativity and told myself to enjoy the scenery that was before my eyes. Very soon these negative thoughts disappeared. 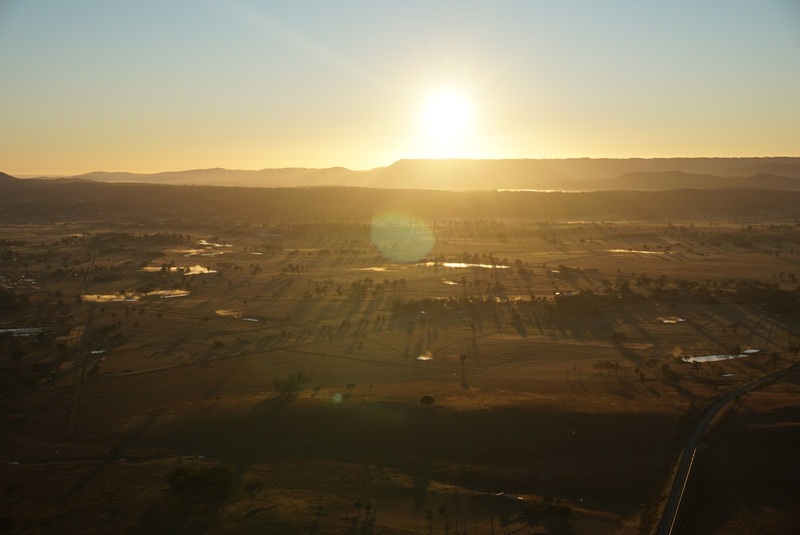 We were in time to catch sunrise over the coastal area, from the height and through the skillful control of the balloon by the pilot, I can see a huge orange colour ball rising from the oceans afar assuming its duty for the day. 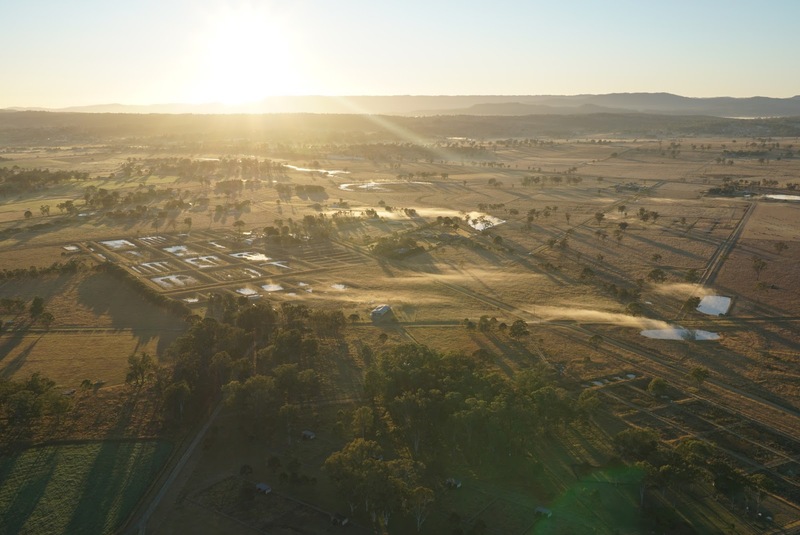 As the sun rises, the air around warms up. This is an exhilarating feeling, being up in the sky, floating gently as the winds would carry us. 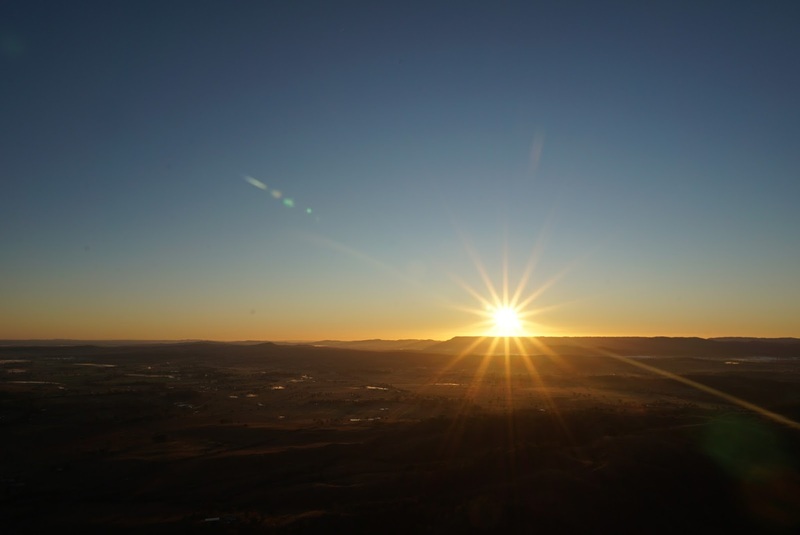 This moment is when all the negative thoughts disappears. 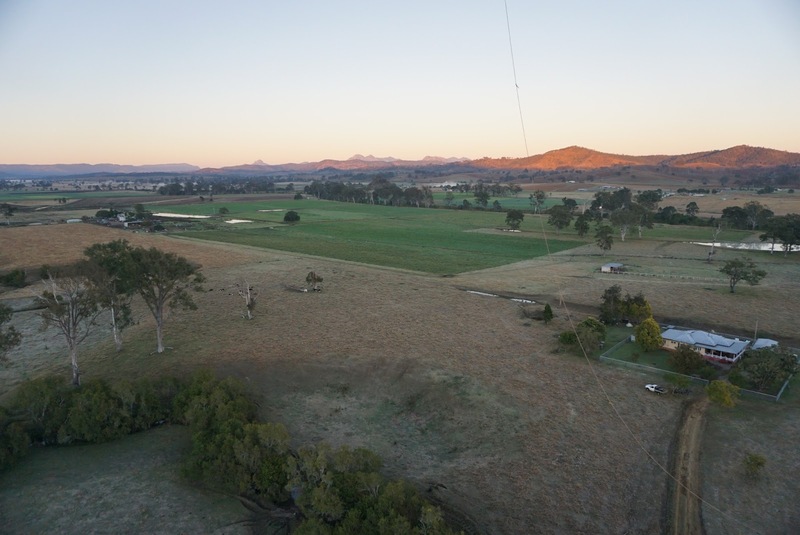 I would say being up in the sky in a hot air balloon is rather therapeutic. 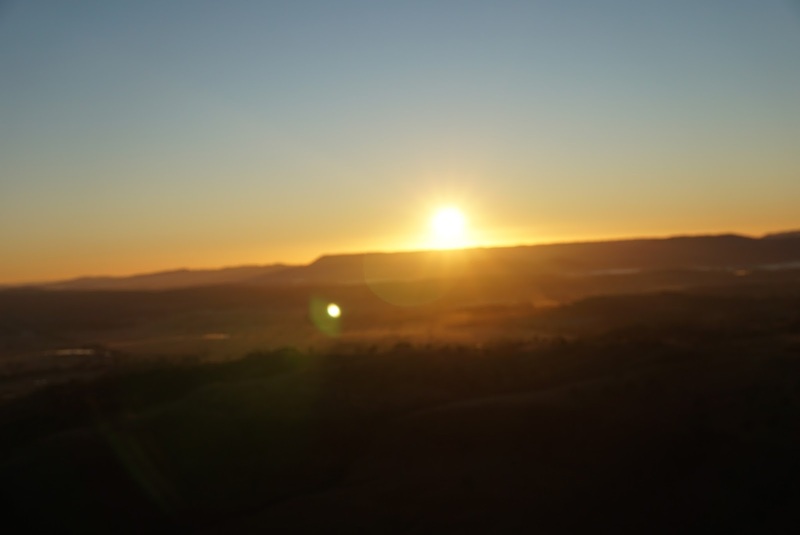 Around us, I can see as far as the mountains beyond the Hinterlands that stretches endlessly over the horizon. 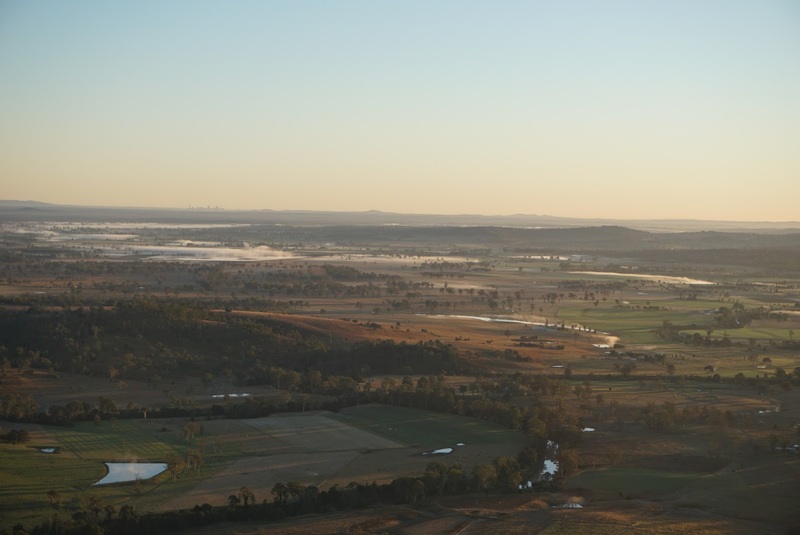 On the ground I can see lakes and ponds, rivers and creeks covered with a layer of fog as the warm air meets the cool surface. 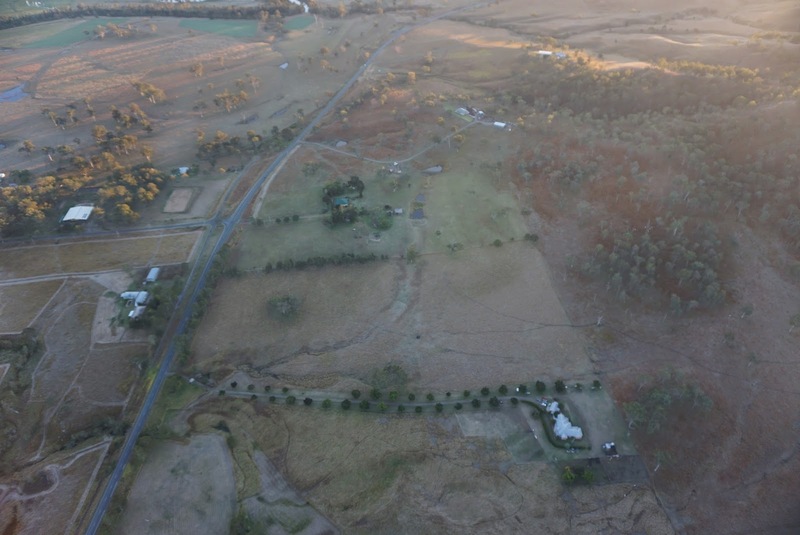 The pilot maneuvered the balloon up and down in order for us to enjoy the view over the Hinterlands better. We were told (after the ride) that the highest we went up in the sky was nearly 5000ft (about 1500m or a whopping 500 storey!). 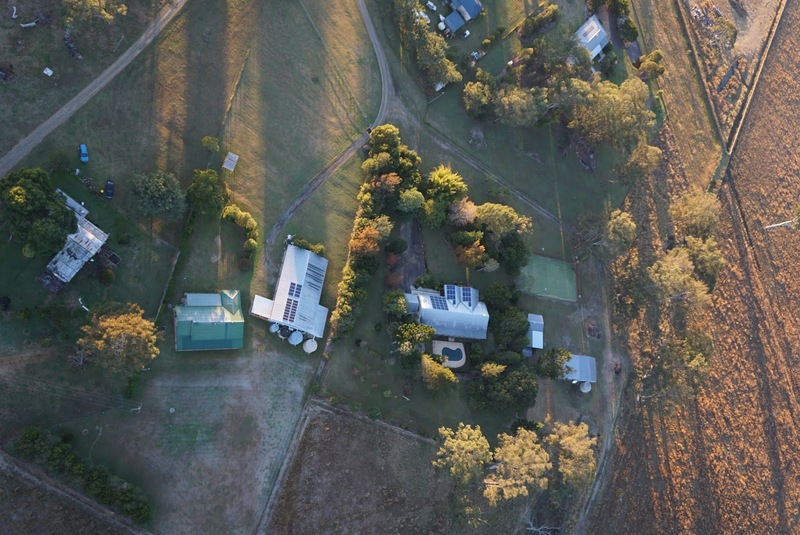 Occasionally, I looked down onto the ground below us, I can see cows moving in herds across the farmlands seemingly towards their breakfast grounds; horses galloping in groups as though they are doing their morning exercise; birds flying in flocks starting their hunt for the day. 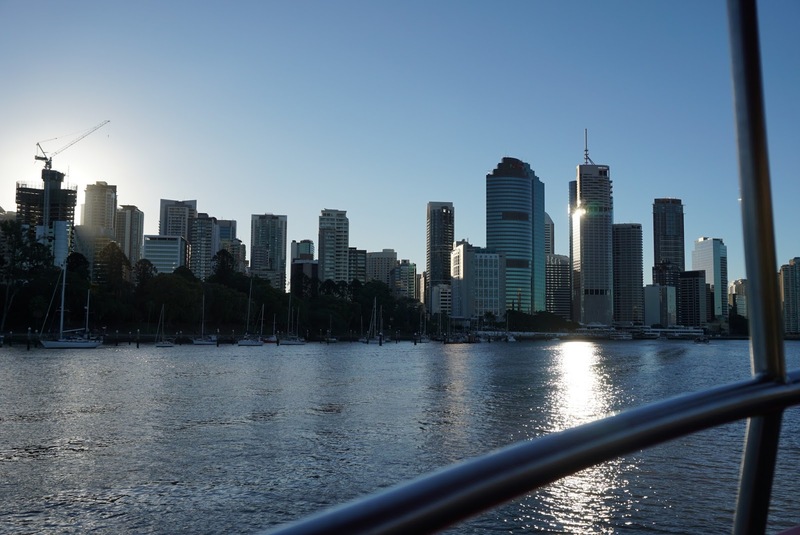 The view was nothing short of breathtaking, with the magnificent view of the mountains and the cities resting by the coastal area, nature starting its day differently. 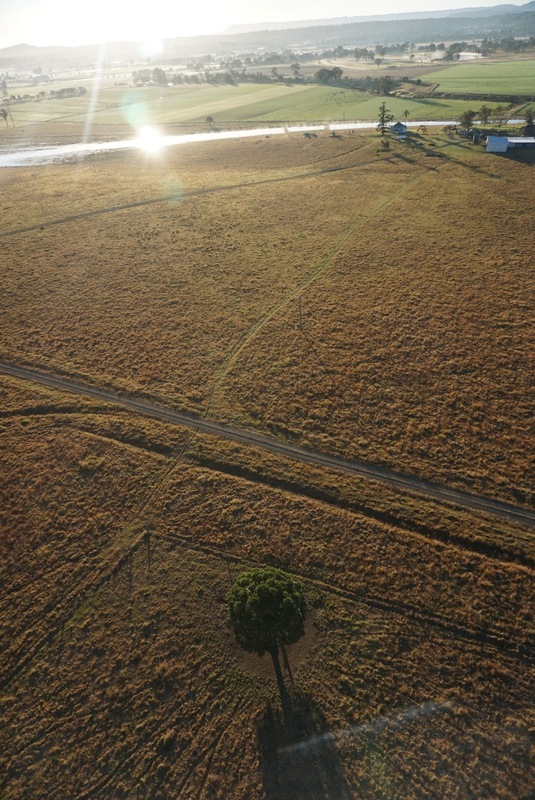 I wished that the pilot never lands this balloon. 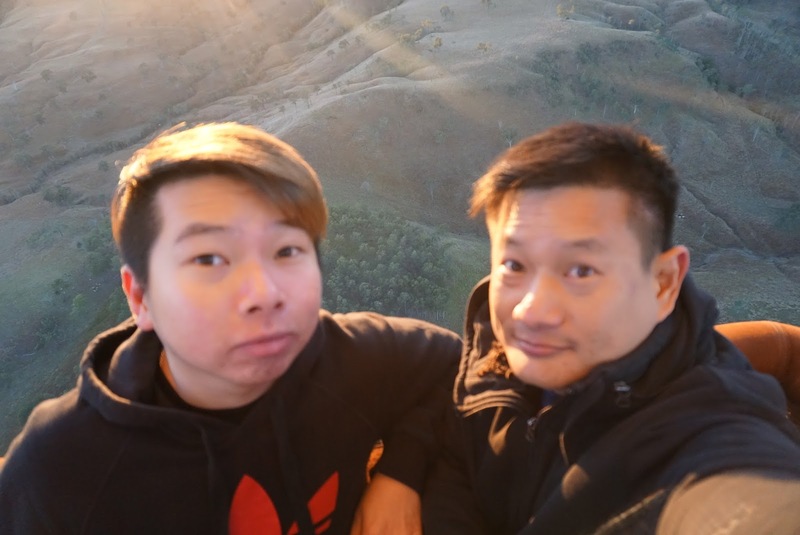 Just when my friend and I were busy taking selfies, wefies and pictures of each other in the balloon, we found ourselves seem getting closer to the ground. Our 30 mins ride is about to end (the ride actually took around 45 mins). 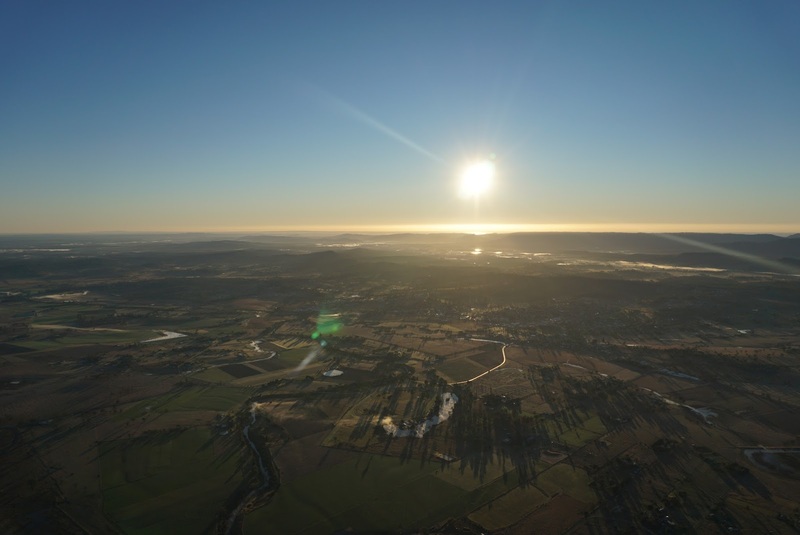 As the balloon slowly approaching the ground, pilot was busy maneuvering the balloon and coordinating with his colleagues on the ground regarding the landing spot. 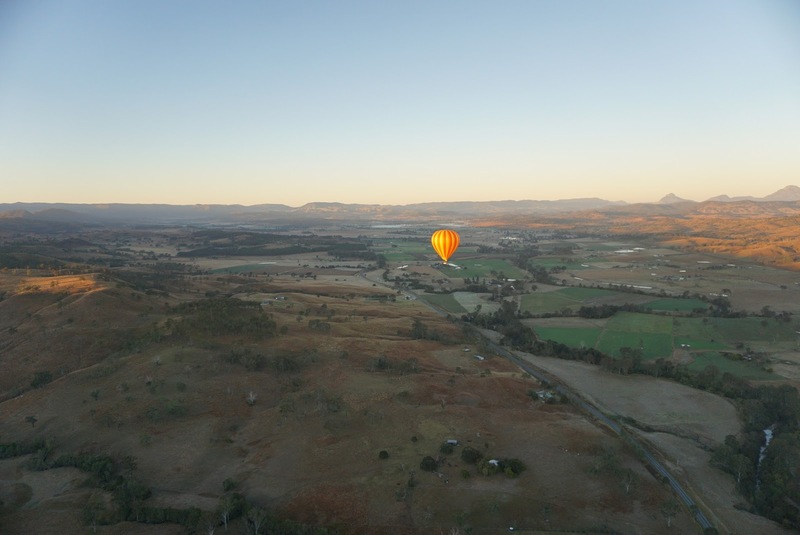 The balloon touches down onto the ground. 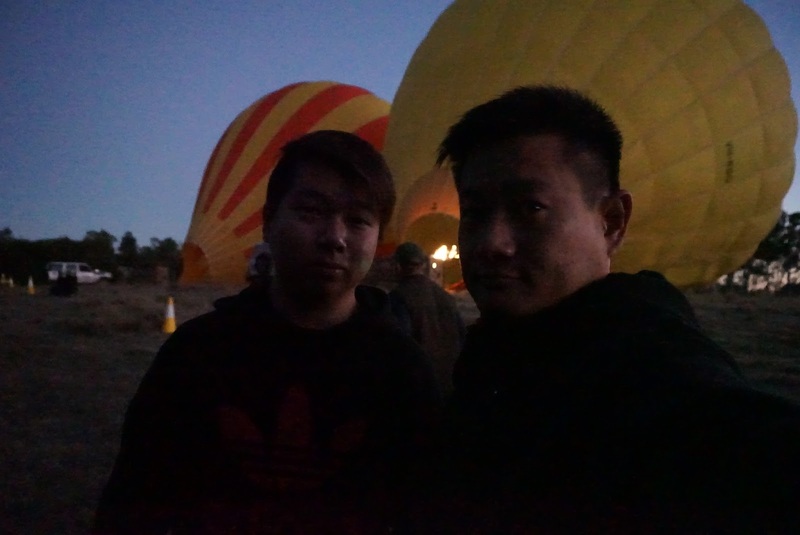 My friend and I helped with the packing of the hot air balloon after everyone exited the basket. 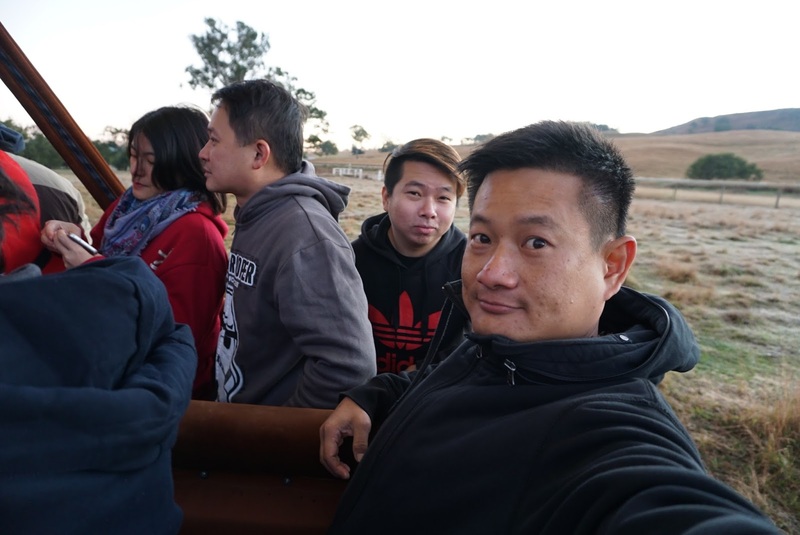 Soon we found ourselves being driven to the nearby farm house on a trailer where our bus was waiting to fetch us for breakfast. 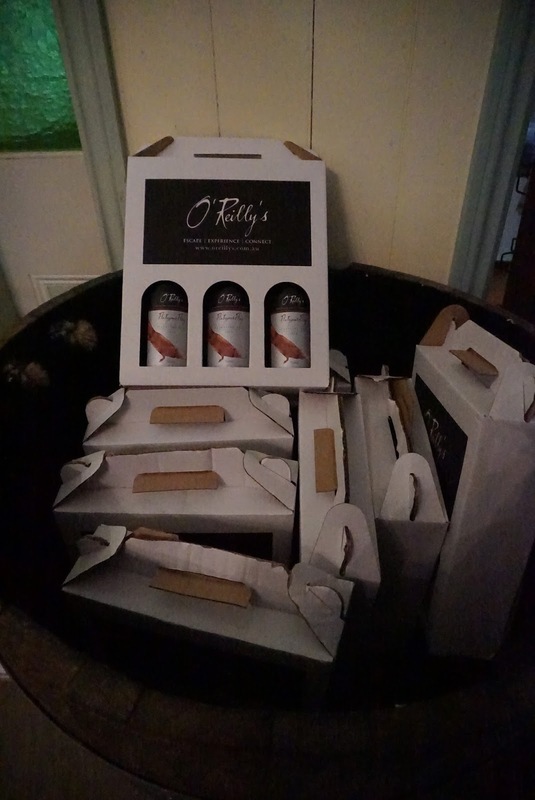 The ride from the landing site to O’Reilly’s Homestead Vineyard took about 20 mins. The bus stopped in front of a vintage large wooden homestead. 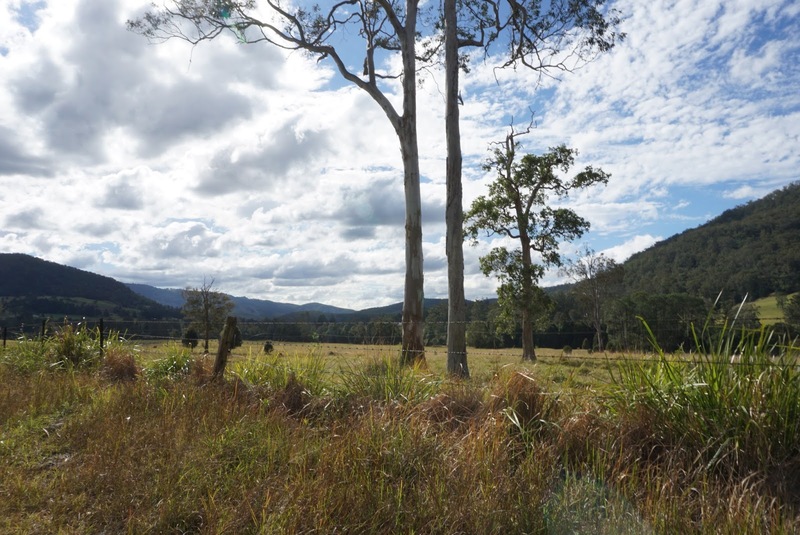 Both my friend and I found surroundings of the homestead to be very peaceful and tranquil. We spoke about how nice it would be to be staying here. 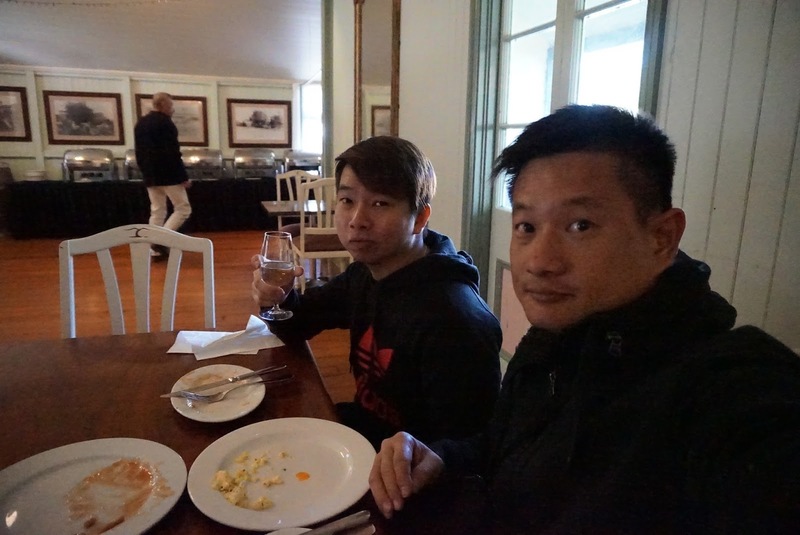 We were given 1.5 hours for breakfast and to roam around the surroundings of the Homestead. 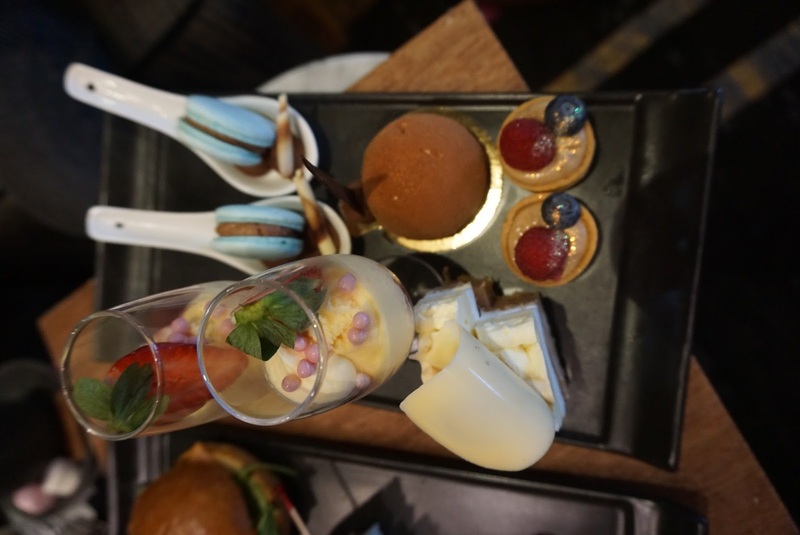 Each of us were given a glass of champagne as soon as we alighted from the bus. 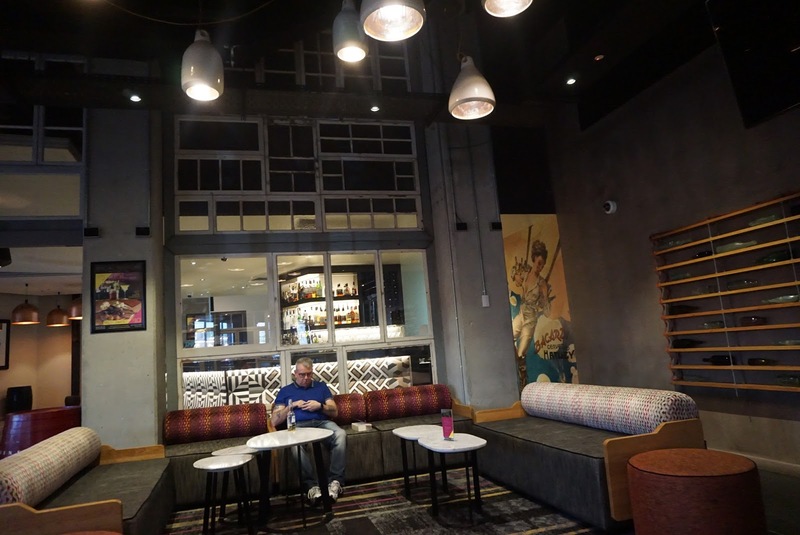 The driver told us to find any seats in the homestead and go grab our breakfast. 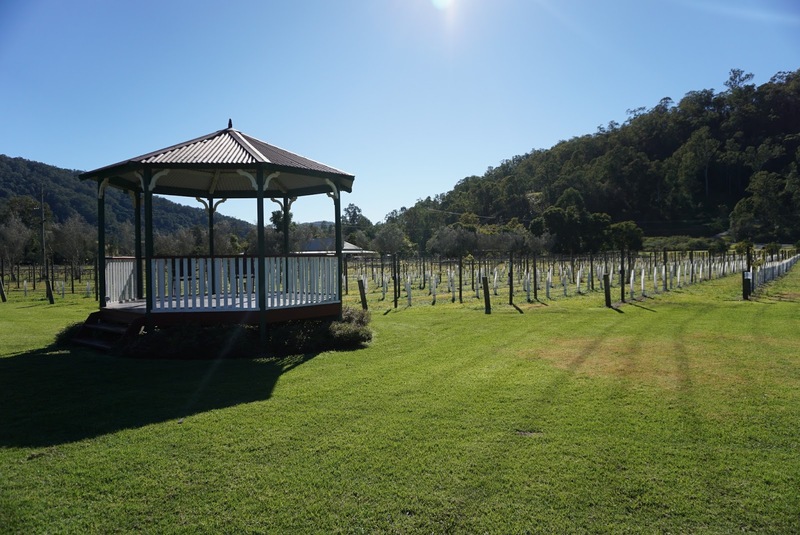 We would love to have a table outside in the veranda hopefully under the sun as we still feel cold from earlier in the morning. All the outside tables are being taken, my friend and I settled at the long table near the buffet table. 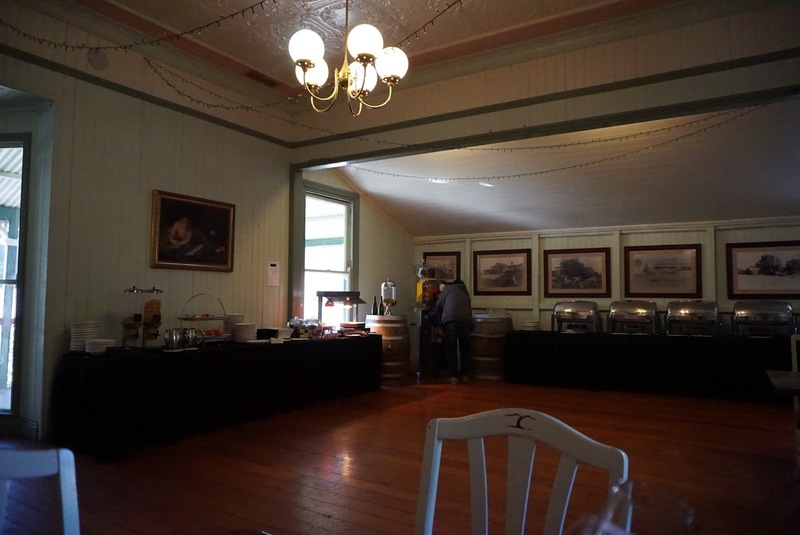 Breakfast was a simple affair with the standard baked beans, bacon, eggs, hashbrowns, salads and coffee/tea. 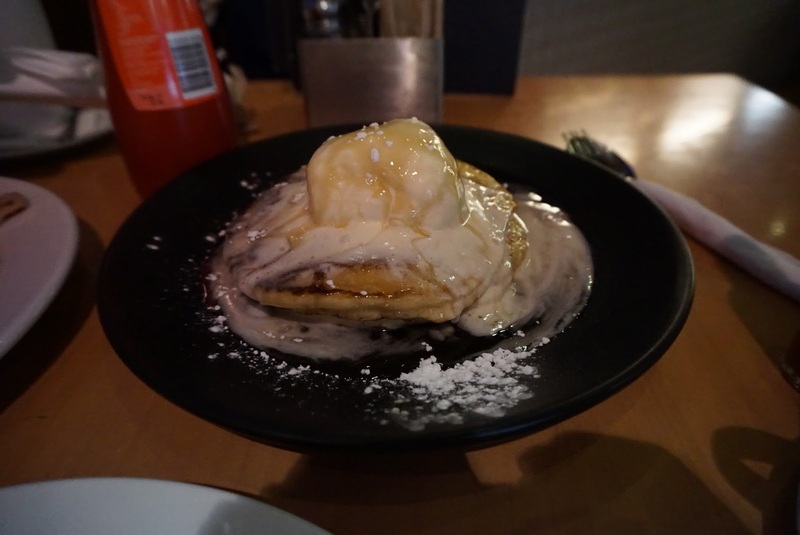 Despite simple, the breakfast was tasty and did indeed warm us up. 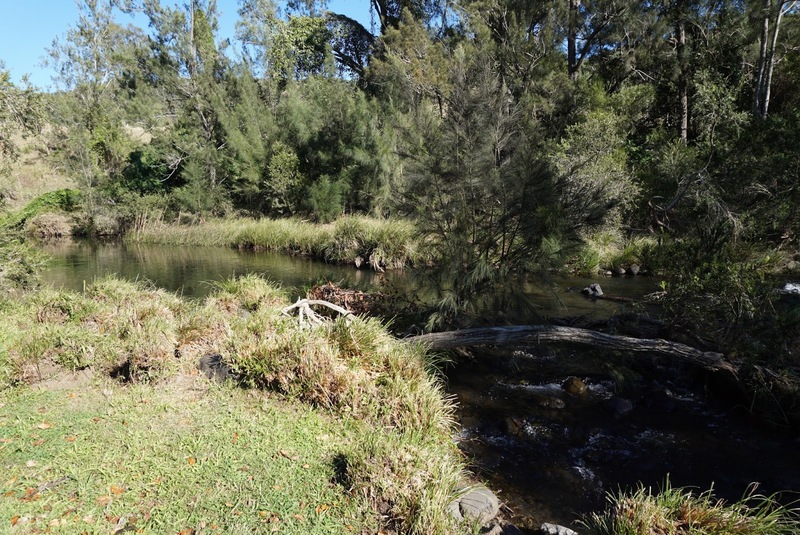 After breakfast, we headed to the back of the homestead where the Canungra Creek runs by. 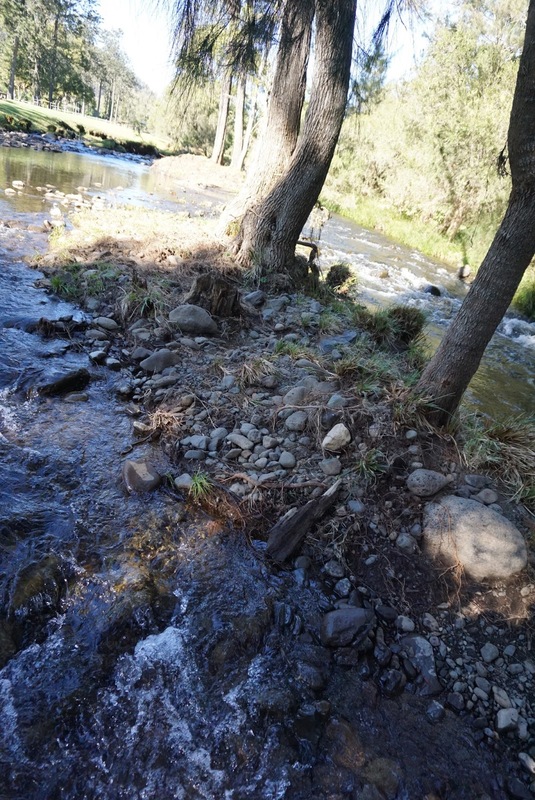 Listening to the stream of water flowing gently along the creek with a small hill as the backdrop, my friend and I enjoyed the peace the surroundings offered. 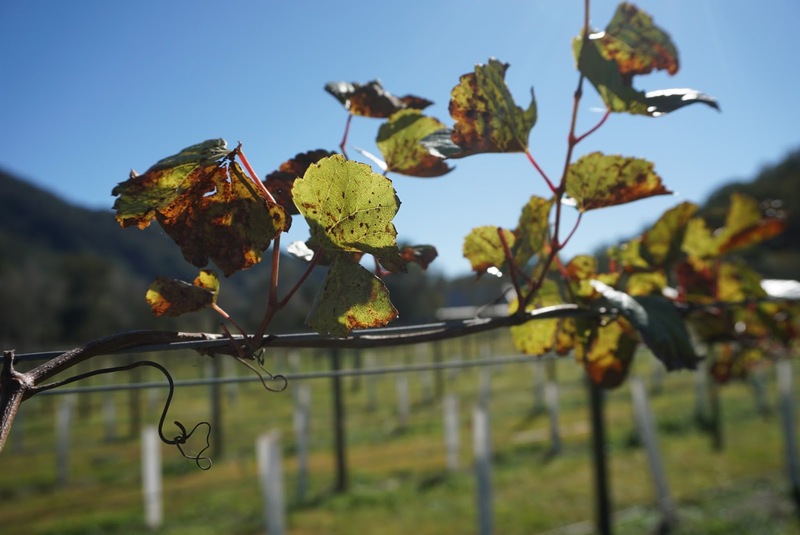 After taking some pictures, we headed towards the vineyard to take some more pictures. 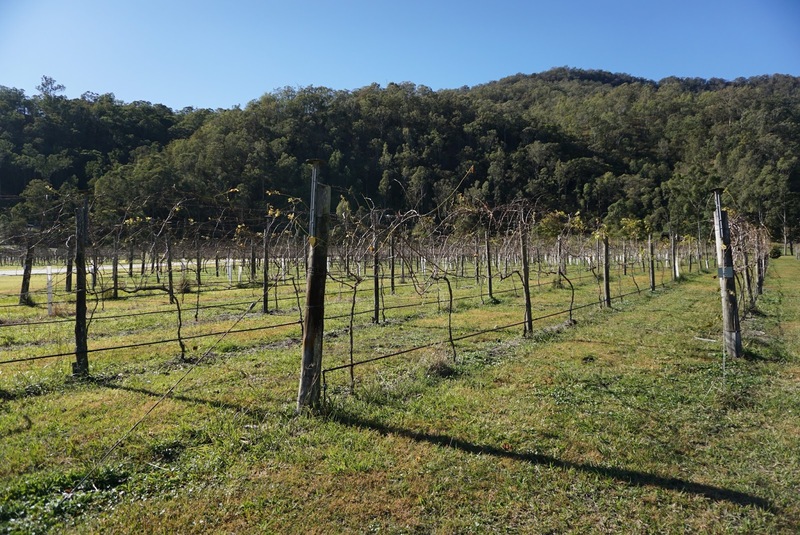 There were no grapes on the vines, it seemed they just have been recently harvested. 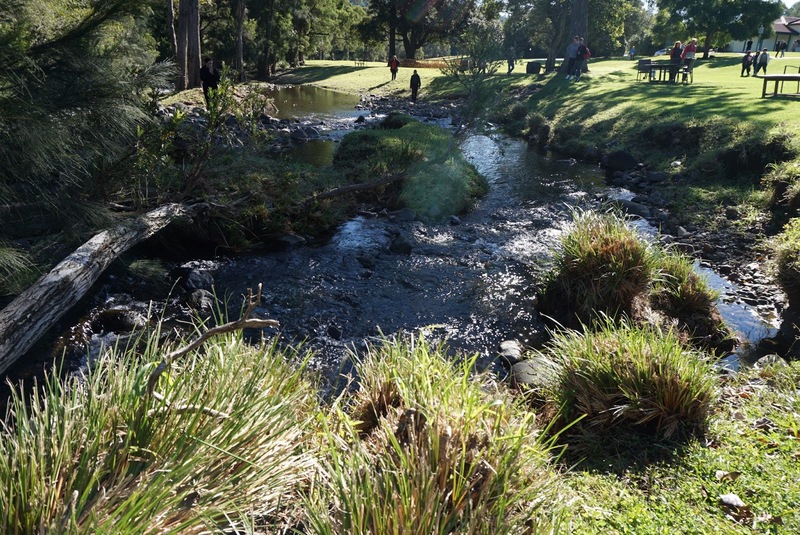 We headed towards the creek to take more pictures. 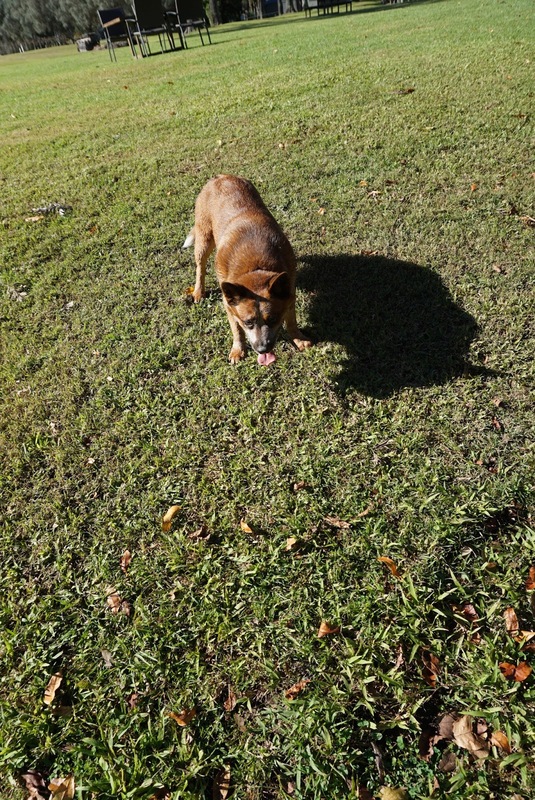 There was a dog at the homestead grounds, friendly and wanting to play with visitors. 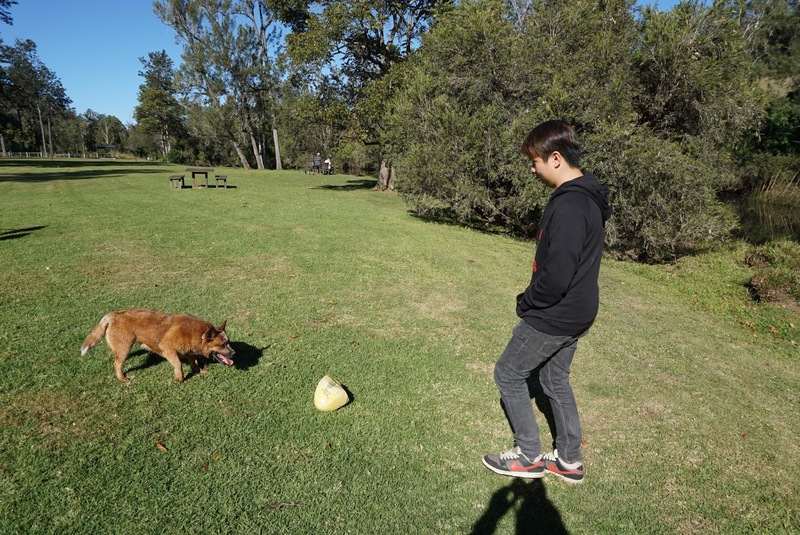 The dog approached us with a deflated ruby ball, placed on the ground in front of us, as though he wanted us to kick far so that he can ran out and fetch it back to us. 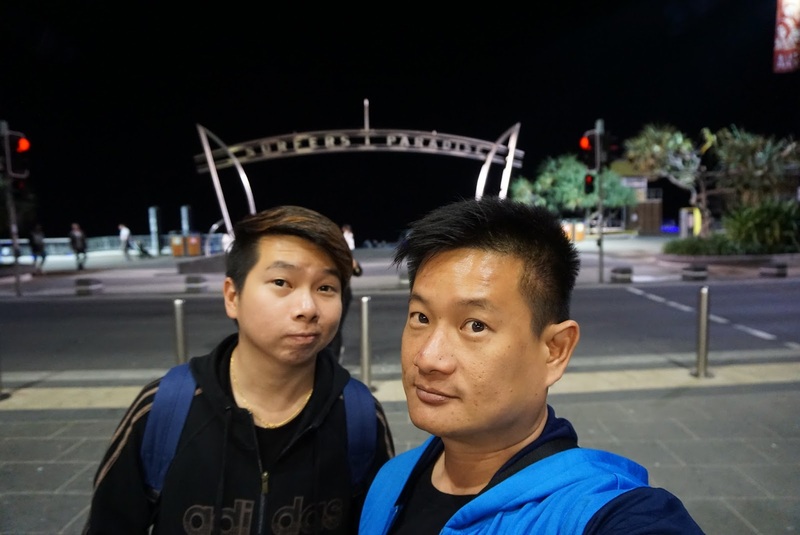 We did so for a while before it is time for us to board the bus that would take us back to our apartment in Surfers Paradise. 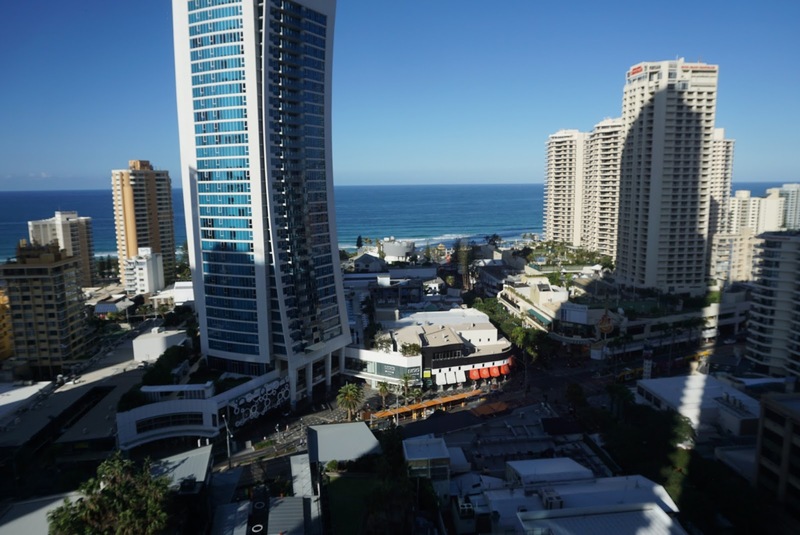 Back in our apartment in Surfers Paradise, Gold Coast, my friend and I decide where to spend the rest of the day. 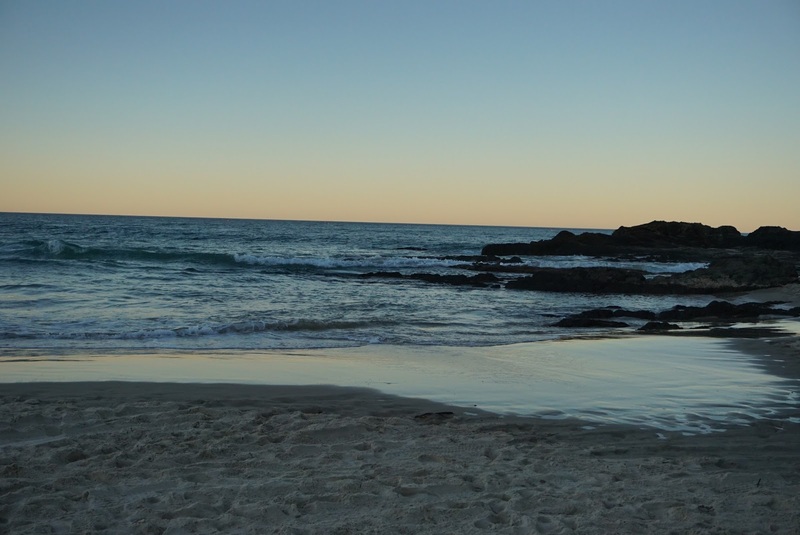 We originally wanted to drive down to Byron Bay, the eastern most point in Australia. 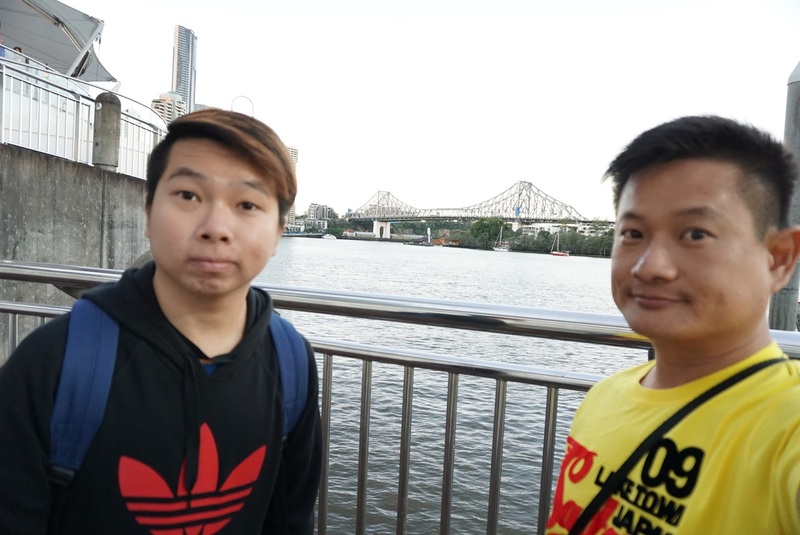 As the drive takes about 1 hour per way, coupled with the tiredness from waking up early, we decided to head somewhere nearby. 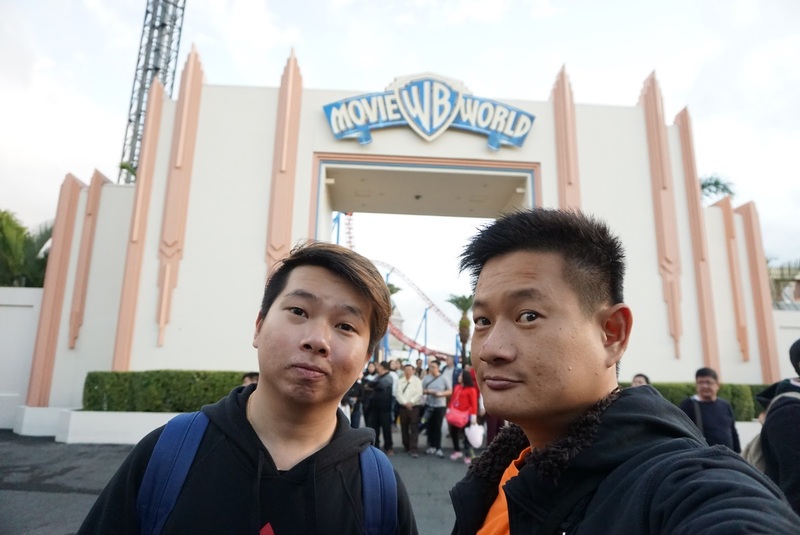 We decided to head to Warner Brothers Movie World. 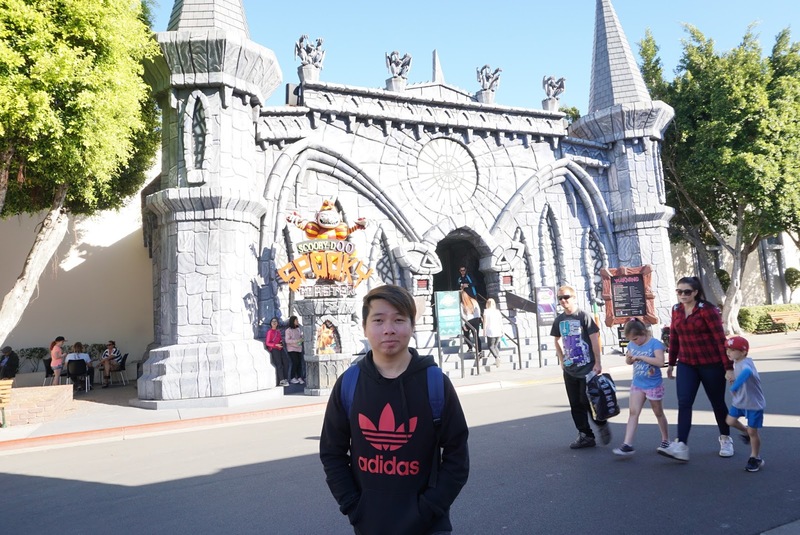 I was a little hesitant in visiting a theme park on a weekend, expecting it to be very crowded. At the entrance, I was surprise the ticketing queue was not as long as I had expected. 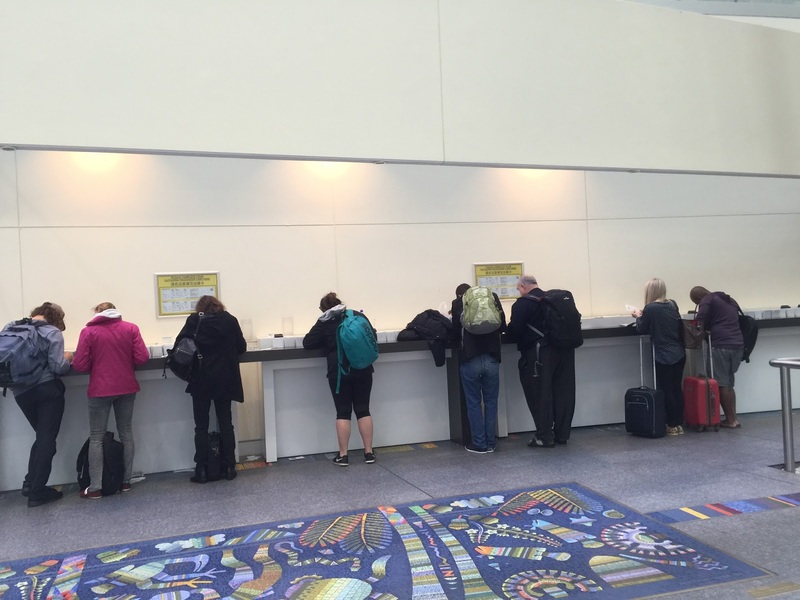 We approached a counter to get our annual pass exchanged and soon we were in the theme park. 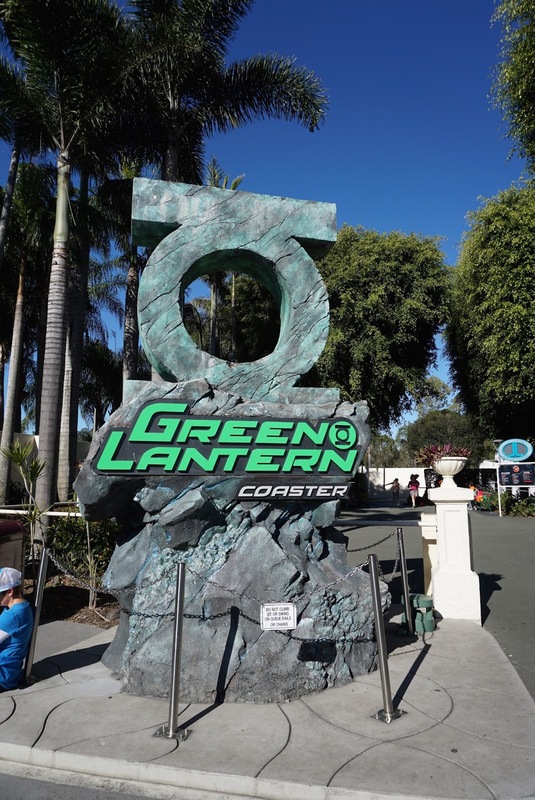 At the entrance of Warner Brother’s Movie World, we saw the Green Lantern ride. 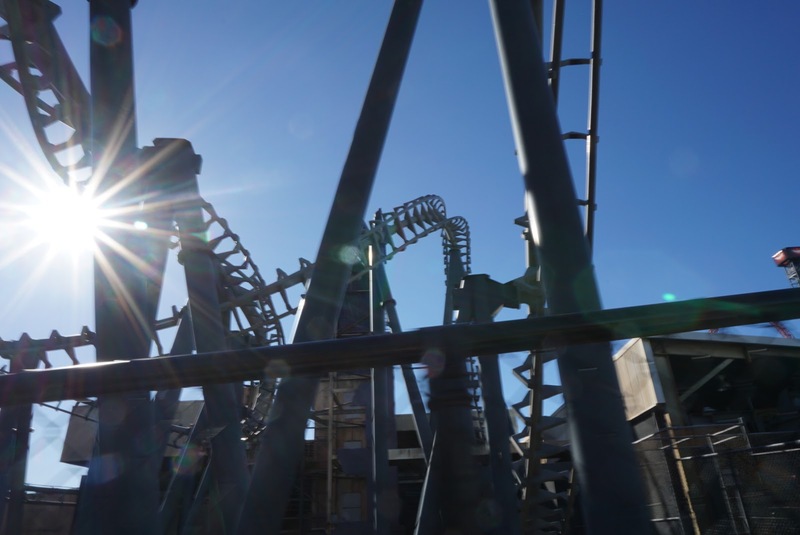 Well it looked mild enough to start our day riding the trills offered by the various roller coasters in Warner Brother’s Movie World. We did not have to wait for too long for our turn on the 4 seats by 2 row roller coaster car. 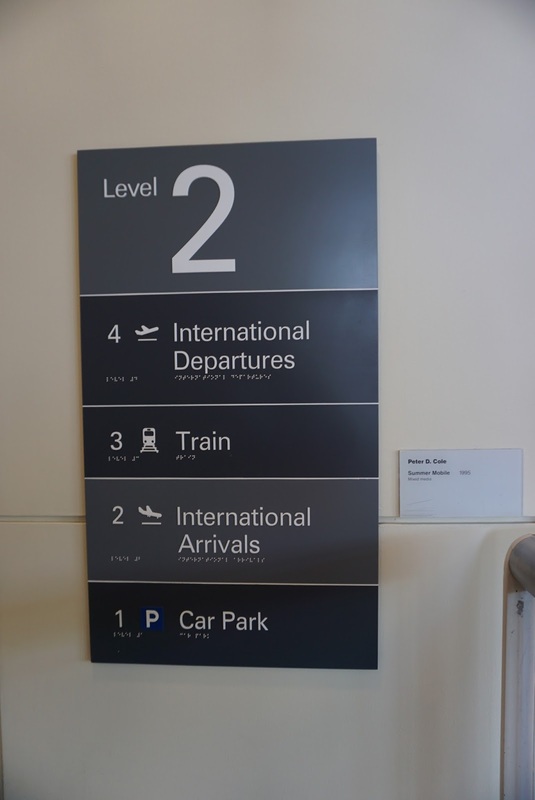 After leaving the boarding area, the car was slowly hosted on a sloped track up 33 m. The initial few metres of track seem gentle and boring. After a short u-turn on the top of the tracks, the car plunges more than 90deg down towards the ground. This is where the excitement of the ride started to kick in. The car tossed and turned side ways along the track and towards the end, there is a short track where we were hung upside down before returning to the station. 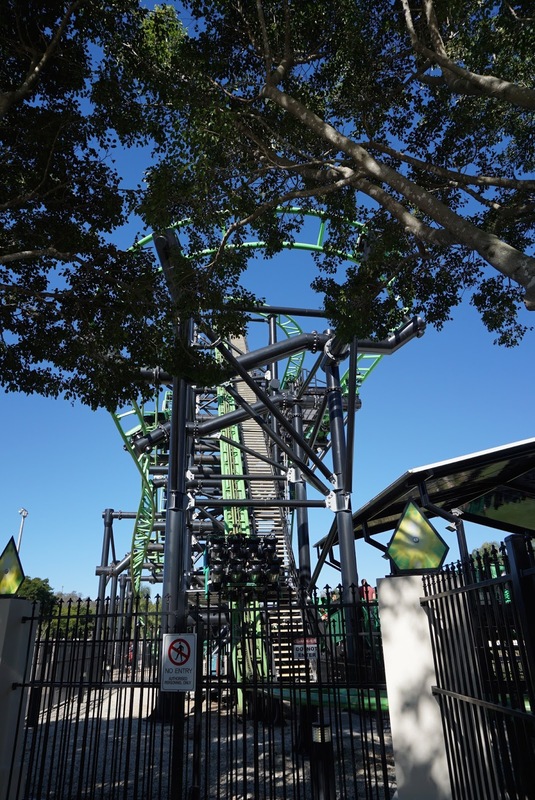 As scary as it may look, the Green Lantern ride is a good way to start our adrenaline pumping for the rest of the rides in Warner Brother’s Movie World. 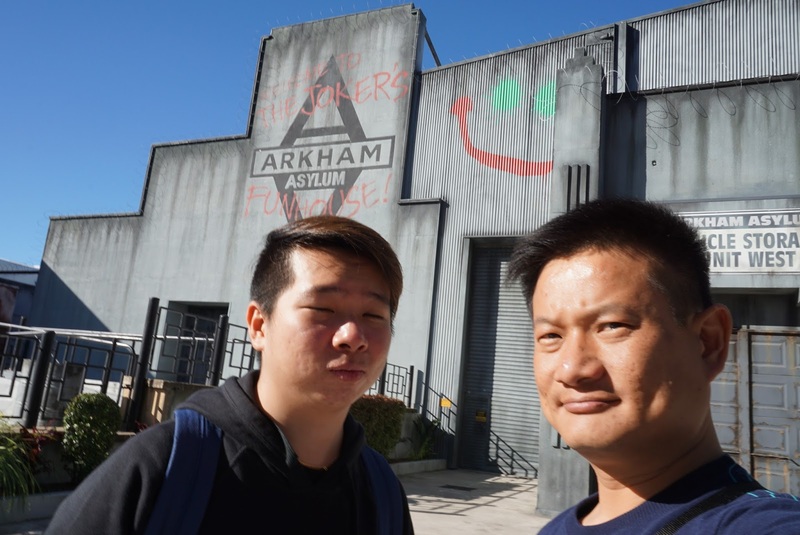 We headed to the Arkham Asylum ride next. 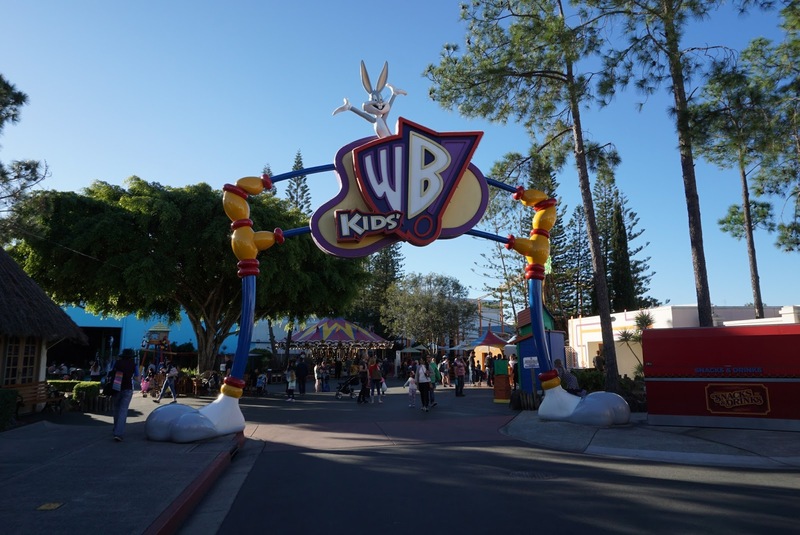 I had been on this ride some 10 years ago when I last visited Warner Brother’s Movie World. 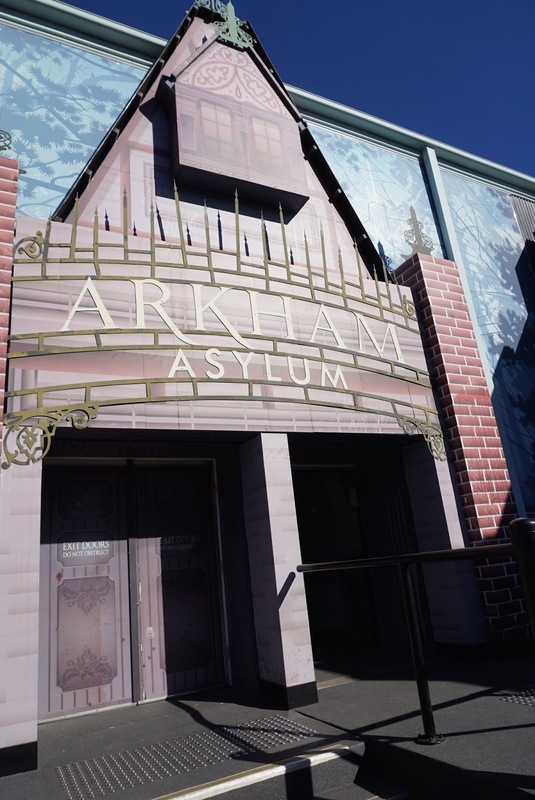 Arkham Asylum is a hanging roller coaster. After ascending up the slope of about 32m, we were tossed and flipped left and right and upside throughout the entire 45 sec of the ride time. 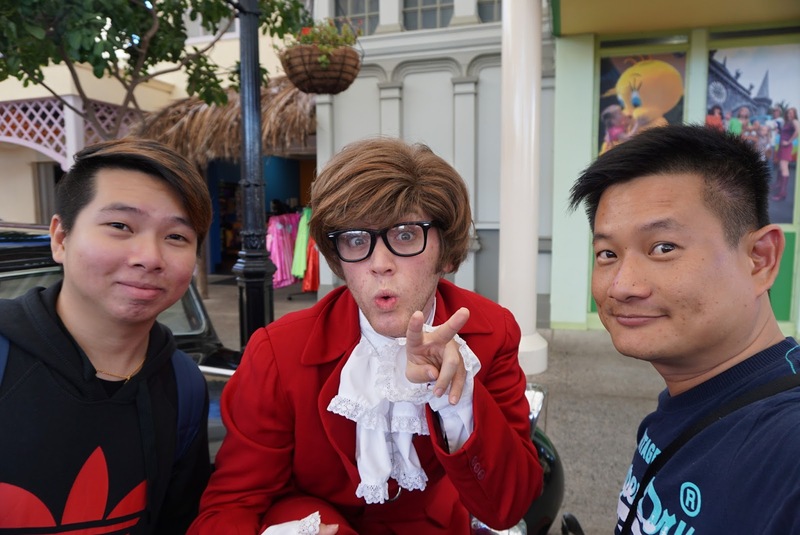 We headed further into the theme park and took the Scooby Doo roller coaster ride. The indoor ride was rather mild compared the two rides we had been on. 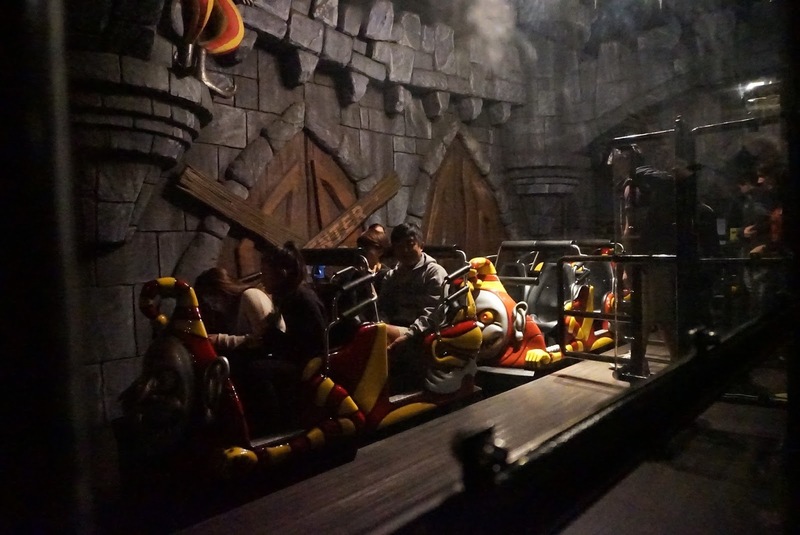 The initial stretch on the Scooby Doo ride was rather mild. 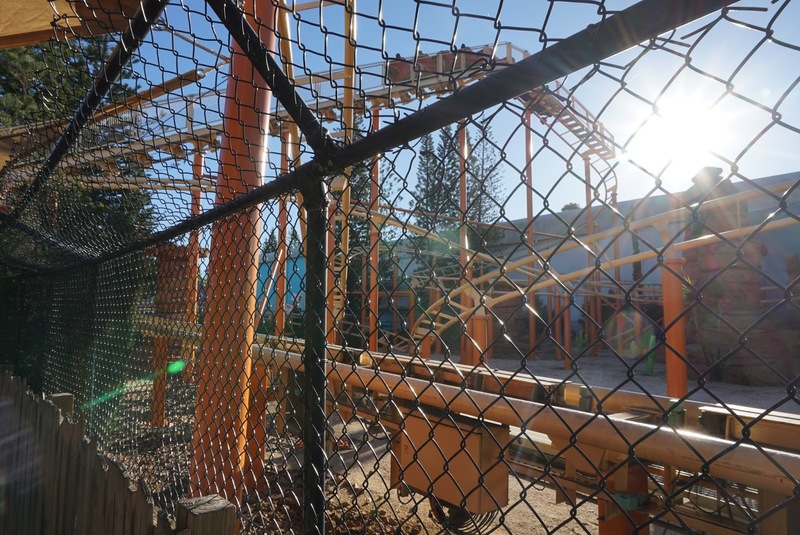 The fun starts when the coaster car was lifted up to second storey, where the car started a backward move before stopping and turned around to face the rest of the track. 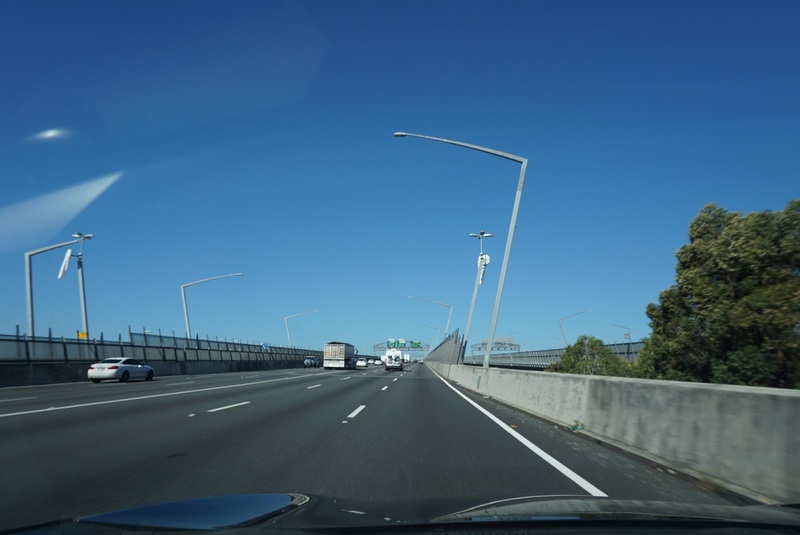 The car moved downwards via a series of sharp turns, swaying us sideways as the car move downwards towards the ground level. 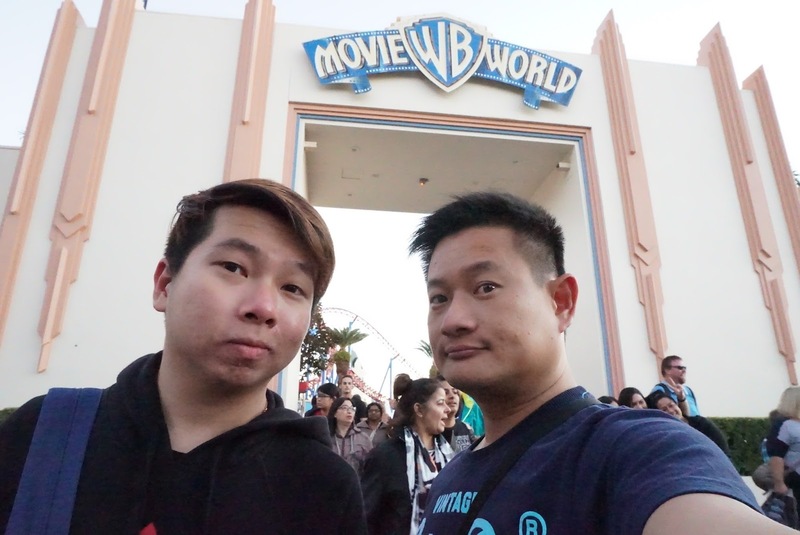 After the ride, my friend and I explored the other parts of Warner Brother’s Movie World. 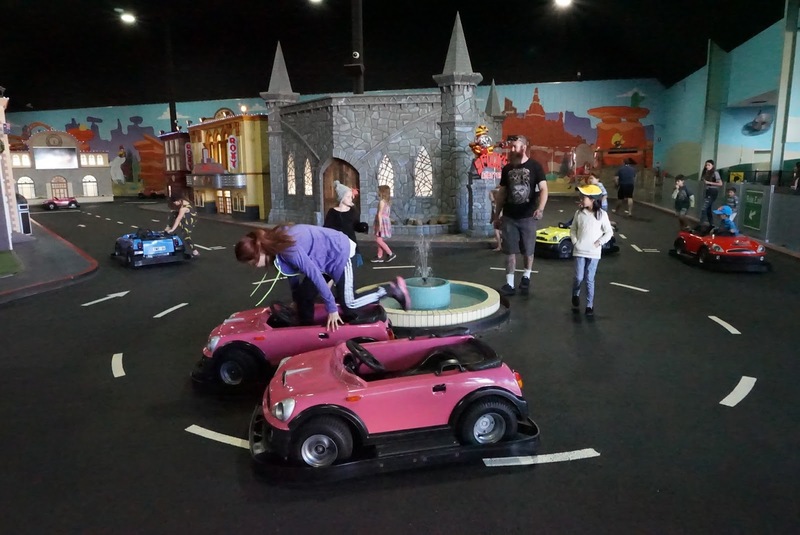 We even went on the kiddy Road Running roller coaster ride just for the fun of it. Looking at the time, we have spent almost 3 hours in the theme park doing some of the rides over and over again. 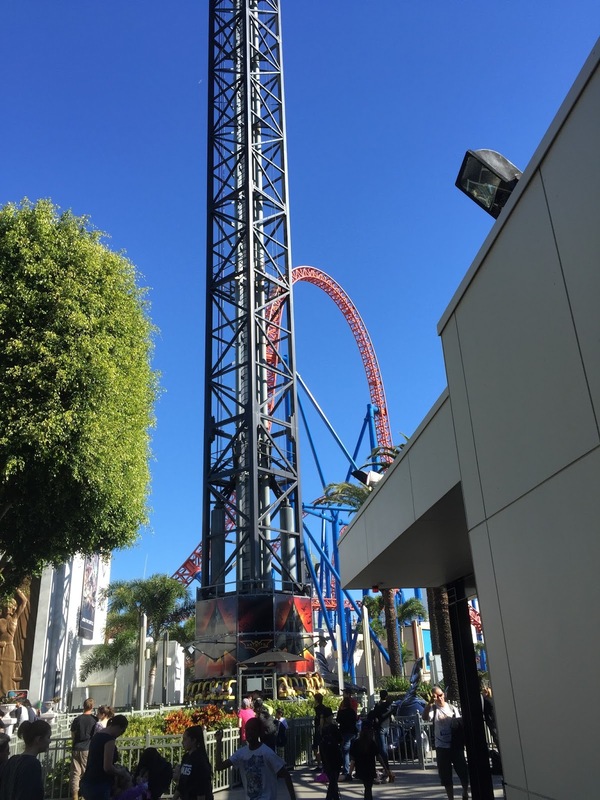 1 hour to its closing time, my friend and I headed for the Superman Escape Ride. 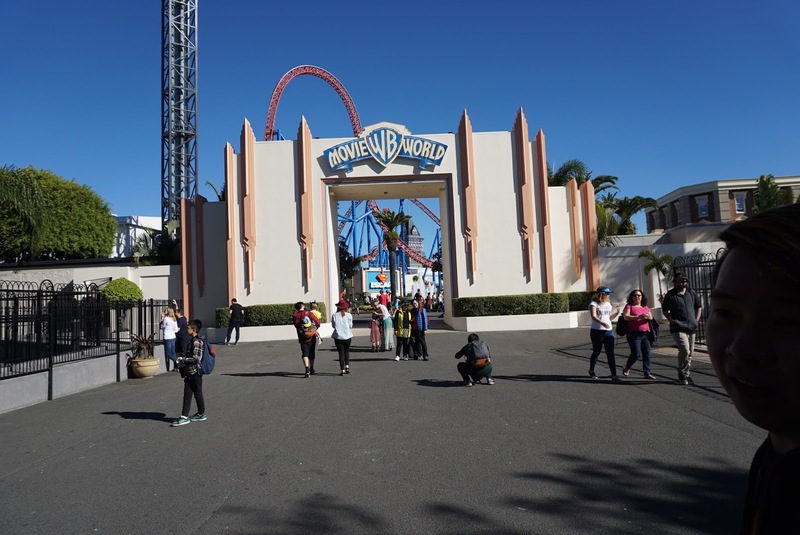 One can visibly see the red tracked ride with yellow roller coaster vehicle from the entrance of Warner Brother’s Movie World. 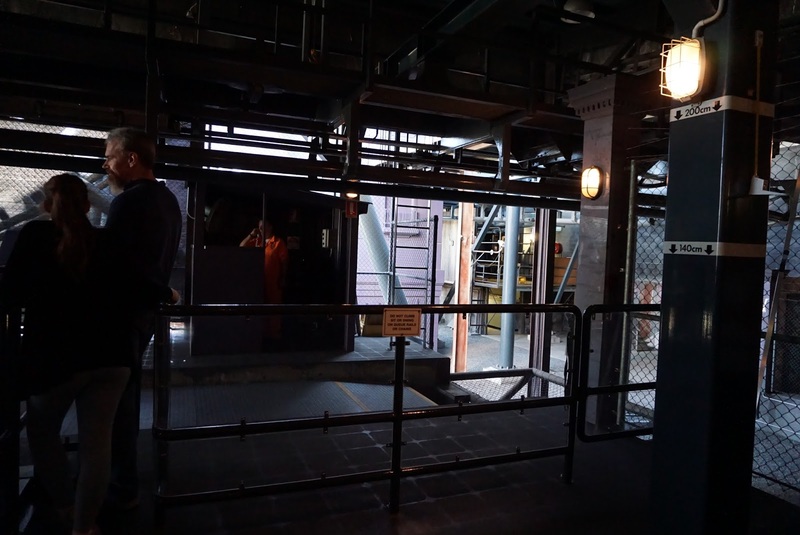 After the ride leaves the boarding area, it makes it way through an indoor area, simulated to be the tunnel of a subway. At the end of the tunnel, the roller coast paused momentarily before shooting the roller coaster up a the track at a very fast speed. 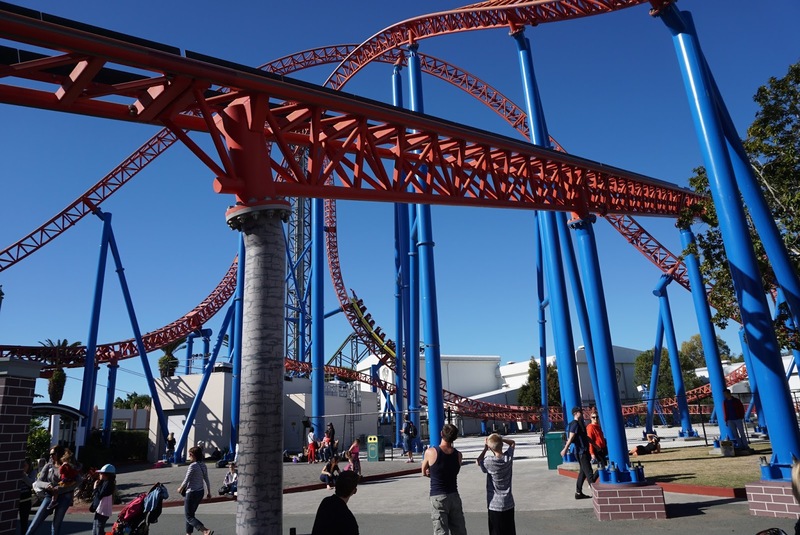 At the top of the track, the roller coaster turns and falls towards the ground at a near 90 deg angle. 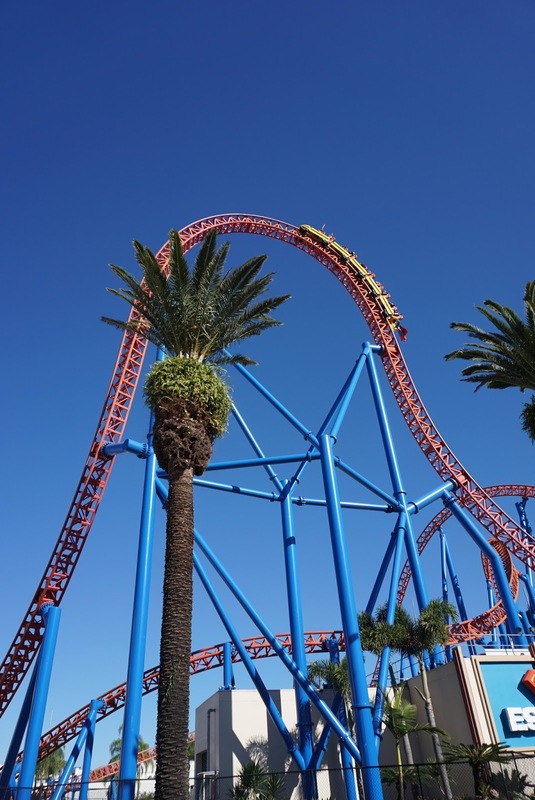 After the plunge, the roller coaster continued its momentum up a shorter slope and plunging at around 70 deg. The whole ride takes around 30 sec. 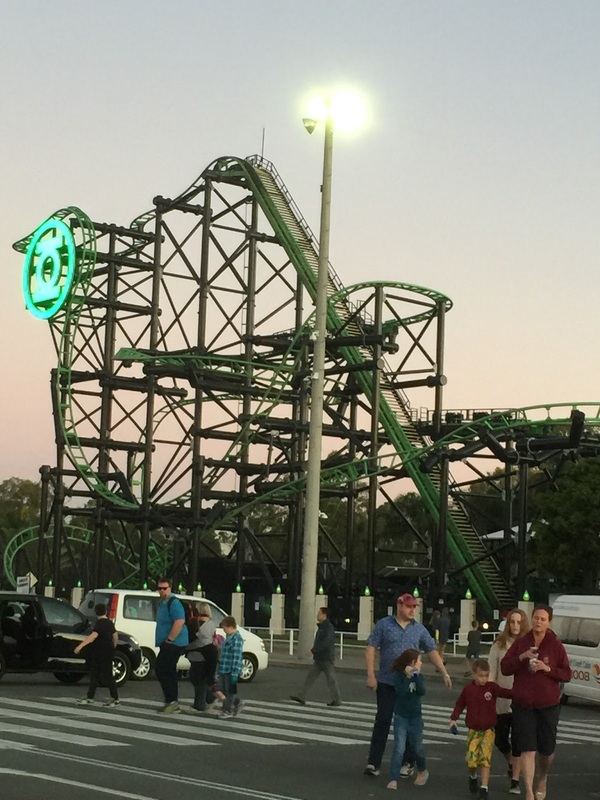 There isn’t much of tossing around nor is there any 360 corkscrew turns on this coaster, its fun part is the initial 90 deg plunge onto the ground. We been on the ride several times, the best seat for this ride is the front row, where one can see directly the track during the initial plunge. 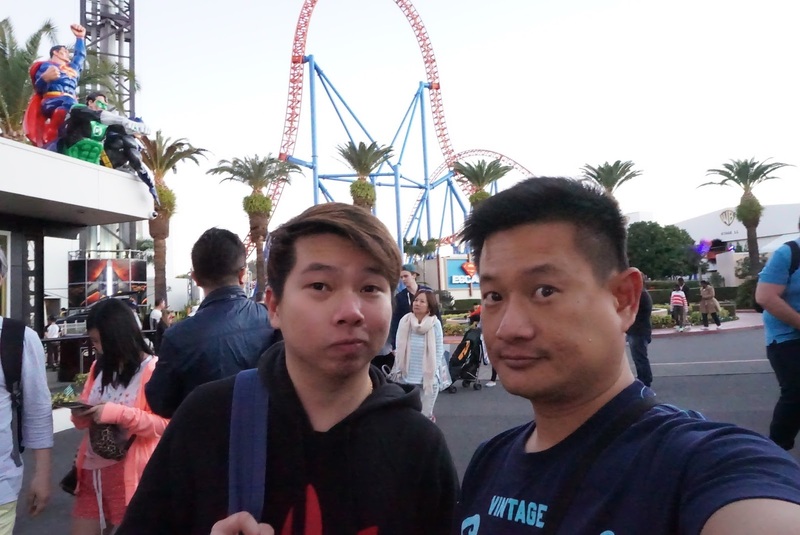 We went on the Superman Escape rider several more times before heading back to the apartment to rest for the night. 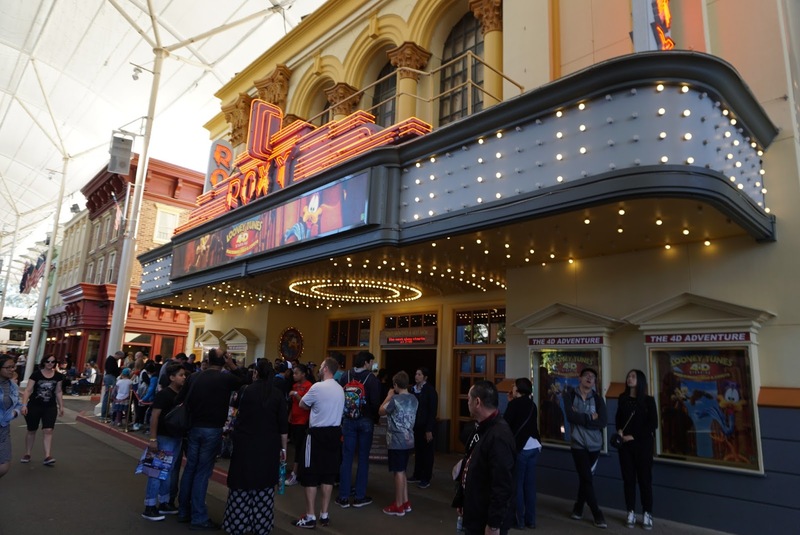 I thought Warner Brother’s Movie World can be done in half a day if one is not interested in the shows and just wanted to go on the rides. We started our day at around 9 am today. 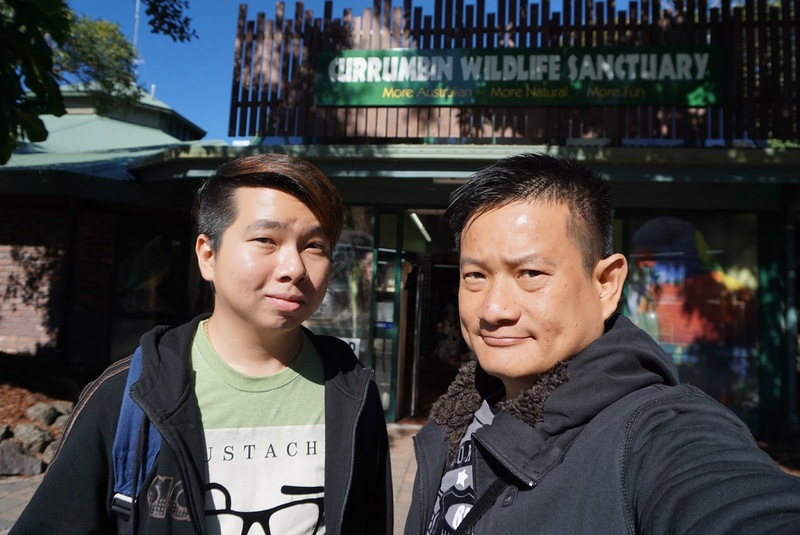 Our plan for today is to visit the Currumbin Wildlife Sanctuary as my friend and I had booked for the Koala Experience in the wildlife Sanctuary prior to arrival in Australia. 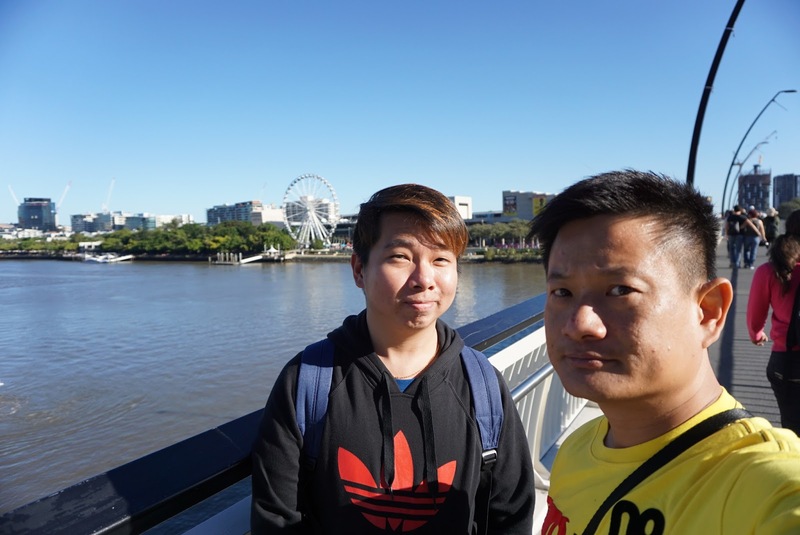 The Koala Experience tour is scheduled at 3.15 pm, hence we thought it might be too early for us to head to the Wildlife Sanctuary in the morning. 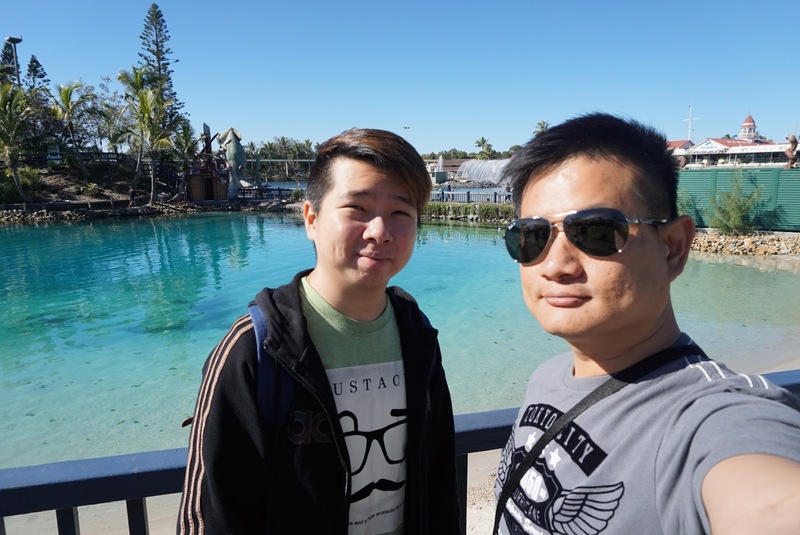 As we have also purchased annual 4-in-1 theme park pass with unlimited access from Groupon Australia (the annual pass on Groupon sells for A$89.99, while a day pass for each theme park sells for A$89 at the theme park entrance), we wanted to head to the nearby Sea World to exchange for the pass so that we would be able to access Movie World without waiting in queue for pass exchange when we visit in a few day’s time. The drive from our apartment to Sea World took about 20 mins. After parking our car, we were directed to a queue by the staff at the entrance for pass exchange. 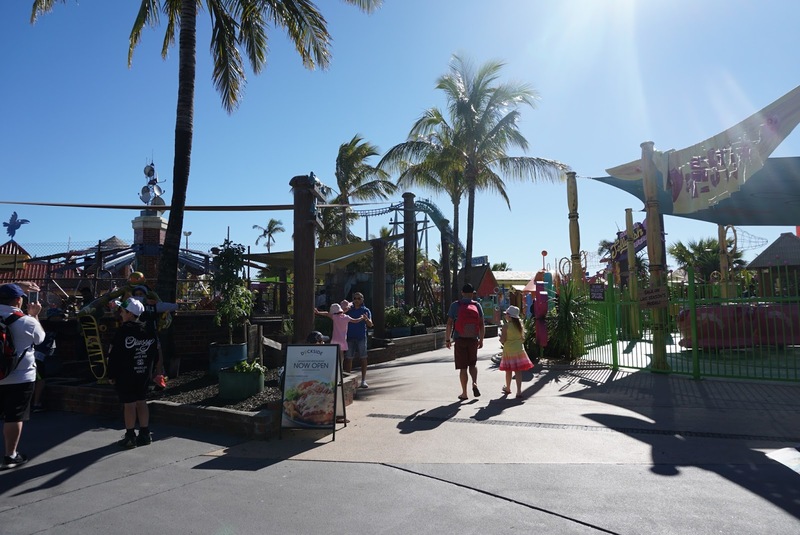 After waiting for about 30 mins for our turn for the pass exchange, we were told by the staff at Sea World that the system was down and they were not able to make the pass for us on the spot. 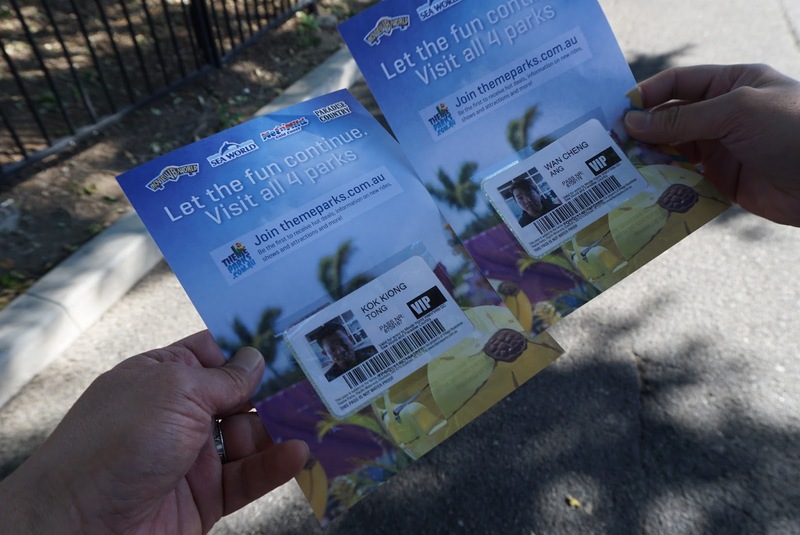 However the staff allowed us entry to Sea World with our Groupon printout. 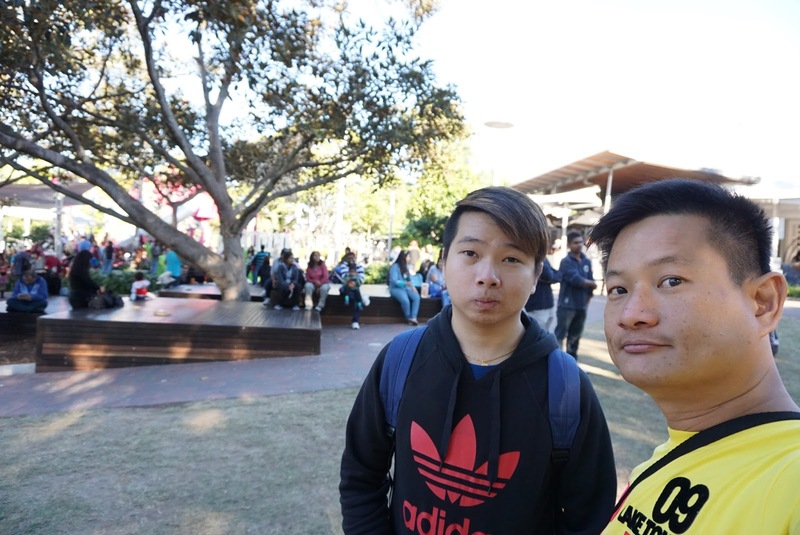 I turned to my friend and told him that since we are already here, might as well take a look around the theme park before heading over to Currumbin Wildlife Sanctuary. 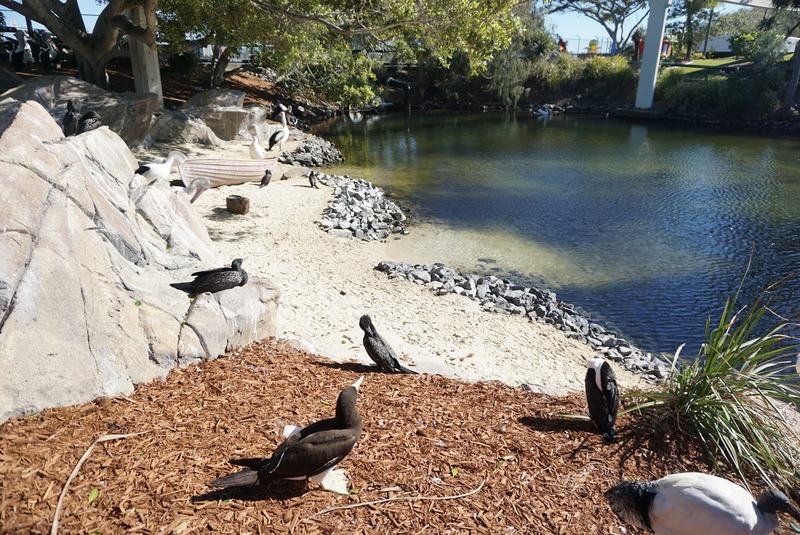 In our original plan, we did not plan to visit Sea World. I had been to this theme park some 10 years ago and found the rides to be boring. 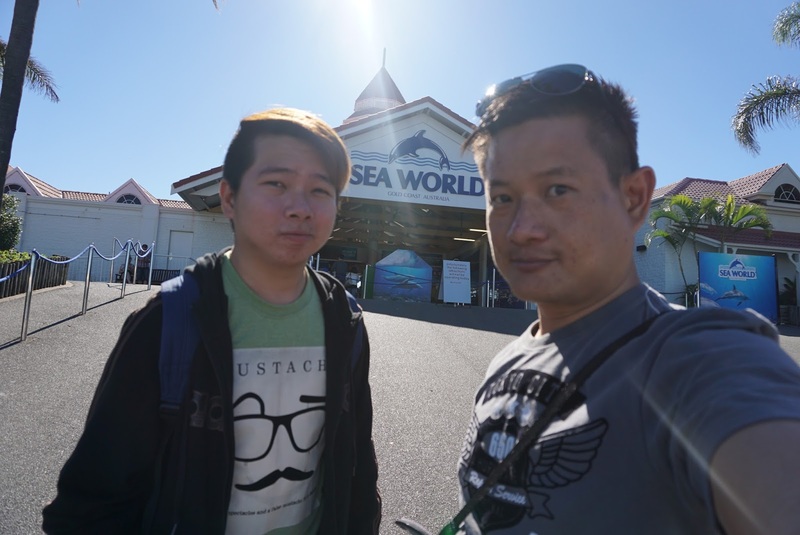 Since we are already here, we took the morning to walk around Sea World. 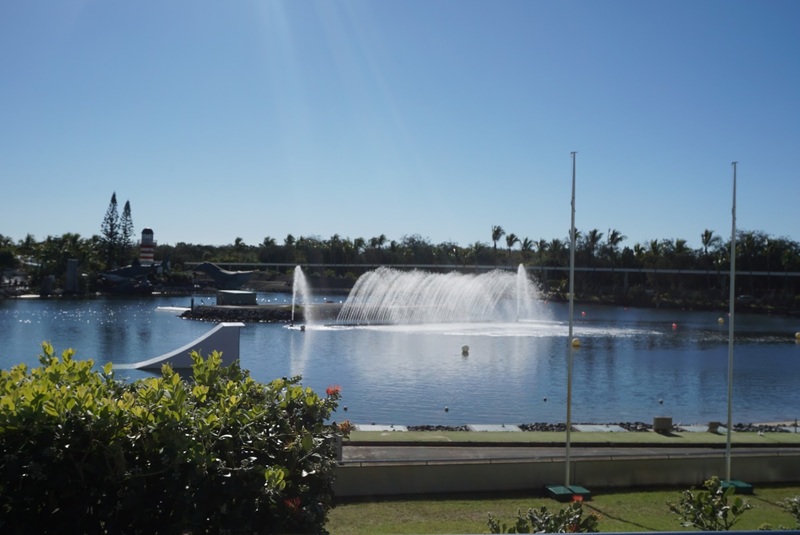 At the entrance, we saw a huge man made lagoon. 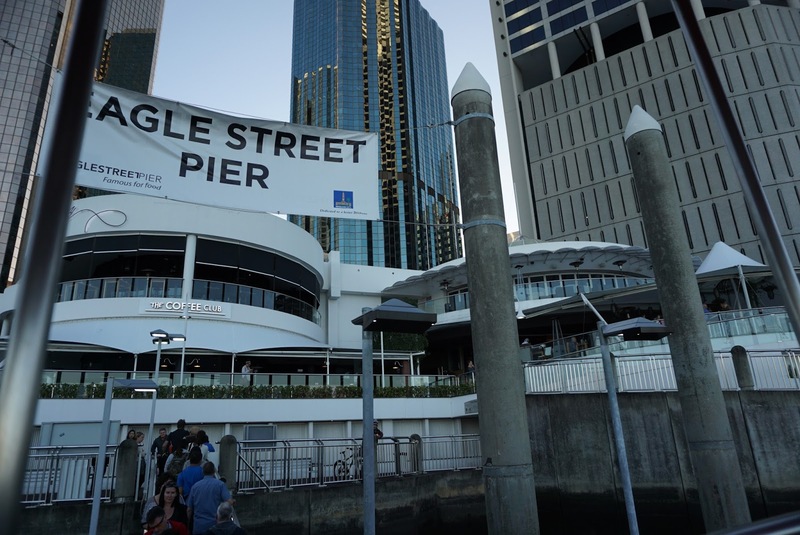 I told my friend this is where the Jet Ski stunt shows are being performed daily. Since we were not in time for any shows, we headed further into the park. 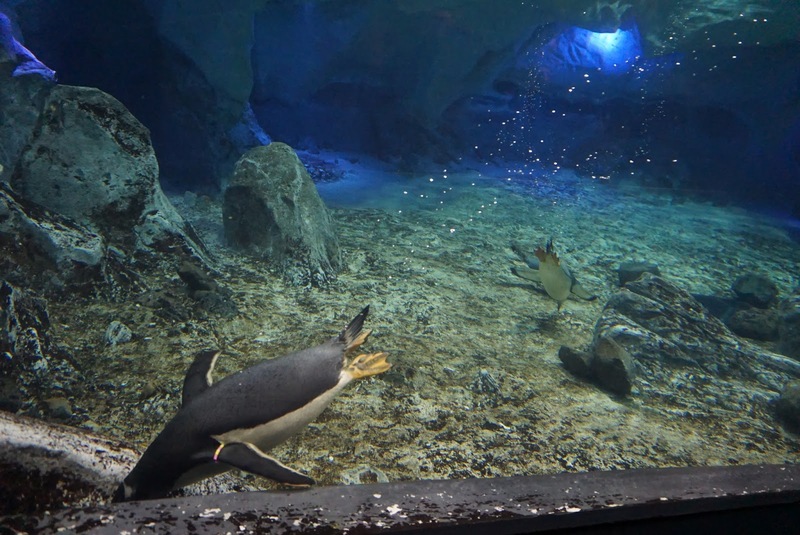 Our next stop was the Penguin Encounter, which was housed in a small building next to the main entrance of the park. 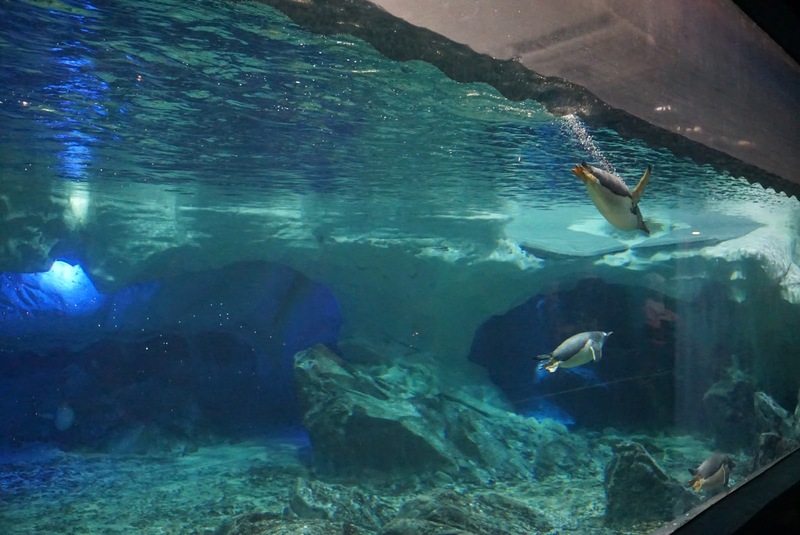 As we walked into the building, we were greeted by a large tank where we could some some penguins swimming inside it. 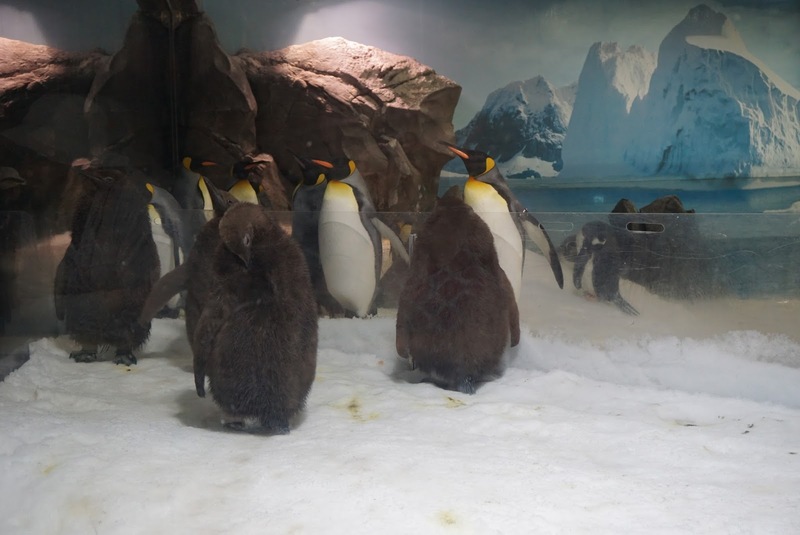 The decor inside the tank was rather minimal with a lot of artificial rocks, my guess is to mimic the natural habitat for the penguins. 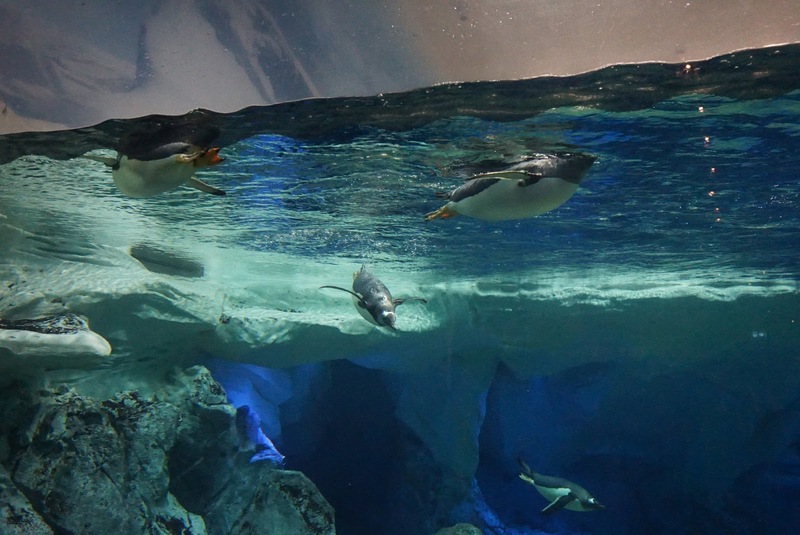 There are however a lot of space for the penguins to swim in. 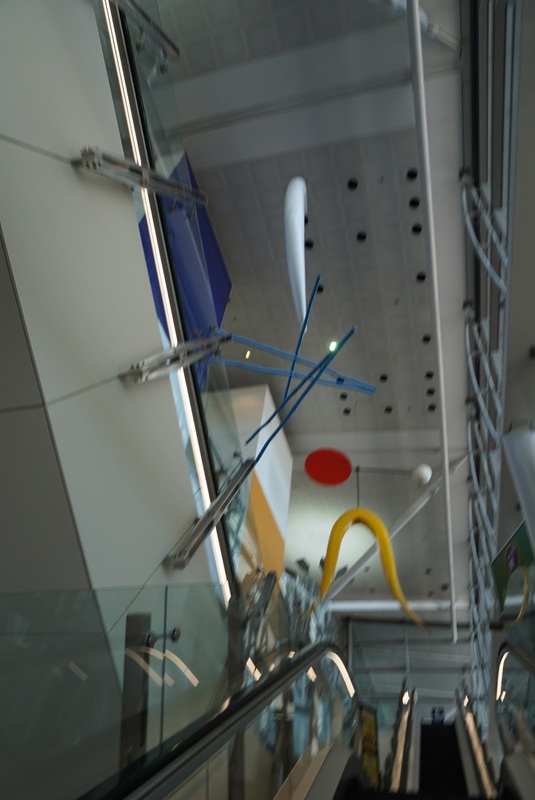 After taking some pictures, we headed up a ramp to the second level of the building. 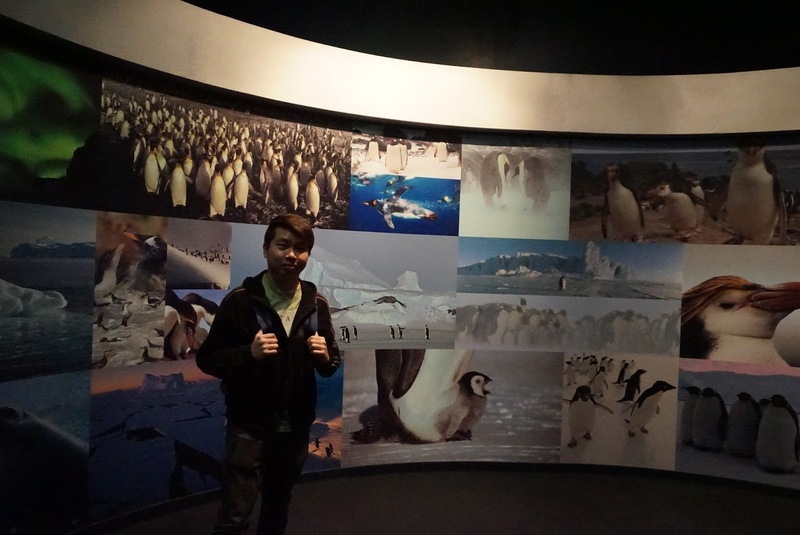 This is where we saw the surface of the water in the tank and a lot more penguins (mainly Emperor Penguins) resting on dry land. 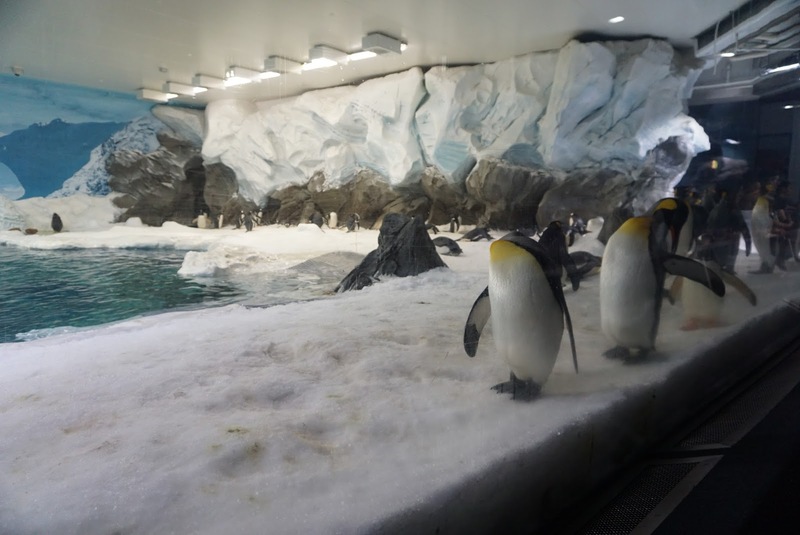 There is also a small section being cordoned off from the main habitat where a number of brown-furred King Penguin chicks are housed. 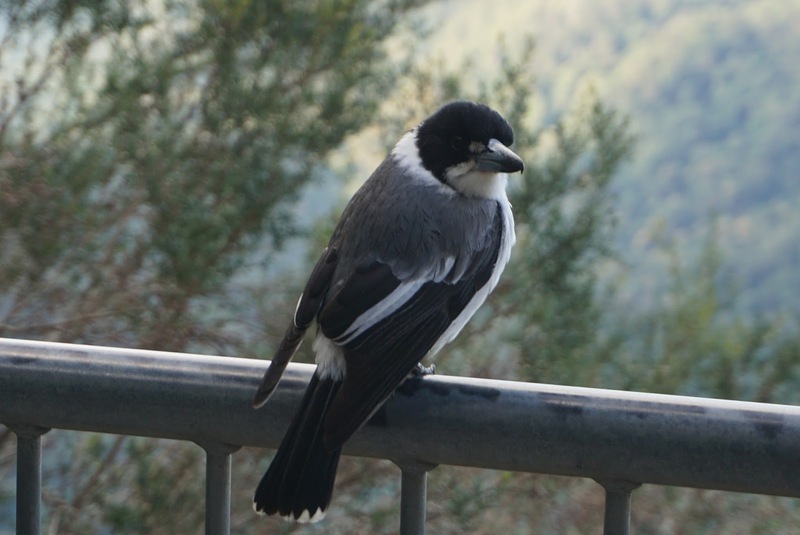 After taking more pictures of the cute looking birds, we headed out of the building. 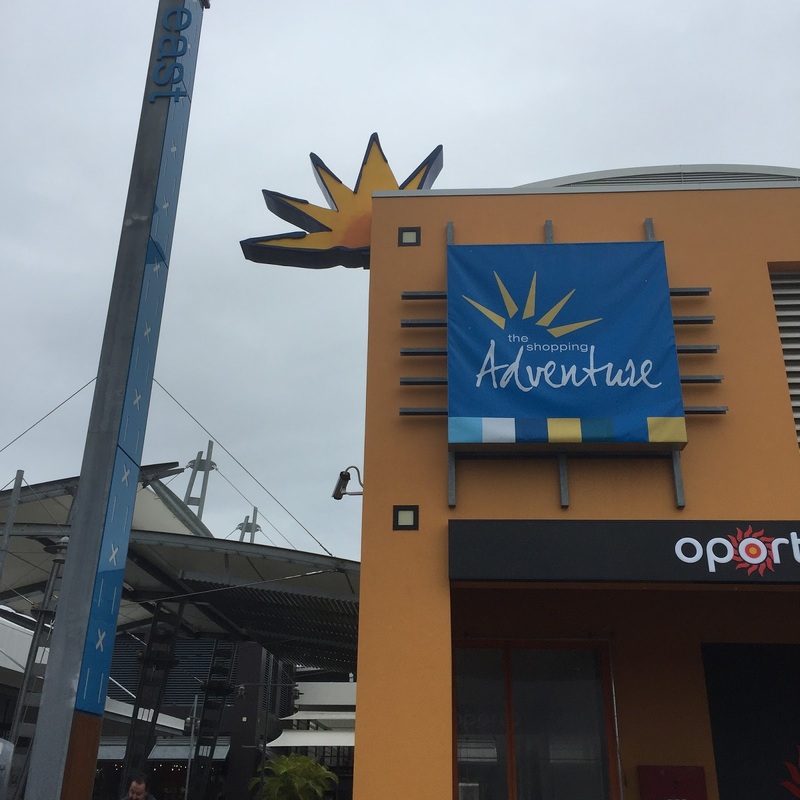 As we were walking deeper into Sea World, we came across another building, next to the Penguin Encounter that has “Deep Sea Encounters” written on the building. We would have thought this building might be an aquarium where deep sea creatures are being housed. 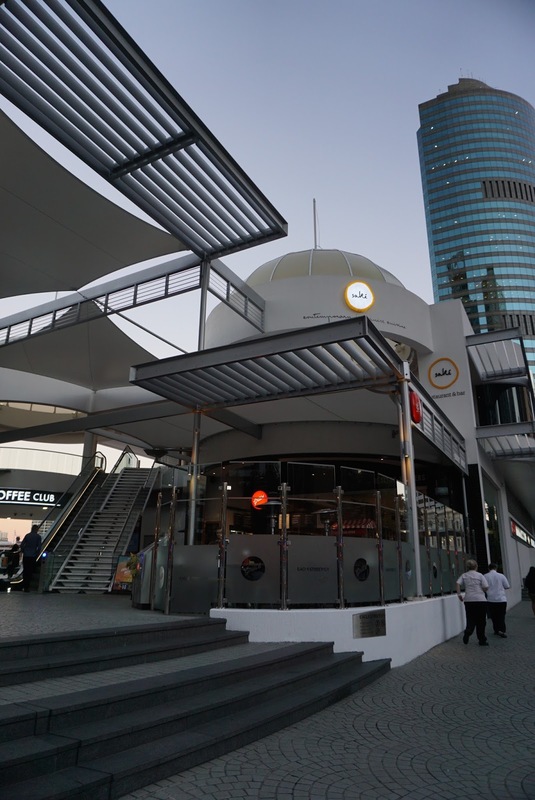 This thought has gotten us excited and we hasten to enter the building. 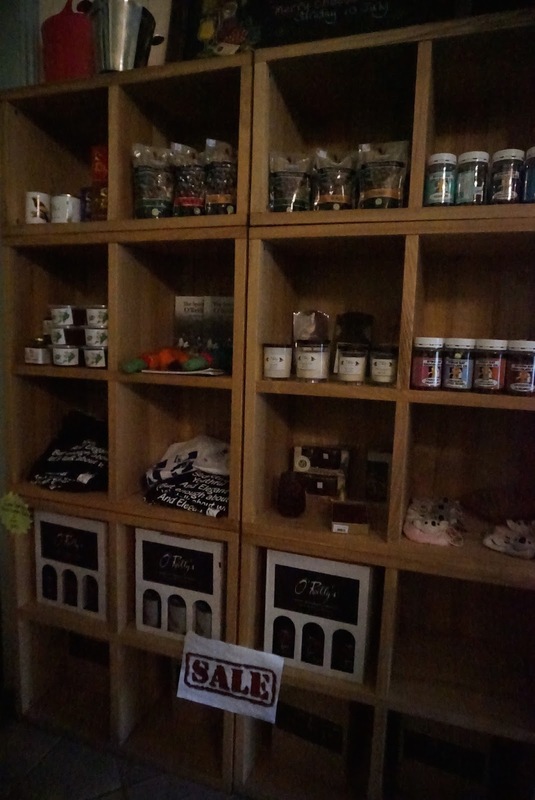 After passing a gift shop, we were quickly horrified by what we saw. 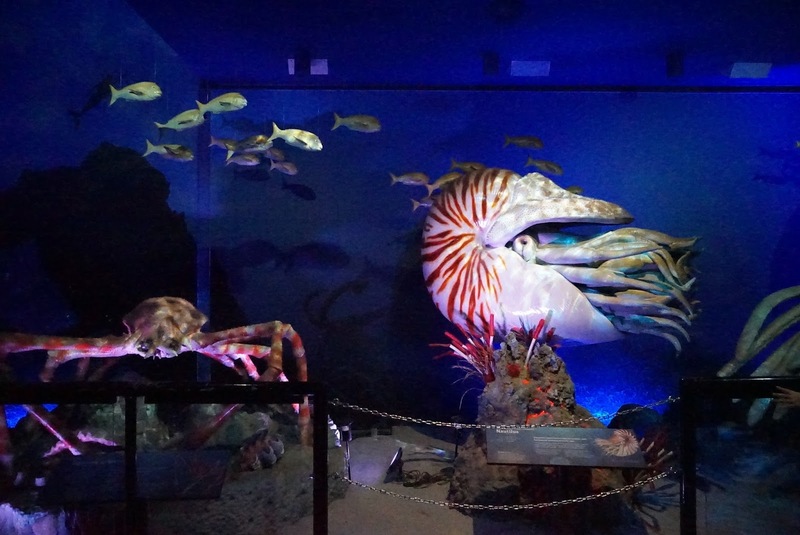 The so-called deep sea encounters is a building full of plastic, enlarged creatures of the deep. 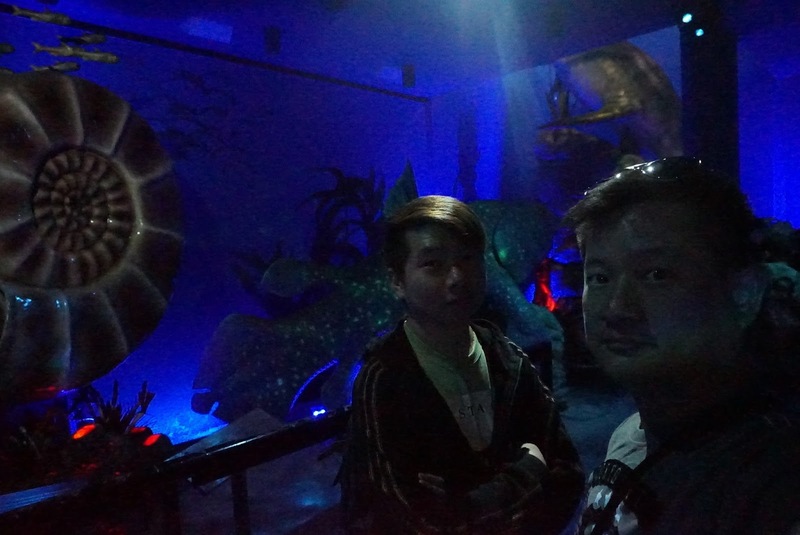 There is no aquarium as what we had expected. We found a scale seated in one corner of the building that says “your weight equivalent to a deep sea creature”. 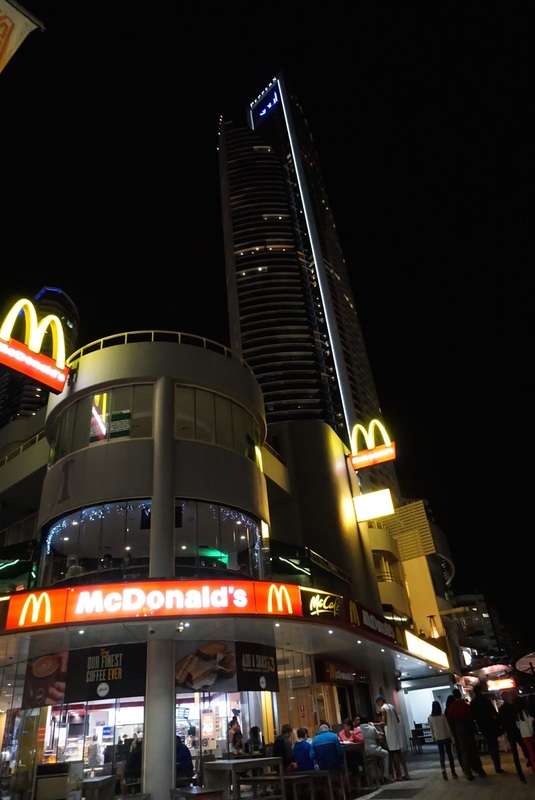 We felt so cheated with this building and quickly exited. 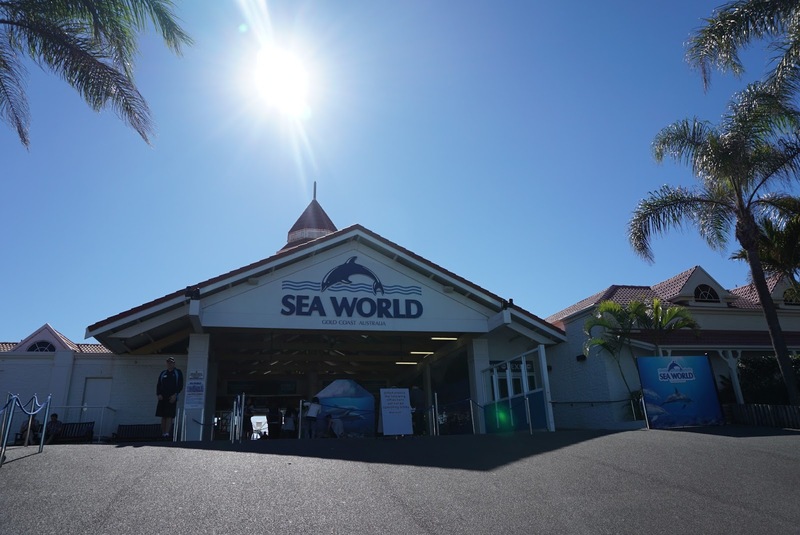 My friend and I were still “disgusted” by the “Deep Sea Encounters” when we were walking towards our next stop in Sea World. 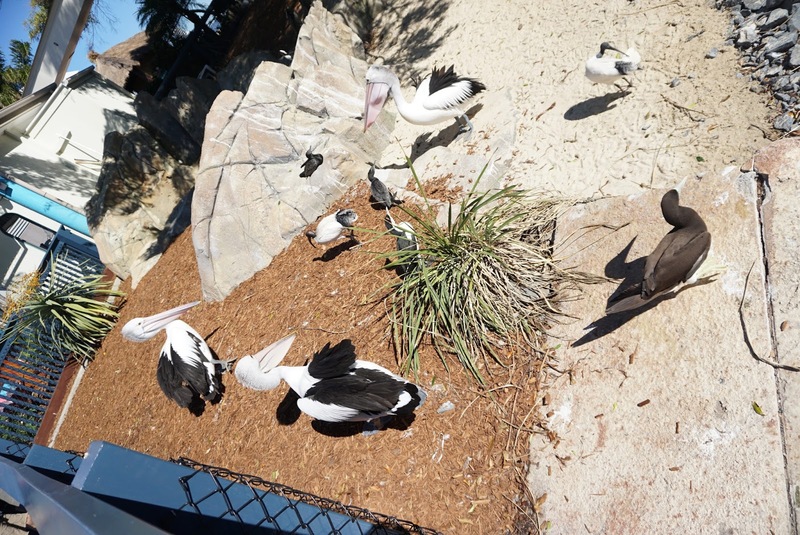 As we walked further in to the park, we came across a bridge with an enclosure for pelicans as well as another enclosure that served as a nursery for dolphins. 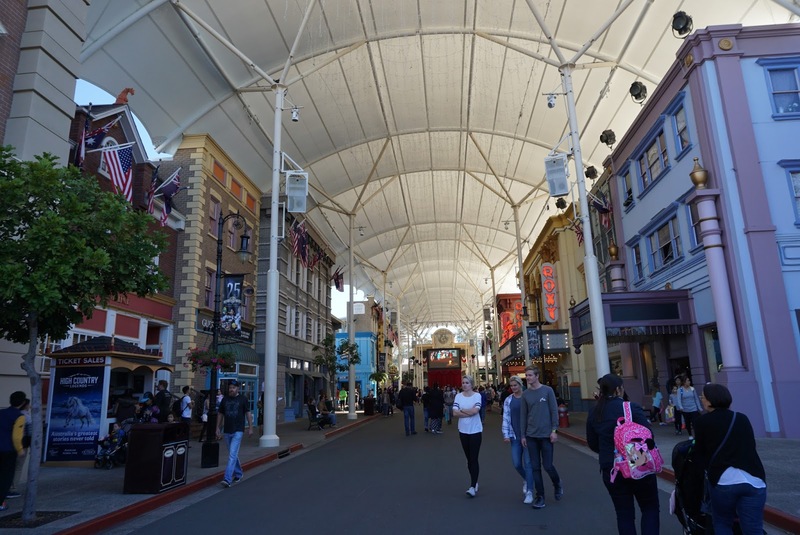 As we were walking, we ended up with the rides area. Most of the rides (for adults) had some water theme in it. 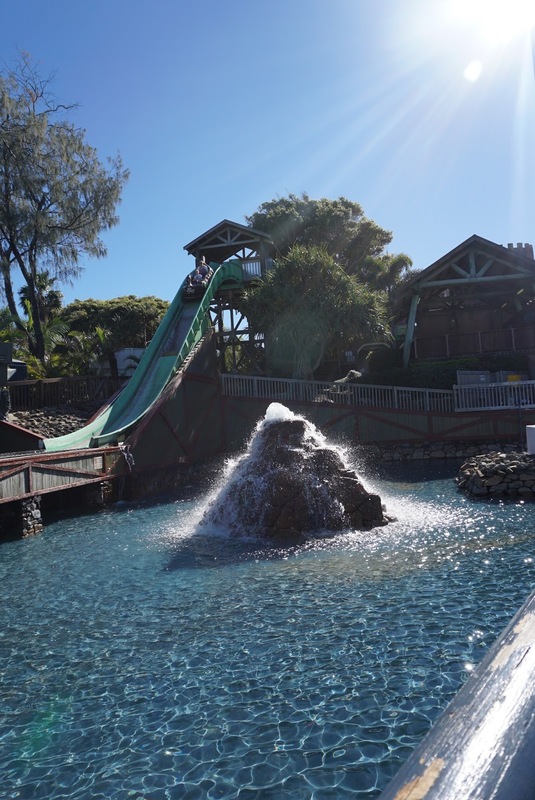 We saw a ride, Viking Revenge Flume, that has the ride plunging 13m down a slide that might get us wet. As we did not want to get wet in a cold winter morning, we decided to skip that ride and went onto the Storm Coaster Ride. From the outdoor portion of the ride, this ride seem like a dry ride. 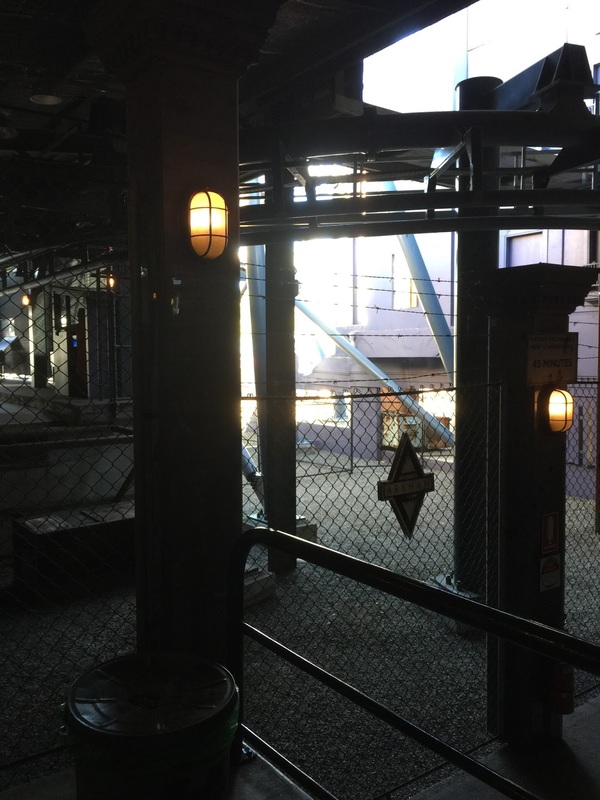 As we entered the indoor queuing area of the ride, we saw a portion of the coaster track being submerged in water. 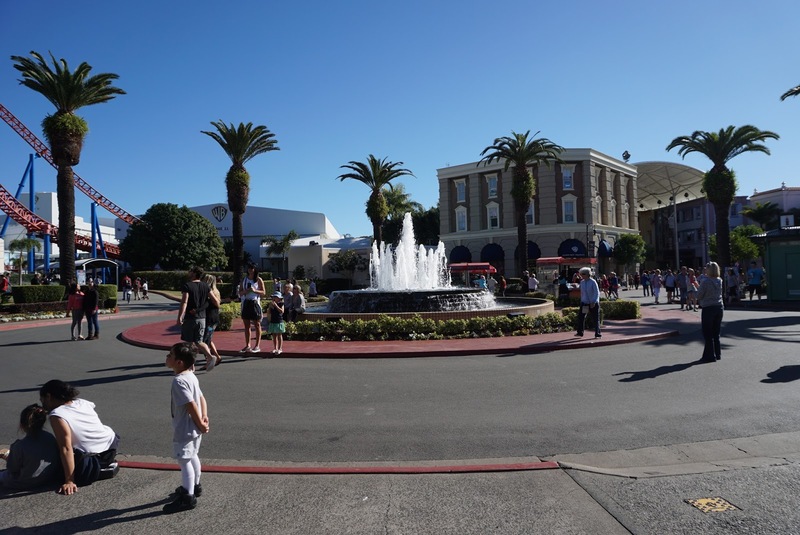 I thought this would probably be the only segment of the ride that we would see water. 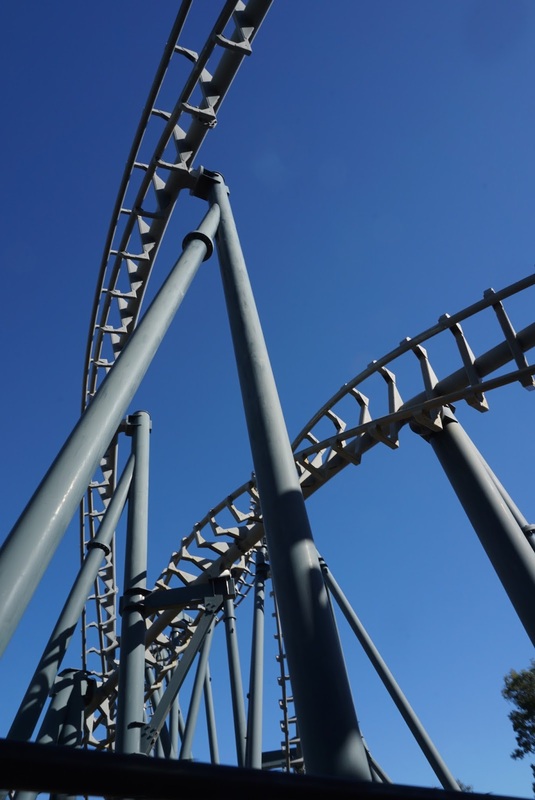 I consider the Storm Coaster to be a rather mild ride as there wasn’t any 360 deg turns nor any sharp plunge. 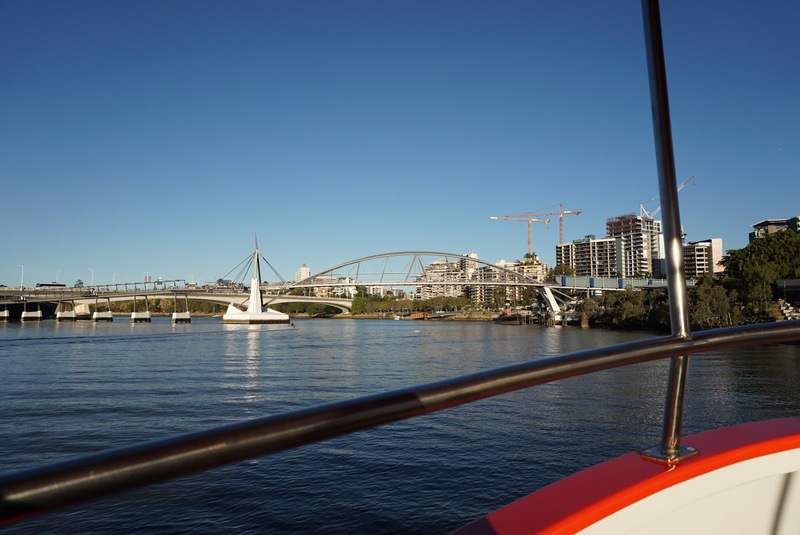 We were taken by surprise towards the end of the ride, when the coaster was plunging about 20m in a not so steep diving. We ended in the indoor area of the track where we were plunged into a pool of water. So much for not wanting to get ourselves wet. 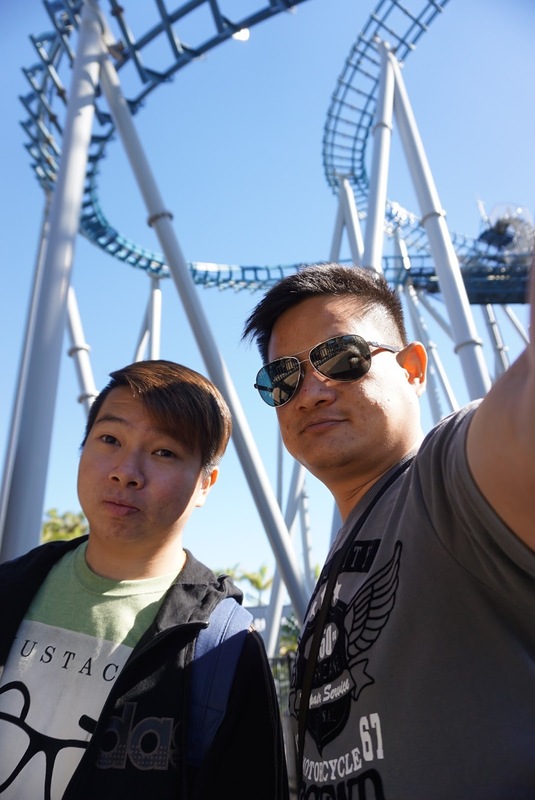 After the wet 45 sec Storm Coaster ride, my friend and I headed towards the other roller coaster ride – Jet Rescue. 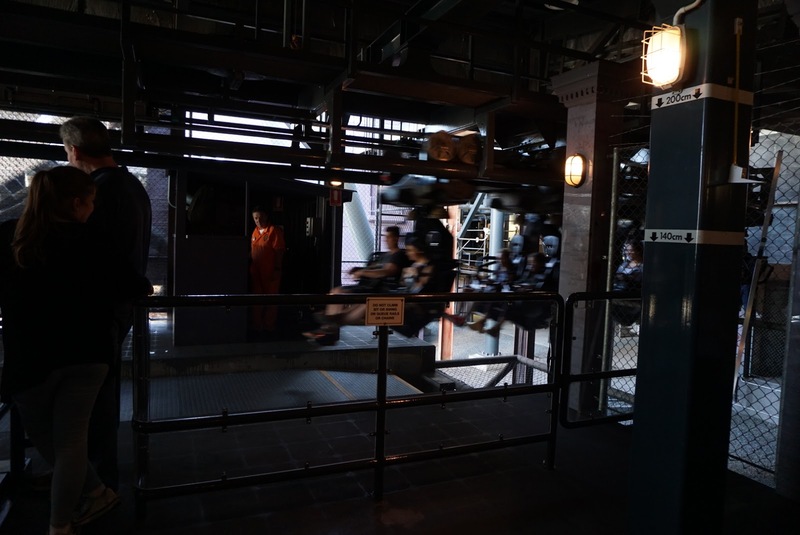 After queuing for around 10 mins, when it was our turn to board the ride, we were told that the ride will be closed for maintenance for around 30 mins. 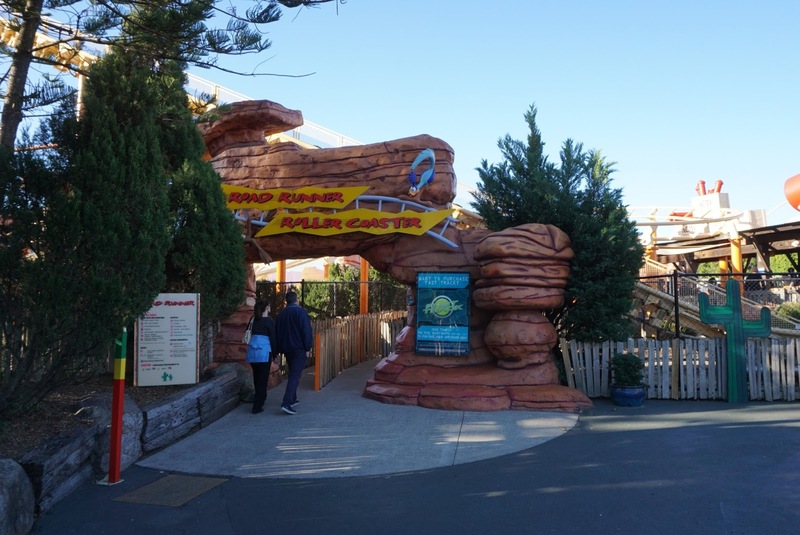 As we did not want to waste too much time waiting for the ride, we decided to move off to other parts of the park. We headed towards the polar bear sanctuary, feeling excited to see some polar bears in action. 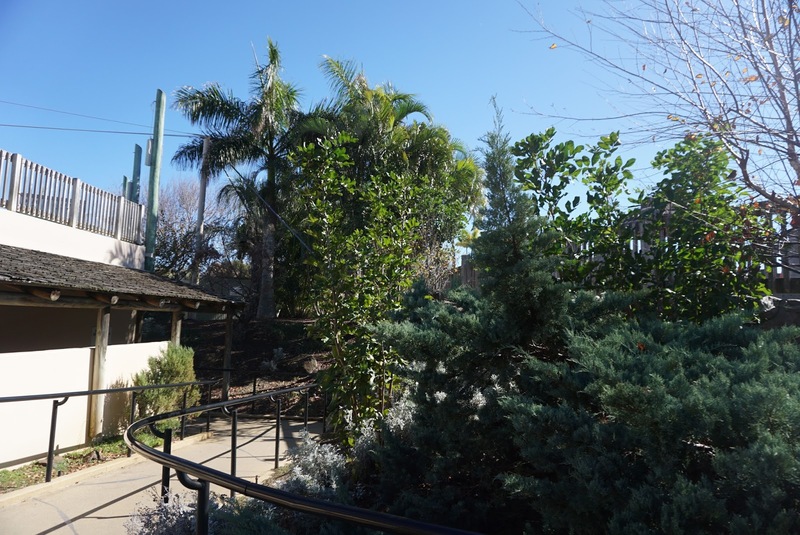 The polar bears are housed in an enclosure with a building for visitors to see the bears. 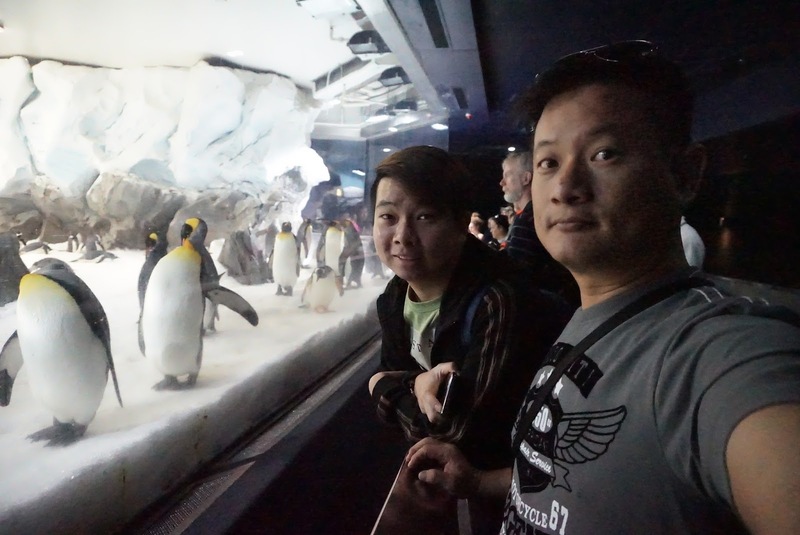 When we were walking in the building, we saw an empty enclosure, thinking that the polar bears might be in another part of the enclosure, my friend and I continued to cover the entire building. 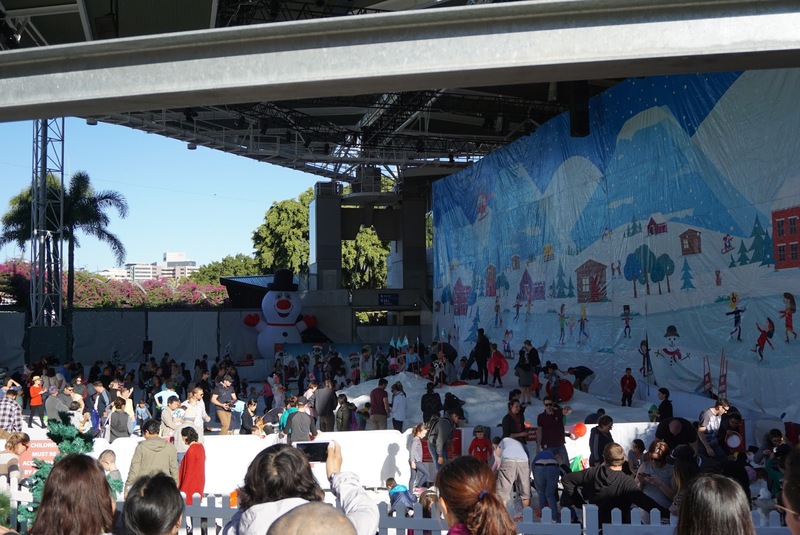 However all we saw was an empty enclosure with no polar bears. 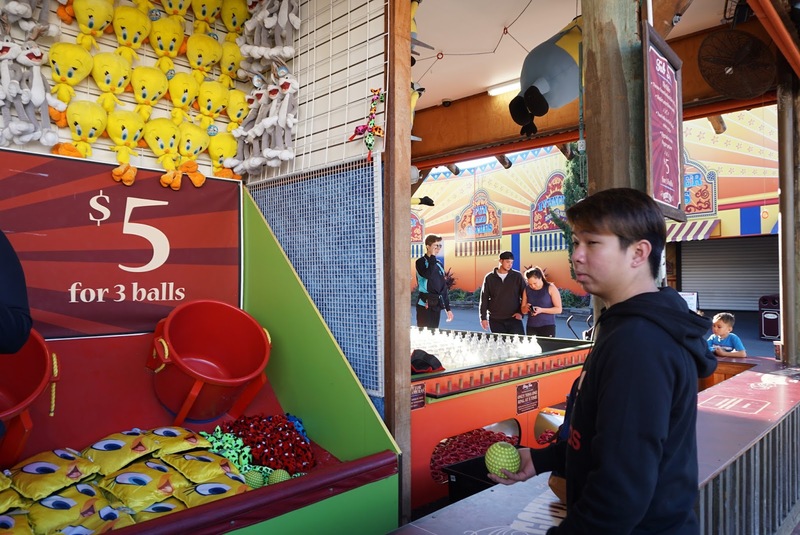 Feeling disappointed we decided to leave the theme park. 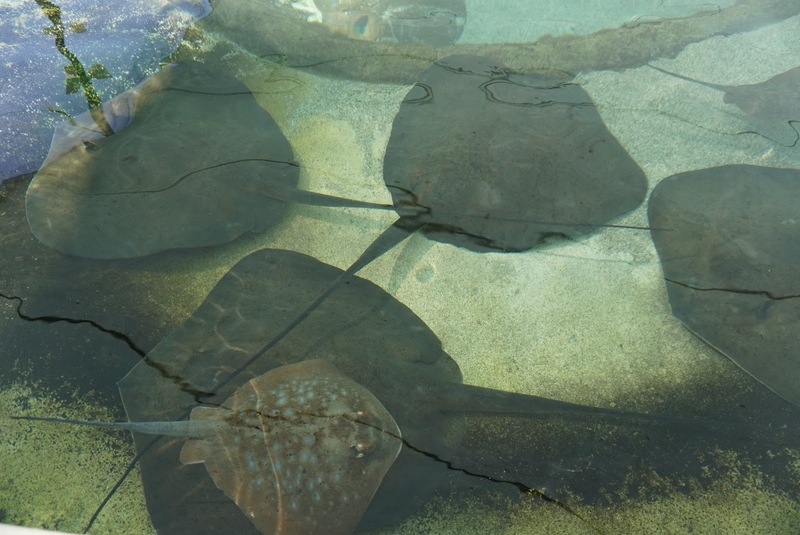 As we were walking towards the exit of the park, we passed by the Ray Reef, where visitors can buy some feeds to feed the sting rays. We did not spend too much time here as the park was rather disappointing, we headed for the exit and drove to our next destination. 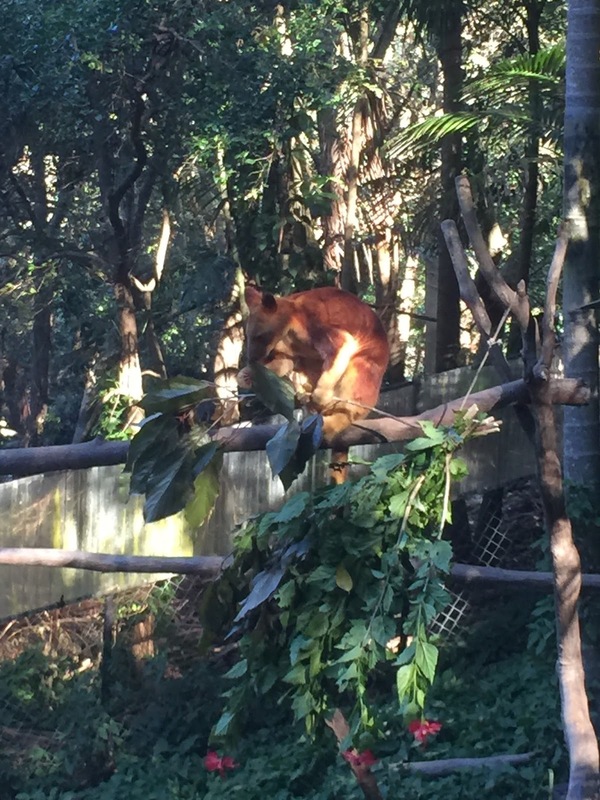 Currumbin Wildlife Sanctuary is a good 45 min drive from Sea World. 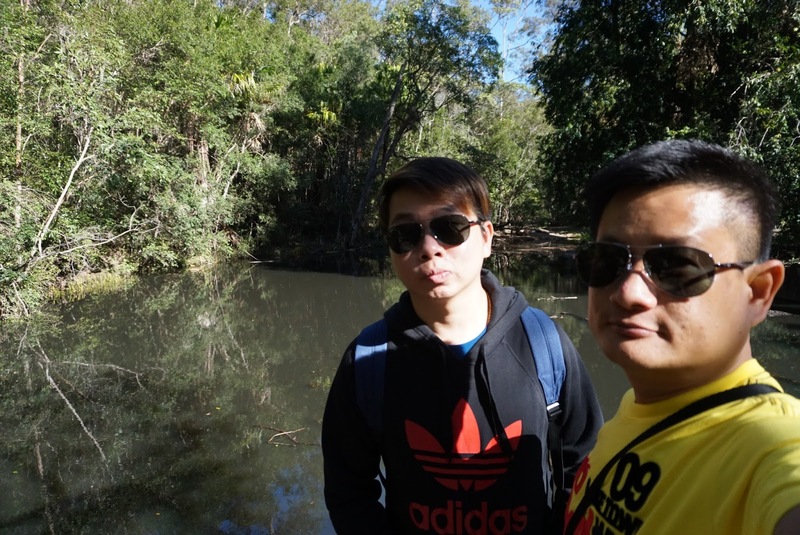 After parking our car, we headed to the inconspicuous entrance to Currumbin Wildlife Sanctuary. 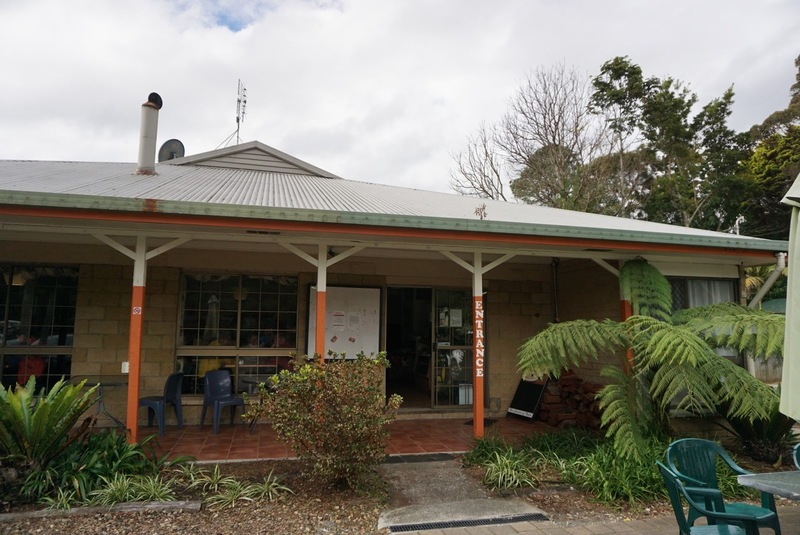 The entrance of the sanctuary looks like a shop and gave me the impression that this wildlife park would be small. Passing the gift shop, which is also the main entry and exit point to the sanctuary, the park opens up to a large area. 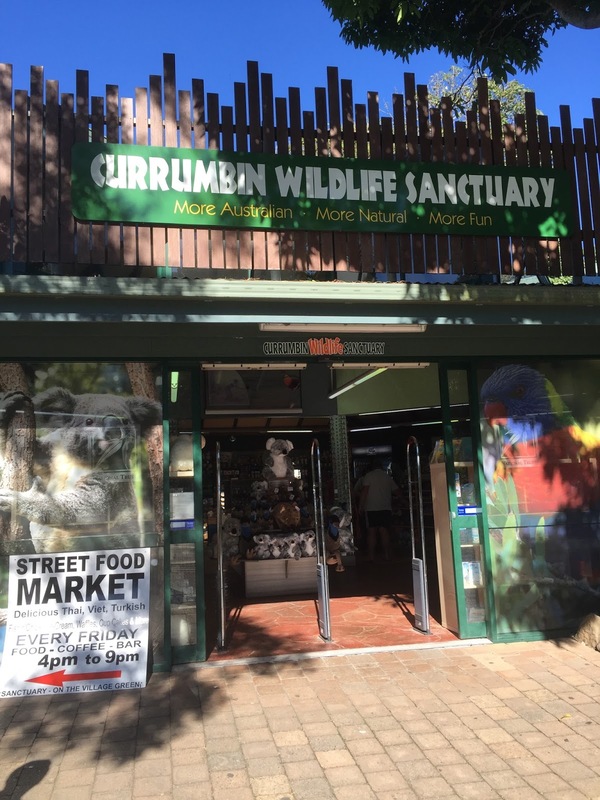 We headed to the customer service counter to get our Koala Experience tickets sorted out and headed into Currumbin Wildlife Sanctuary. 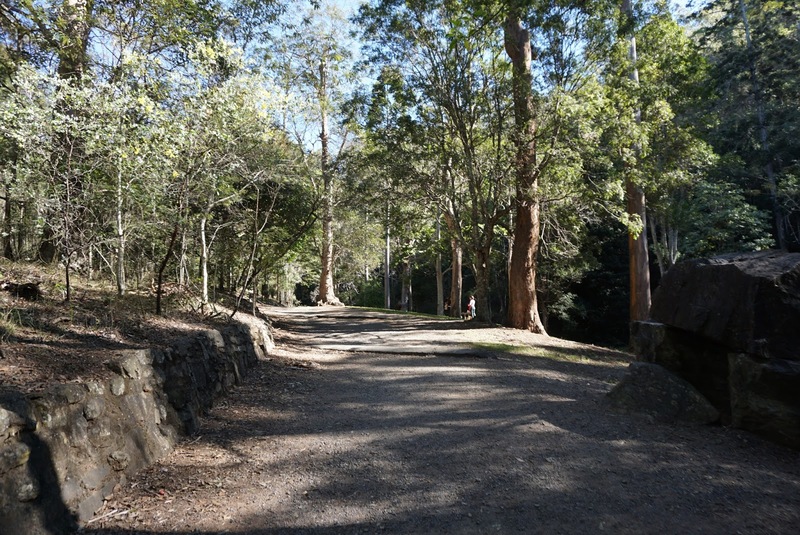 Passing the second entrance to the park, we saw a train track, that takes visitors around Currumbin Wildlife Sanctuary. 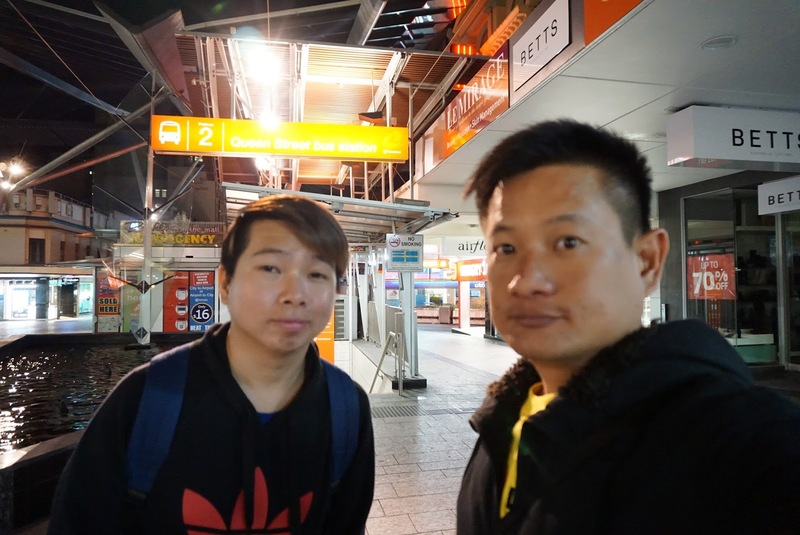 My friend suggested for us to take the train one round before disembarking. 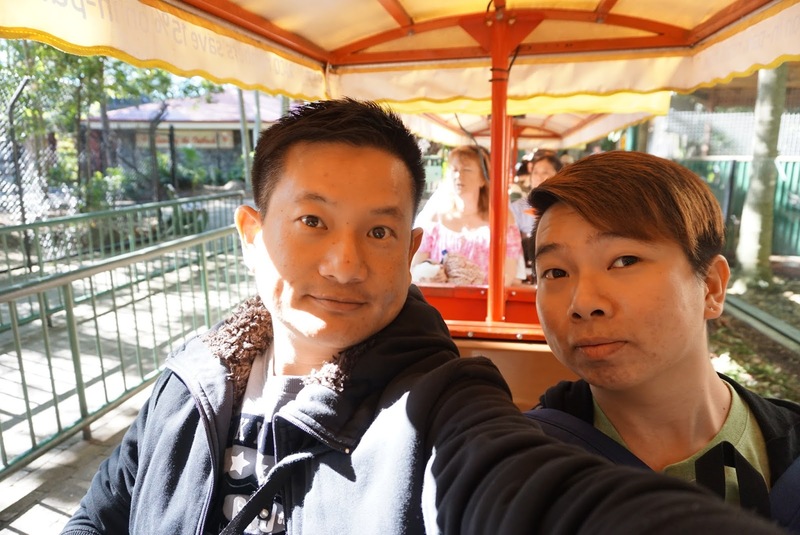 The train took us to different parts of the park, covering essentially most of the park. 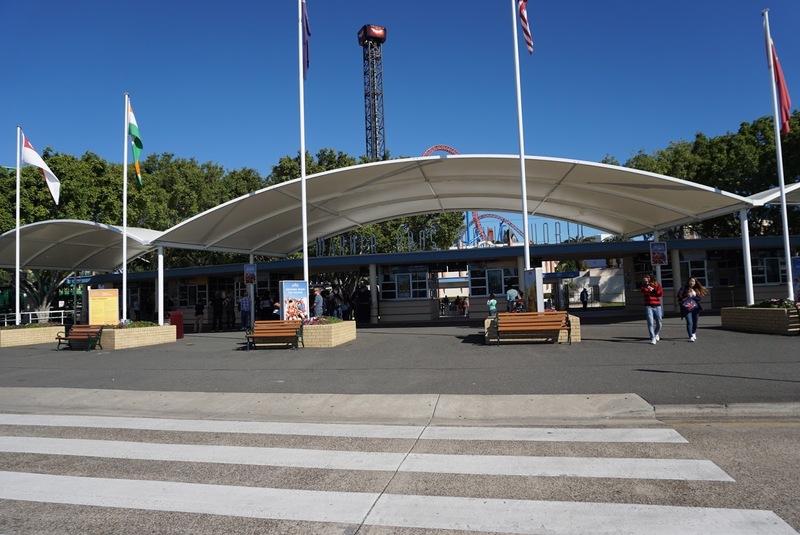 I would recommend visitors to take the train and decided where to drop off rather than walking around the park on foot. At the last stop prior to the stop at the entrance, the train took us to a large enclosure where we saw visitors pat and feed kangaroos. 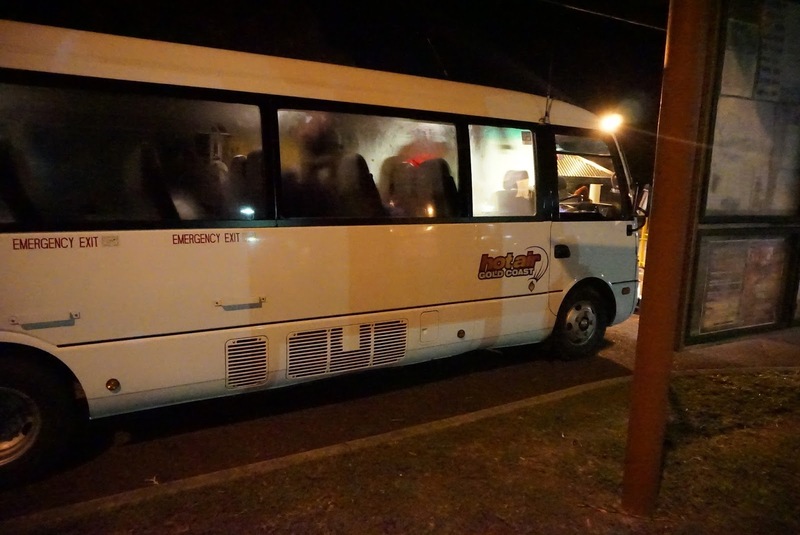 We alighted at this stop for some kangaroo encounter. 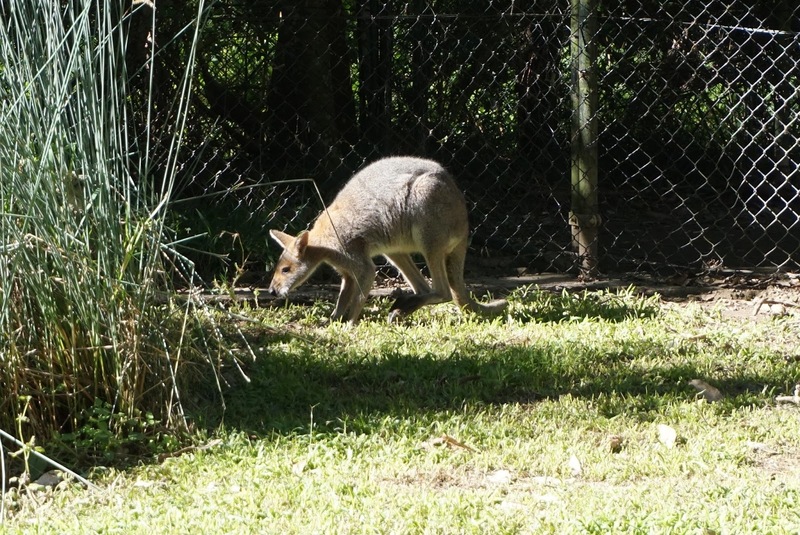 As we got off the train, we headed towards the wallaby encounter. 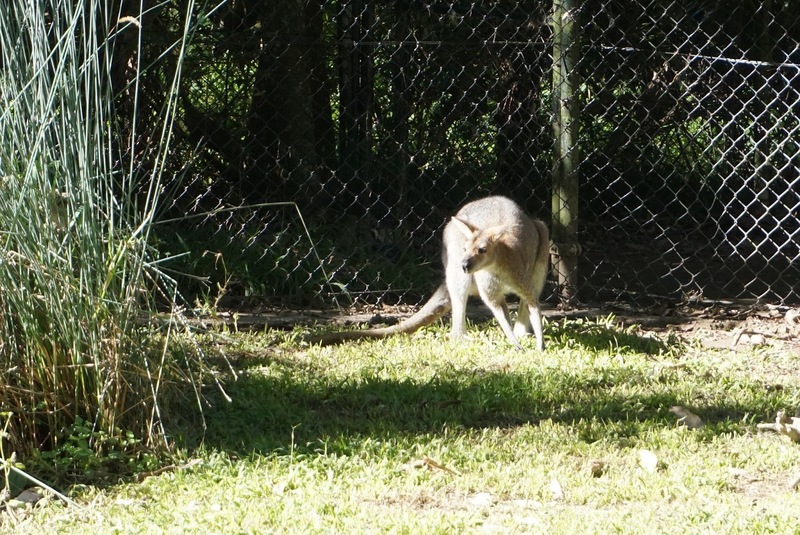 This small enclosure housed two wallabies, which were hiding themselves from the sight of visitors. Exiting this enclosure, we headed to where most of the visitors were, the kangoroo enclosure. 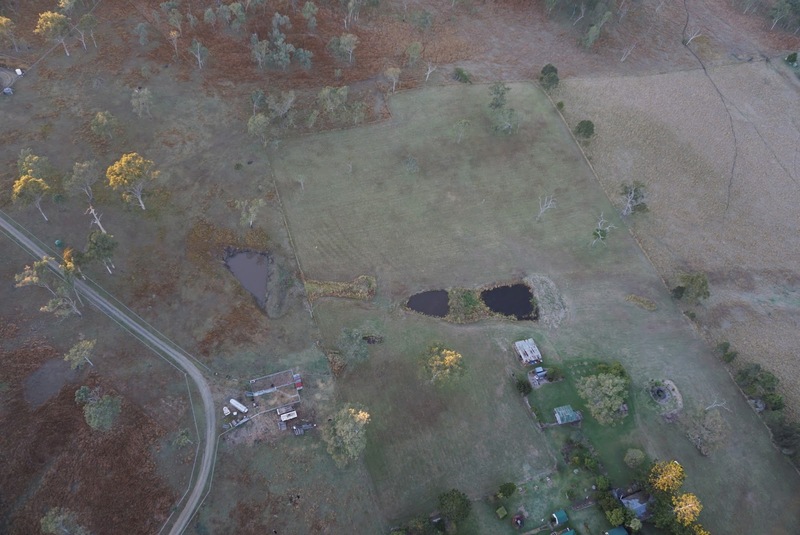 This is a fairly large area, where around 15 kangaroos were kept. 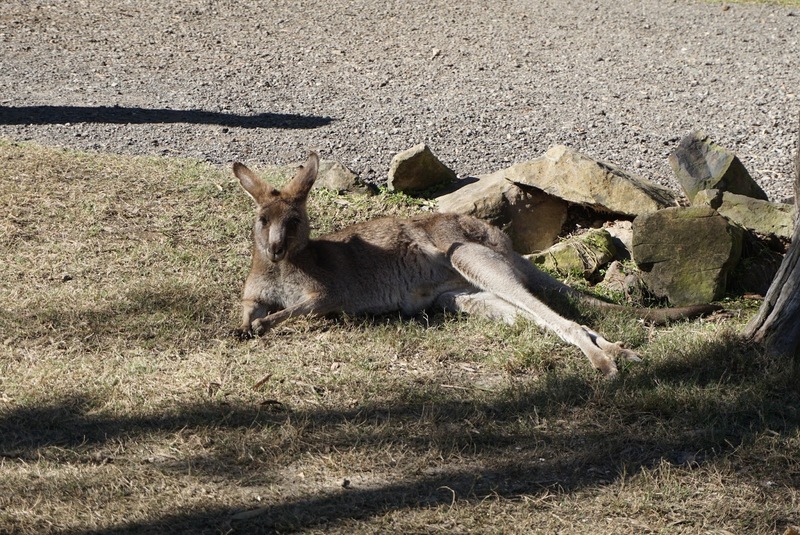 Most of the kangaroos were lying on the ground, allowing visitors to take pictures and pat them. 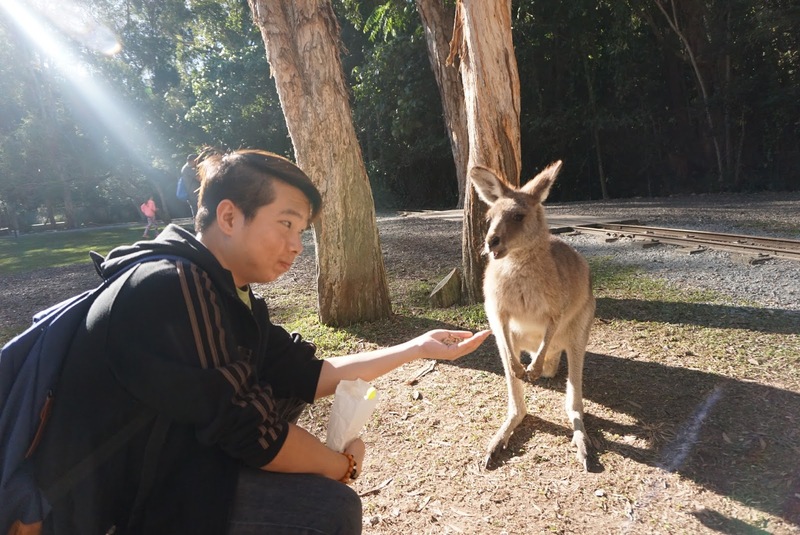 My friend bought a packet of kangaroo feed and went around feeding kangaroos. 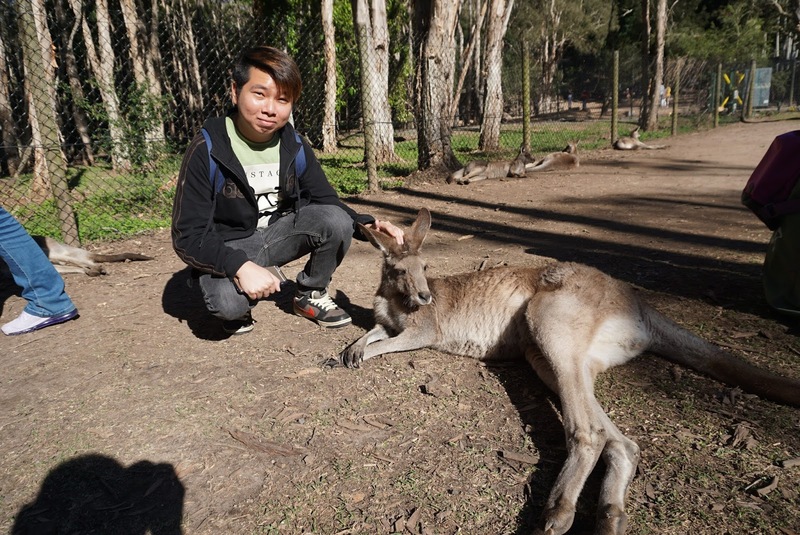 Most of the kangaroos seem accustomed to the sight of humans coming into their territory to play with them, with a few hopping around casually. 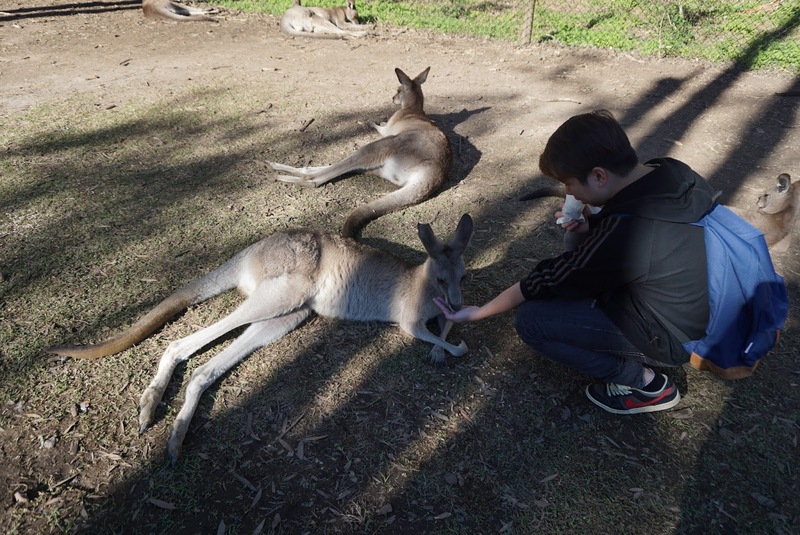 These kangaroos seem completely tamed and visitors can go up to them to pat them on their head and feed them. 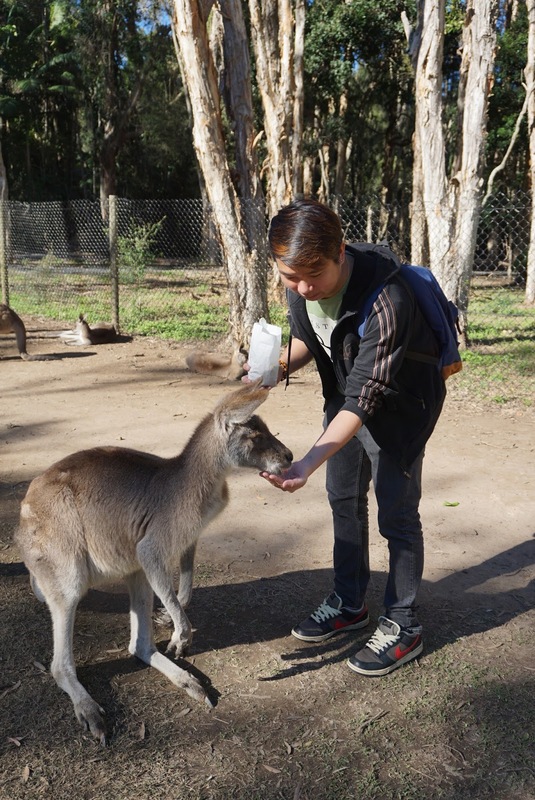 Feeding the kangaroo was an interesting experience. 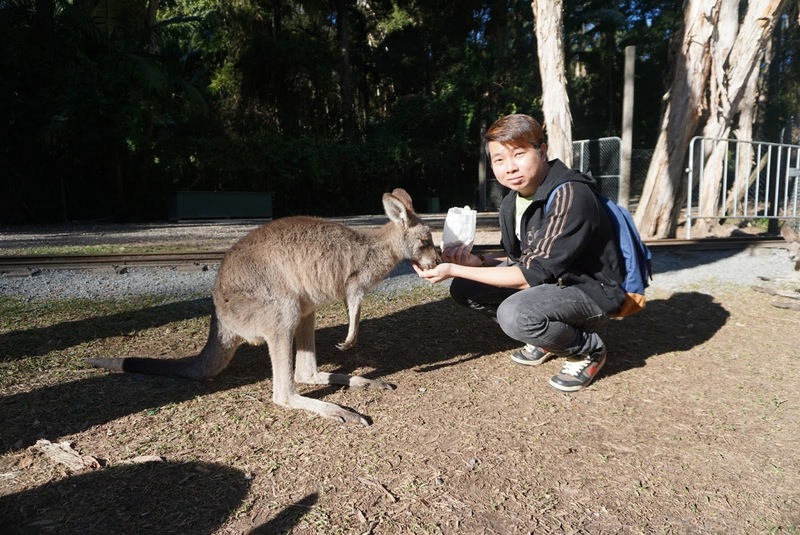 The kangaroo felt tamed enough, carefully licking the food off our hands gently. 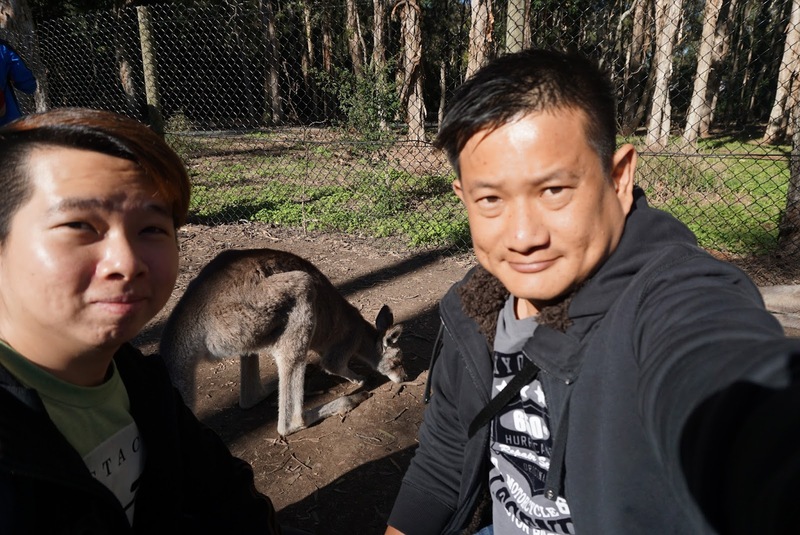 We took a number of pictures here before heading towards another enclosure in this area where the Red Kangaroos are housed. 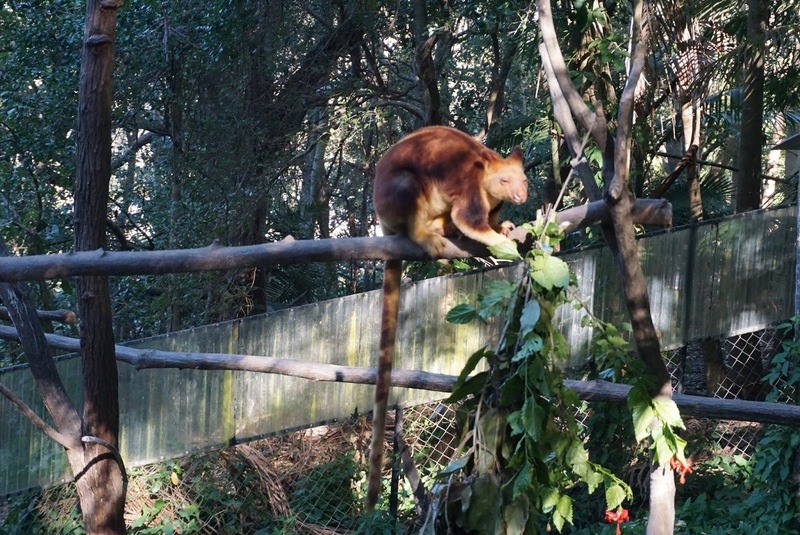 The Red Kangaroos seem larger that the other kangaroos we saw outside this enclosures. 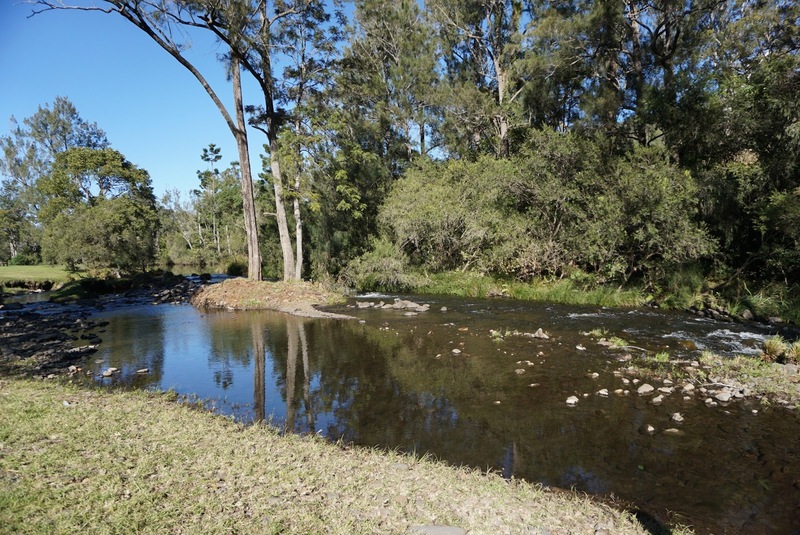 This small area was segregated by a small stream, where most of the red kangaroos were seen resting. 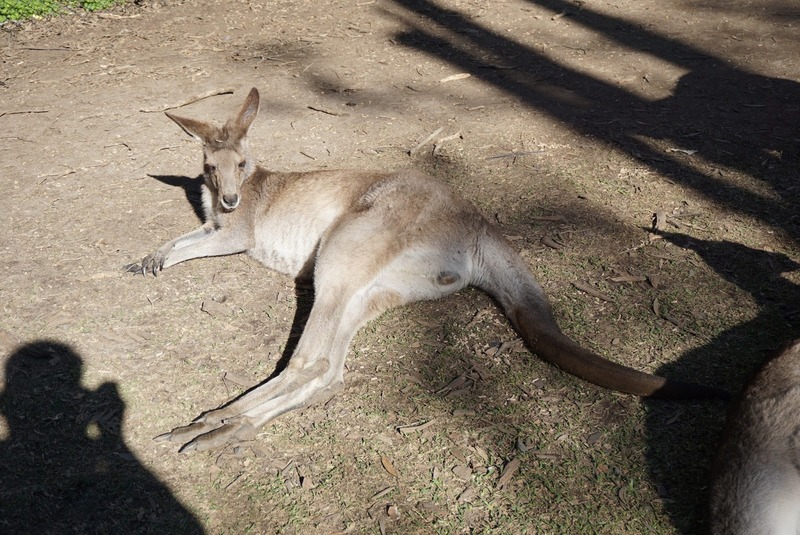 As the crowd was getting more in this area, which seem to irritate the red kangaroo. 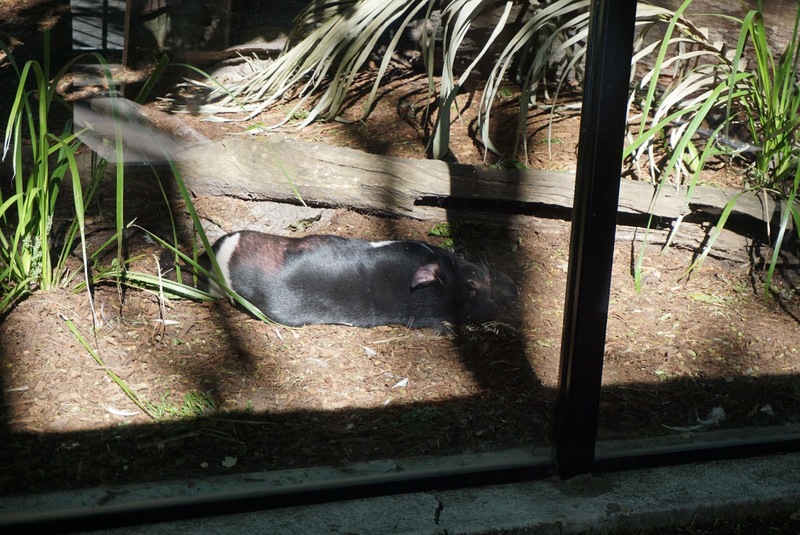 The animal took off and seek refuge across the stream, where it is out of bounds to visitors. 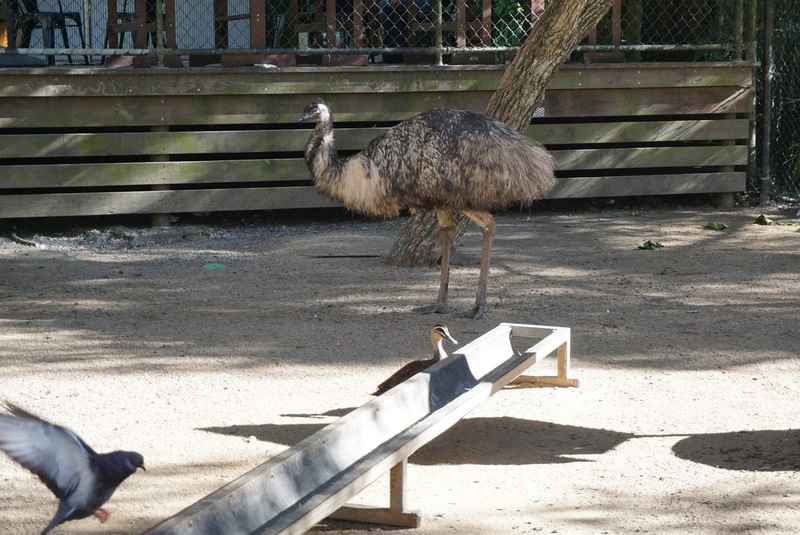 We exited this red kangaroo enclosure and headed up the slope towards some other enclosures. 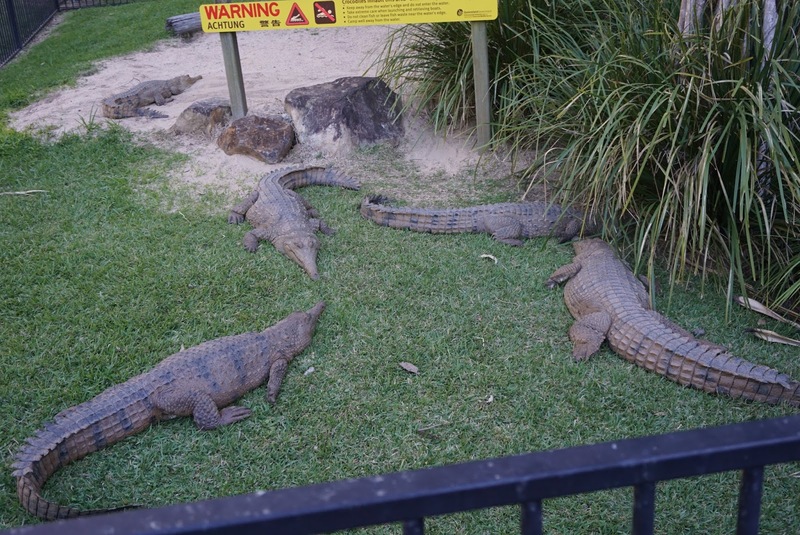 Along the way we came across salt water crocodile enclosures, where the reptiles were seen lazing on shore, not bothered by an visitors (the viewing platform was a good 5m above the crocodile enclosure. 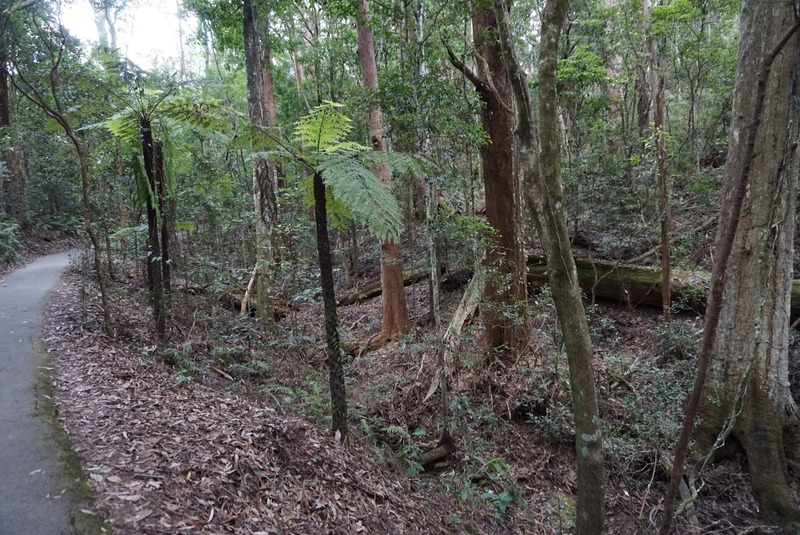 Further into this area, we also saw tree kangaroos. These small sized kangaroos looked more like a raccoon than what we would imagine a kangaroo would be. 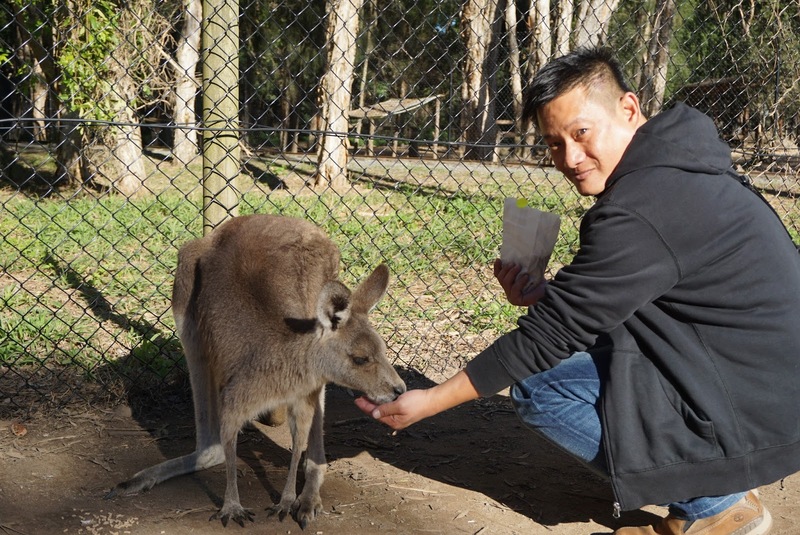 We exited back to the main kangaroo enclosure to finish feeding the kangaroos with the remaining food before taking the train to meet our guide for the Koala Experience. 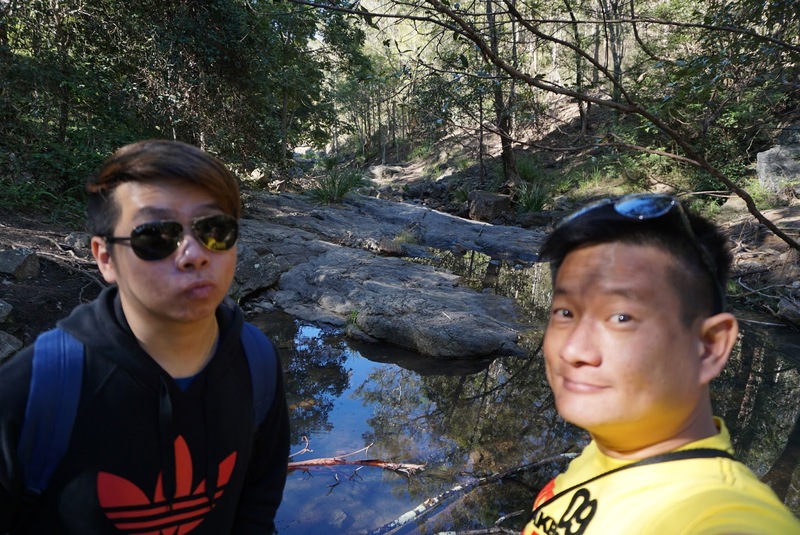 We met our guide at 3.10 pm, whom brought us into the koala enclosure. 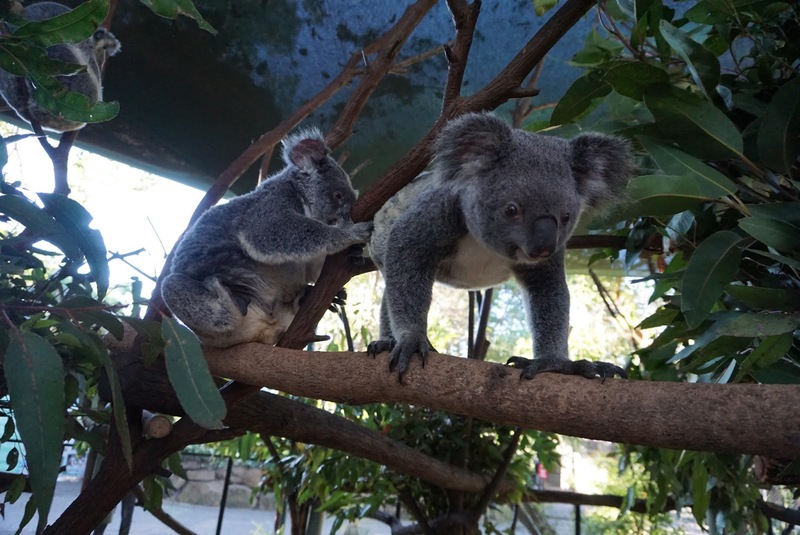 Visitors can see the koalas, which is located at the entrance to the park from outside the enclosure. 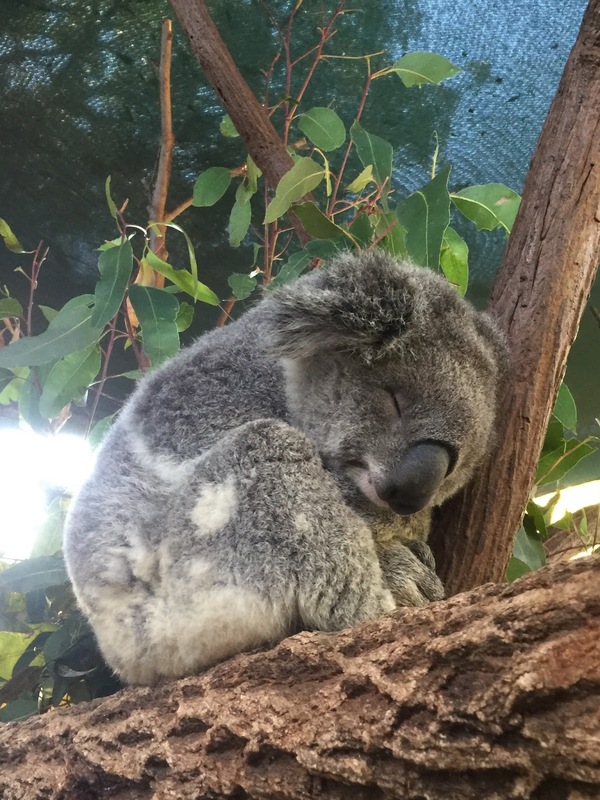 However with the koala experience tour, we were brought inside the enclosure to spend time with the cuddly cute animal up close. 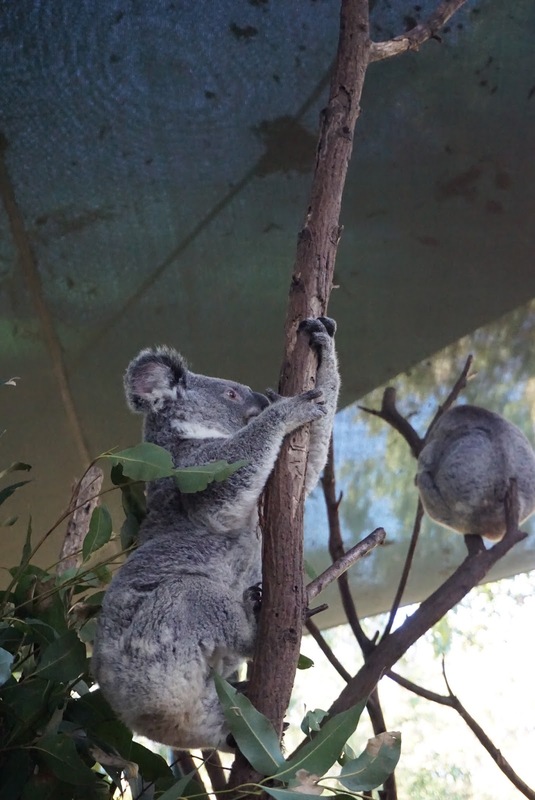 Our guide gave a detailed brief on the habits of the koalas. 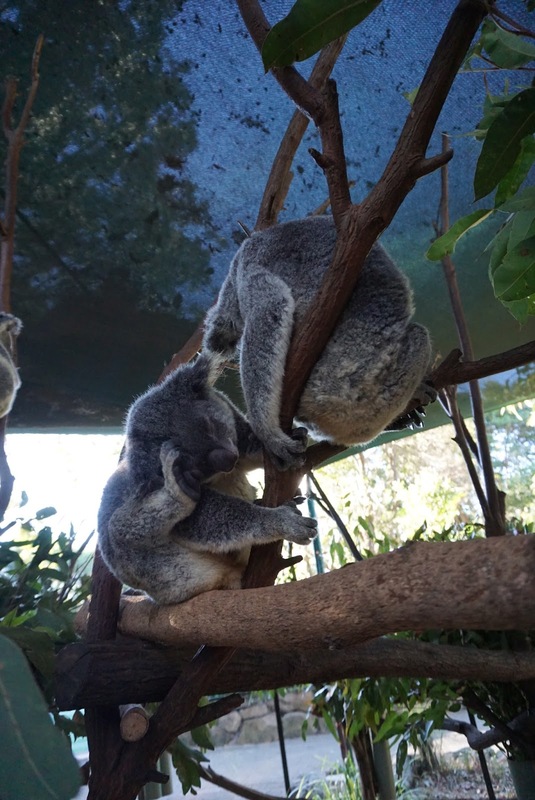 We were told that the reason behind having the tour between 3.15 pm and 3.45 pm is that this is the period of the day when the koalas are the most active, as these creatures spend 18 to 20 hours a day sleeping. 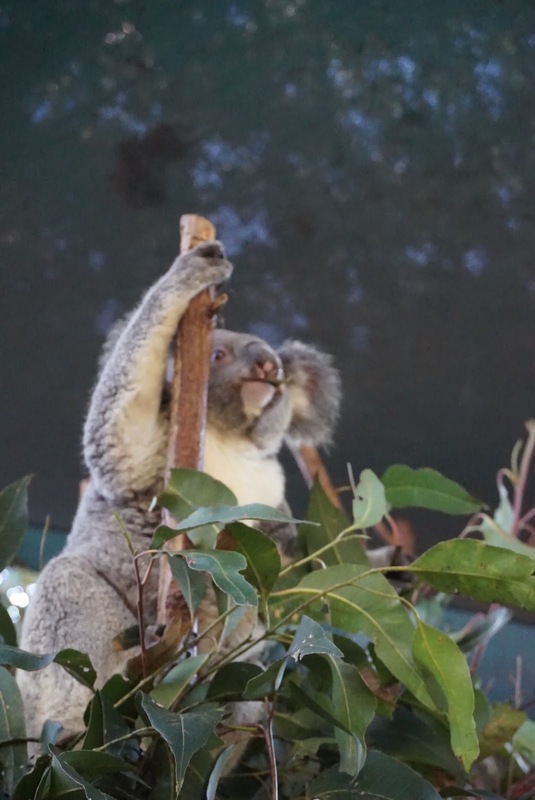 Inside the enclosure, we spotted a rather active koala. 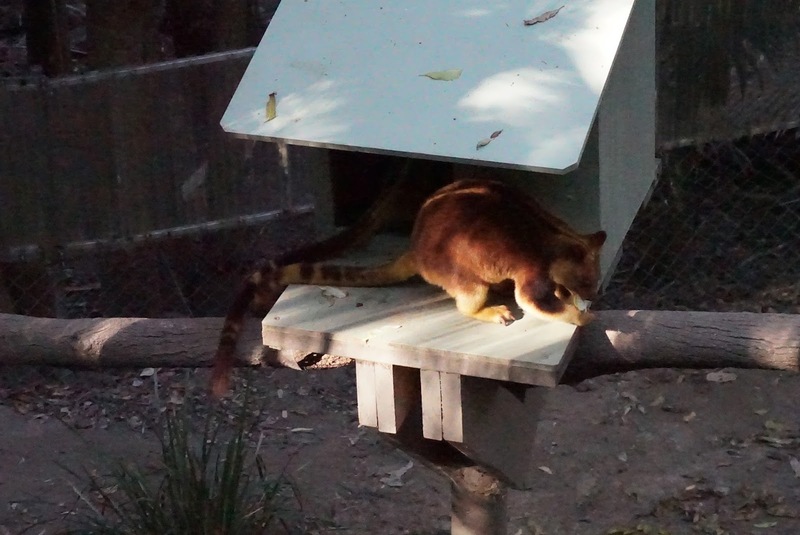 She is seen jumping from branch to branch, curious about visitors inside the enclosures. I saw her looking at us a few times, as though she was wondering who are these people. Spotty as the guide called this koala, doesn’t seem to mind us taking pictures of her and with her. 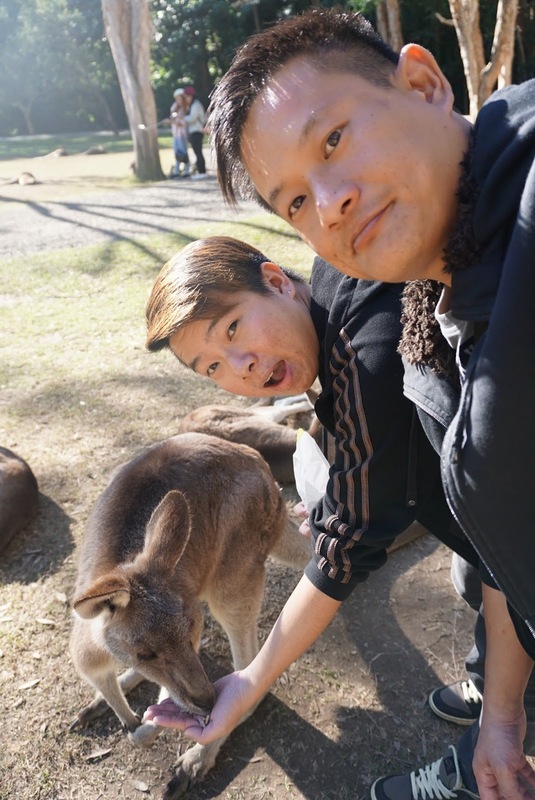 We were given liberty to walk around inside the enclosure to take as many pictures with these cuddlies as we want with a condition of not touching them. 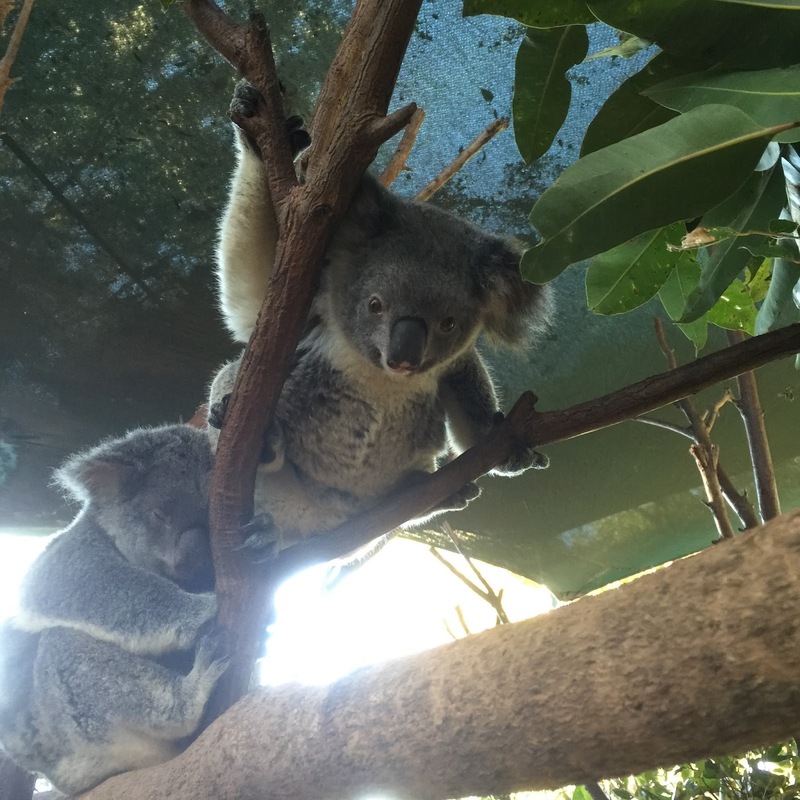 We were told that the koalas can turn violent as they are very territorial animals. 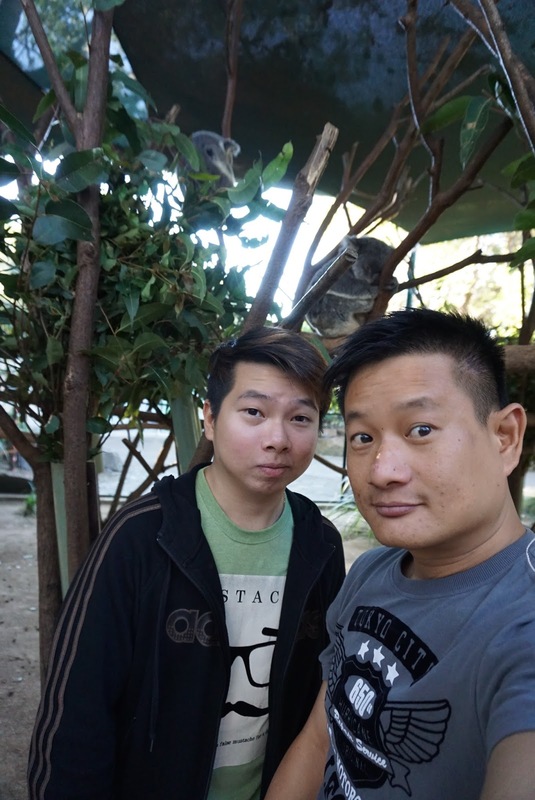 After spending a good 20 mins in the enclosure, we were escorted to an area beside the enclosure for photo taking carrying a koala. 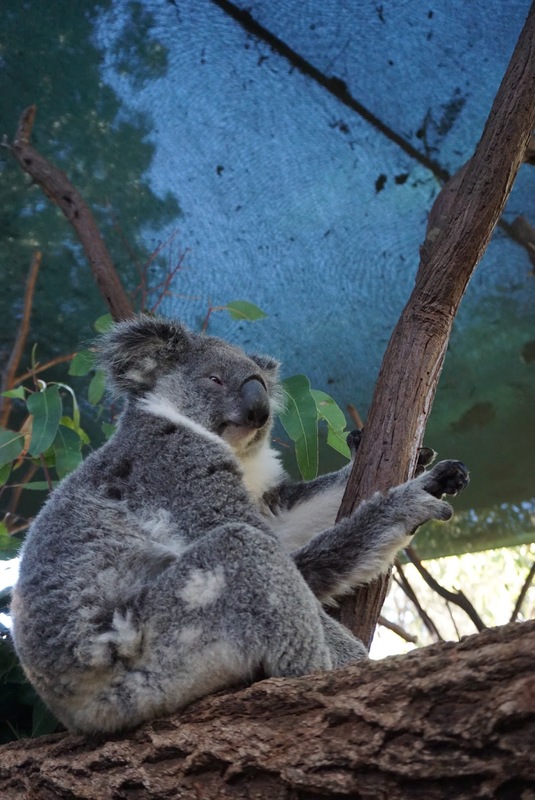 The ticket price of the koala experience includes the entrance to the park, guided entrance to the koala enclosure as well as photo taking carrying a koala. 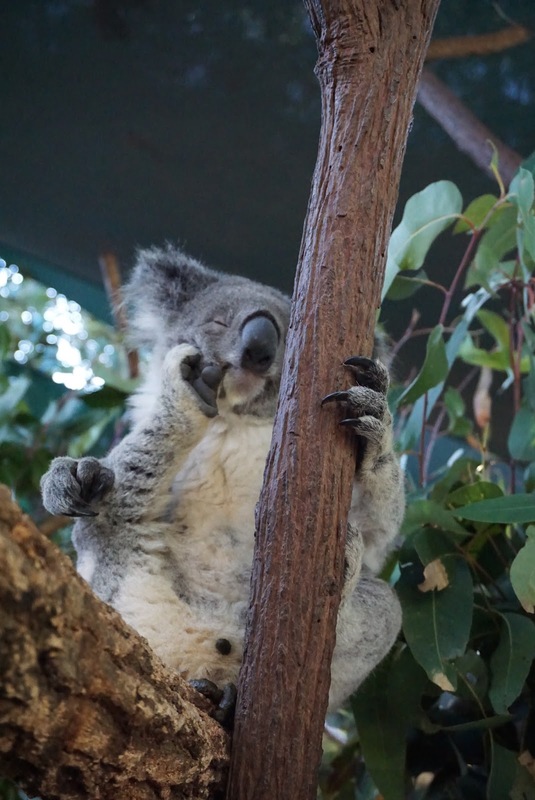 The first koala doesn’t seem in the mood to take picture and threw tantrum after the first visitor in the group had taken photo. The staffs were seen trying to hoax him into behaving, but finally gave in and brought another koala out. 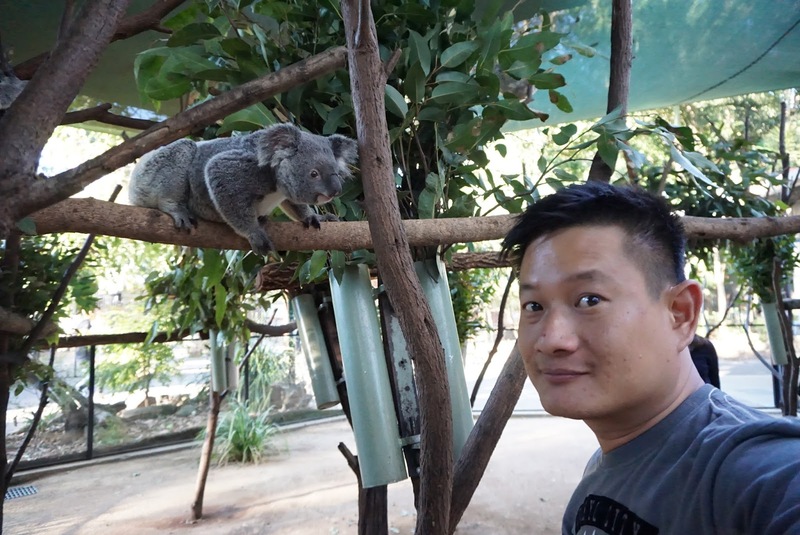 The second koala seem friendly and cooperated in the picture taking. Carrying the koala wasn’t as heavy as I was told. 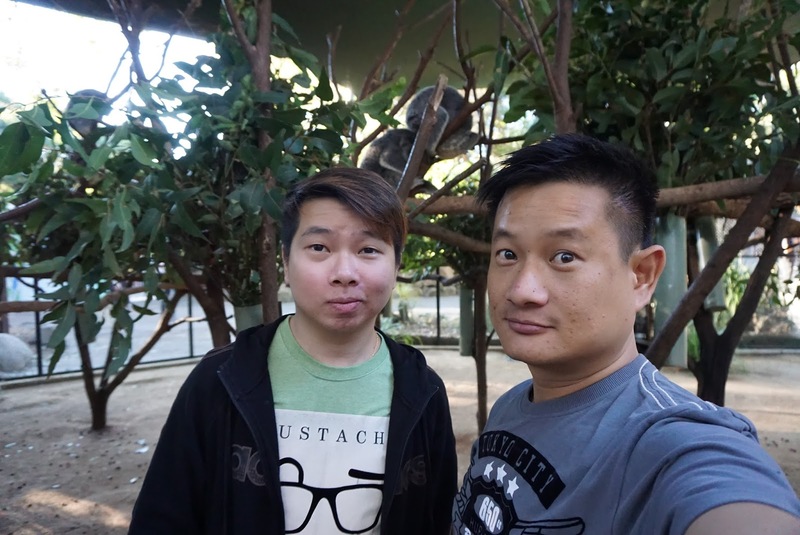 This koala was so well behaved that he did even looked at the camera when I was carrying him. 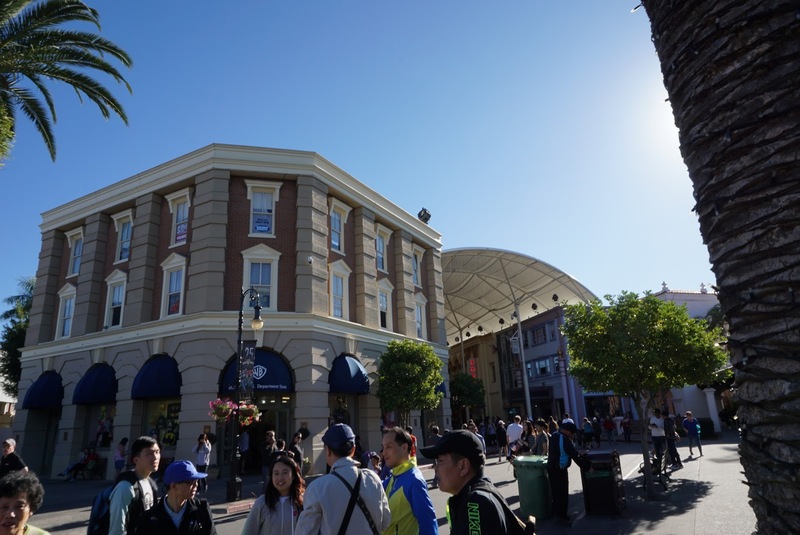 The time now is around 4pm, as the park was closing (it closes at 5pm), my friend and I left the park before the main crowds leaves to avoid traffic jam. 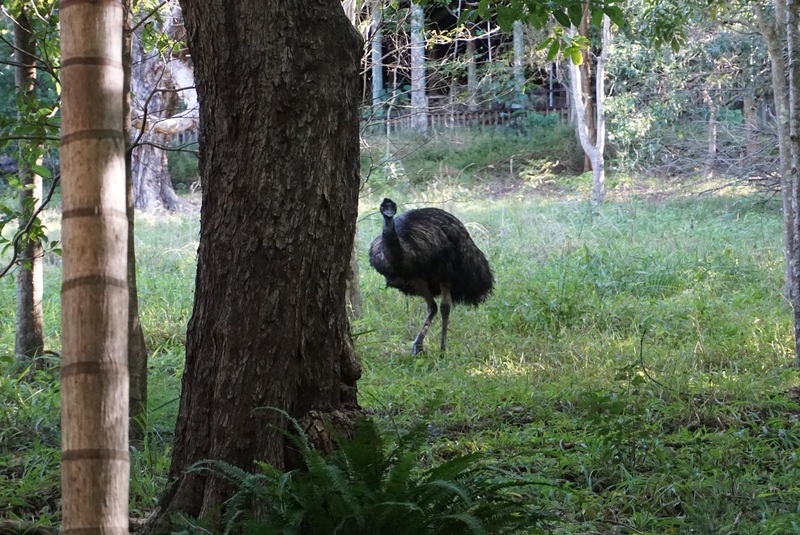 Currumbin Wildlife Sanctuary is located near to Currumbin Beach, my friend suggested to head to the beach to take a look. 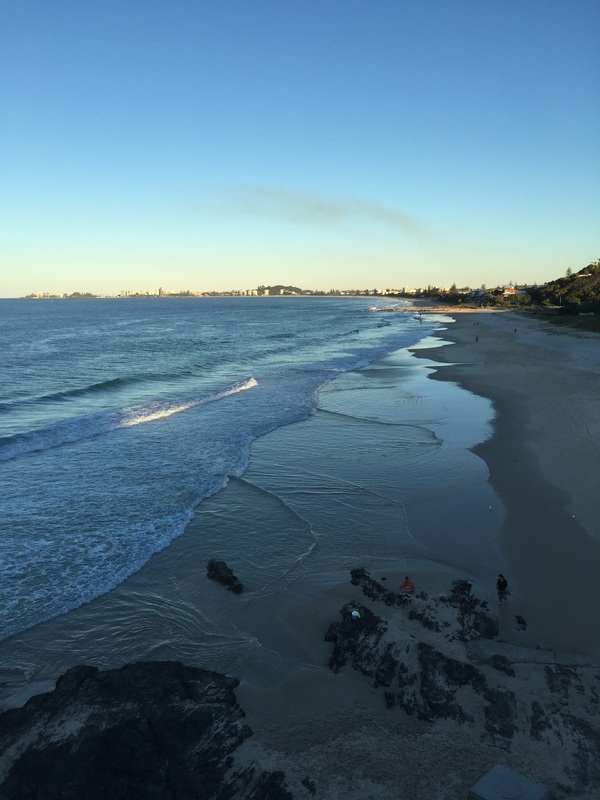 As we were driving along the beach to find a spot to park, we saw a small carpark by the beach. 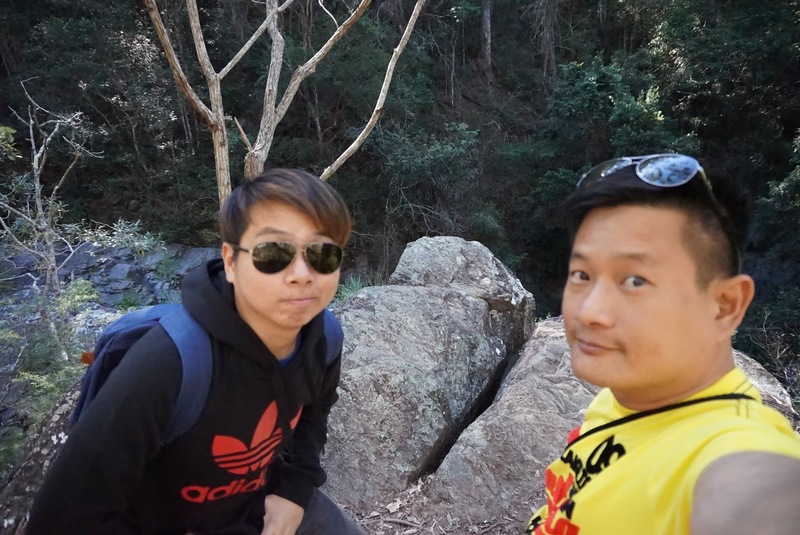 We saw a sign that says Elephant Rock lookout by the carpark. 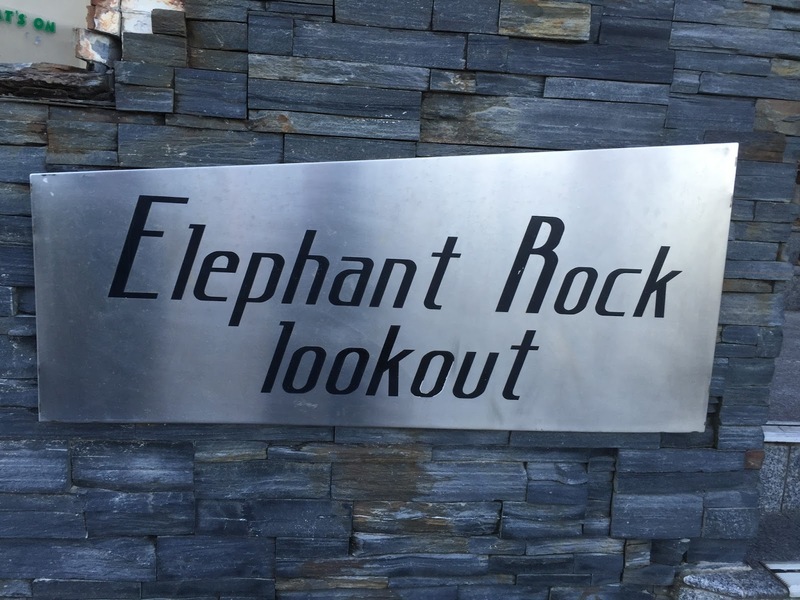 Elephant Rock Lookout is perched on top of a huge rock, behind a restaurant. From the top of the rock, the view of the evening winter beach was stunting. 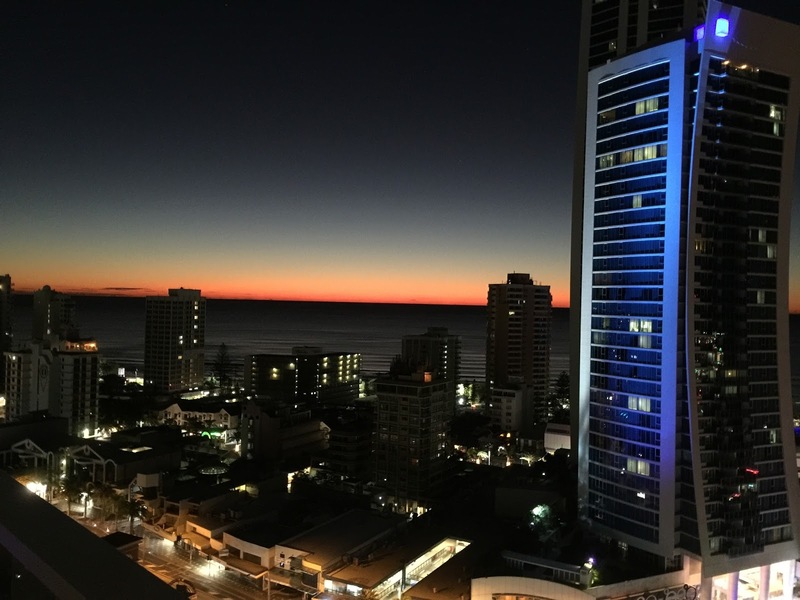 I can see all the way to Surfers Paradise, where a group of tall building seem to congregate on one side and endless beach coast line on the other. While facing the South Pacific Ocean from the rock, I can endless horizon with the might of the ocean currents rushing towards land, hitting themselves on the beach. Elephant Rock allows one to get a good picture of the beach. 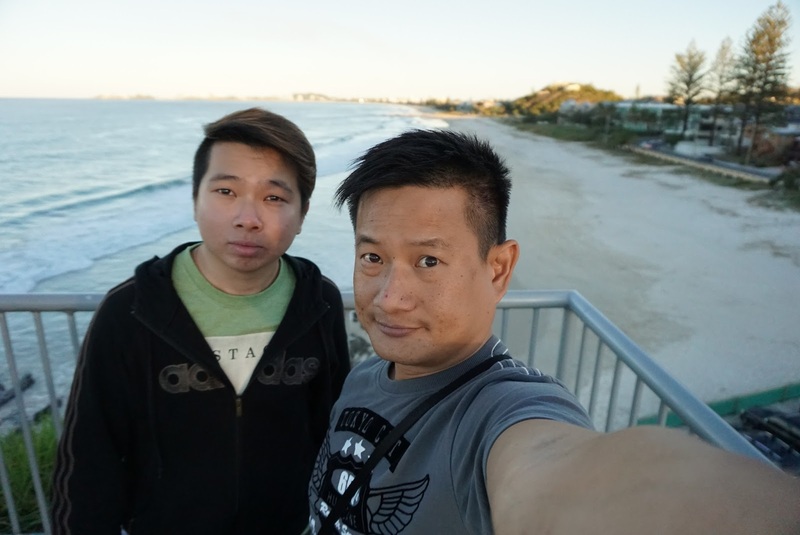 We stayed on the top of the rock for around 5 mins before heading towards the beach on the sandy area to take more pictures. 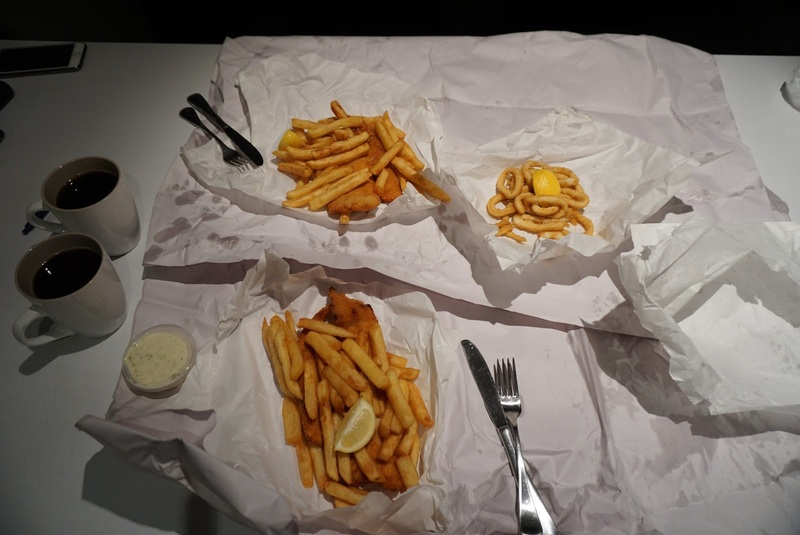 After taking pictures, my friend and I headed back to our apartment, stopping by a Fish and Chips shop to pack dinner back to the apartment. 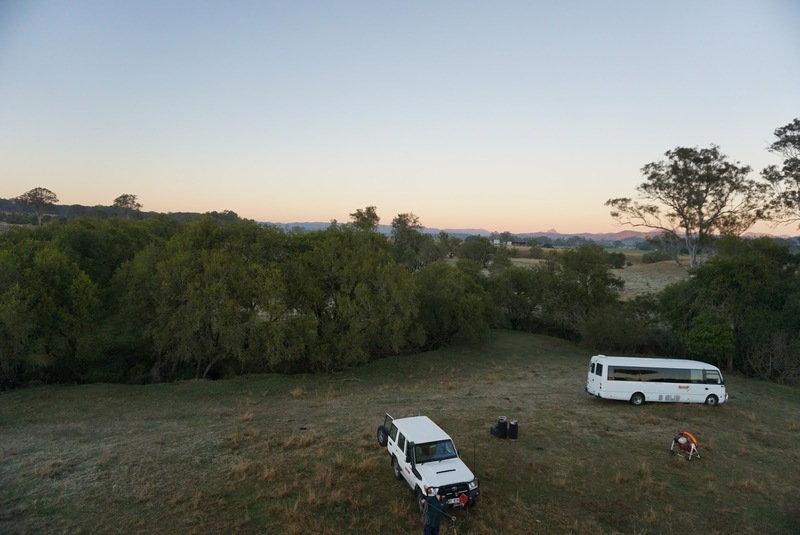 We rested early tonight as we had to wake up very early the next day for our Hot Air Balloon ride over the Hinterlands. 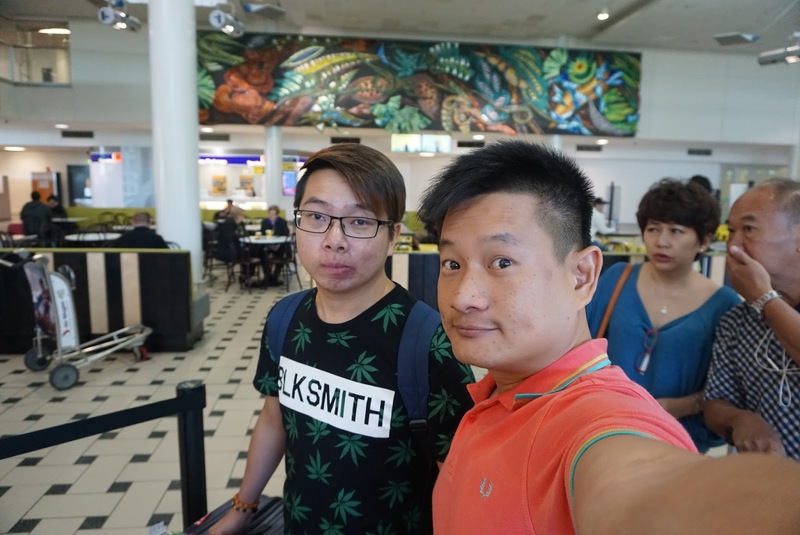 After a 8 hour red eye flight from Singapore, my friend and I finally reached Brisbane early in the morning. 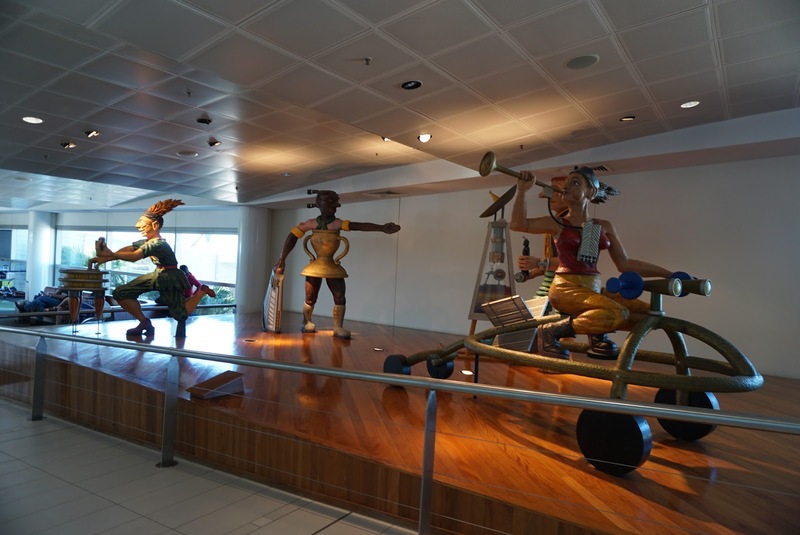 Making it through the customs and collected our luggages, we headed to one of the two telco counters in front of the exit gate. 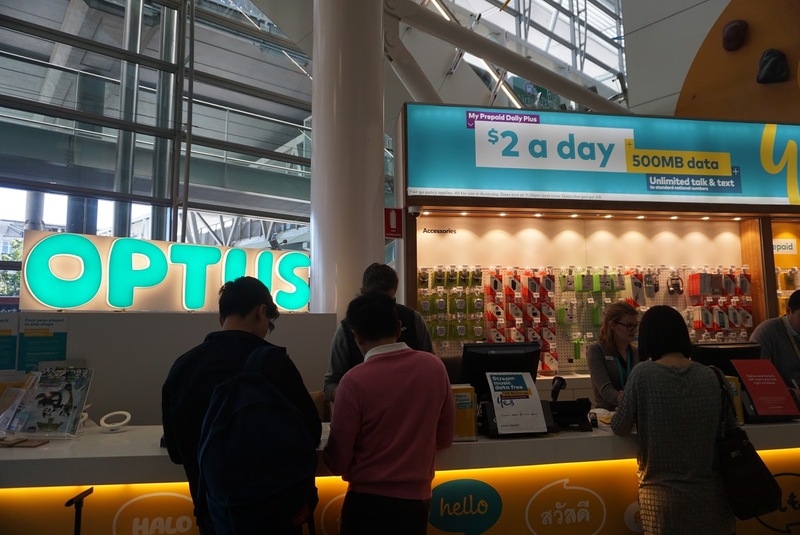 My previous good experience with Optus whilst studying in Australia some time back led me to head towards the Optus counter without hesitation. We got ourselves a one-week Sim card that comes with 500MB data per day as well as unlimited local phone calls and SMS for merely $15, which is way lower that I had thought. 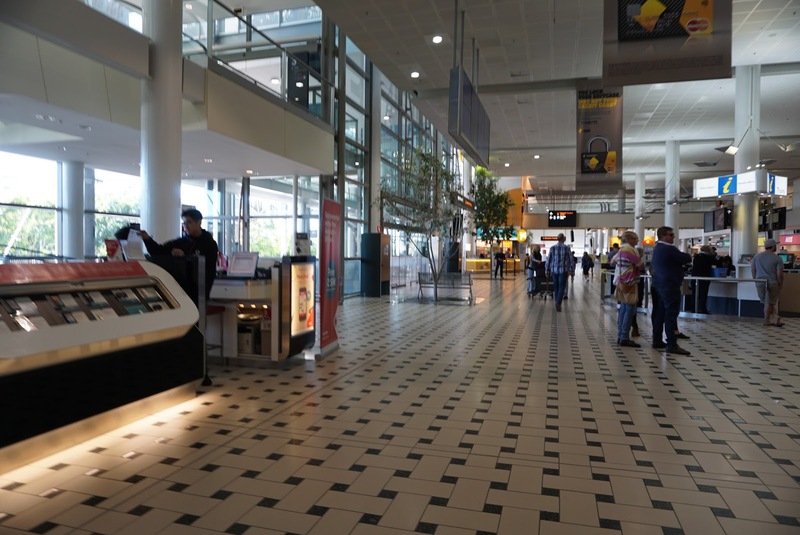 The friendly Optus staff helped us activate our Sim cards before bidding us an enjoyable stay in Australia. 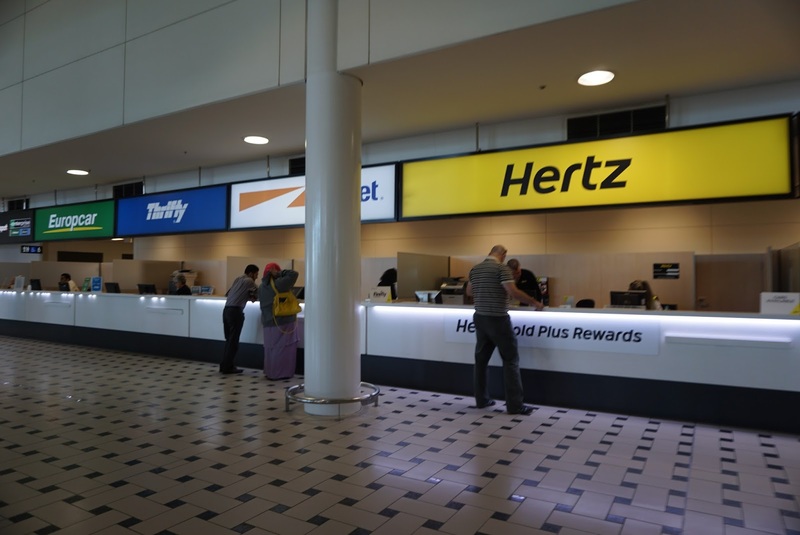 Our next stop was the Hertz car rental counter at the arrival hall floor, where we collected our pre-booked vehicle. 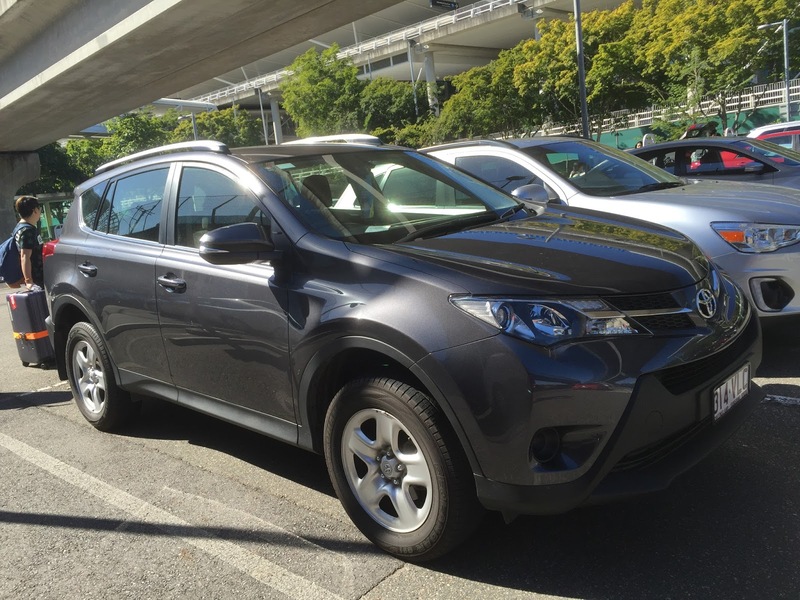 We were pleasantly surprised to learnt that we got upgraded to the next category vehicle. 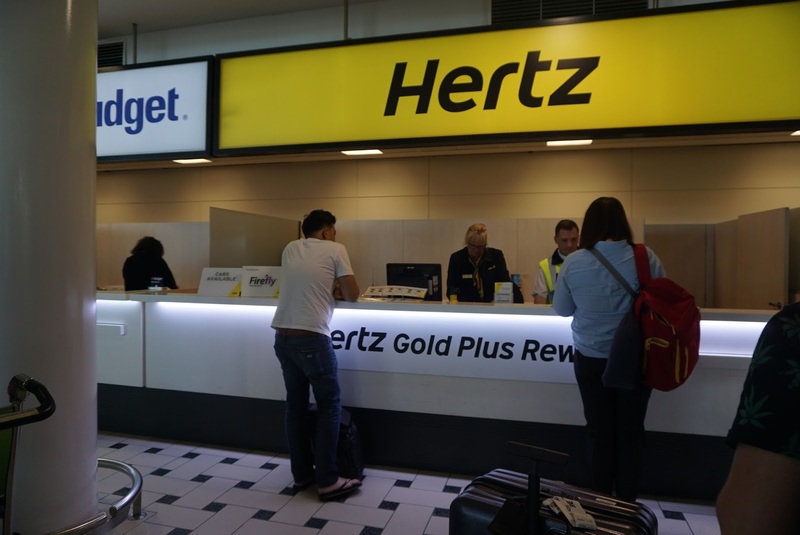 The vehicle was parked at the carpark opposite the airport terminal, we headed for Gold Coast after collecting our vehicle. 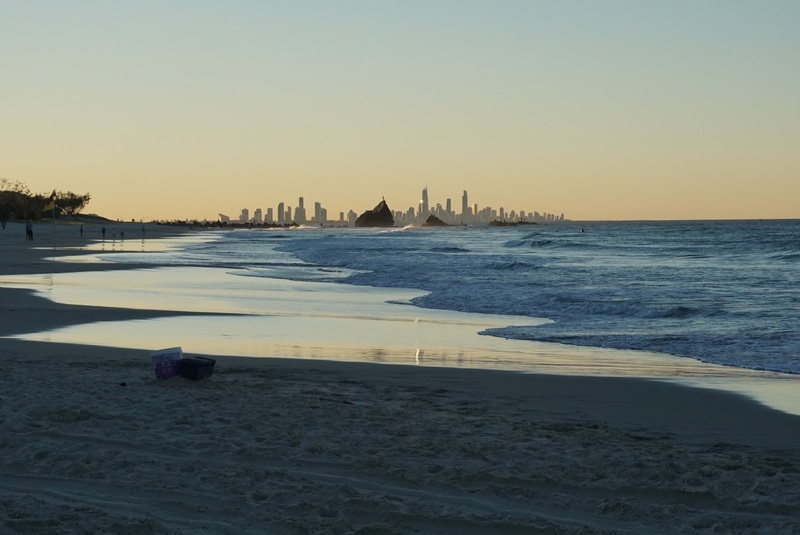 The drive from Brisbane Airport to Gold Coast takes about 1 hour, for those without GPS, Surfer’s Paradise isn’t hard to find as there are plenty signs along way leading us to Surfer’s Paradise in Gold Coast. 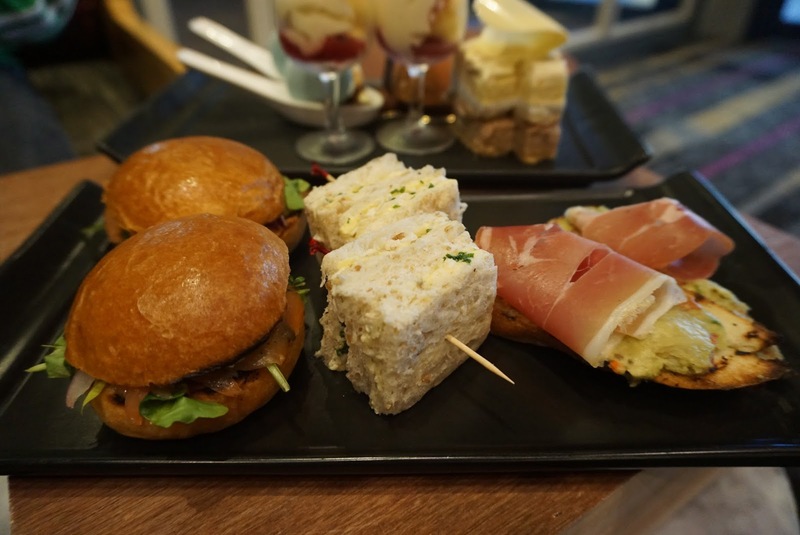 After collecting our keys to the apartment and leaving our luggages in the apartment that we would call home for the next seven days, my friend and I left the apartment and made our way to the nearby Walrus restaurant for the high tea that we have purchased from Groupon Australia. 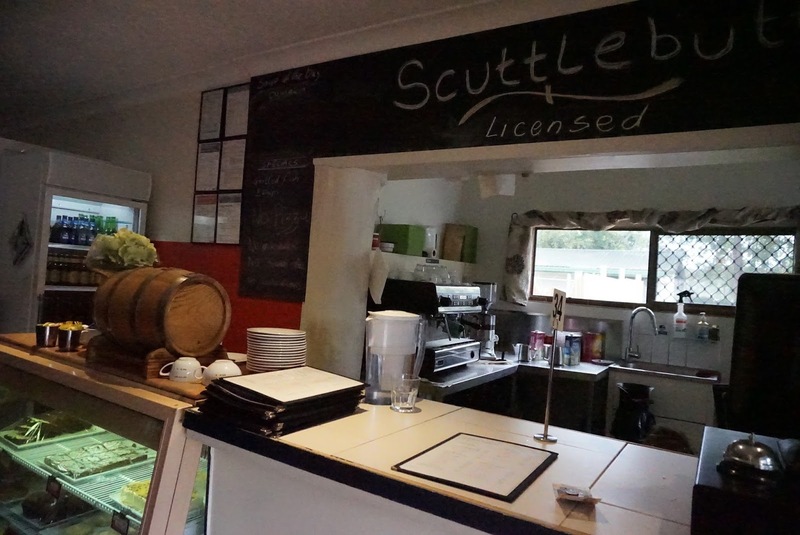 As the staffs were expecting us, we were seated and our food was brought to us pretty fast. 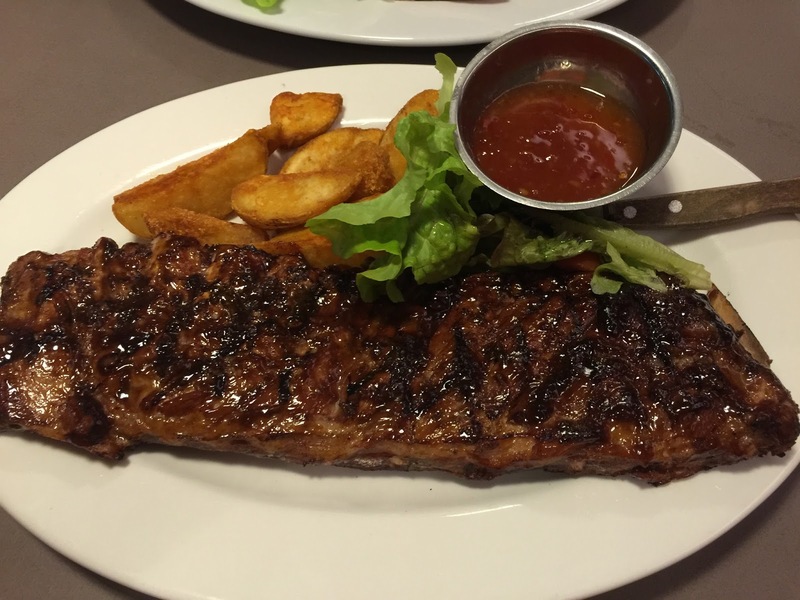 The portion of the food were pretty huge, despite being tasty we were not able to finish all. 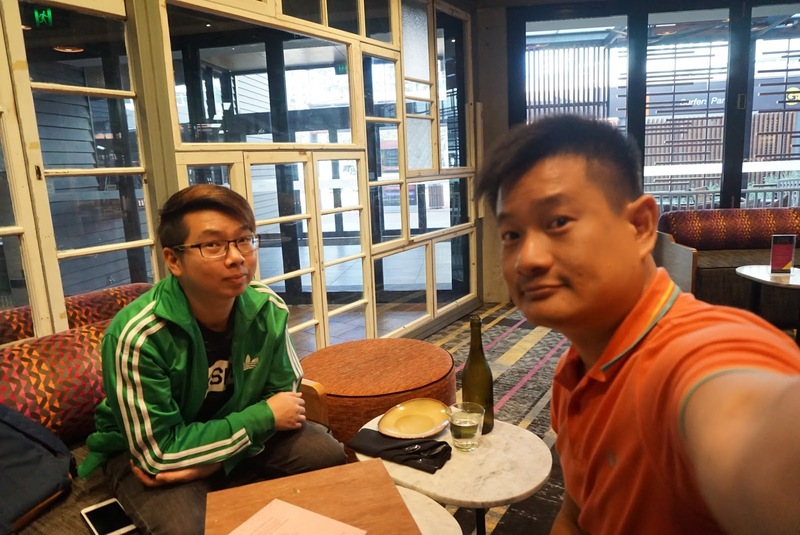 We left the restaurant after filling our stomachs, my friend and I returned to our apartment to unpack our luggages and took a quick shower before heading out again. View from the balcony of our apartment. We could see the beach and the ocean from here. We left our apartment at around 5pm. We were earlier told by the staff for the apartment property that Harbour Town closes at 6pm today and decided to try our luck heading there. 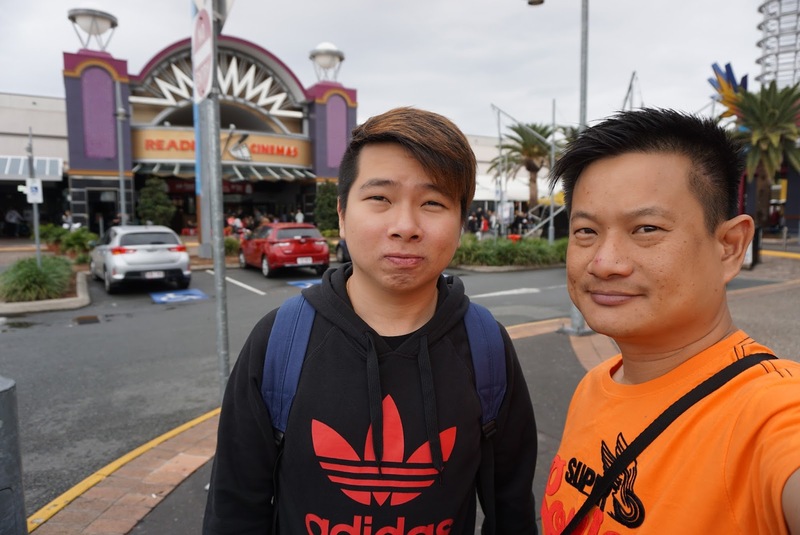 We drove to Harbour Town, an outlet retail mall for the evening as we had planned to do today. 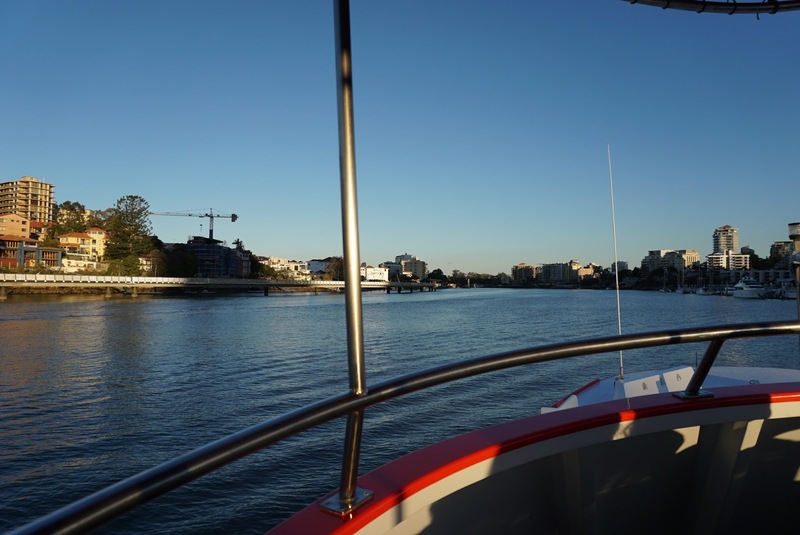 Harbour Town is a mere 30 mins drive on Gold Coast Highway. 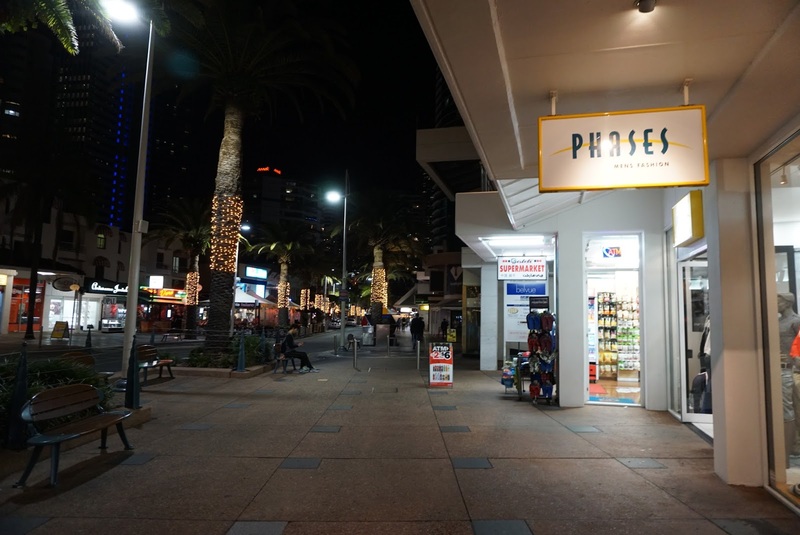 We were rather surprised to see some shops still open at the time we reached Harbour Town. 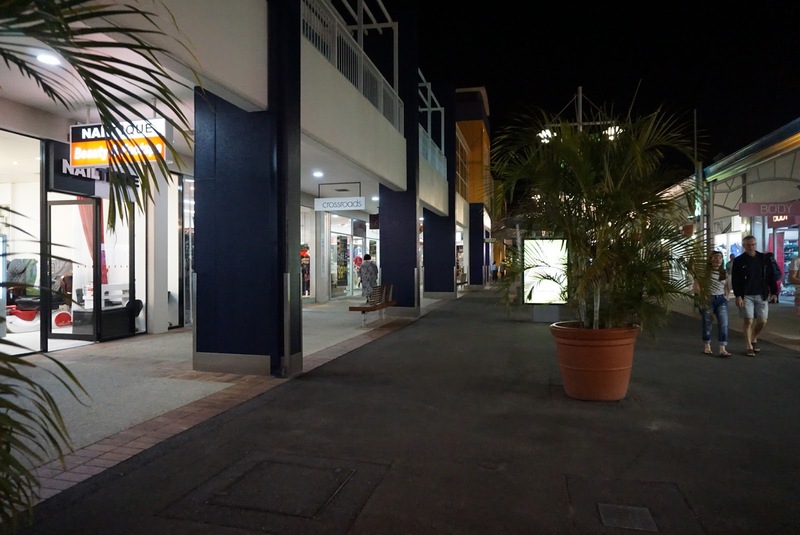 There are some branded goods shops such as Hugo Boss, Calvin Klein at Harbour Town. Entering these shops, my friend and I were pleasantly surprised to find these shops offers generous discounts, some on top of the already reduced prices. 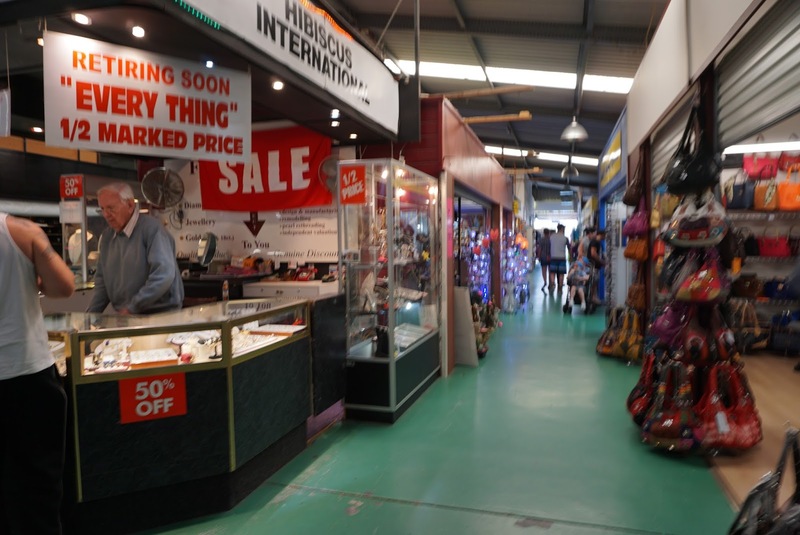 We did not really buy things in these shops, merely to check out the prices and the goods they have on sale. 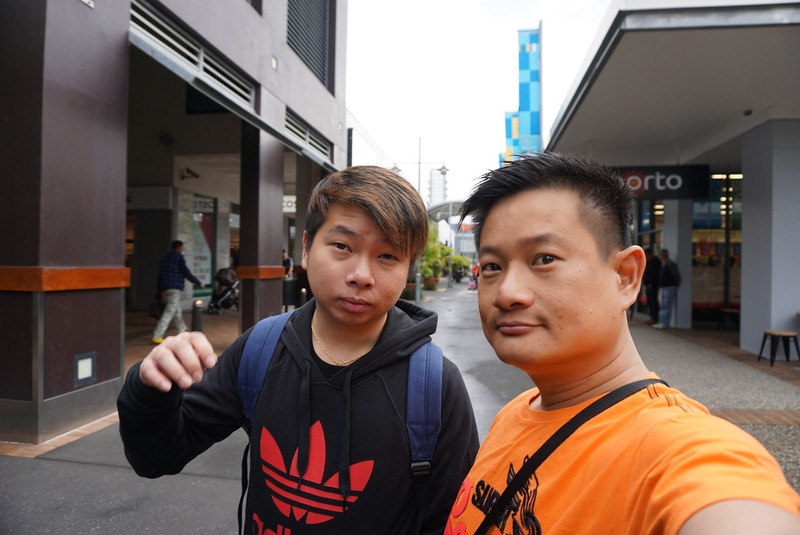 There are several shops that were about to close (with doors half close) but we were still warmly welcomed by the friendly staffs to look around the shops. 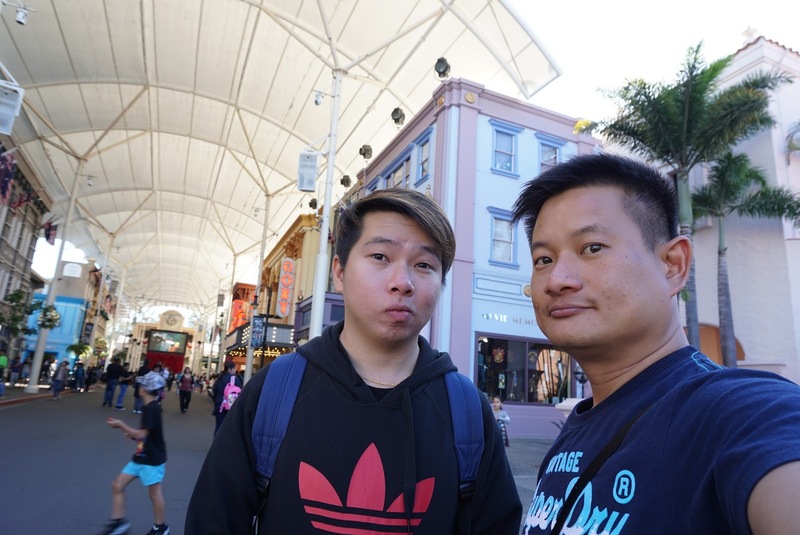 As most of the shops were closed or were about to close, my friend and I decided to catch dinner before leaving Harbour Town. 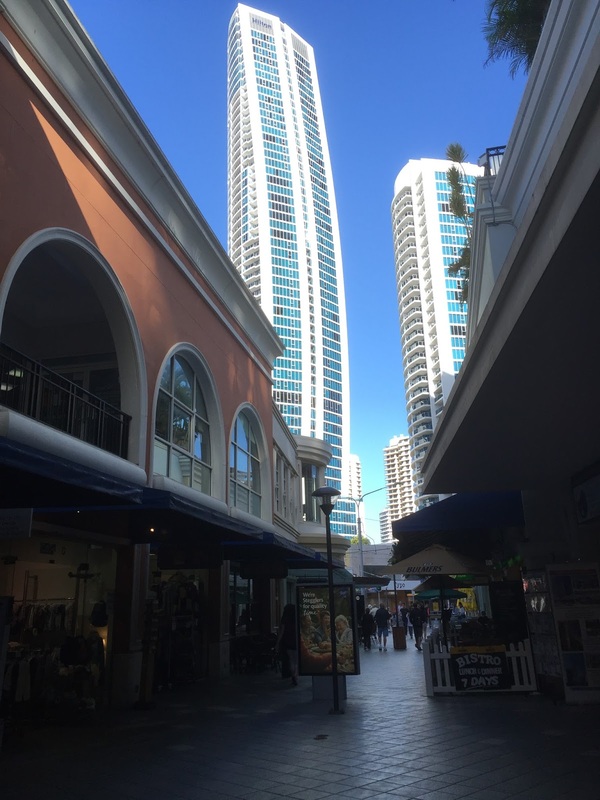 After leaving Harbour Town, we headed to the Jupiters Casino to take a look. The drive to the casino took around 45 mins from Harbour Town. 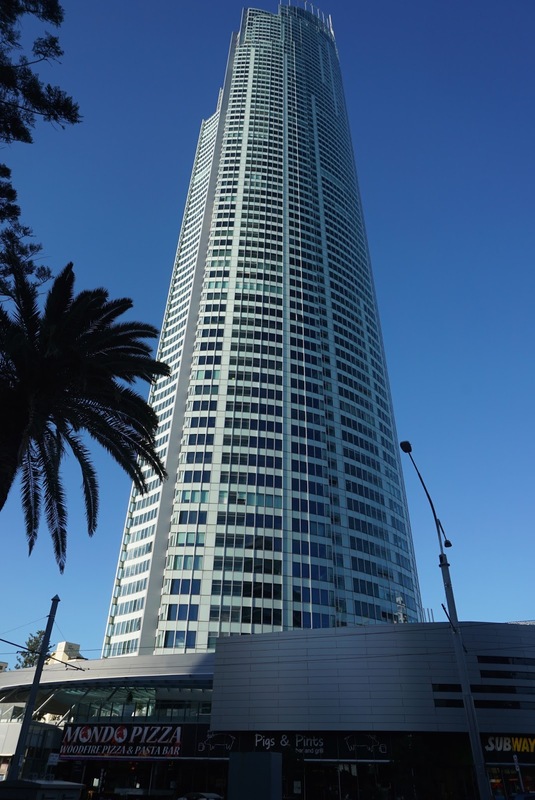 The Casino seem a tad small compared to the one in Melbourne. 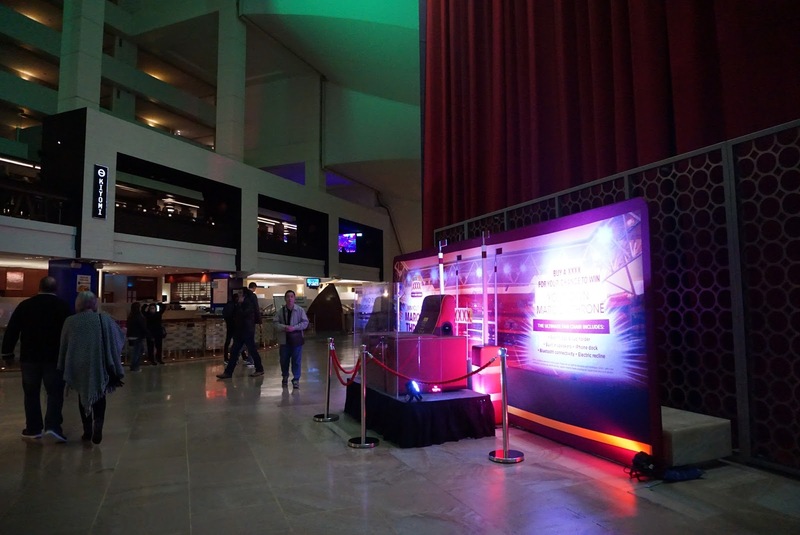 We took the opportunity to sign up for the membership and spend some time playing at the Casino before departing to rest for the night.